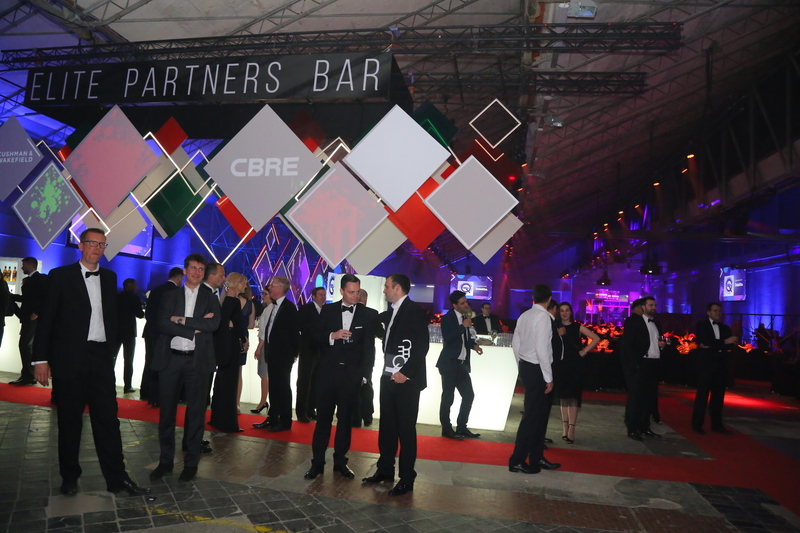 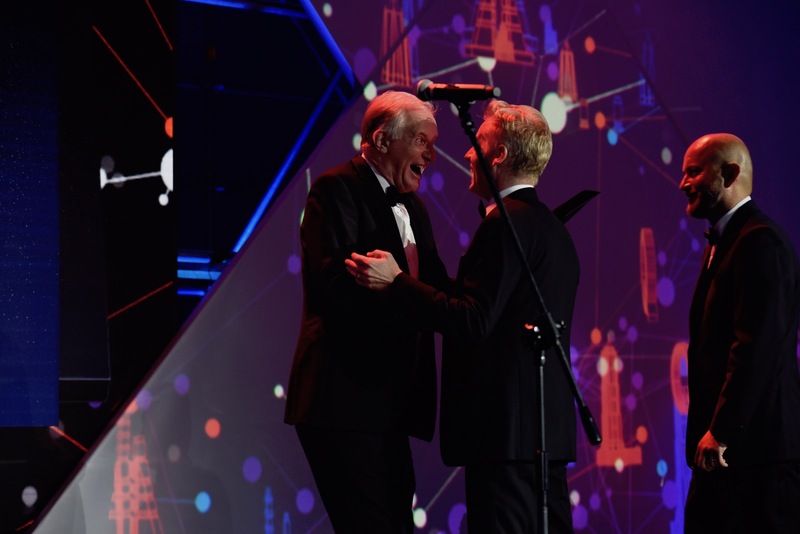 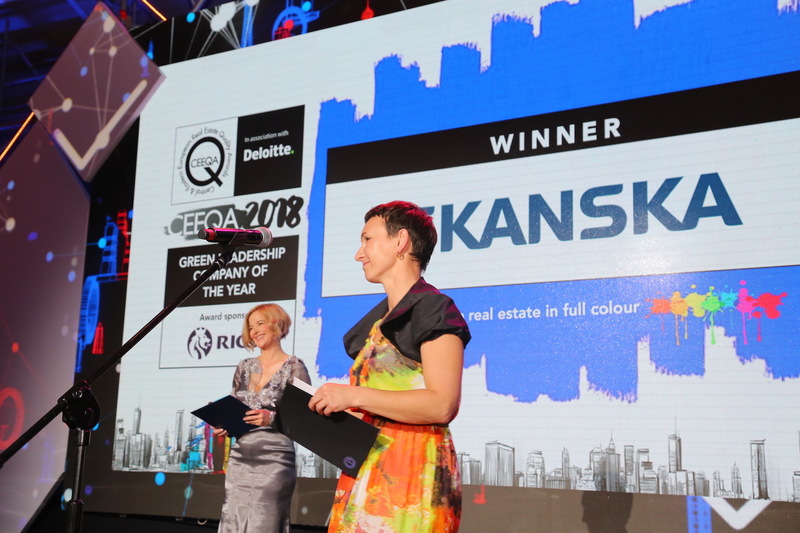 A triumphant year for international real estate heavyweights Skanska and CBRE , a deserved Lifetime Achievement recognition for Heitman’s Gordon Black, and Industry Professional of the Year award for Ghelamco’s Jeroen van der Toolen, as well as first-time category successes for local players CPI Property Group, Sentient and Wilsons, were the highlights of the 2018 edition of the awards while performances by celebrated UK band Morcheeba, South African Springbok legend Percy Montgomery and Cape Town based gospel choir Isibane se Africa led the entertainment highlights at the 2018 CEEQA Gala. 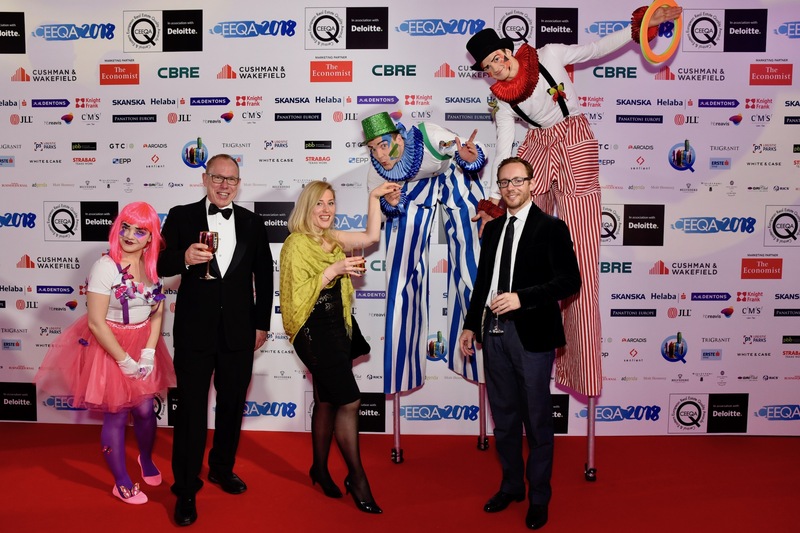 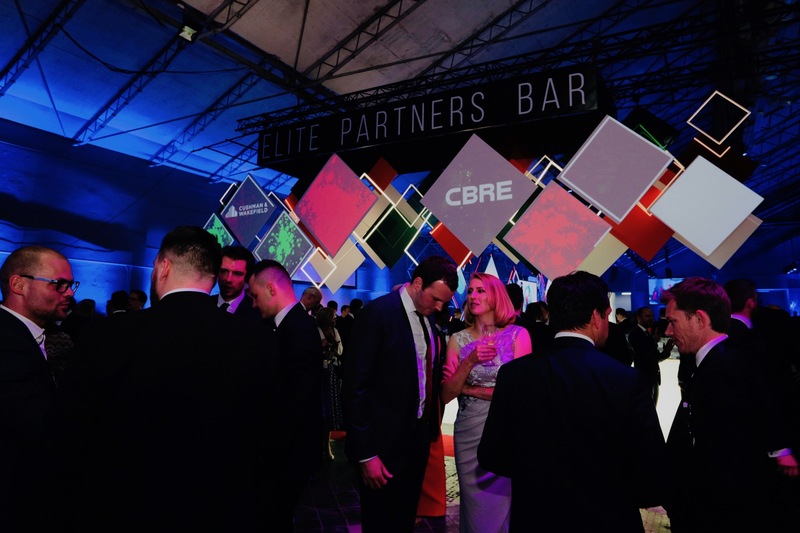 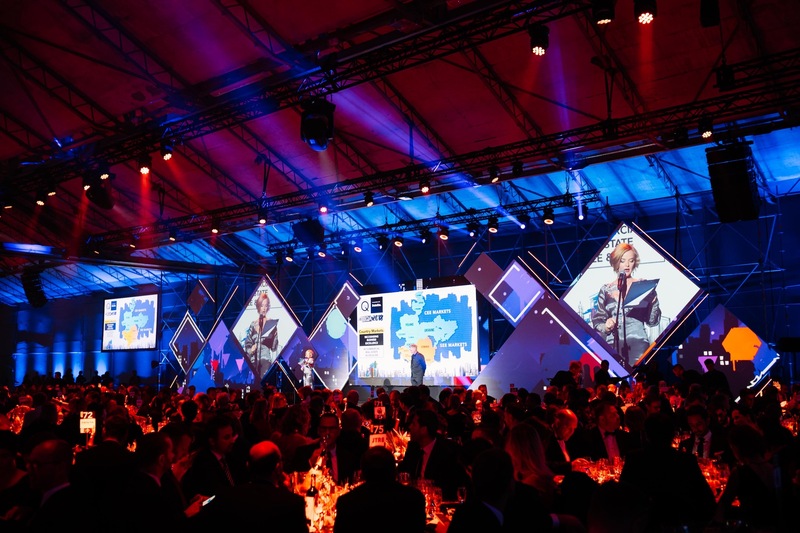 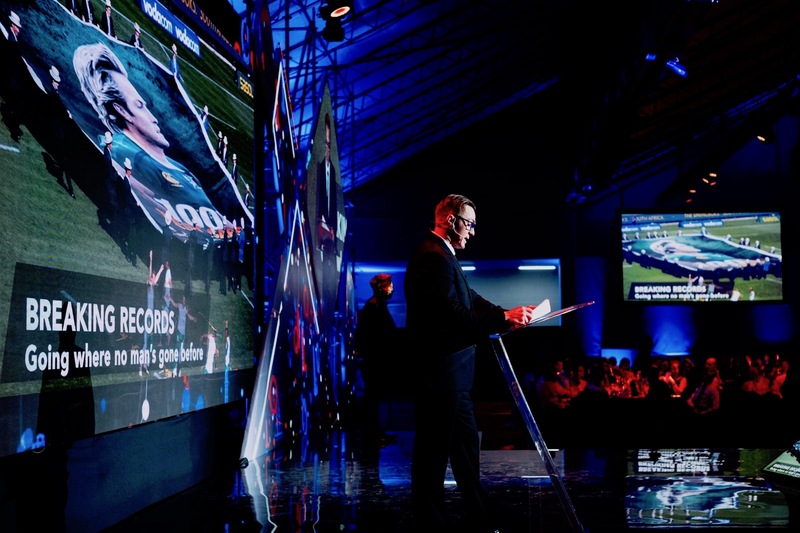 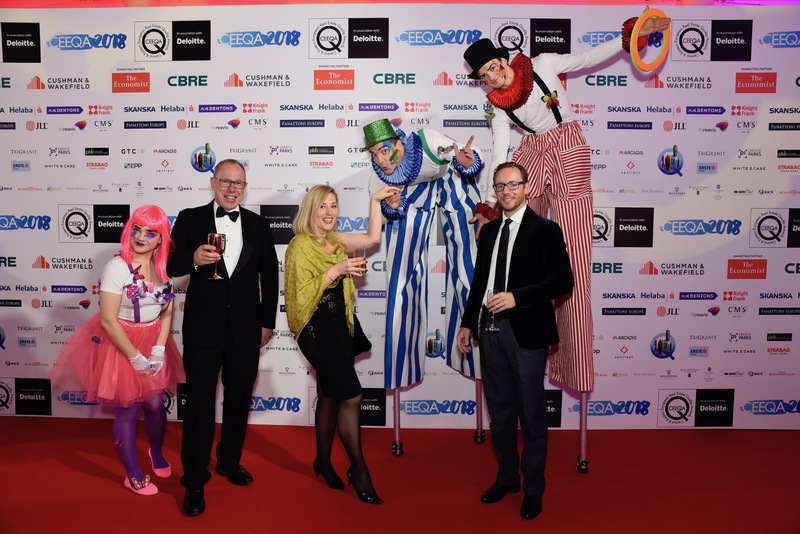 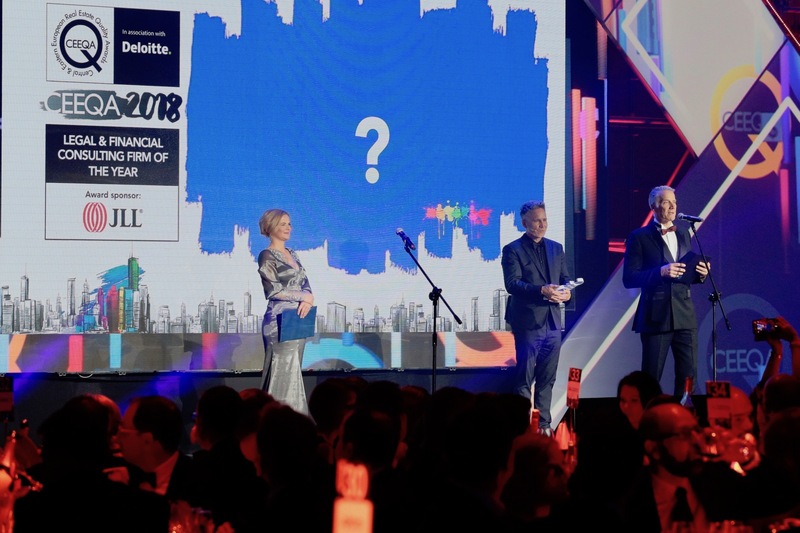 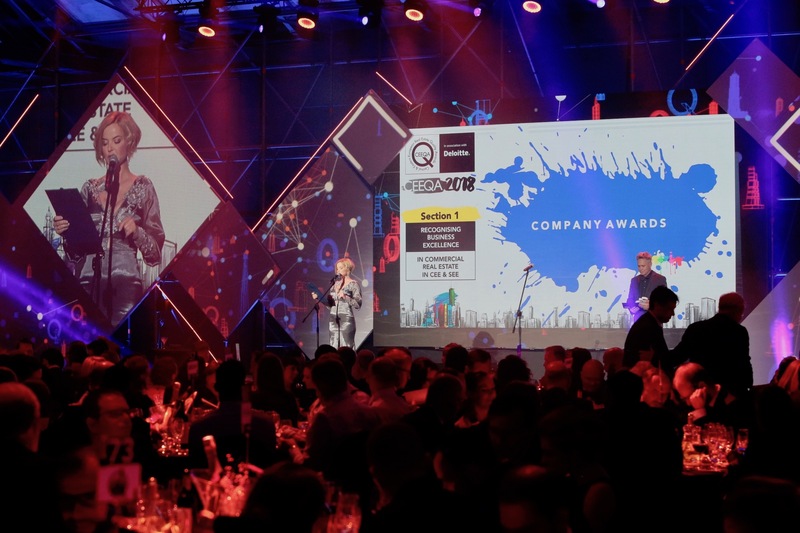 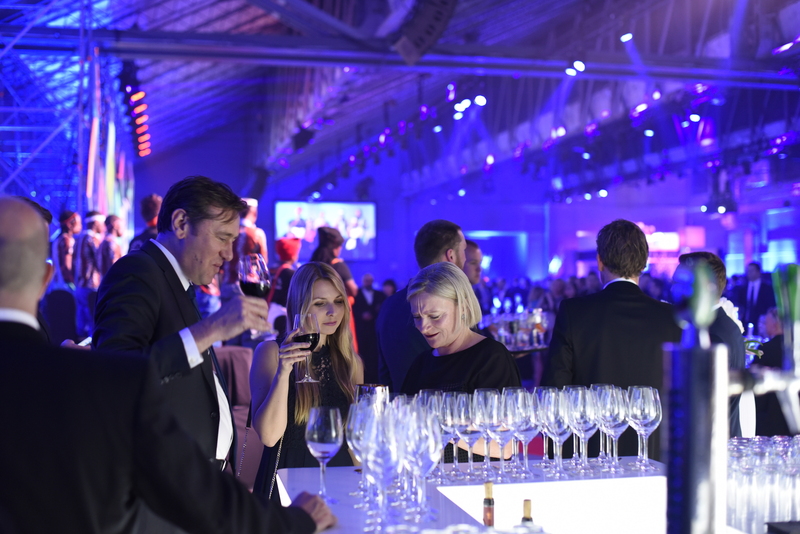 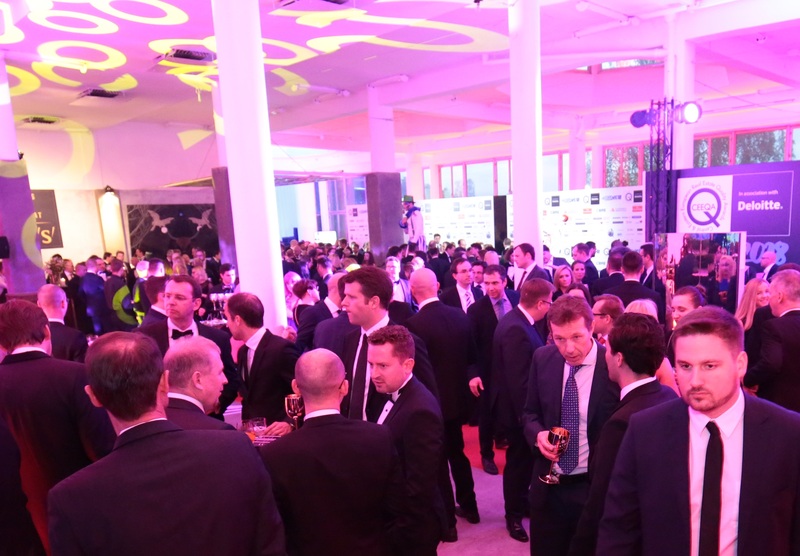 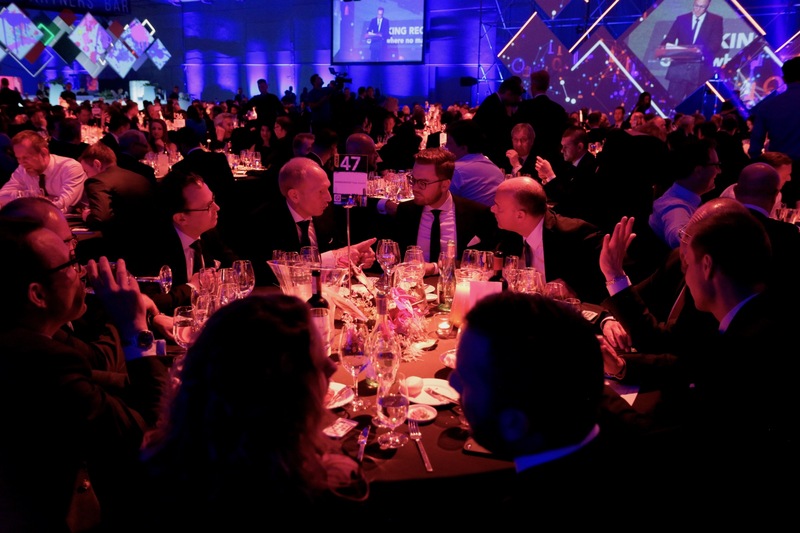 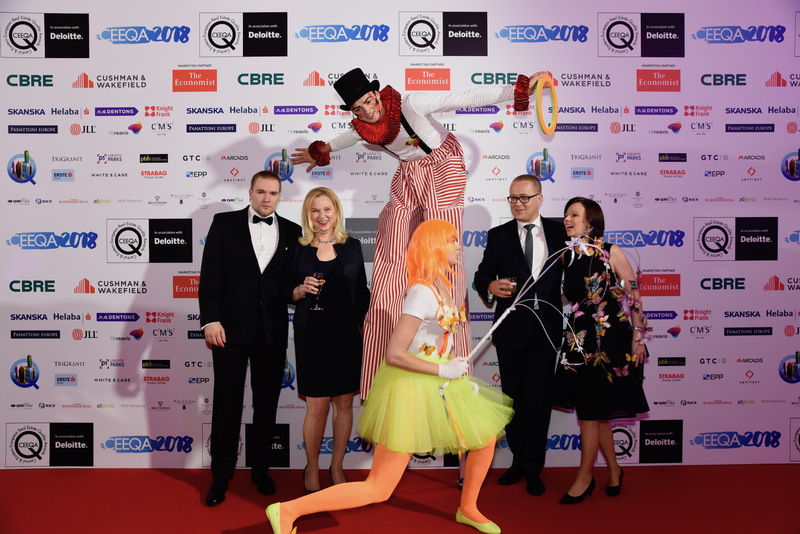 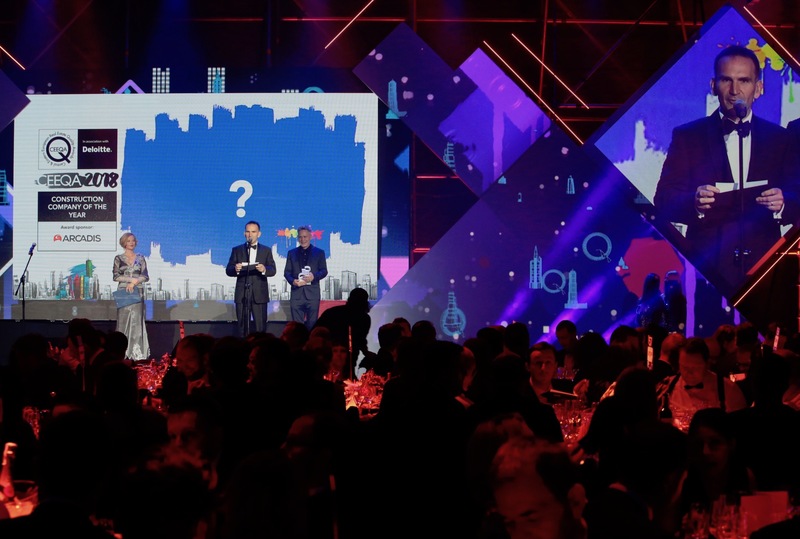 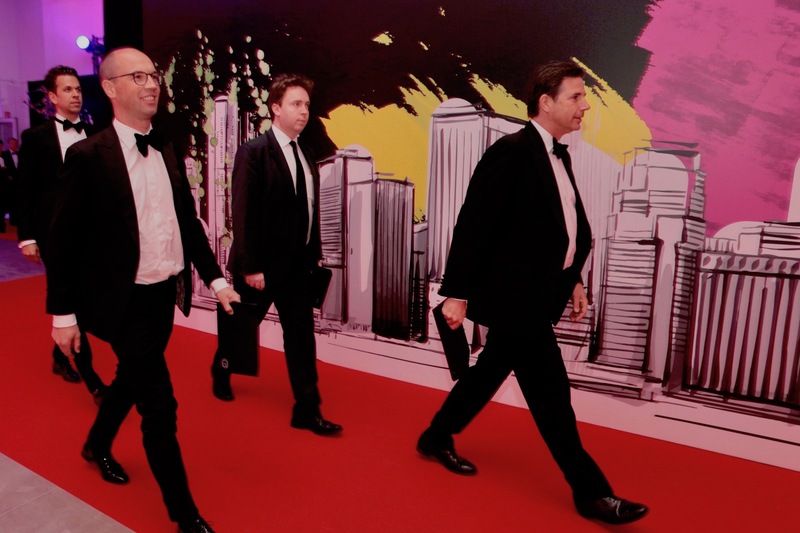 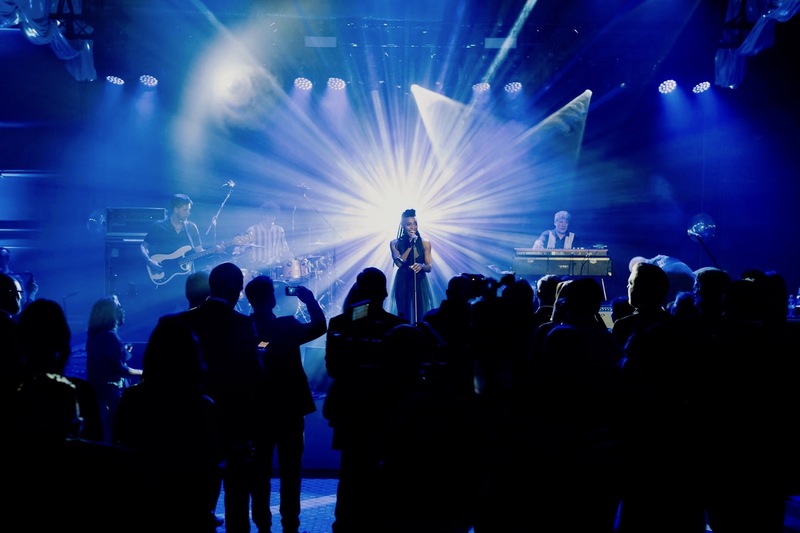 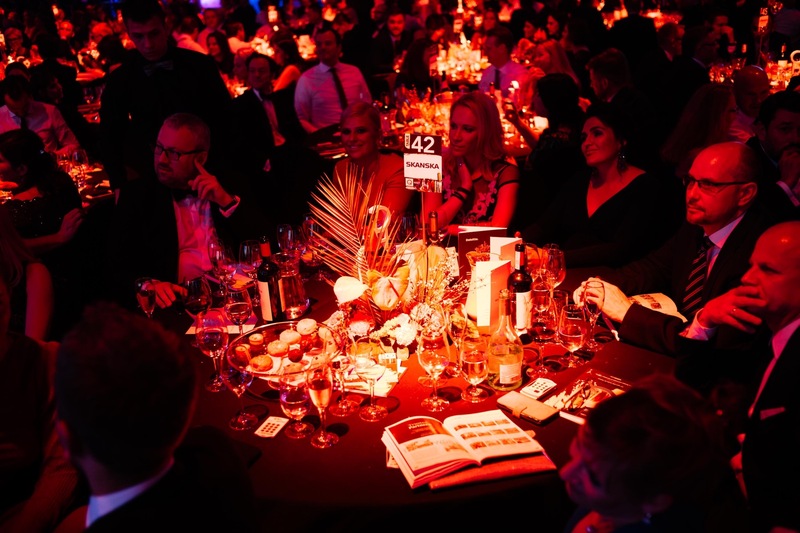 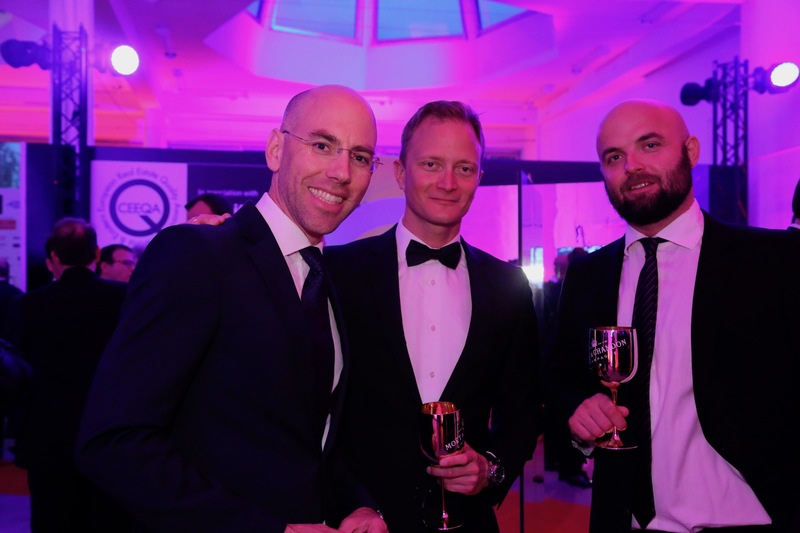 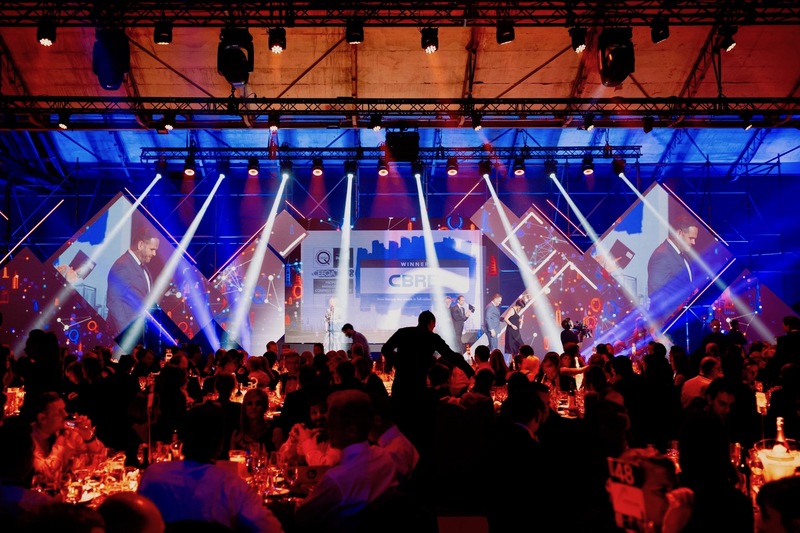 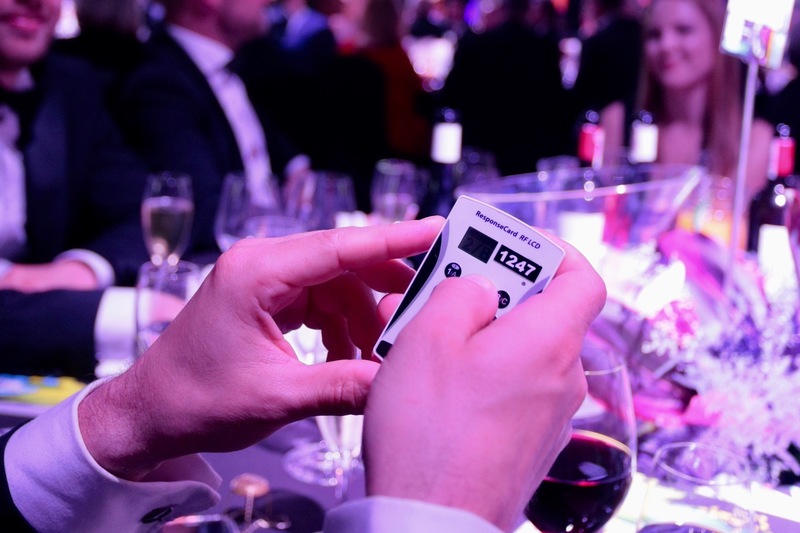 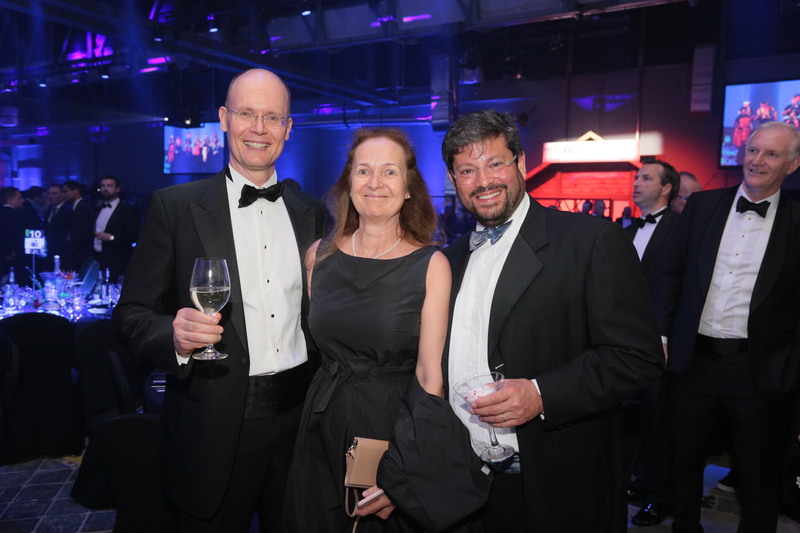 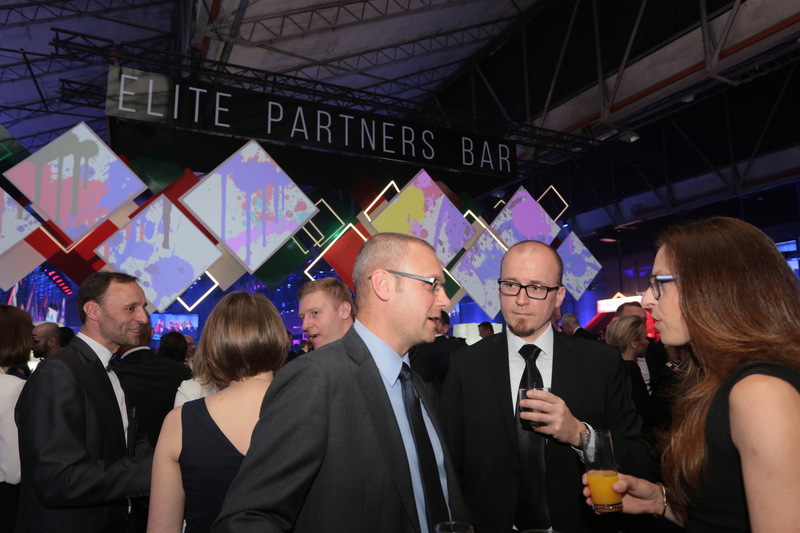 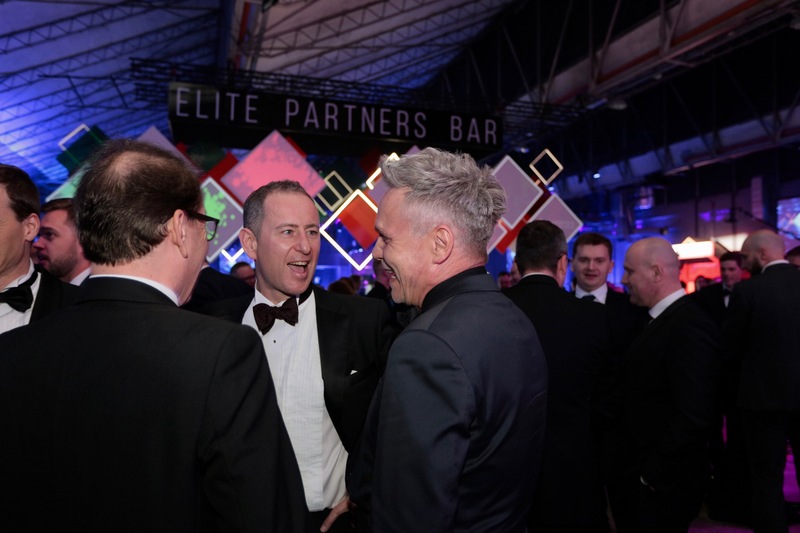 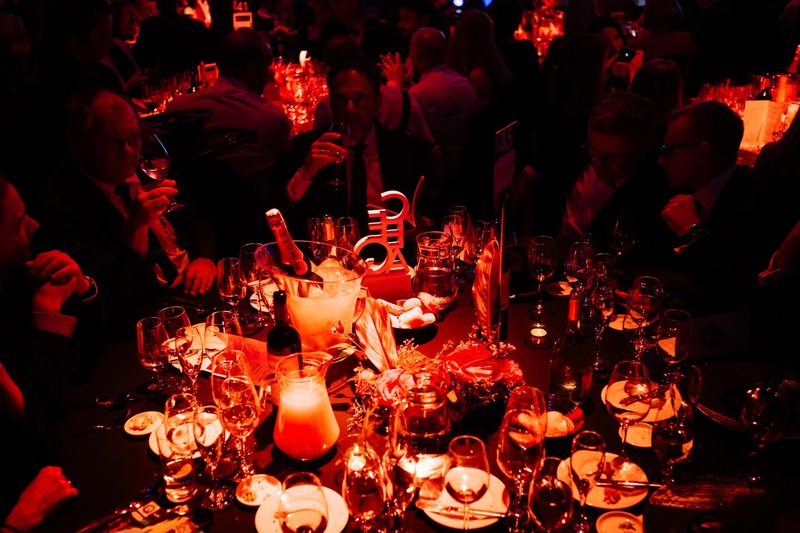 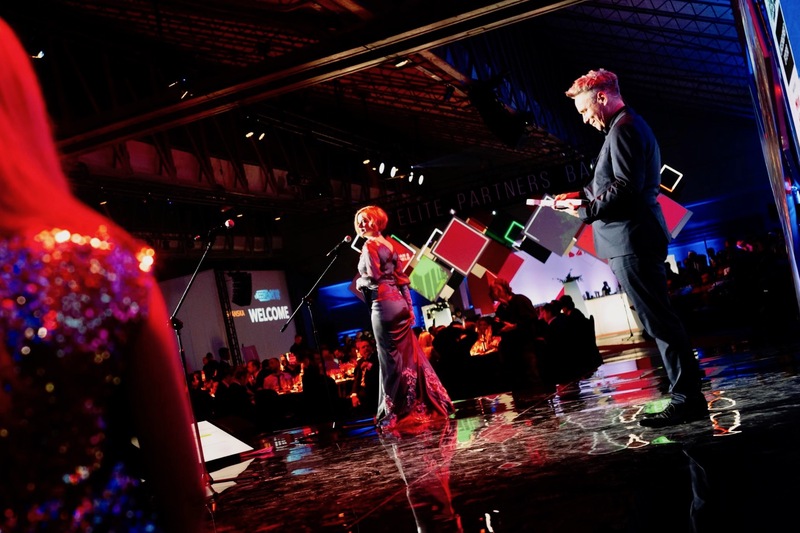 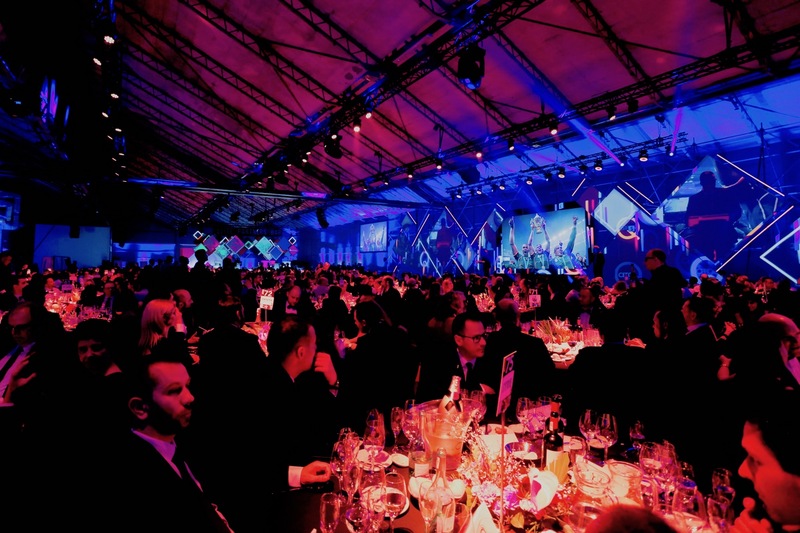 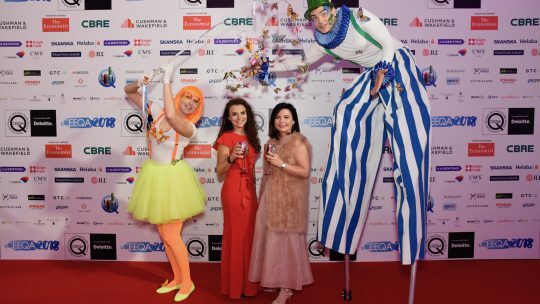 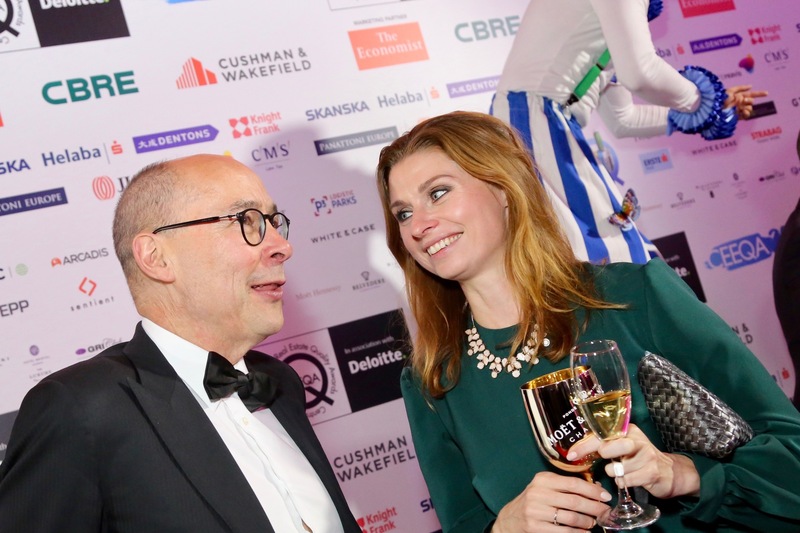 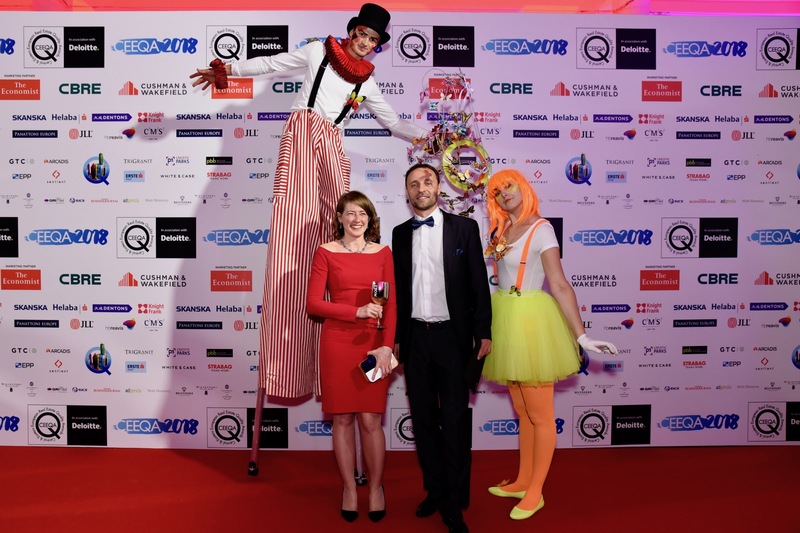 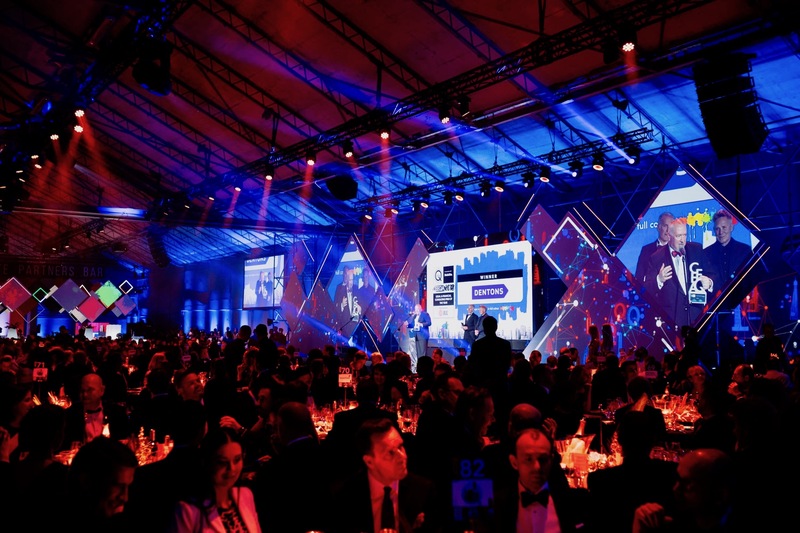 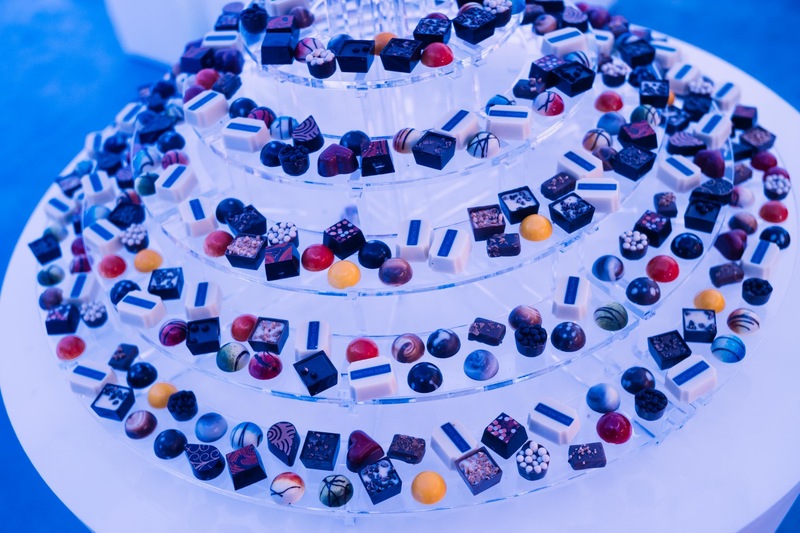 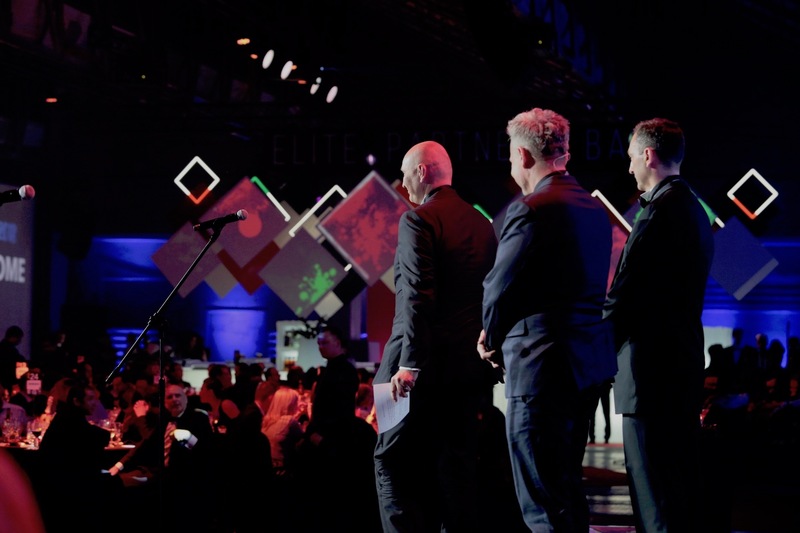 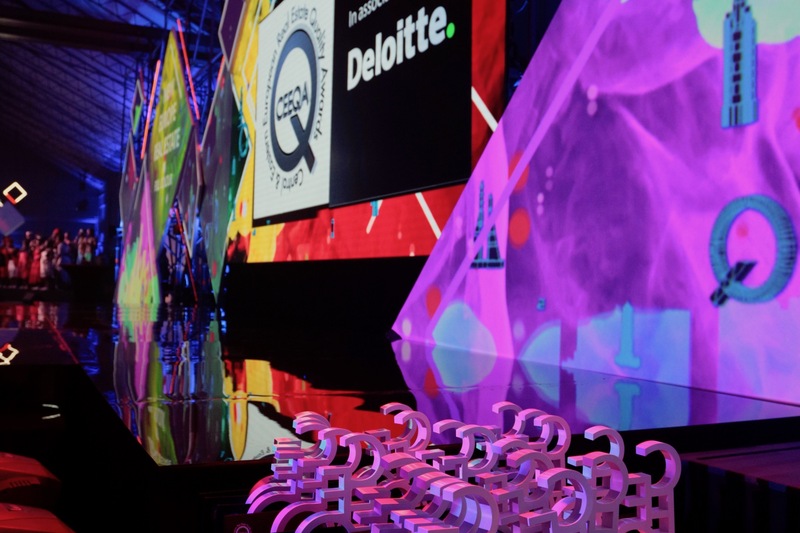 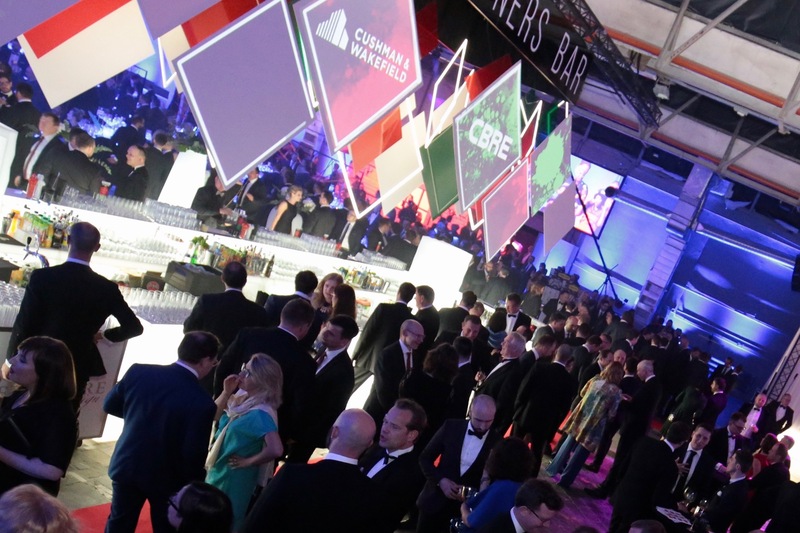 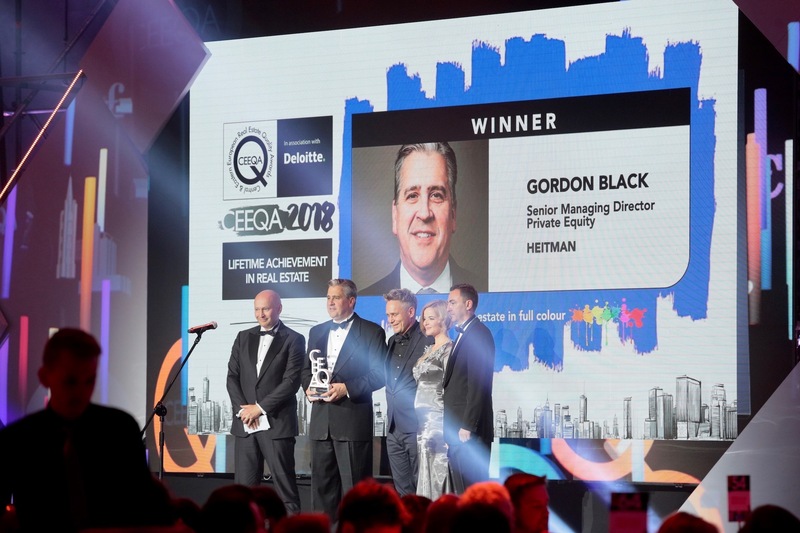 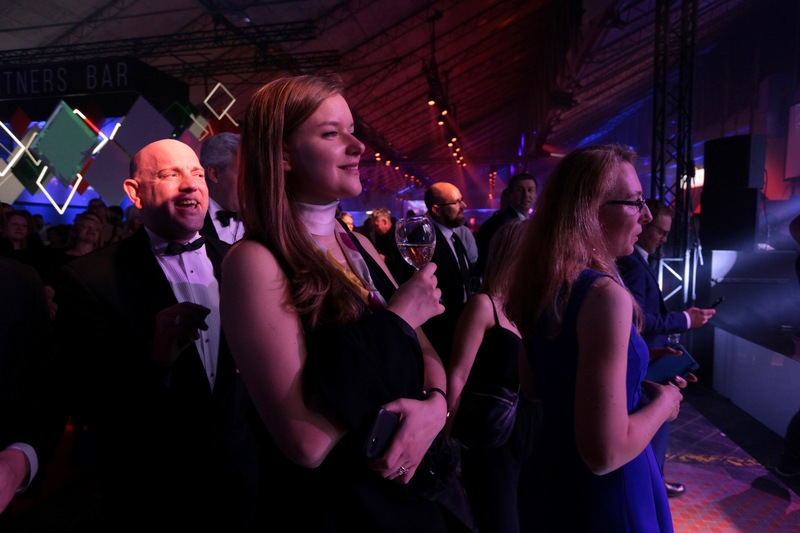 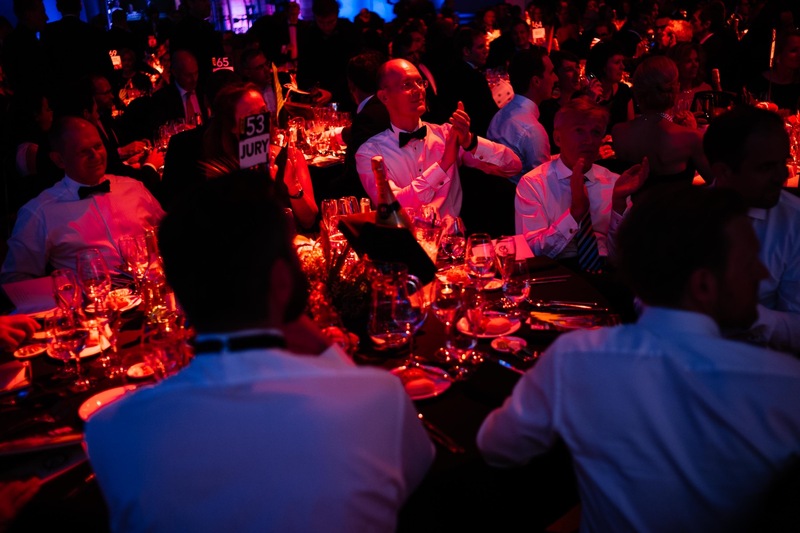 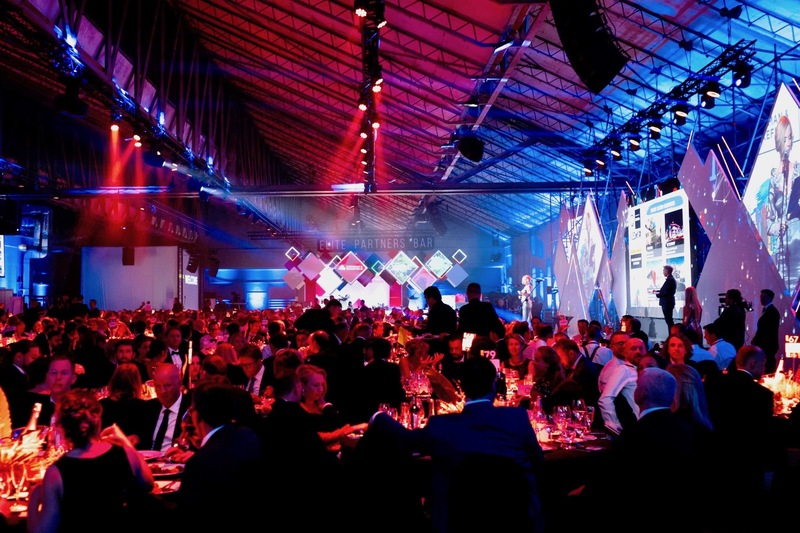 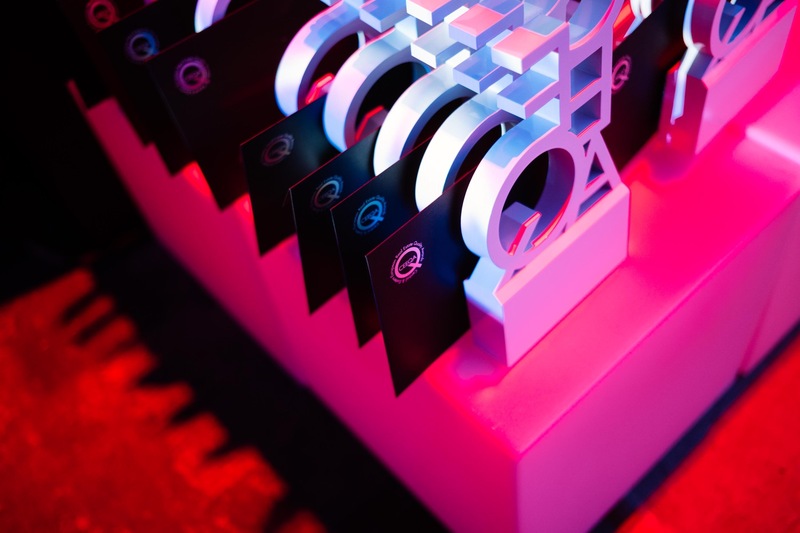 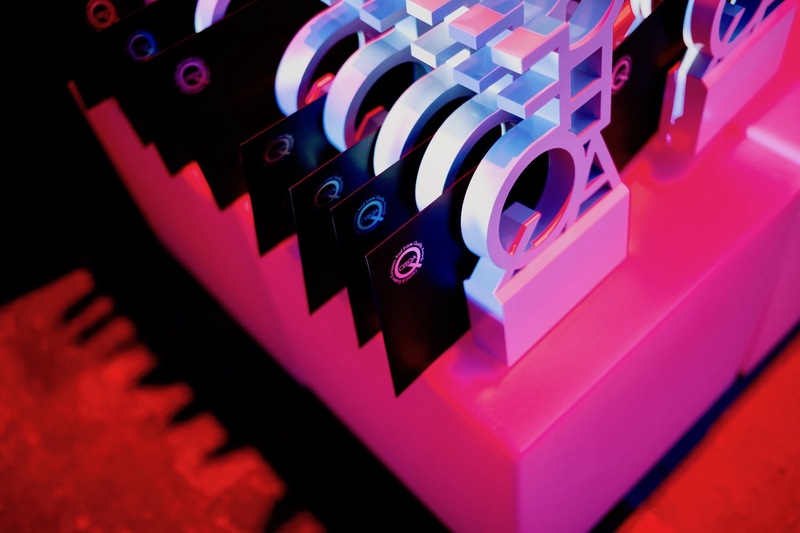 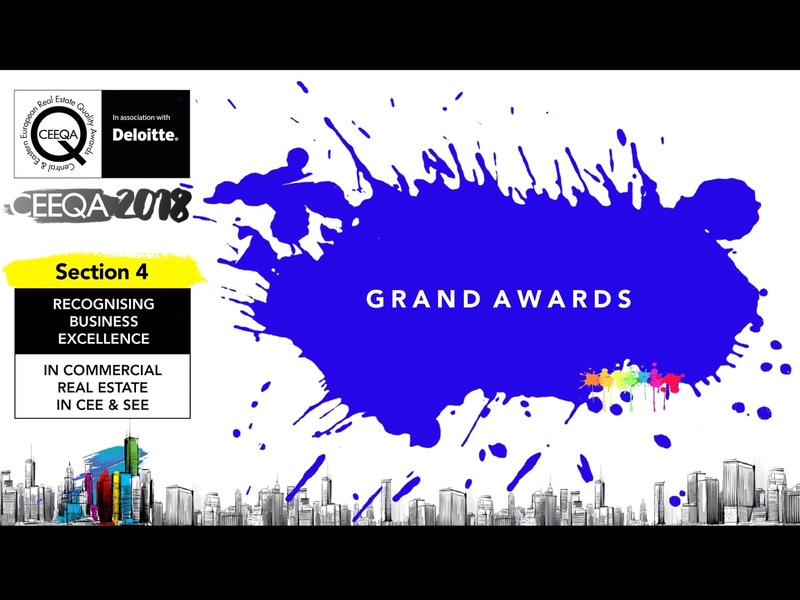 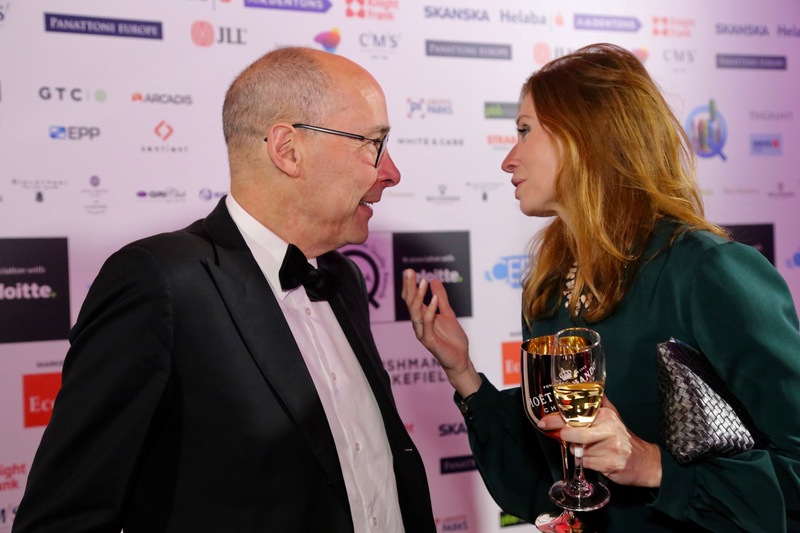 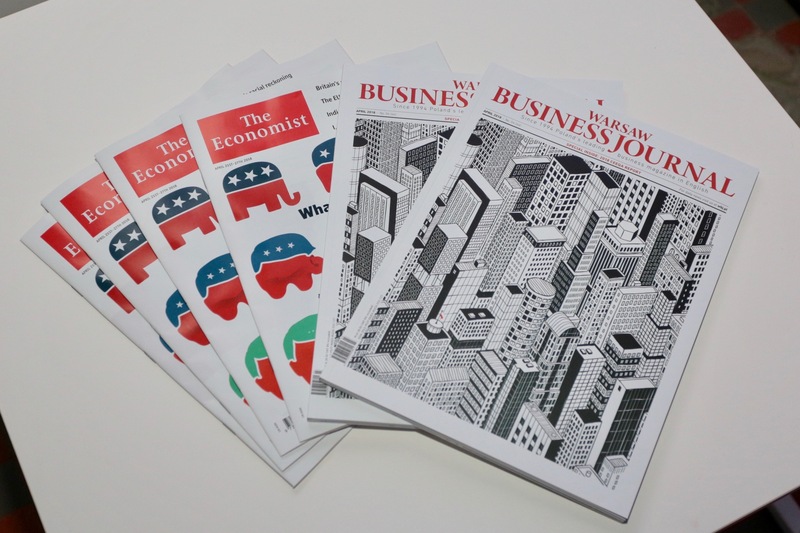 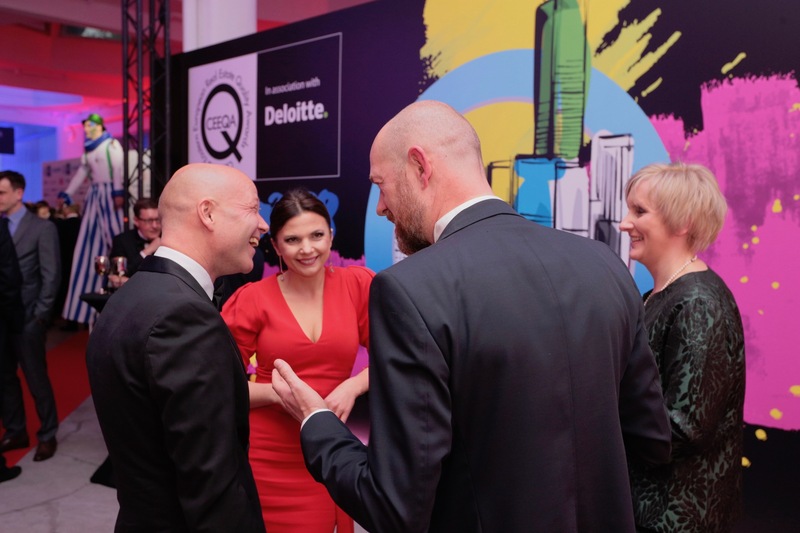 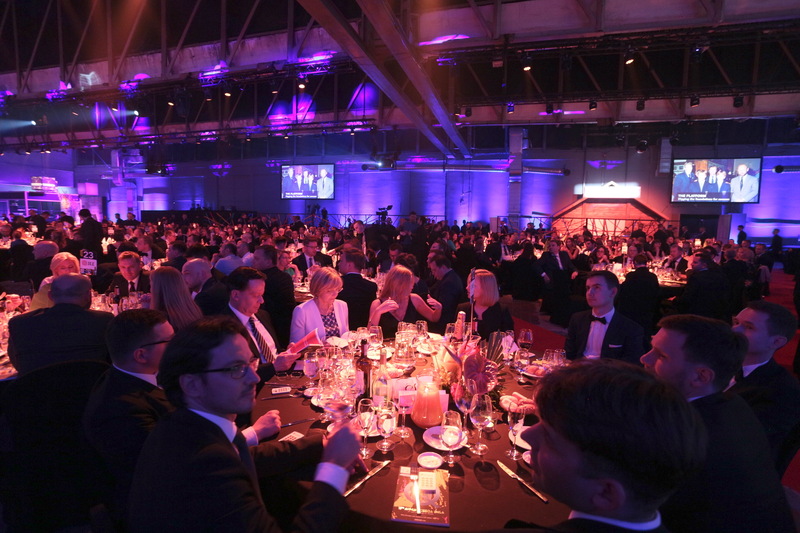 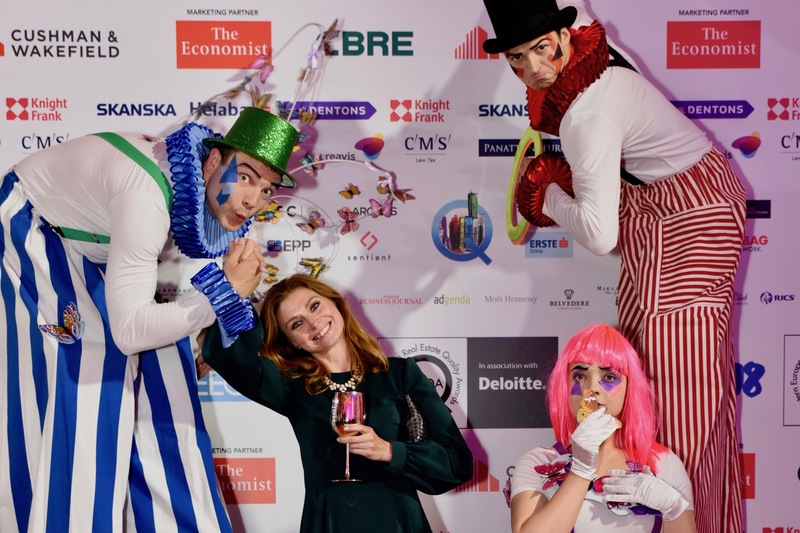 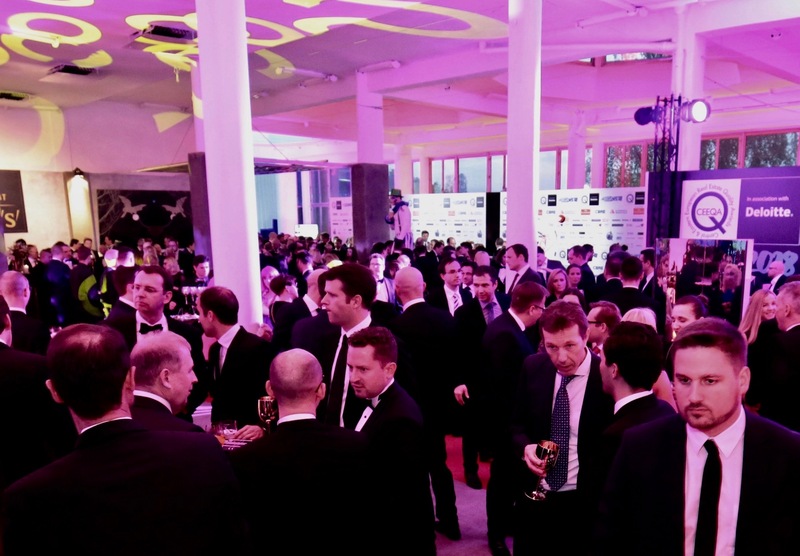 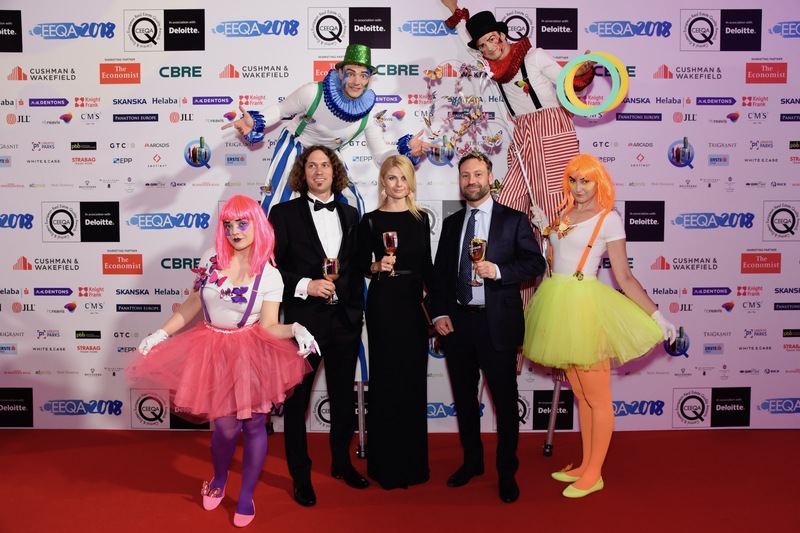 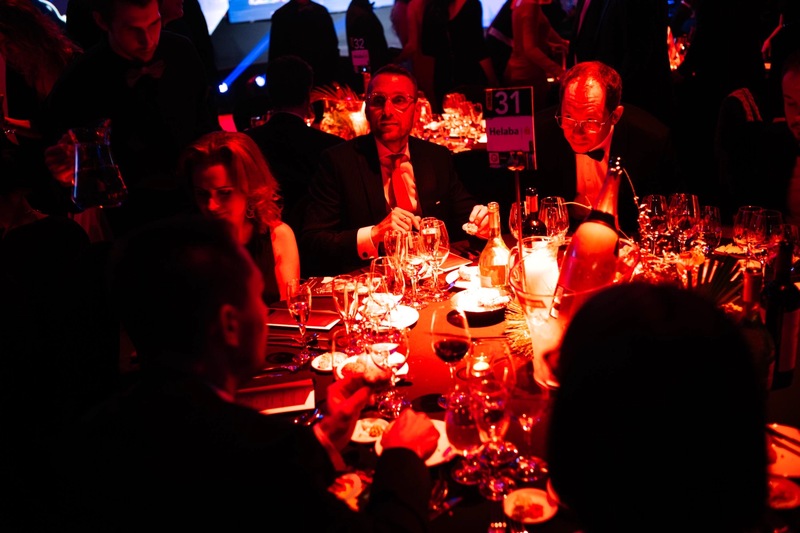 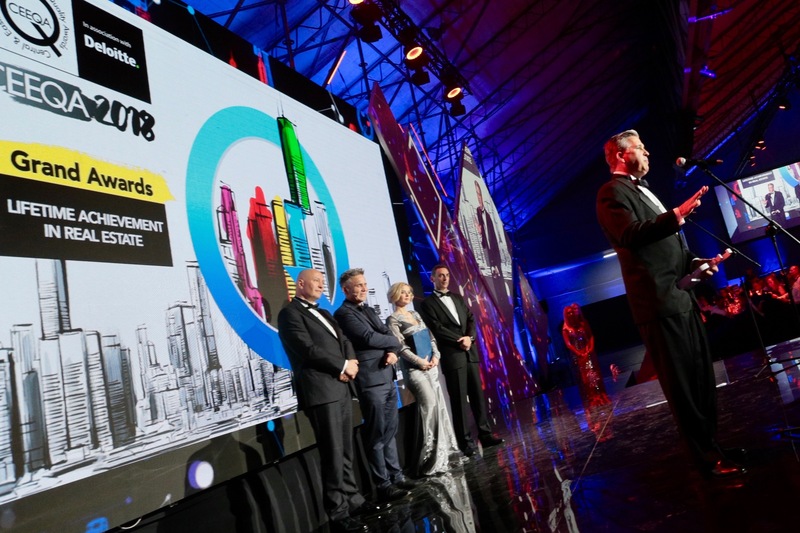 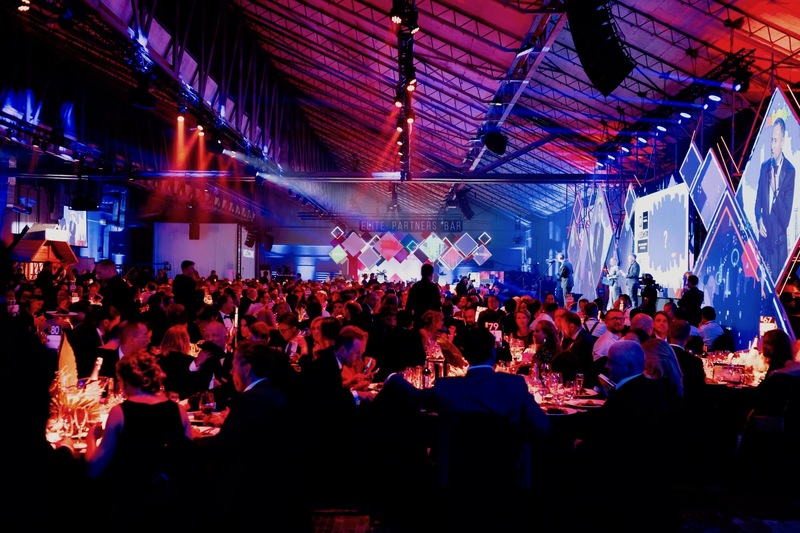 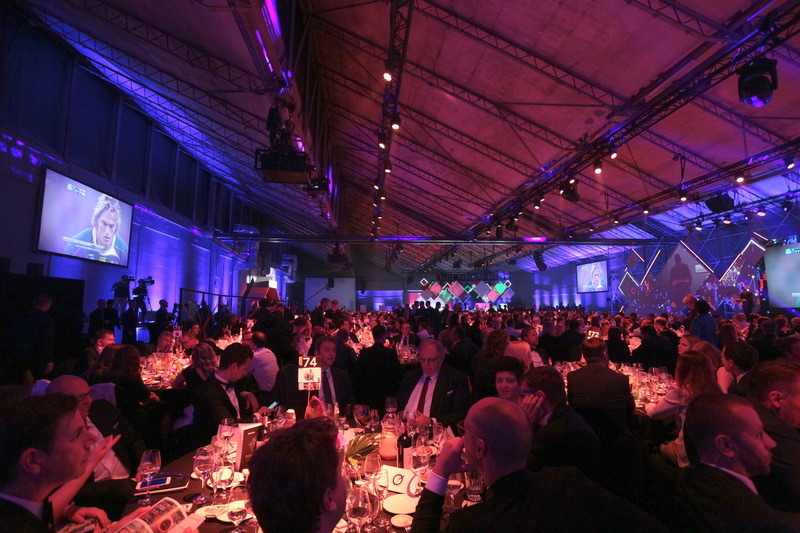 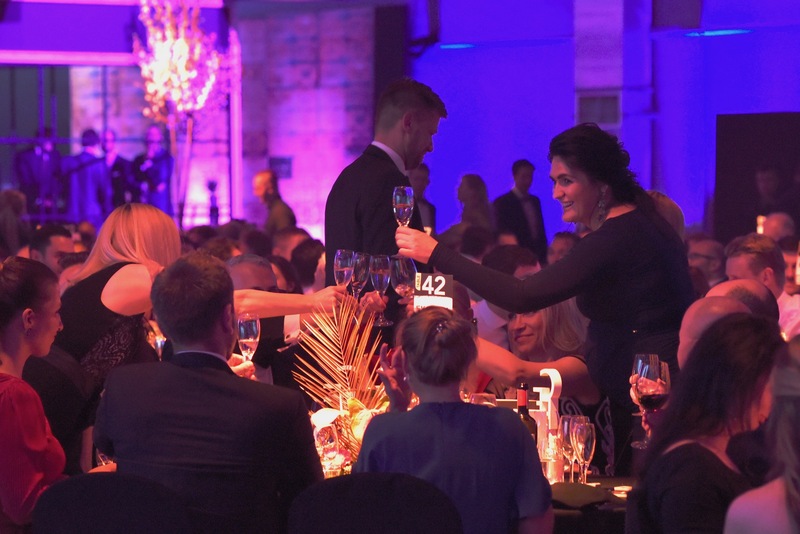 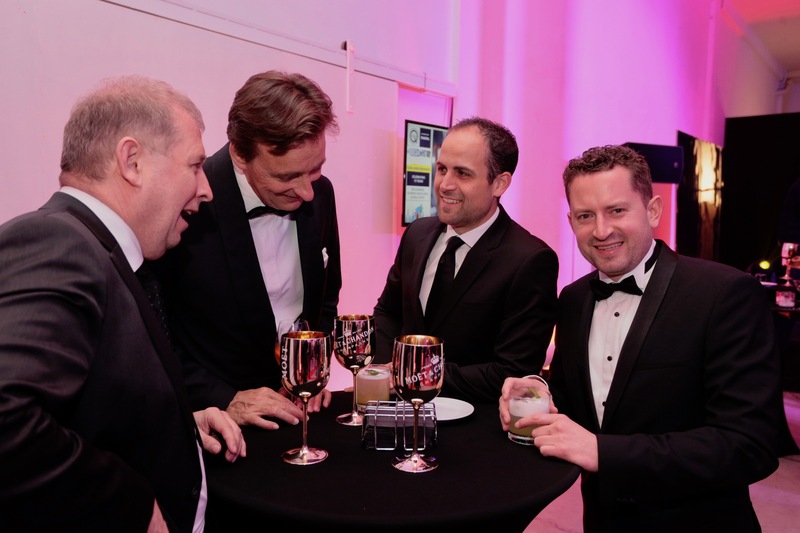 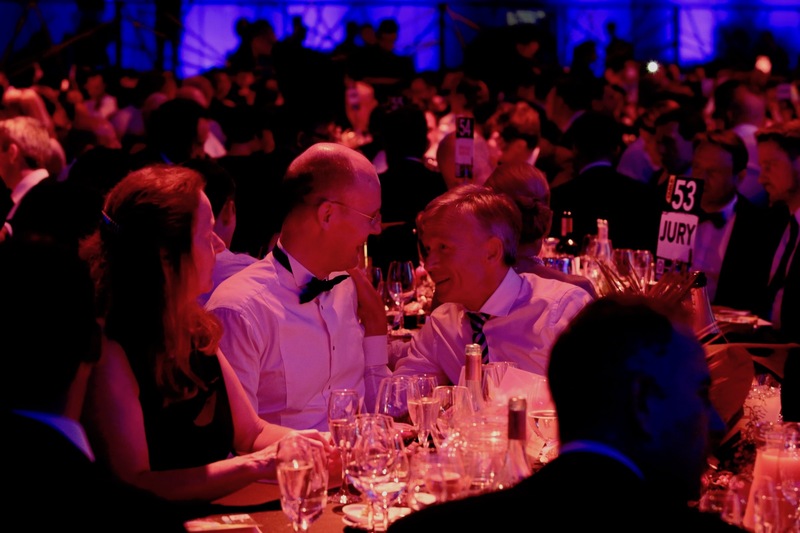 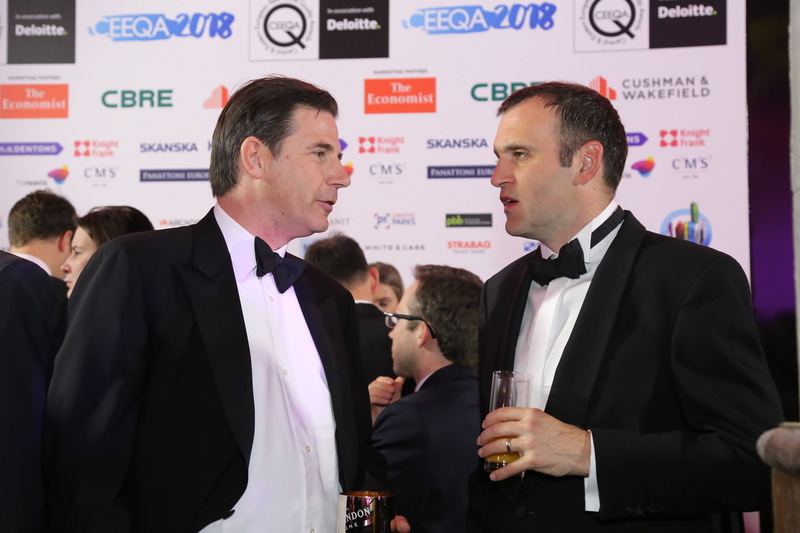 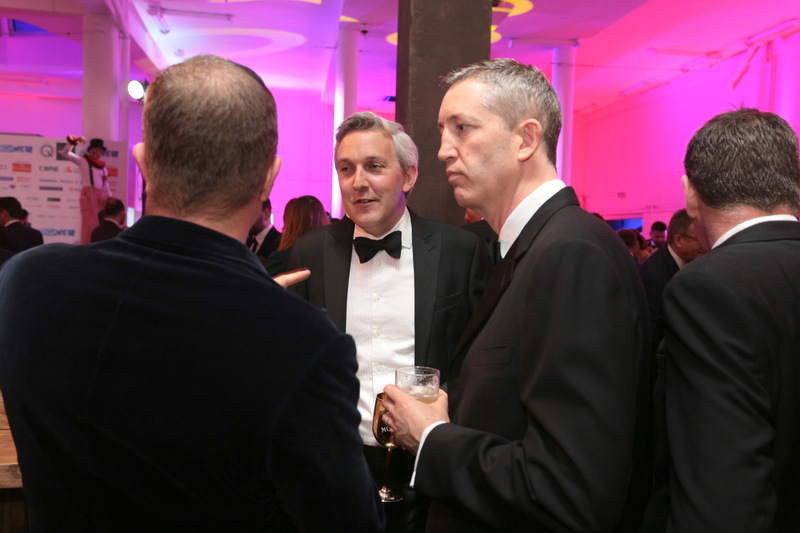 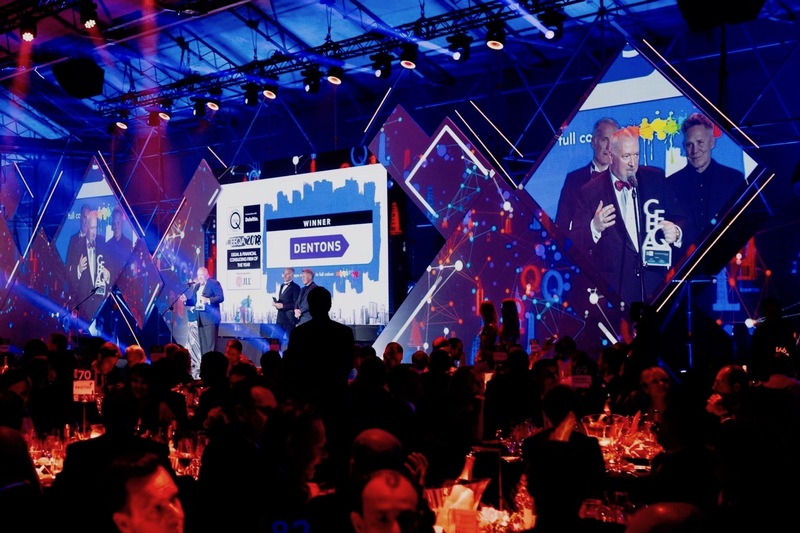 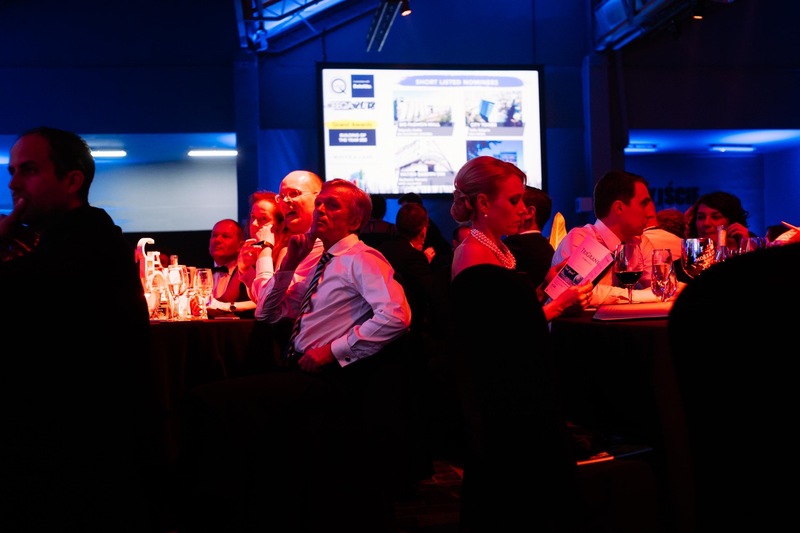 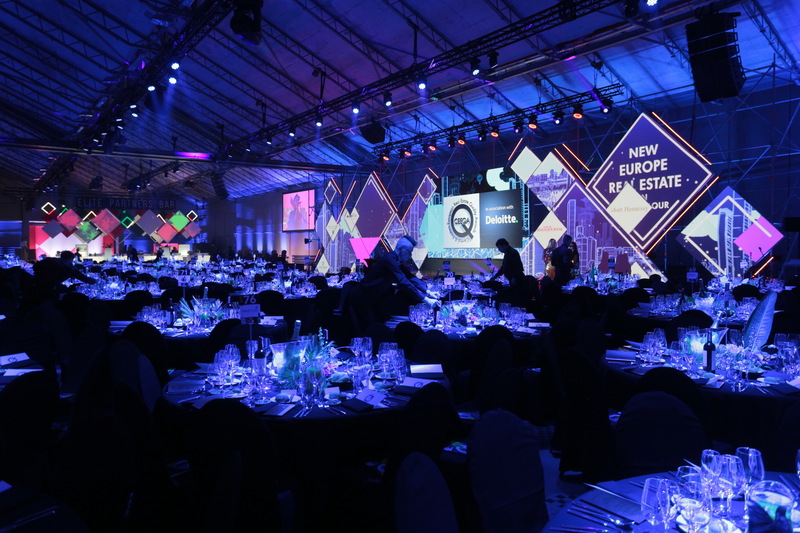 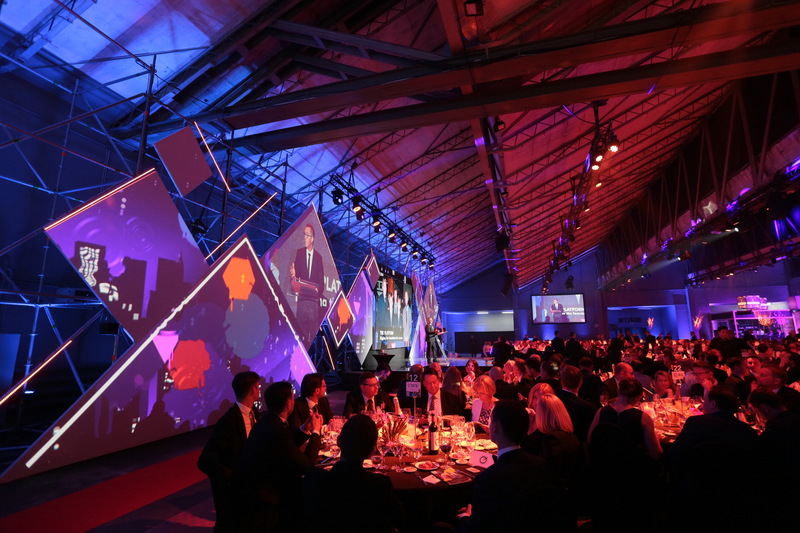 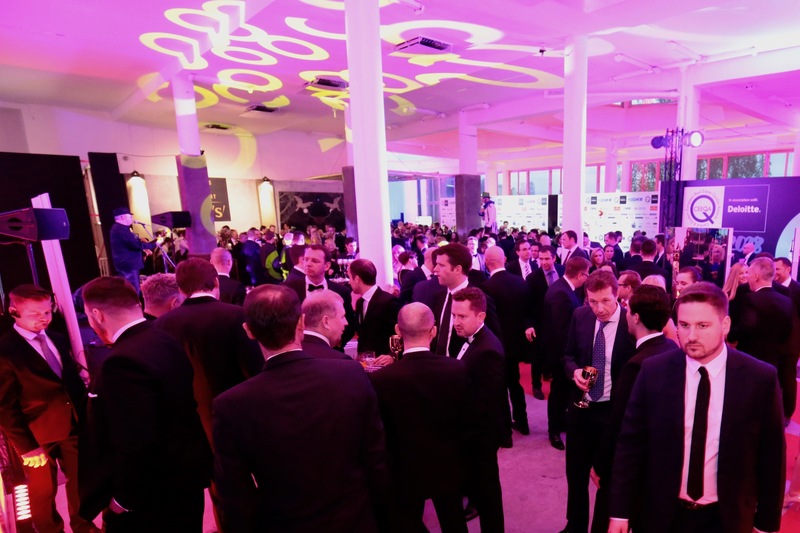 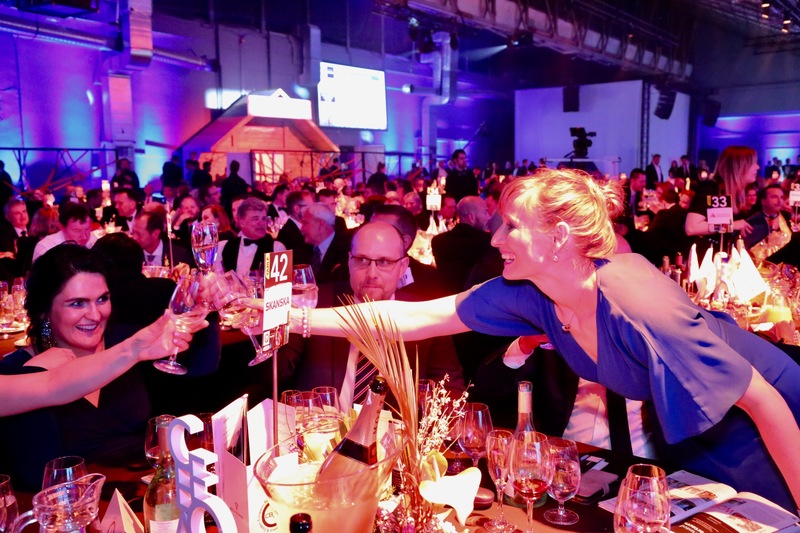 Organised in association with Deloitte and lead marketing partner The Economist, the 15th edition of the New Europe property sector’s main industry awards and flagship annual event enjoyed its most successful campaign to date from all angles – read the full CEEQA 2018 Review report including our exclusive market insights for the year here. 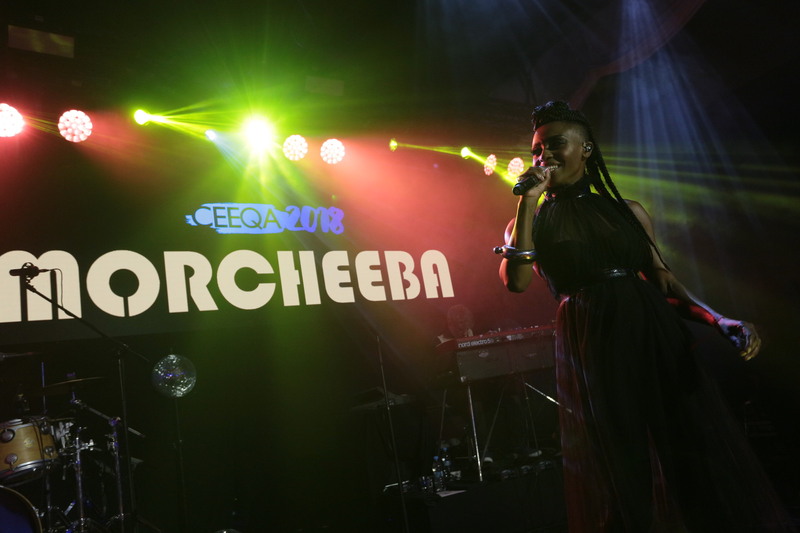 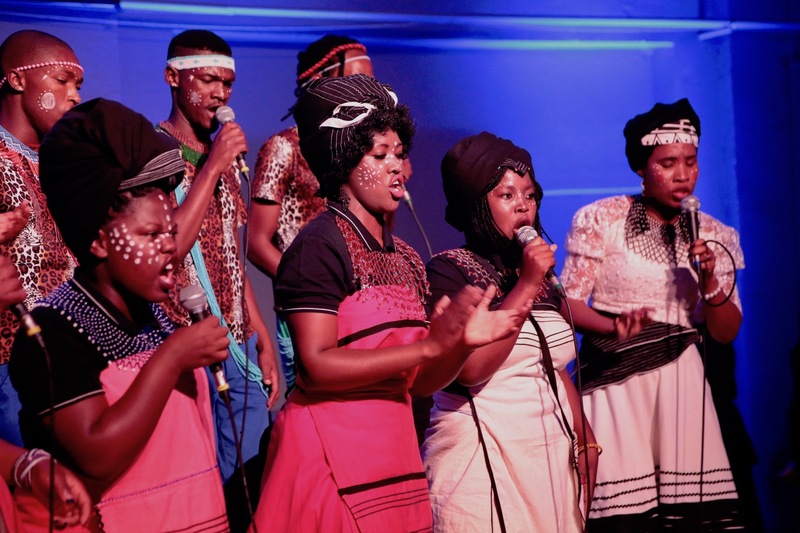 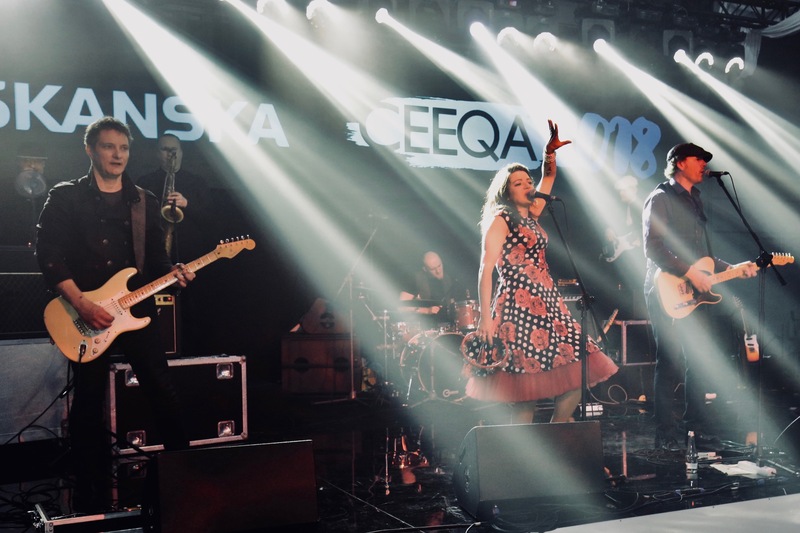 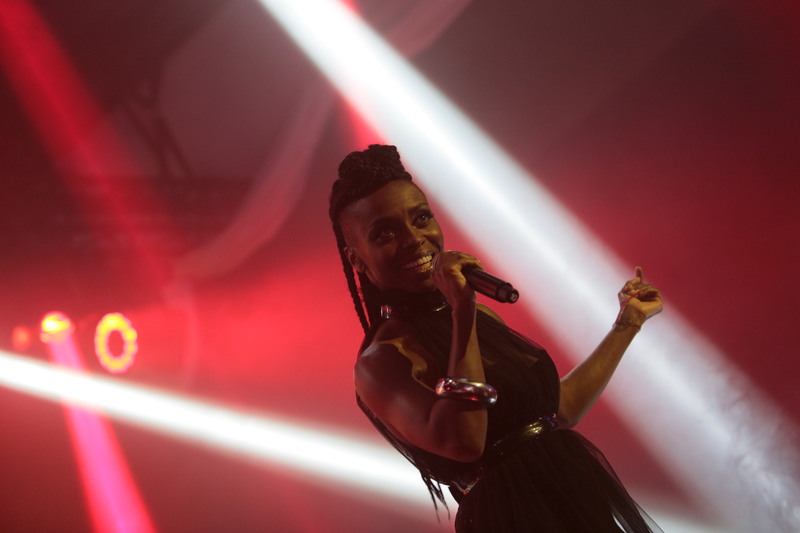 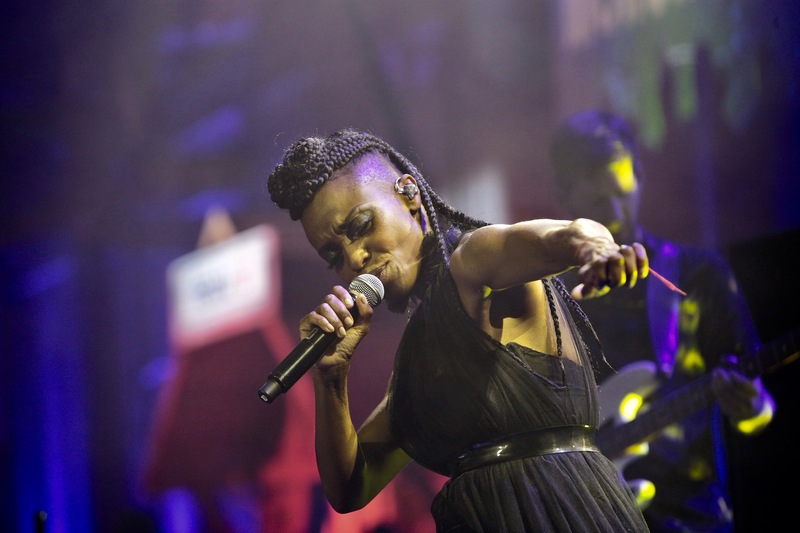 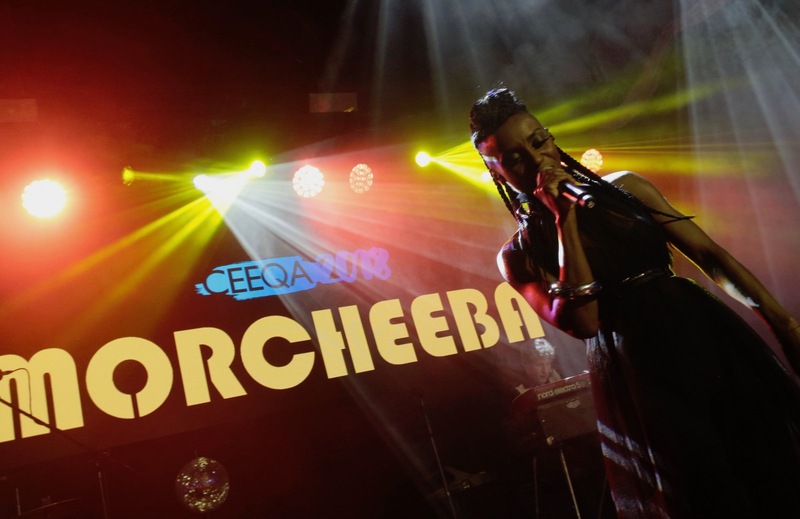 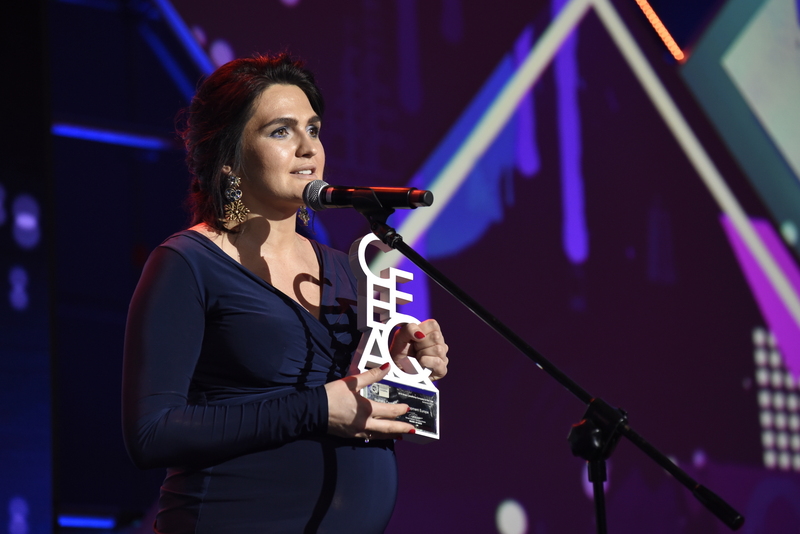 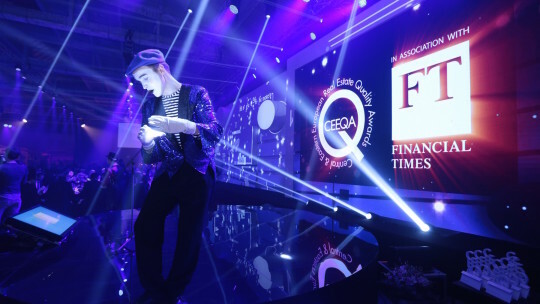 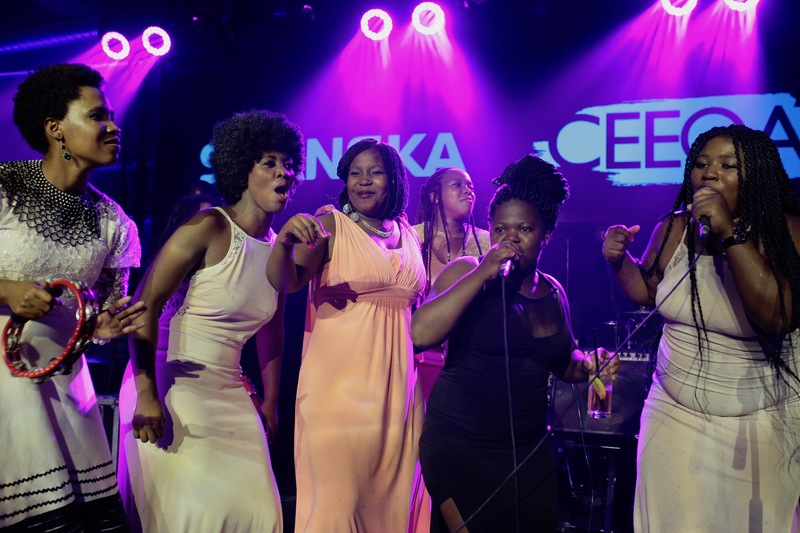 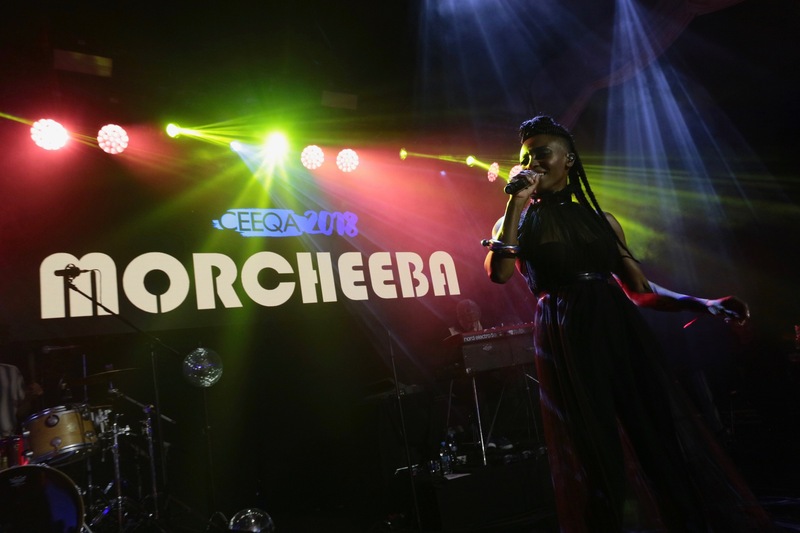 The 16th edition of CEEQA kicks off on 8th January 2019 (call for entries) and closes on 15th May 2019 with another edition of the CEEQA Gala. 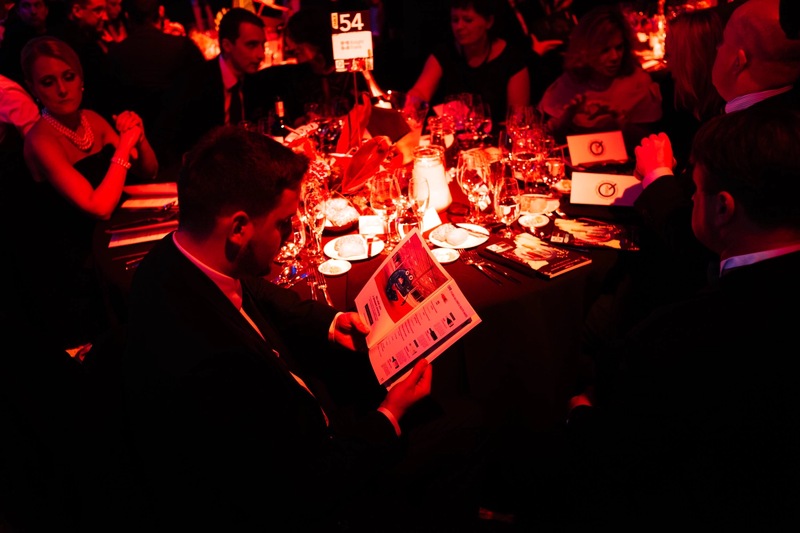 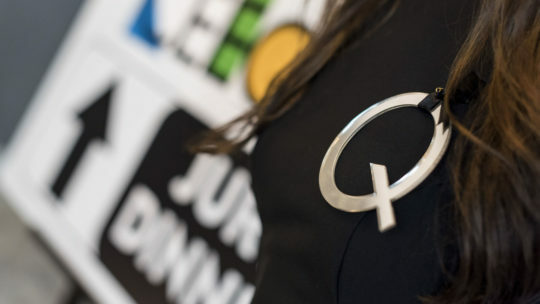 The deadline for entries is 15th February and the 2019 short list will be announced on 10th April. 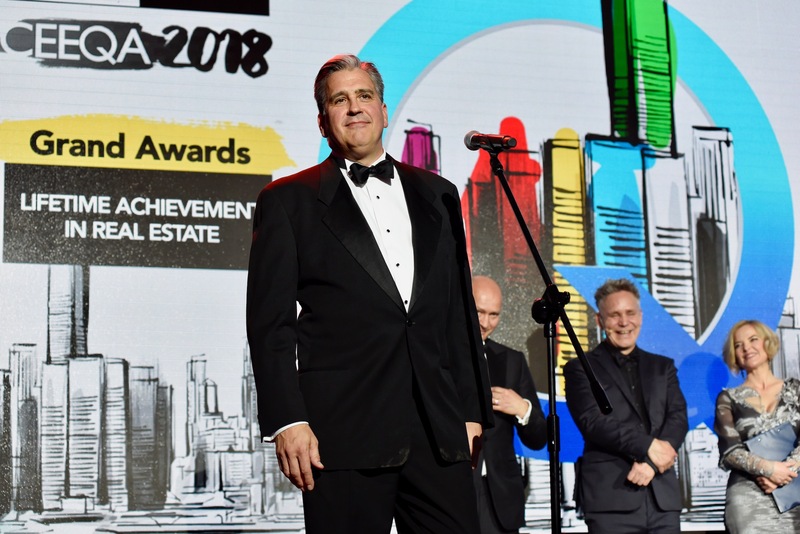 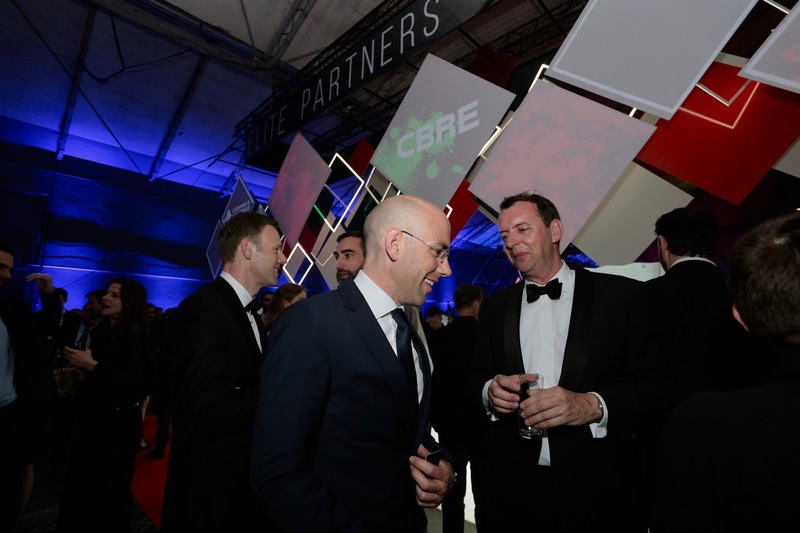 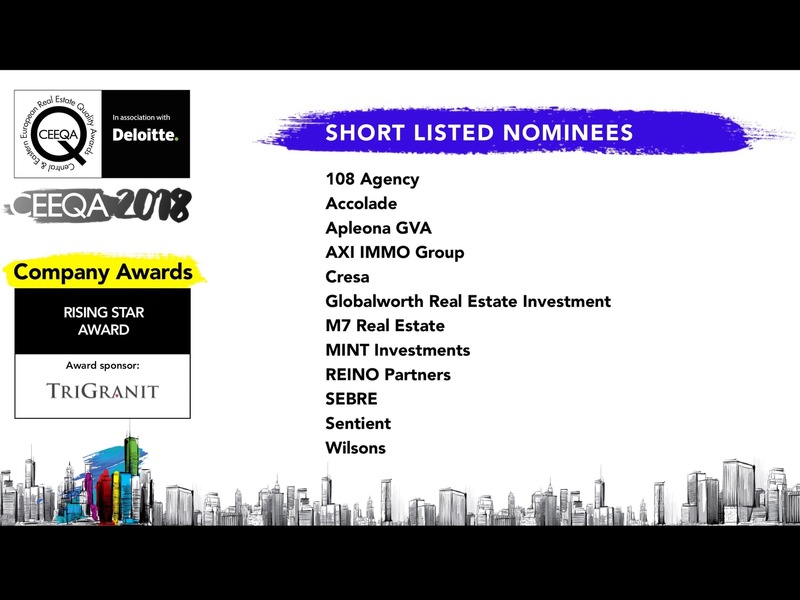 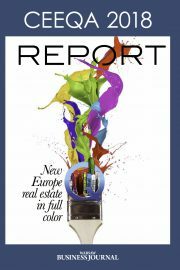 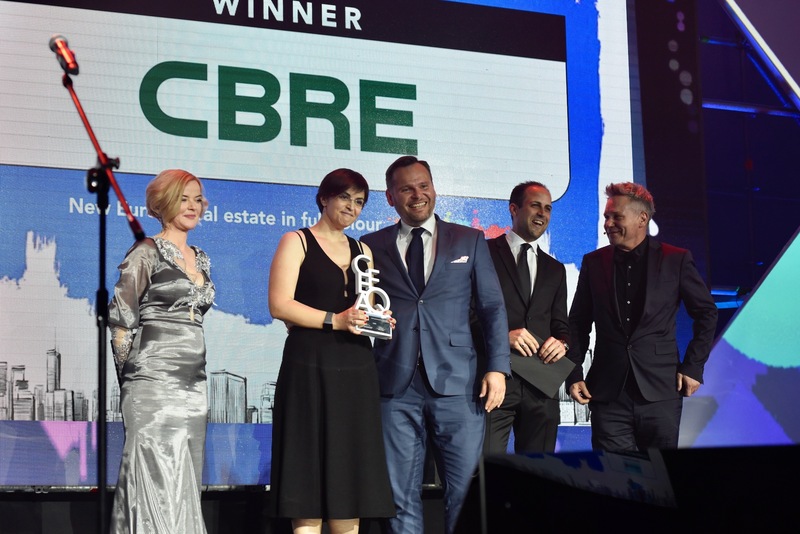 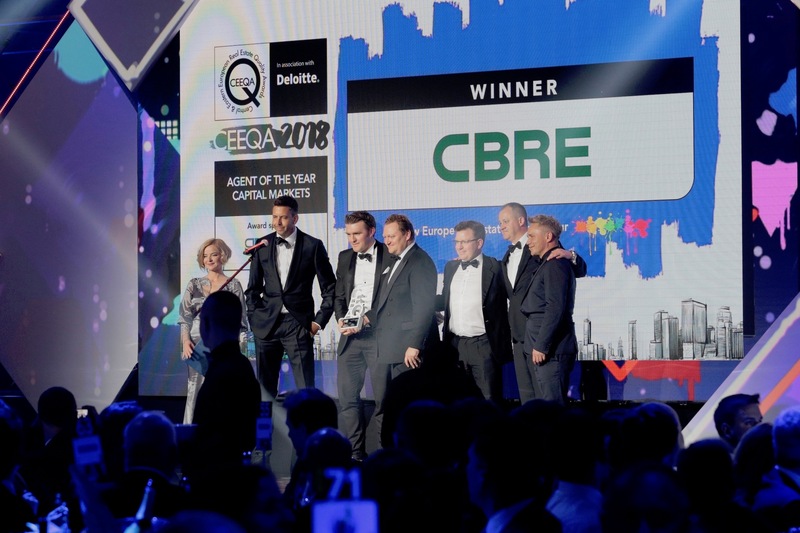 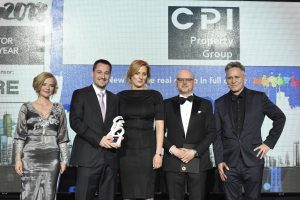 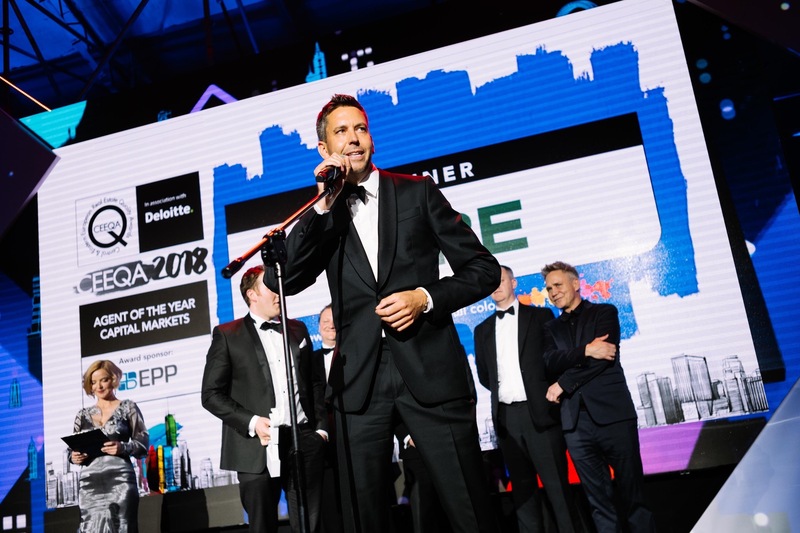 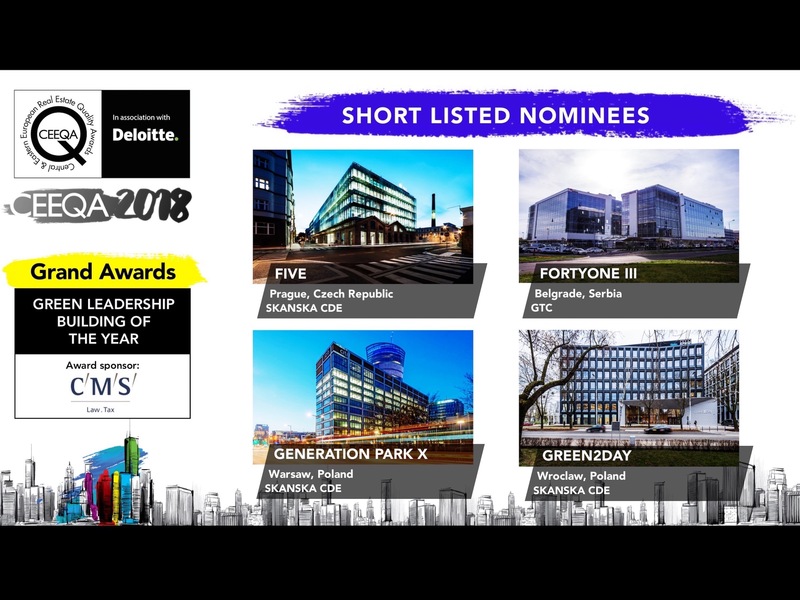 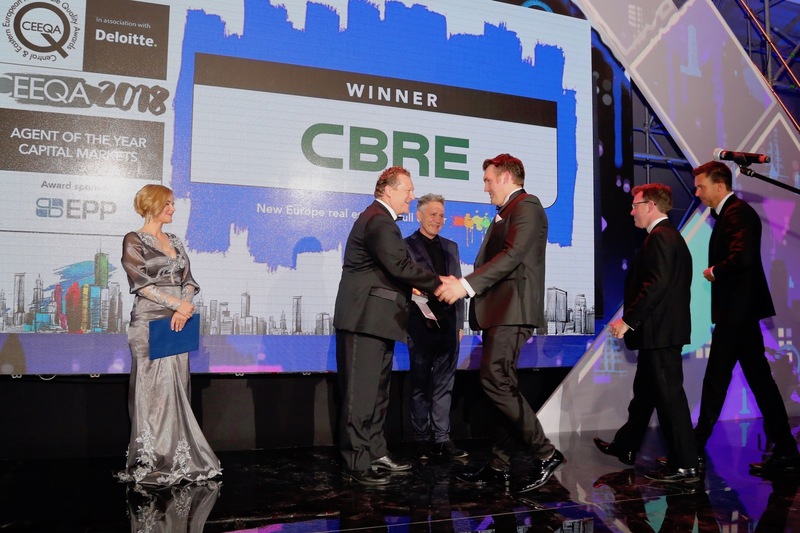 In a sector that enjoyed a record year in investment transactions as well as a significant shift in the volume of high calibre product delivered onto the market in 2017, global advisor CBRE won three of the four Agent Awards categories with the Office Agency, Industrial Agency and Capital Markets titles. 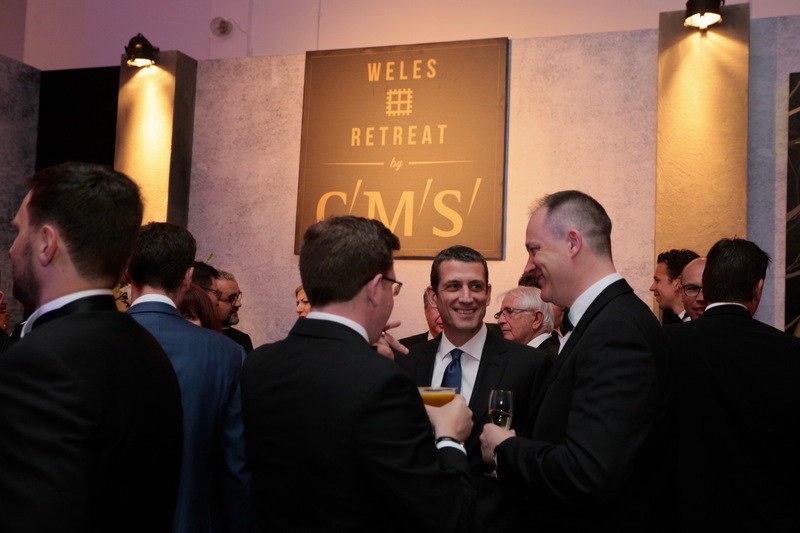 This marked a significant shift in the power base among the global agents active in the sector which spans the 18 emerging post-communist countries known as Central & Eastern Europe and Southeast Europe, stretching from Estonia in the north to Albania in the south. 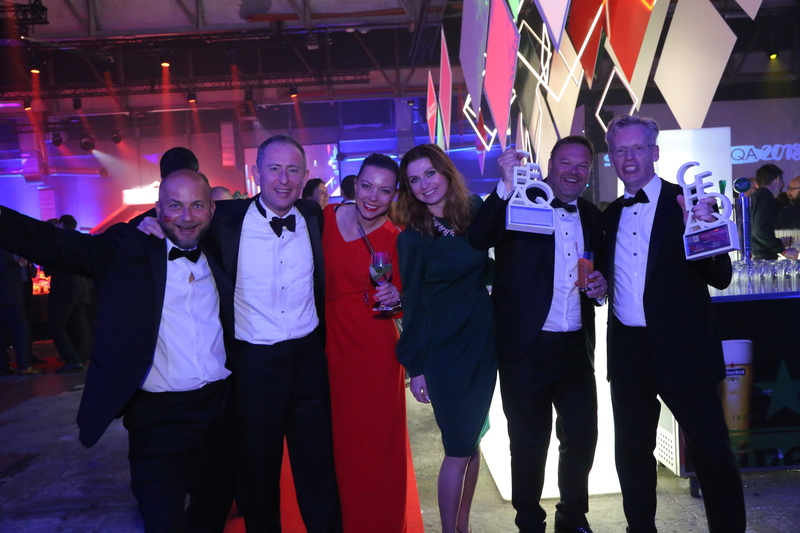 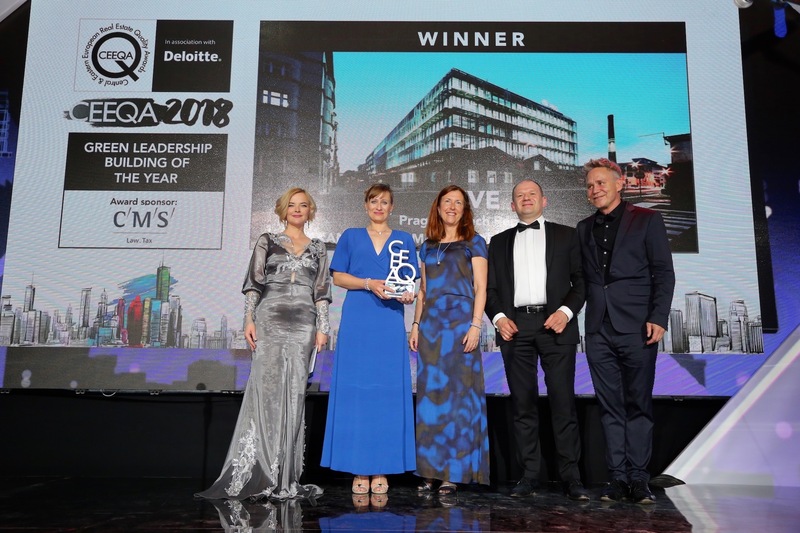 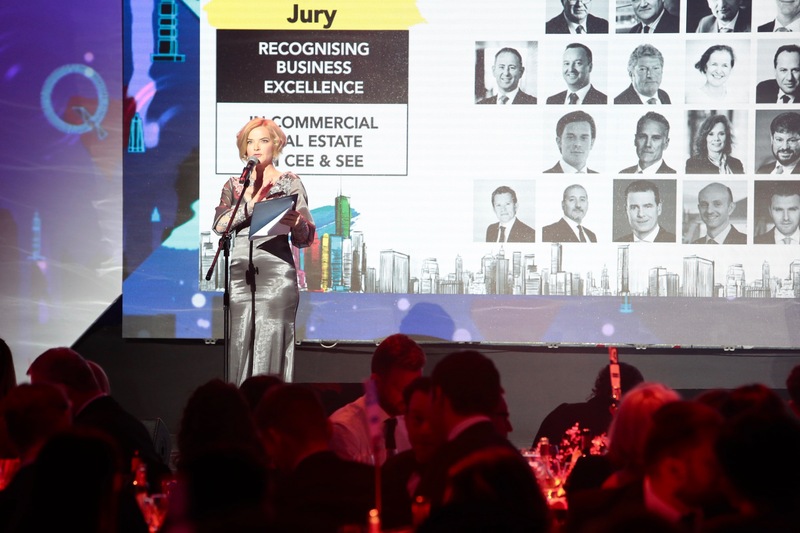 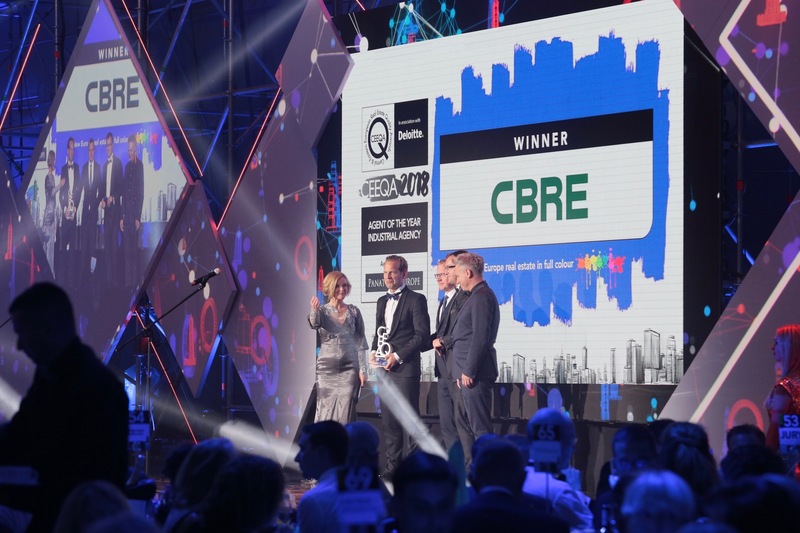 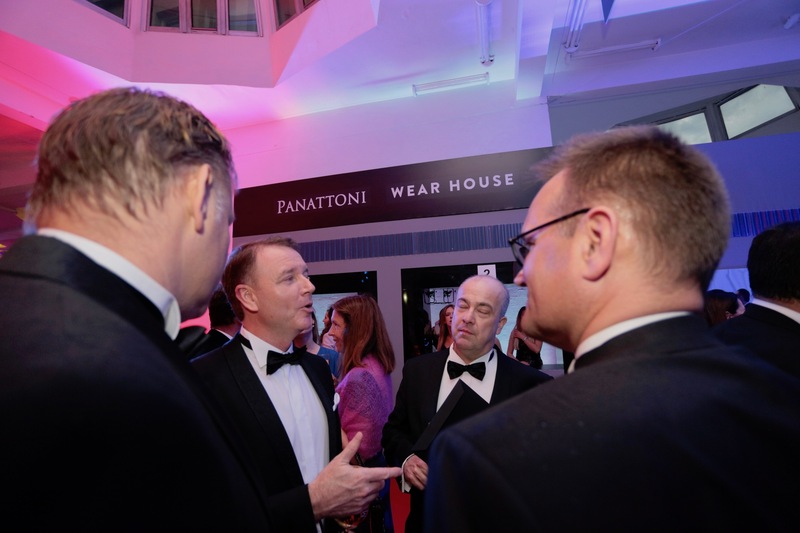 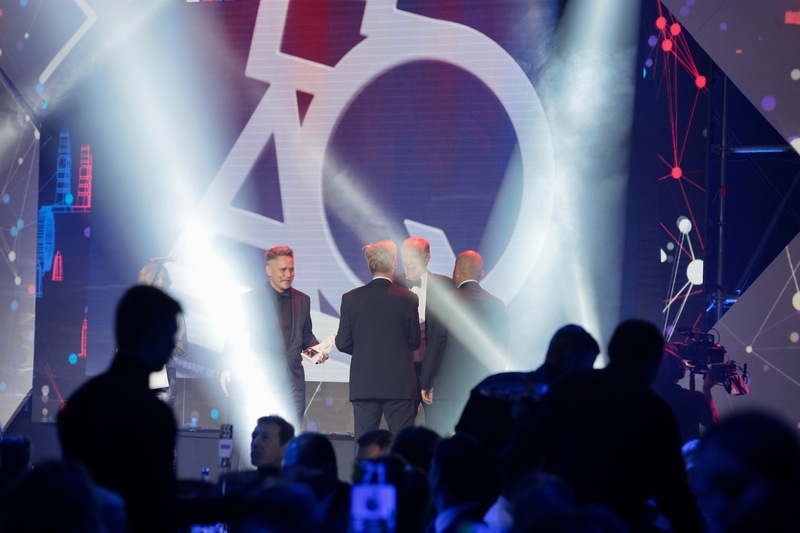 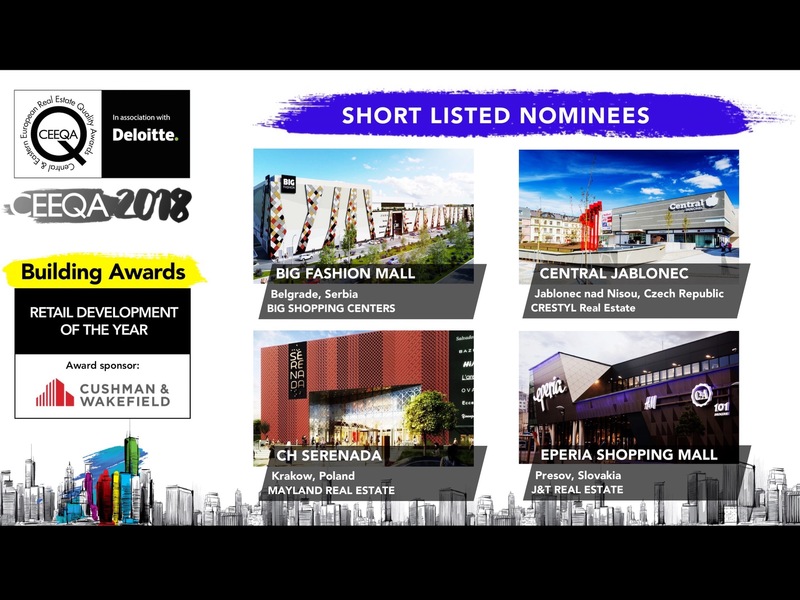 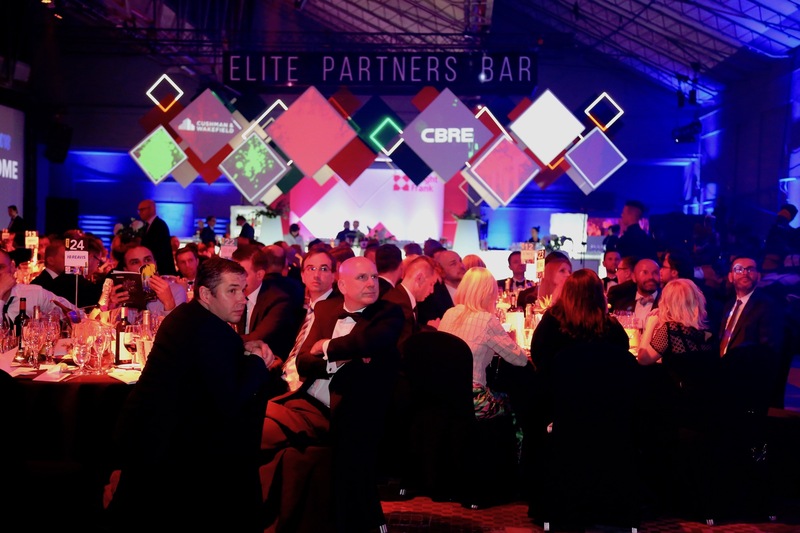 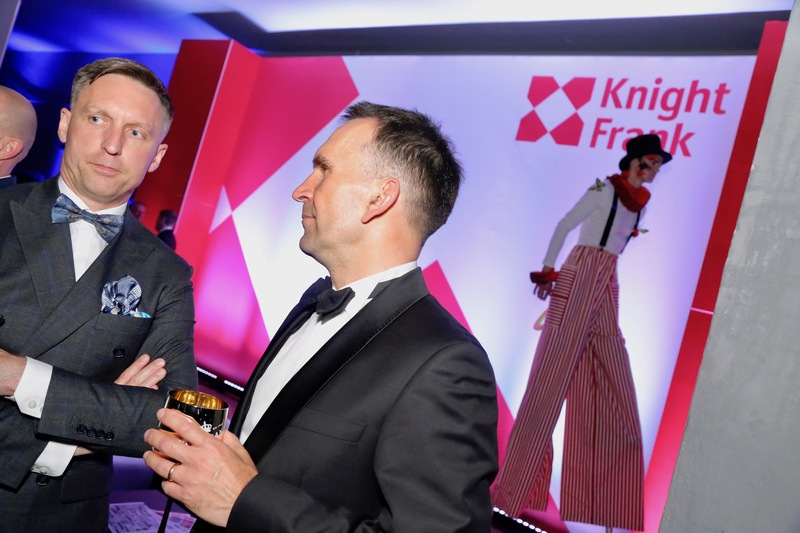 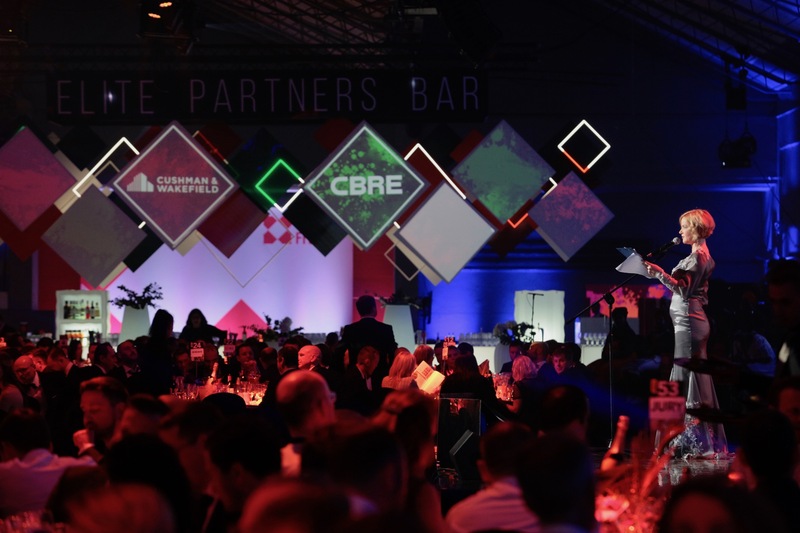 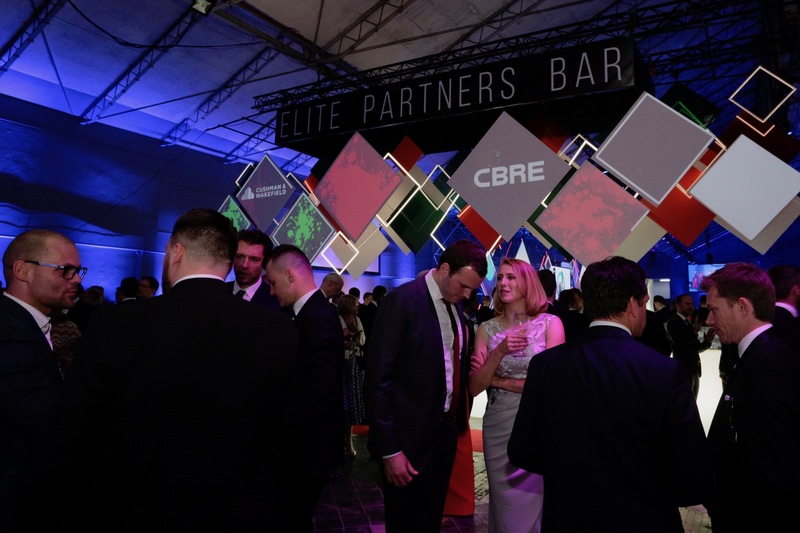 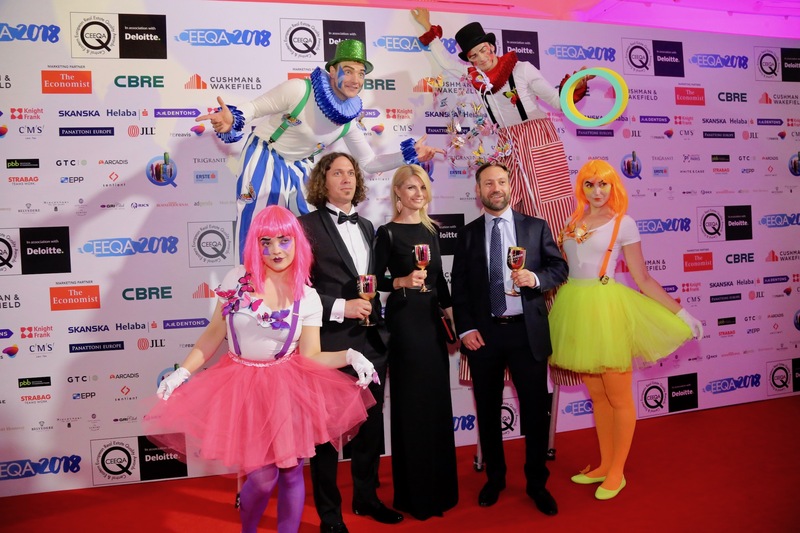 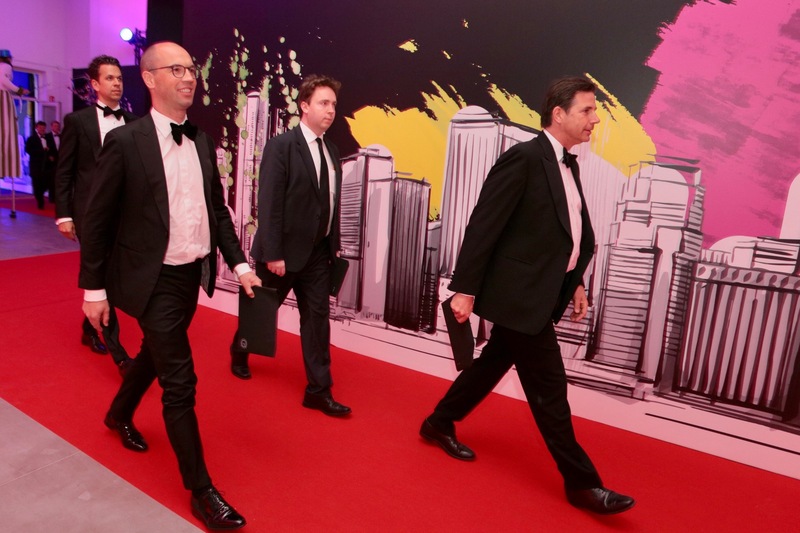 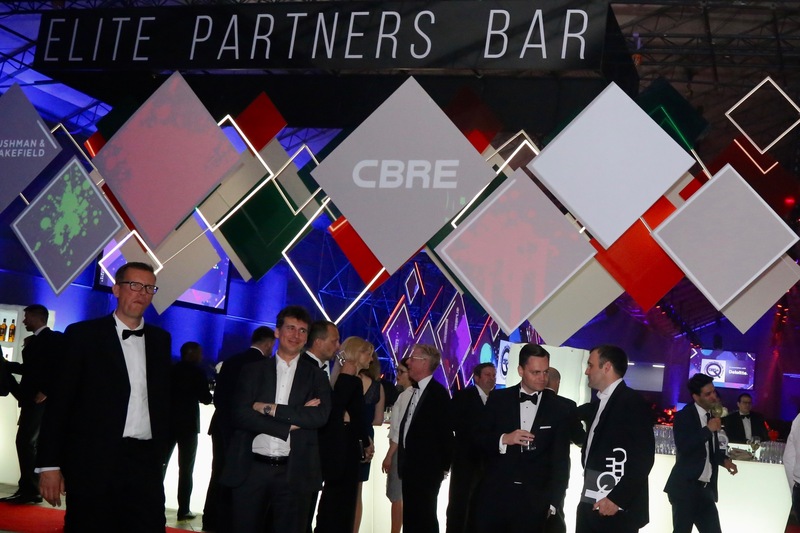 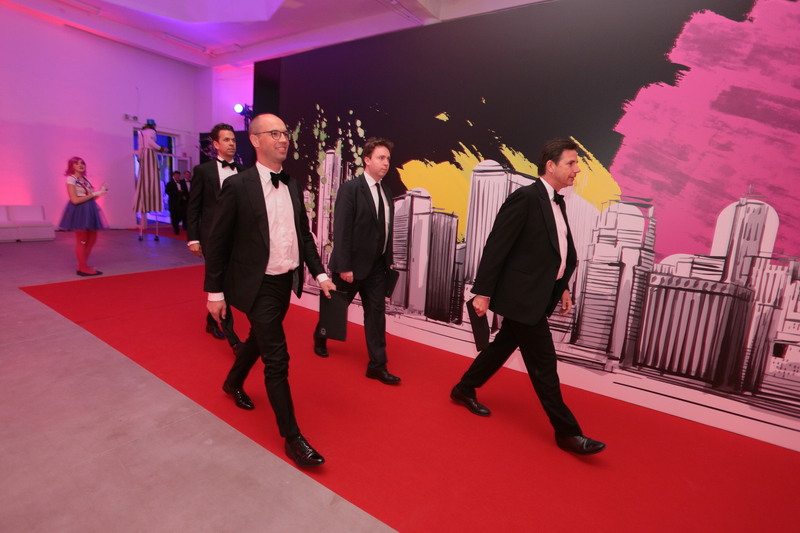 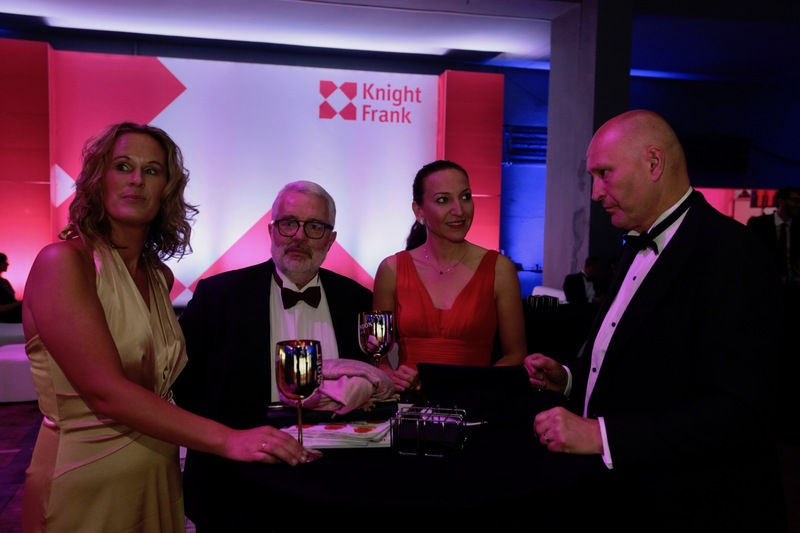 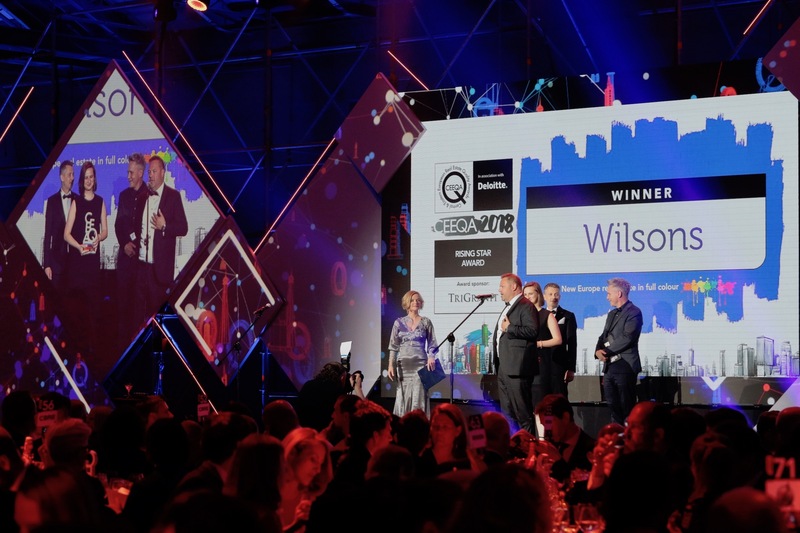 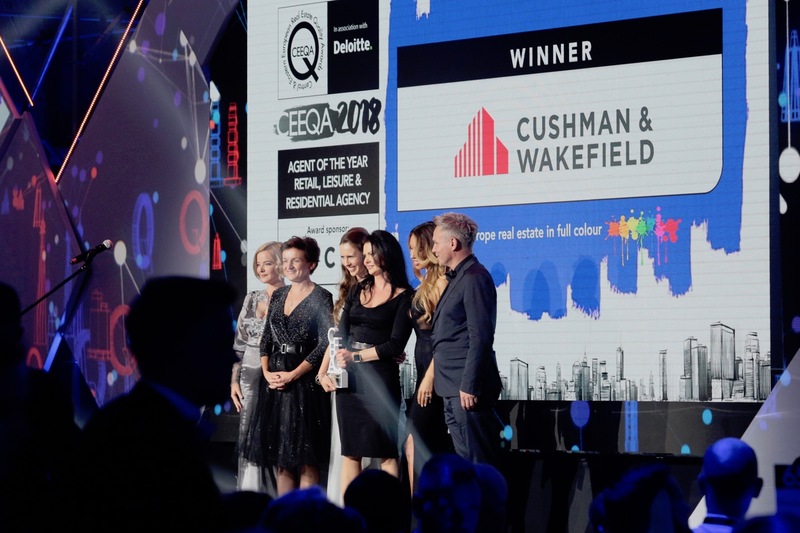 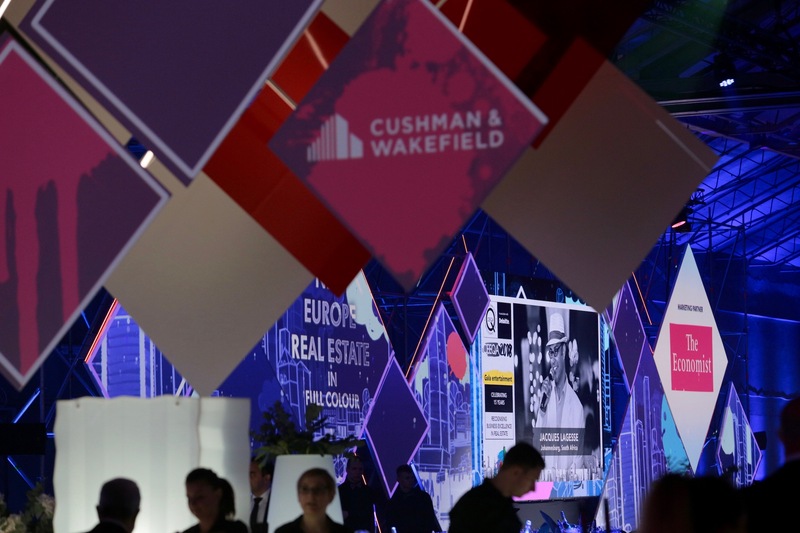 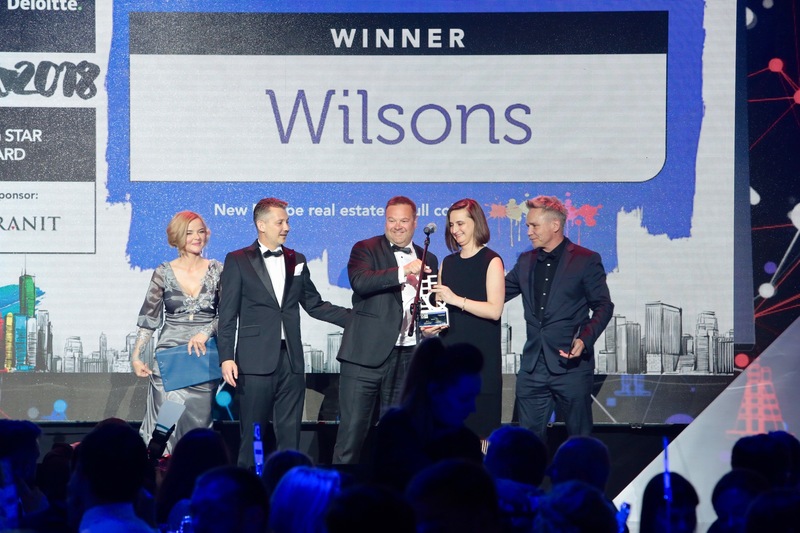 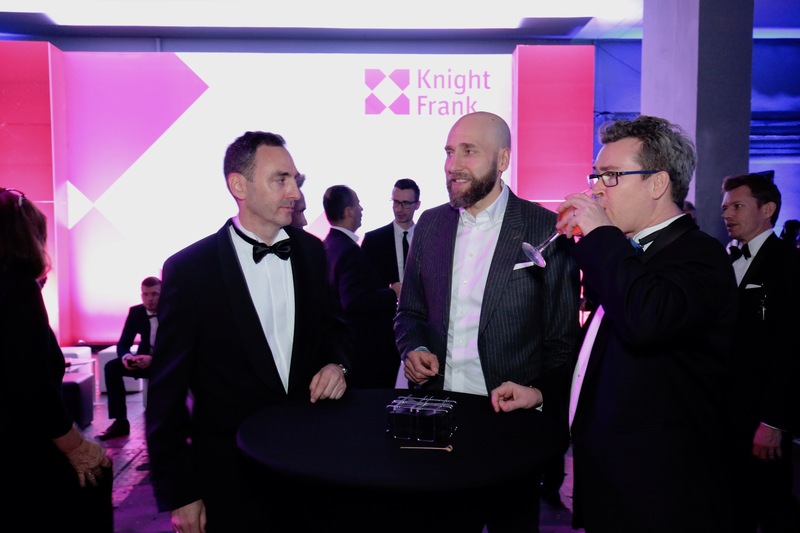 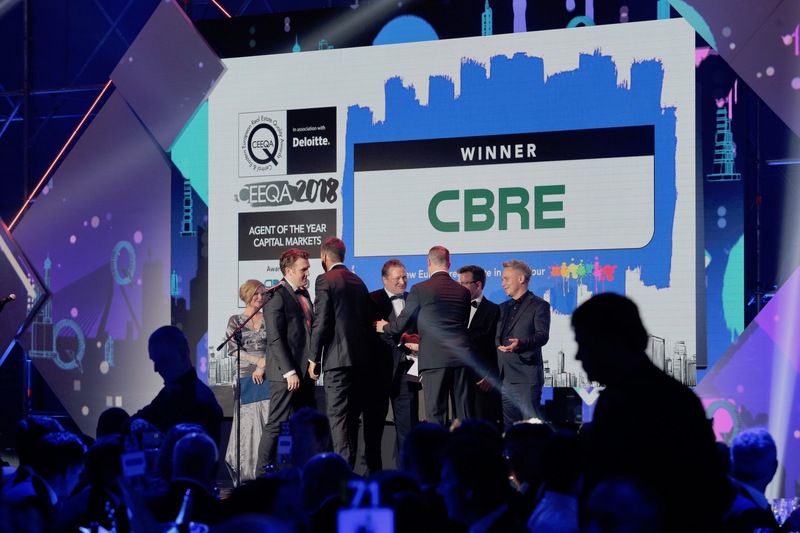 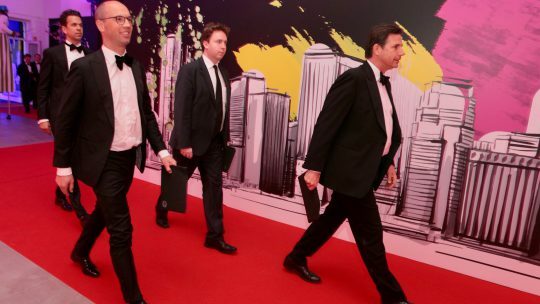 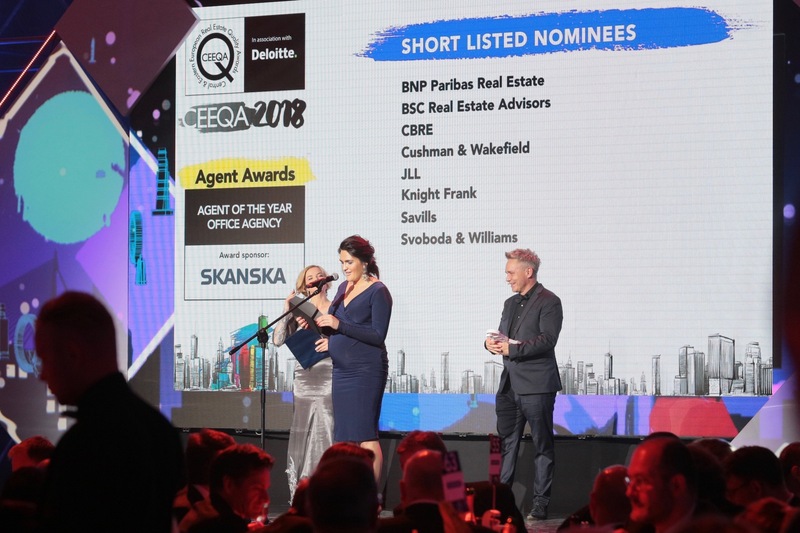 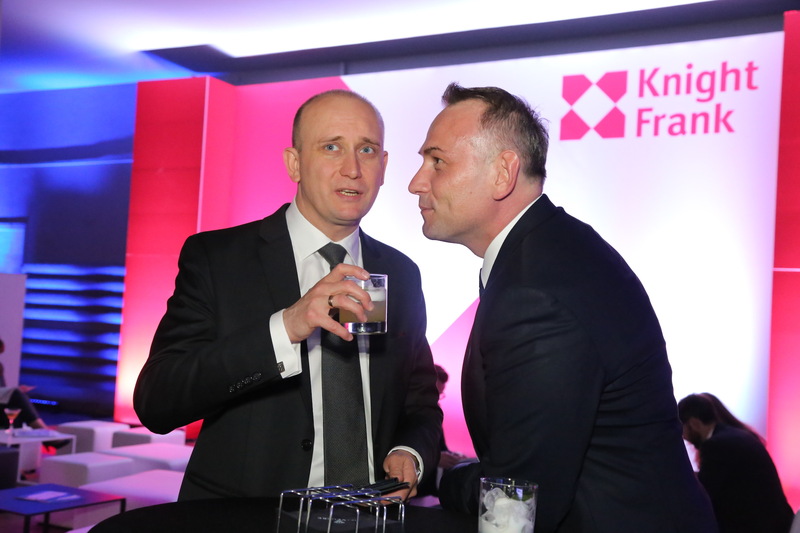 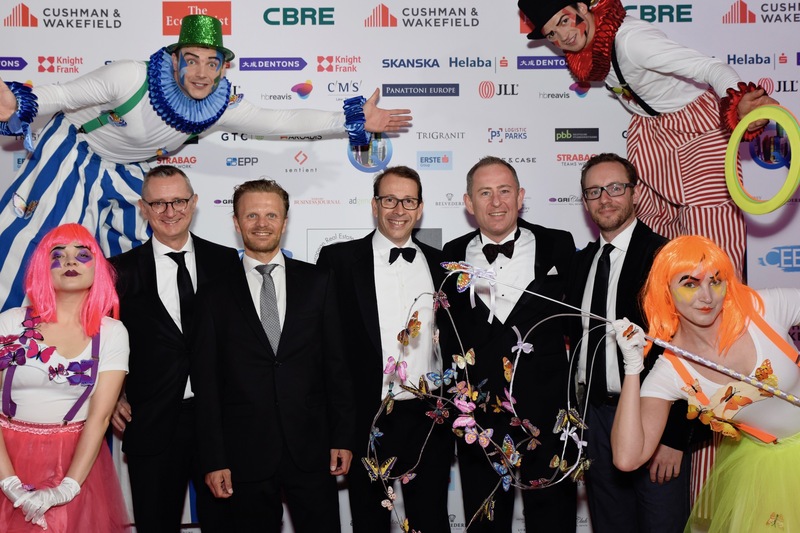 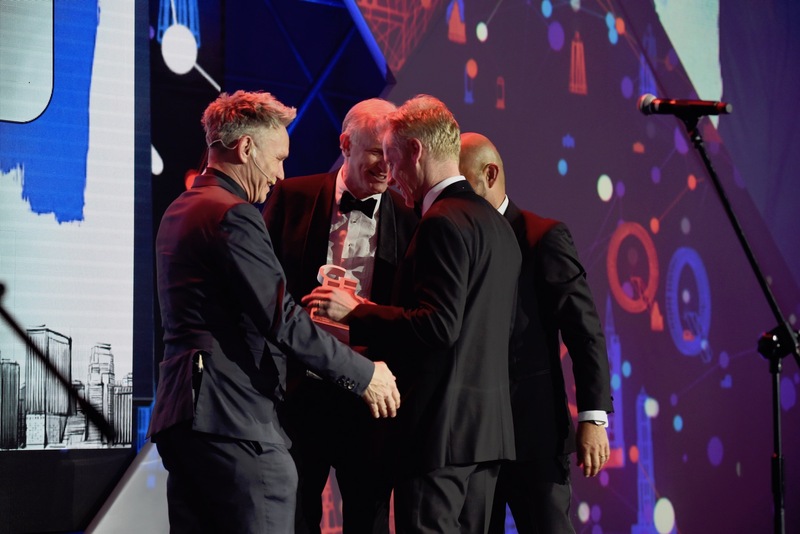 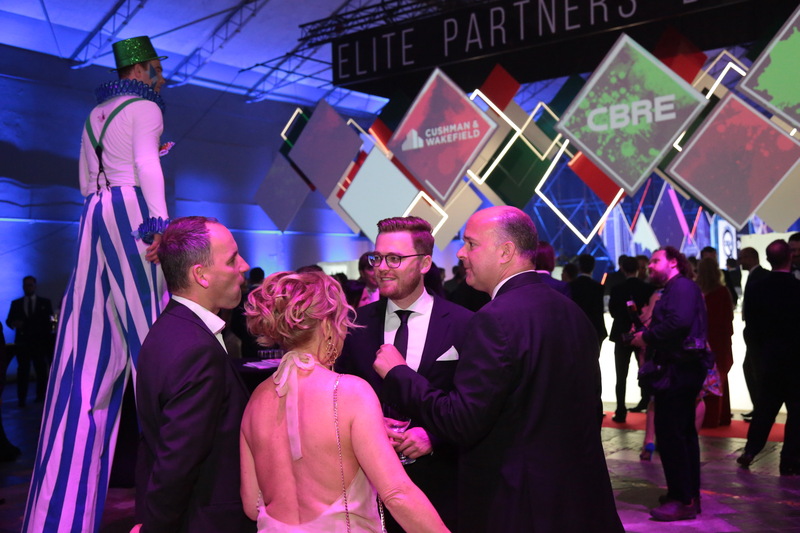 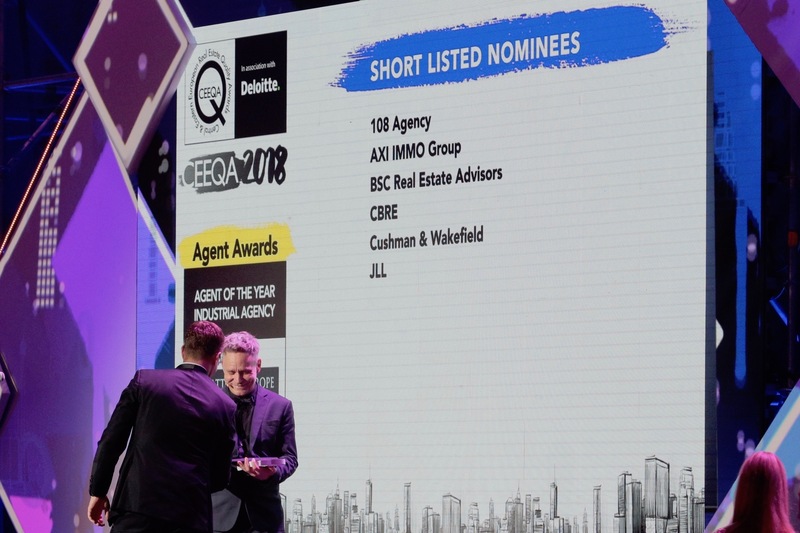 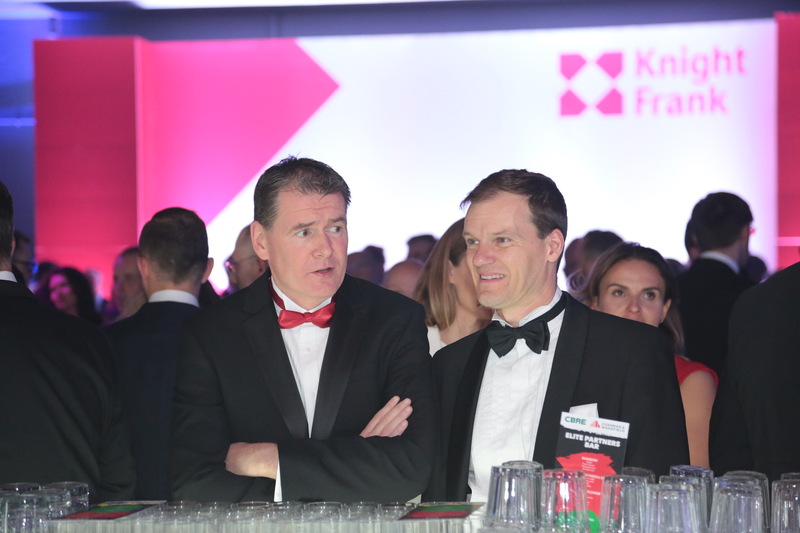 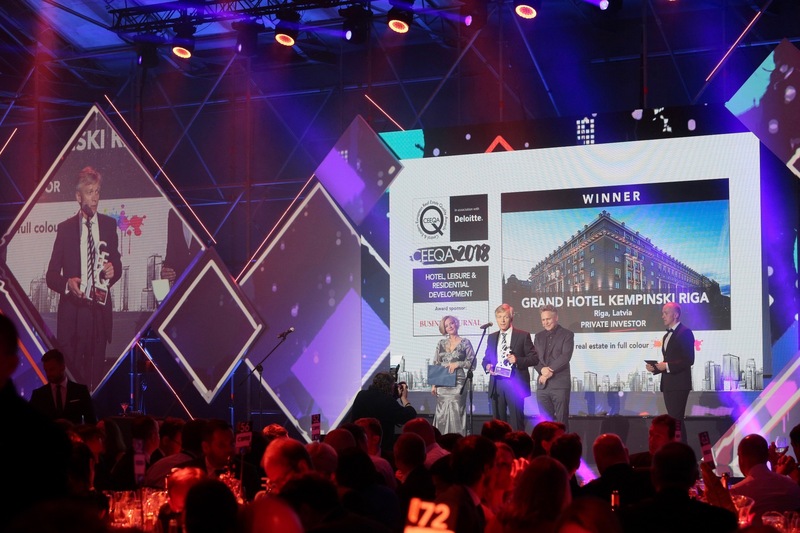 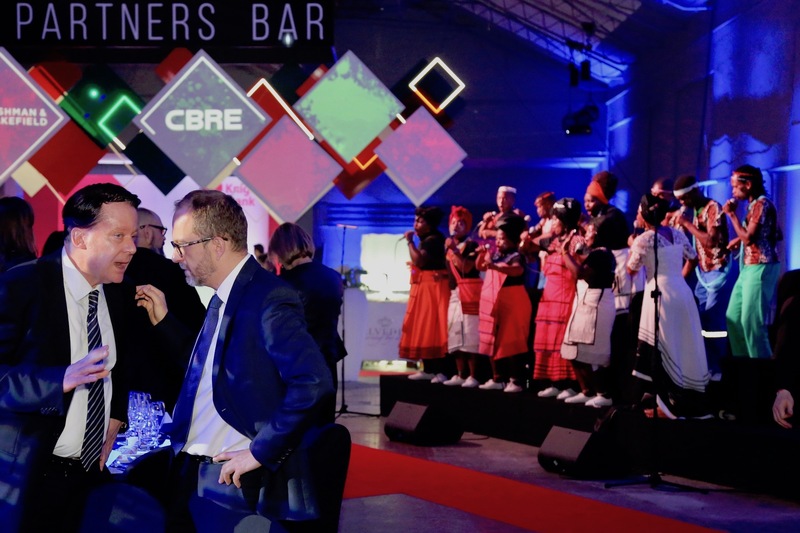 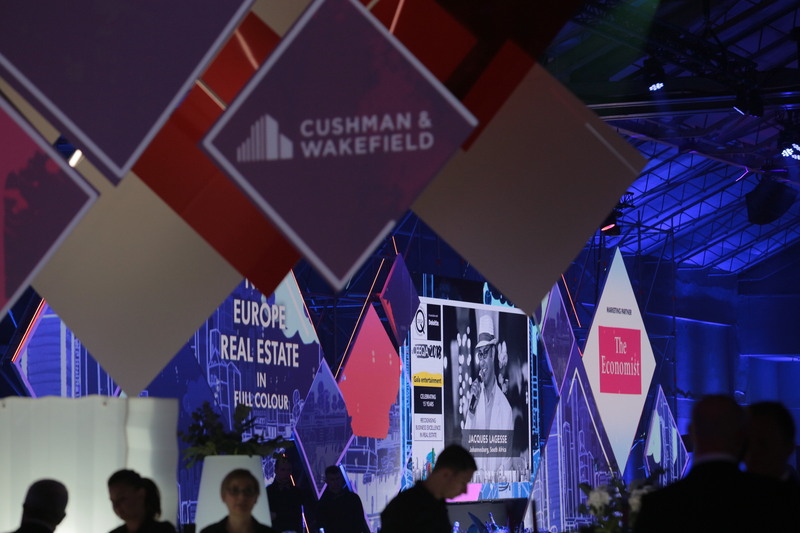 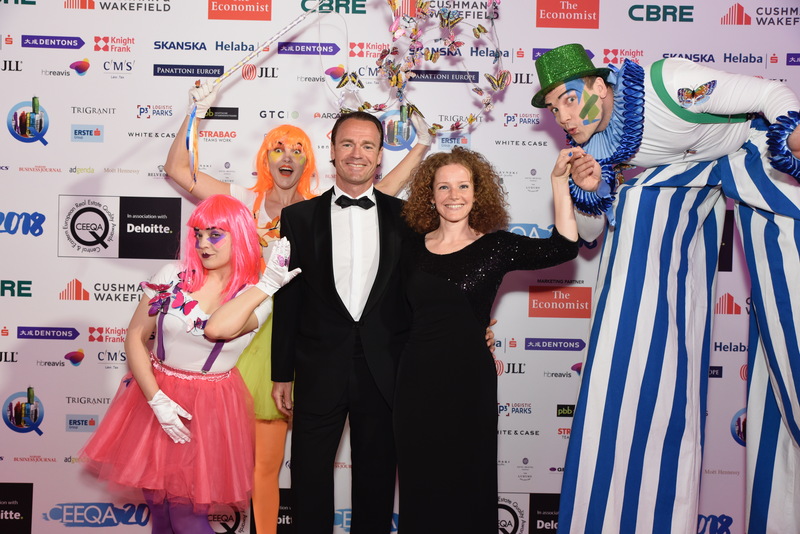 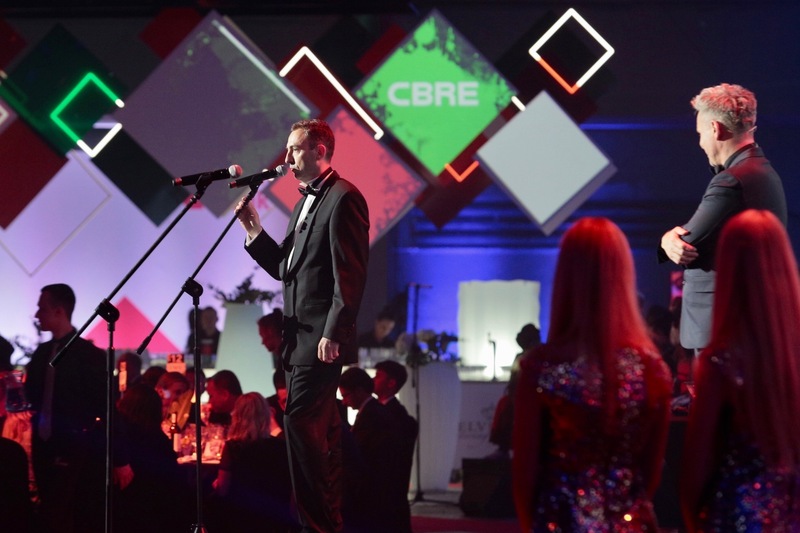 In the other Agents category Cushman & Wakefield retained the Retail Agency for the third successive year, while CBRE were also successful as Property Management Company of the Year in the Company Awards section, a record-equalling four awards in total for advisory companies. 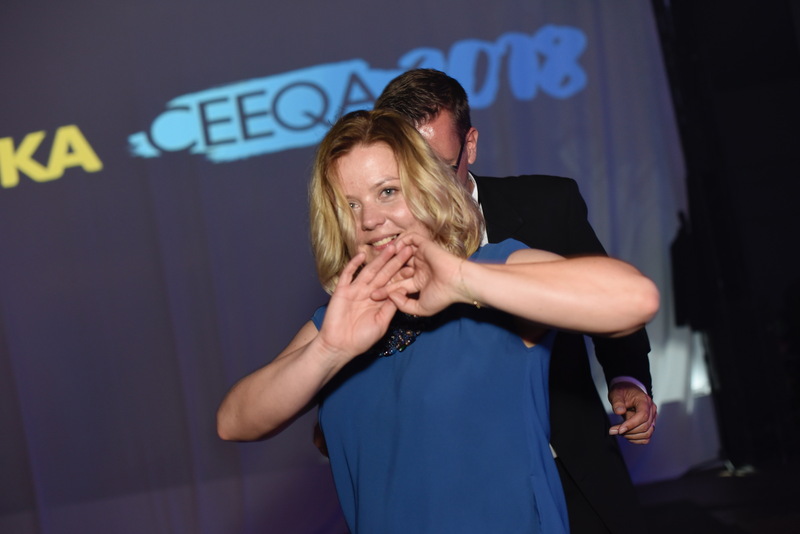 One of the mood stories of the year, treated in depth in the Warsaw Business Special Report and in an advertorial report in The Economist, as well as our final CEEQA 2018 Review, was the duration of the current cycle and the possible causes for the apparent lengthening of the cycle. 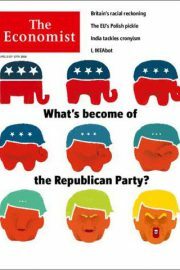 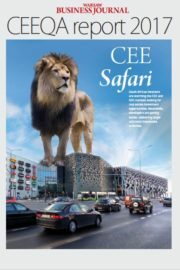 Be sure to read it. 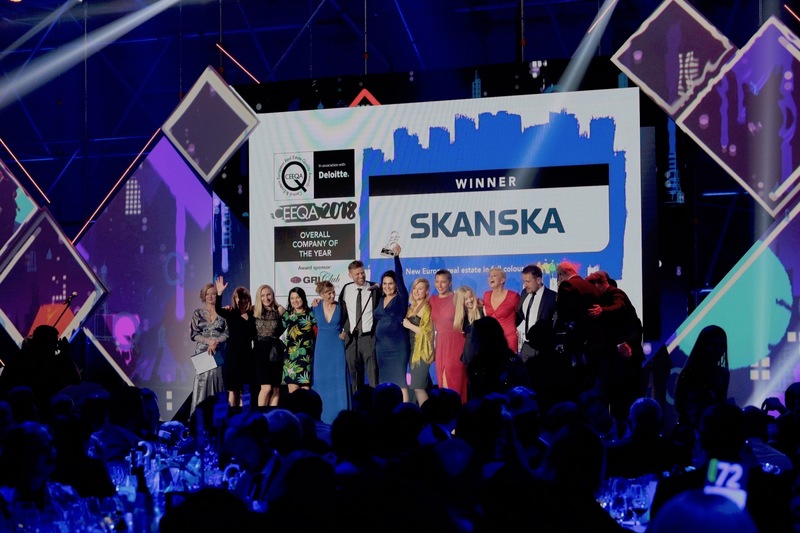 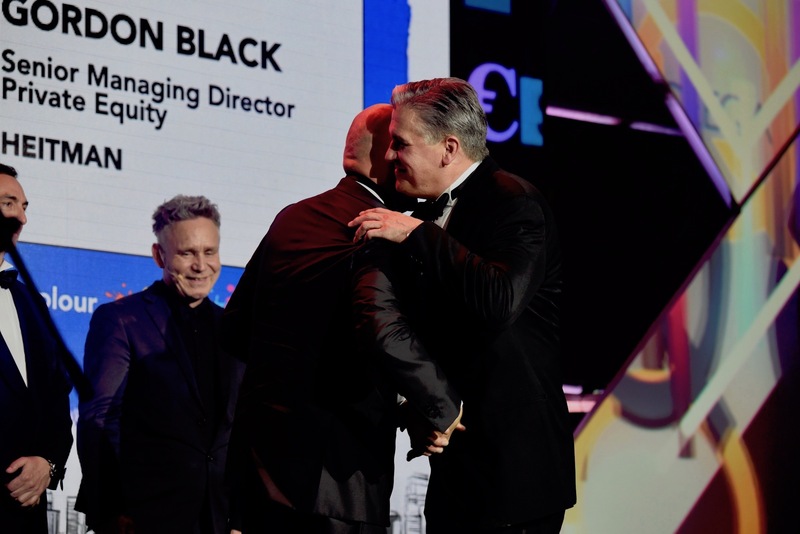 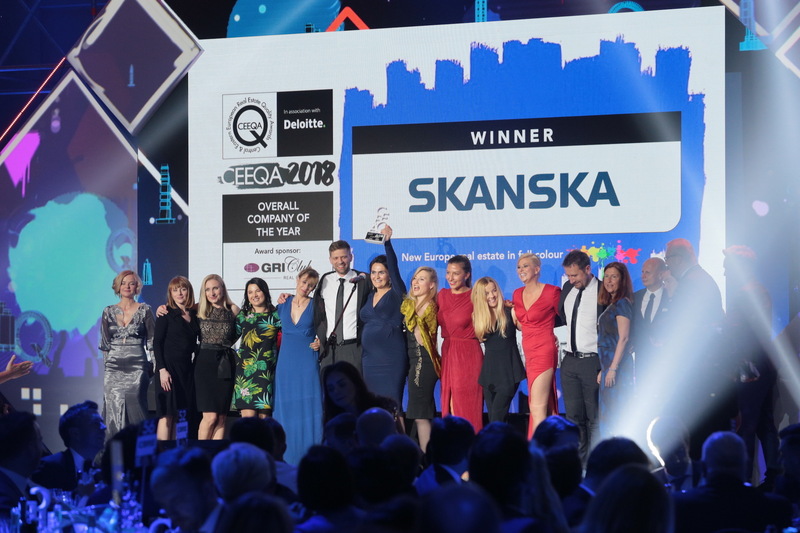 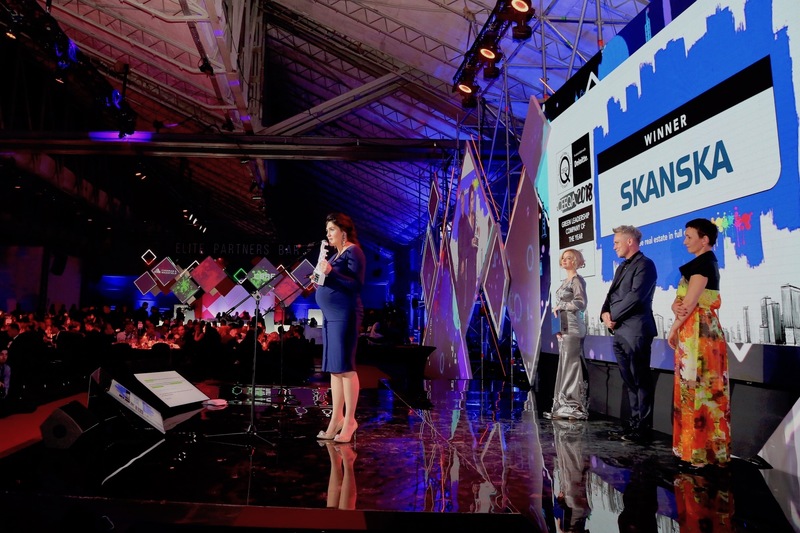 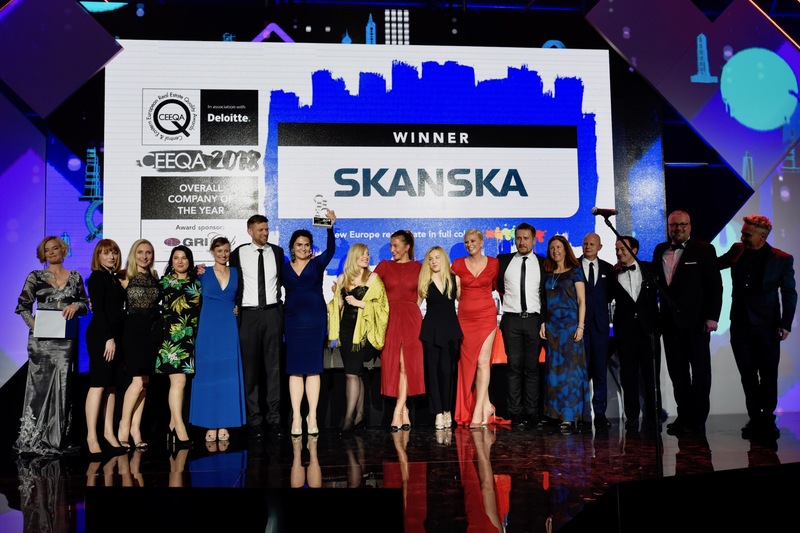 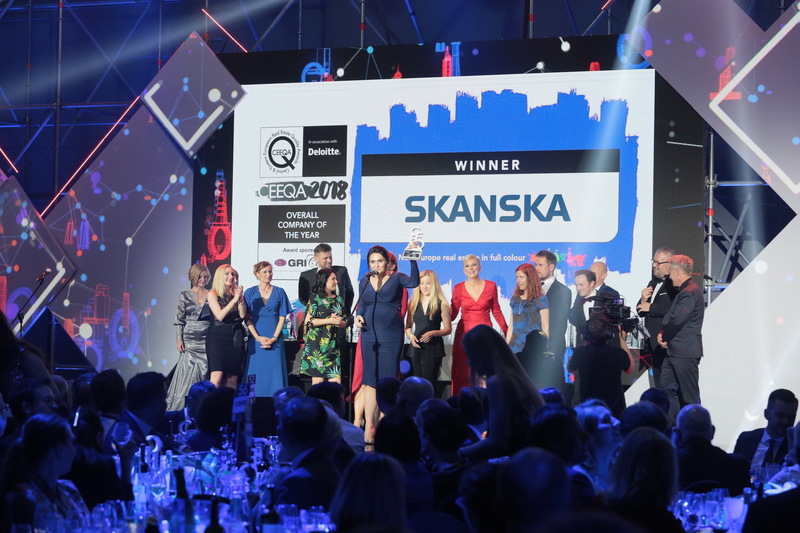 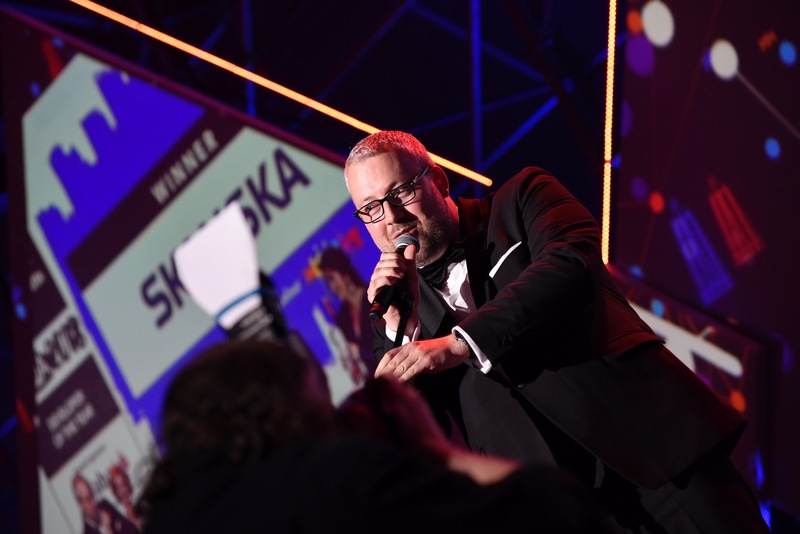 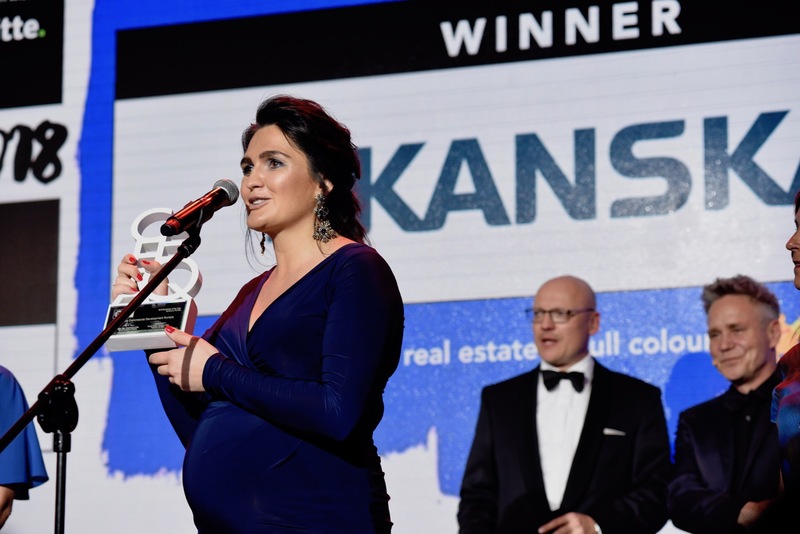 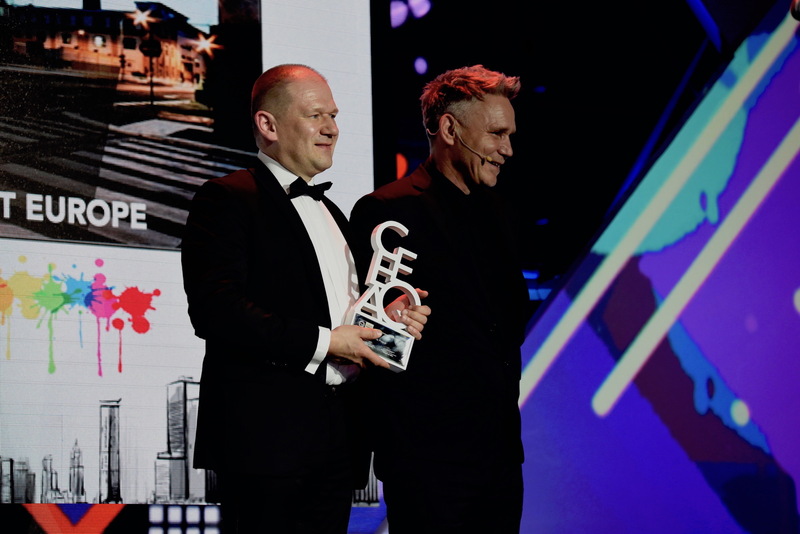 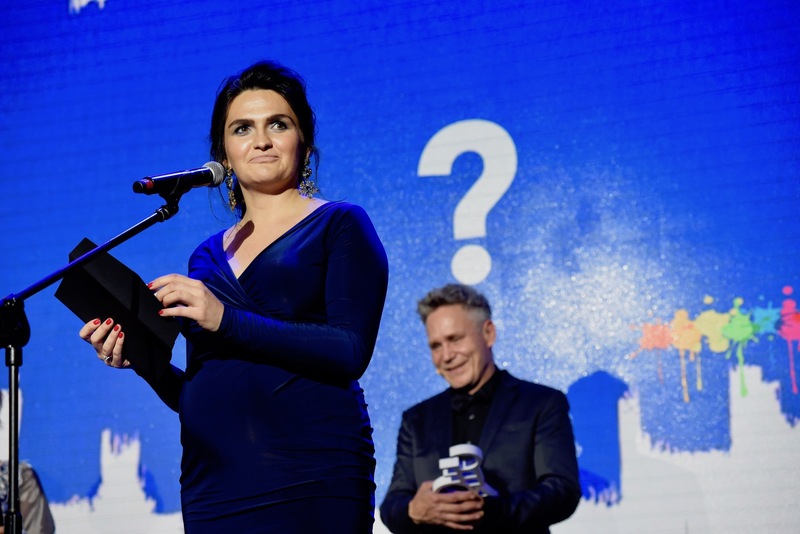 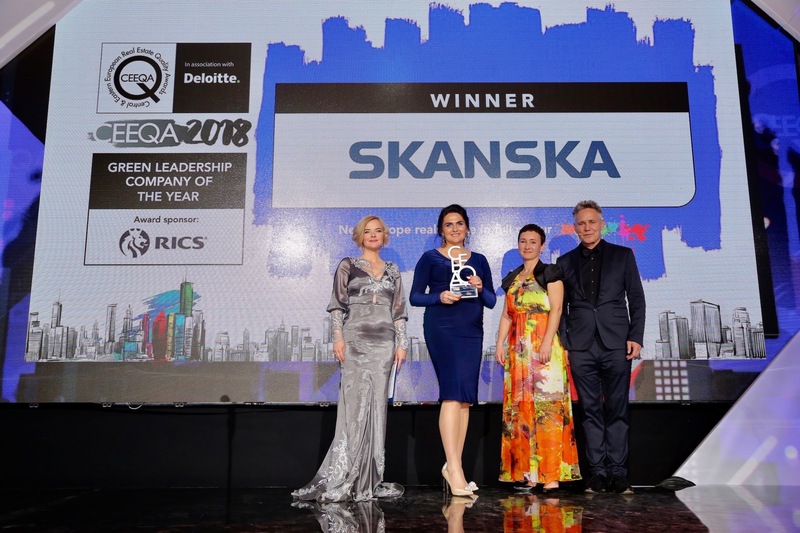 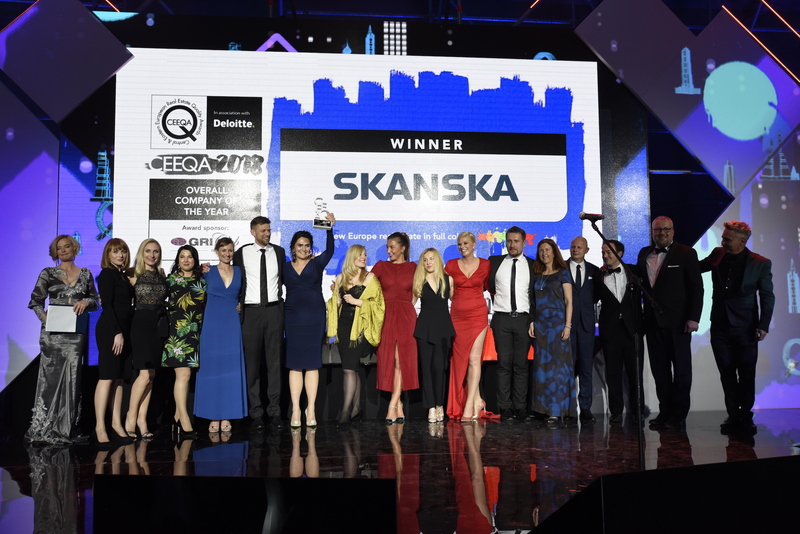 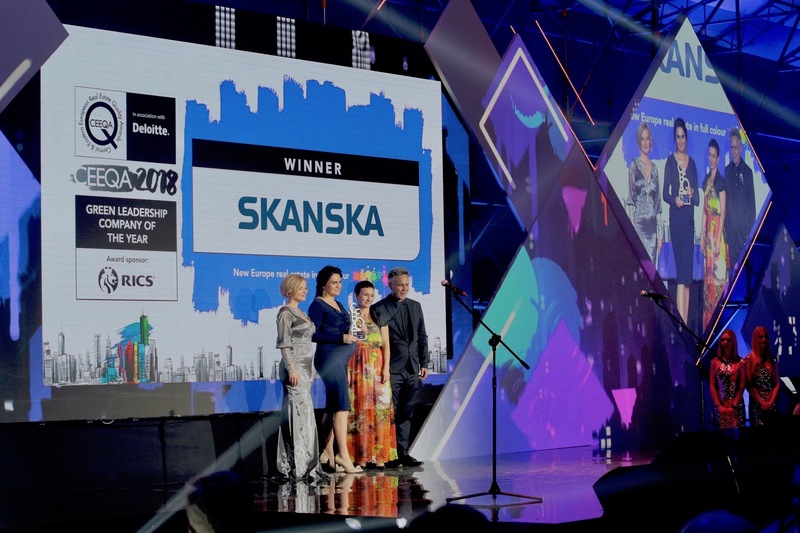 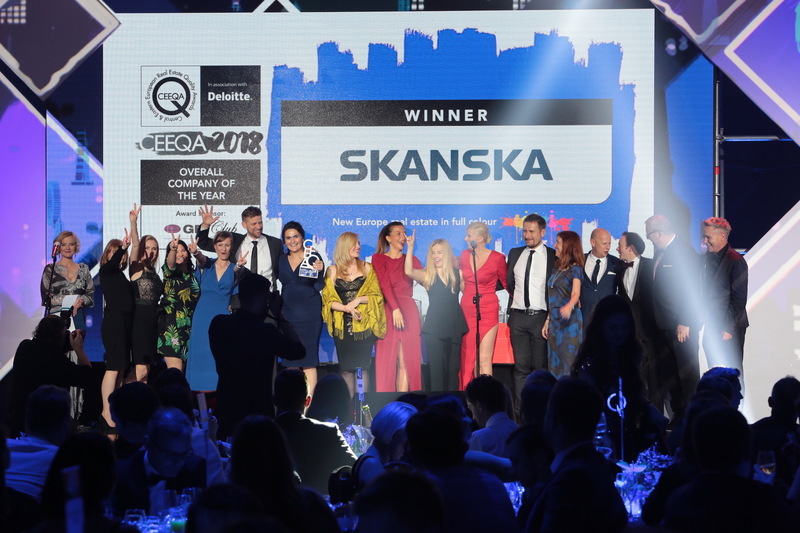 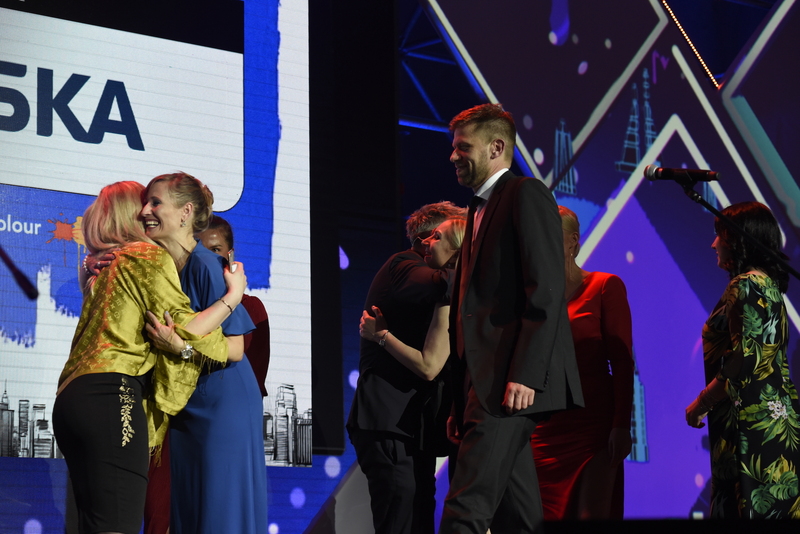 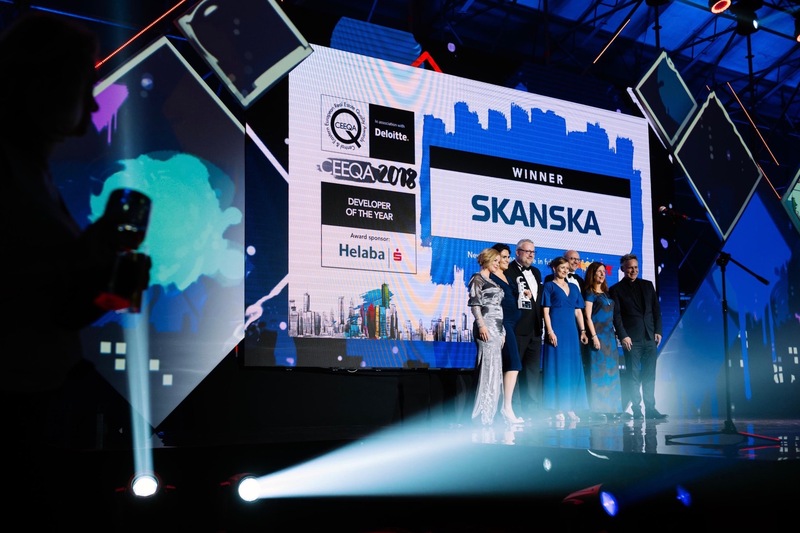 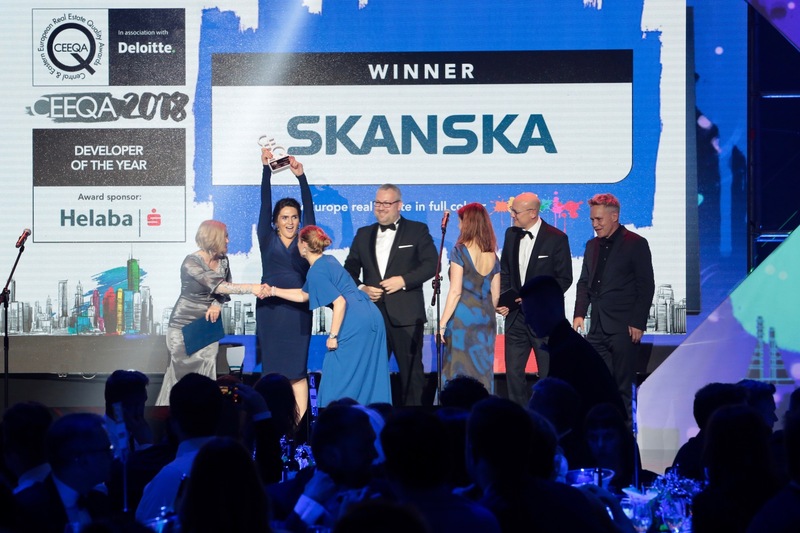 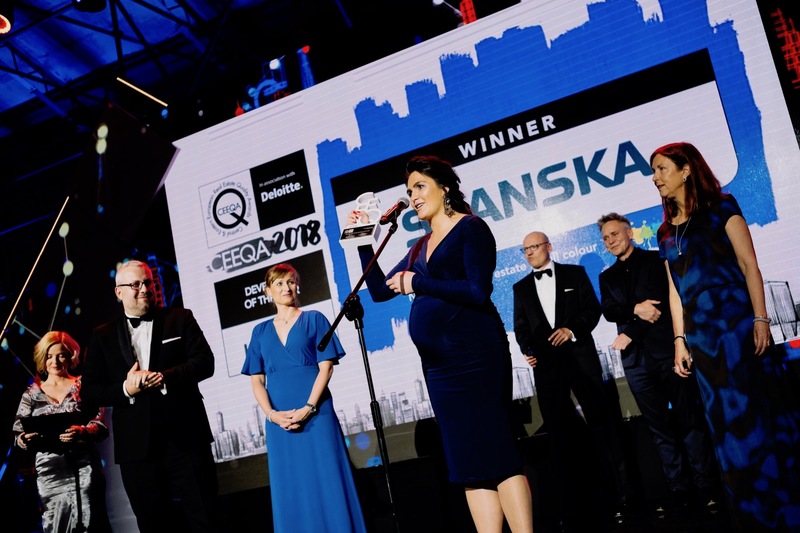 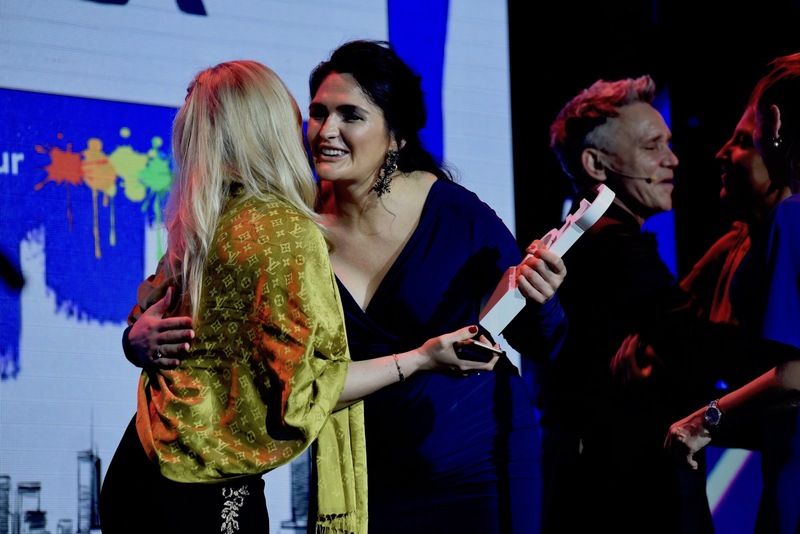 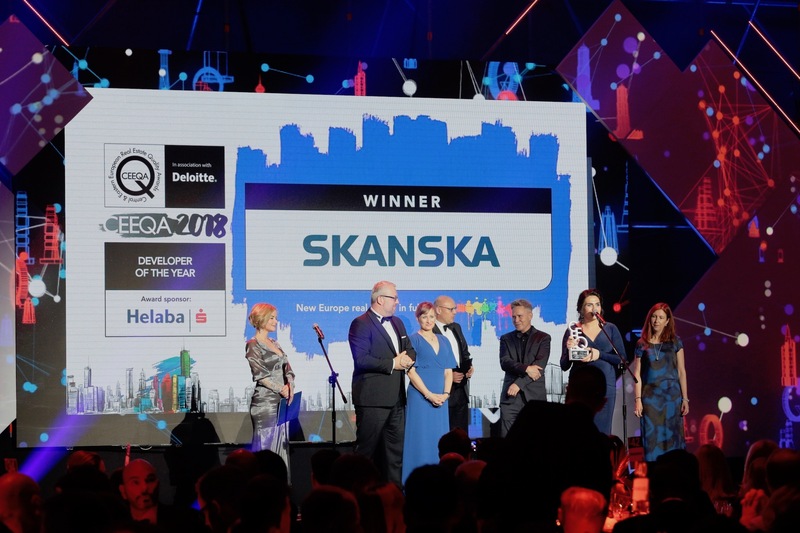 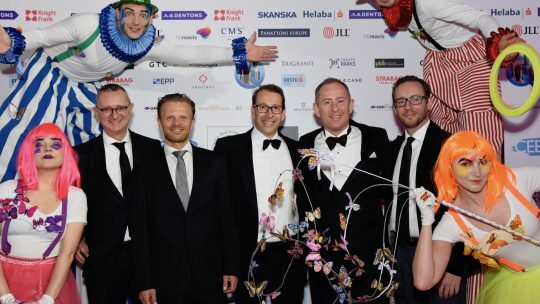 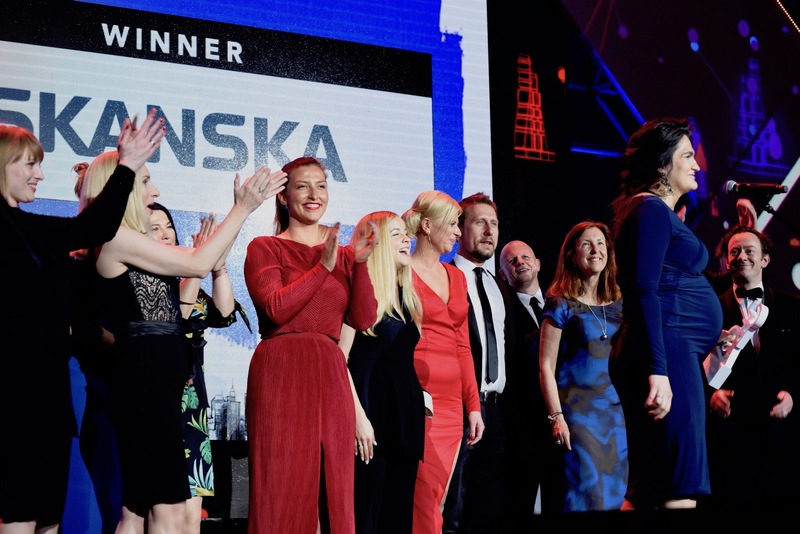 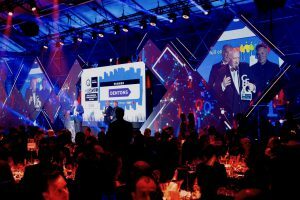 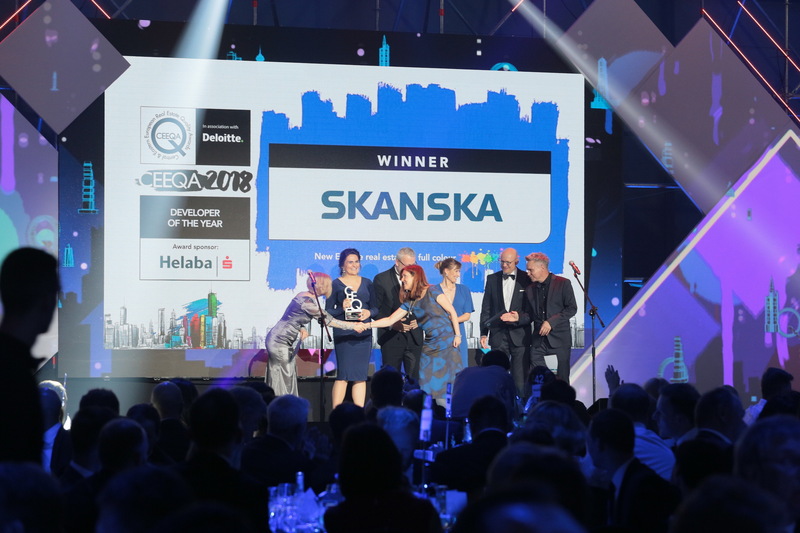 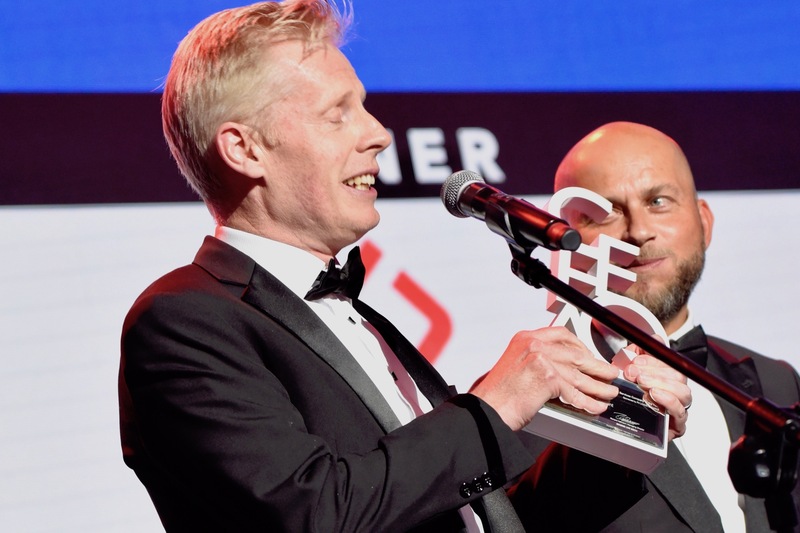 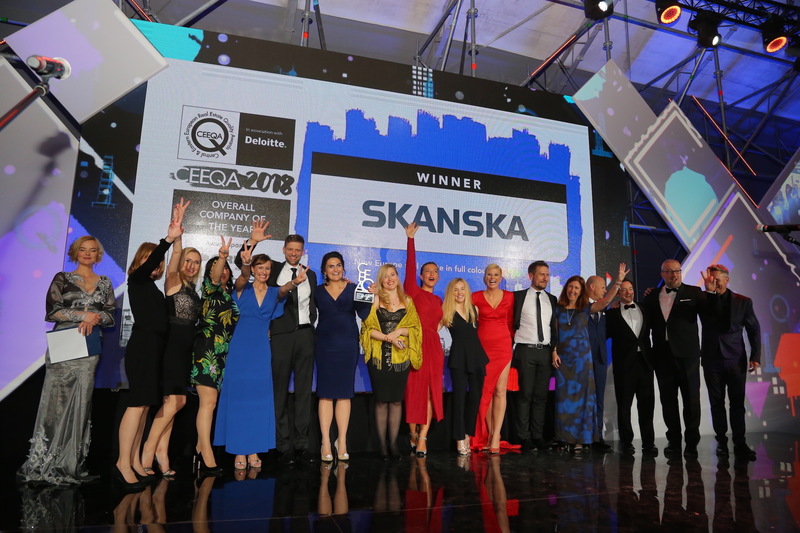 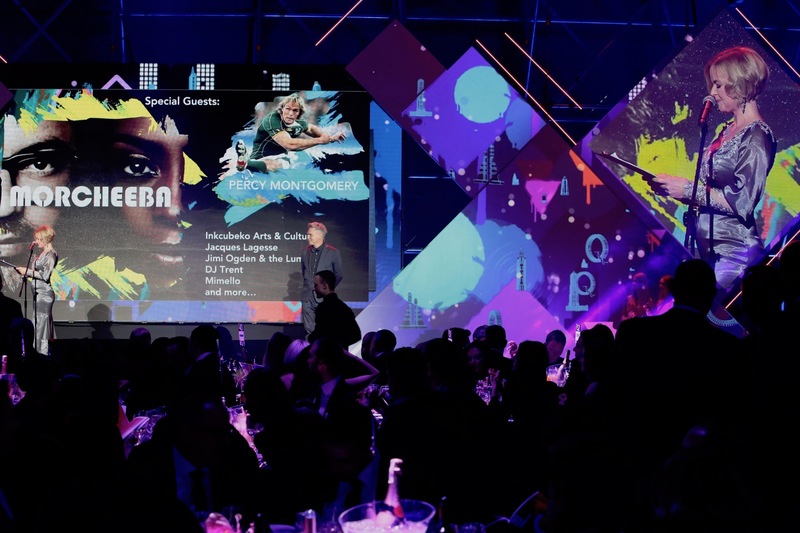 But it was the development arm of Swedish based conglomerate, Skanska Commercial Development Europe that shone brightest, lifting five titles on a night to equal their own record set in 2014. Having dominated the Office Development category with three short listed projects, of which their ambitious and innovative Five office project in Prague was victorious and was also named Green Leadership Building of the Year, the company made it another one-two in the green building segment with the Green Leadership Company Award as well – an award it has never not won since the inception of CEEQA’s awards for green building innovation in 2008. 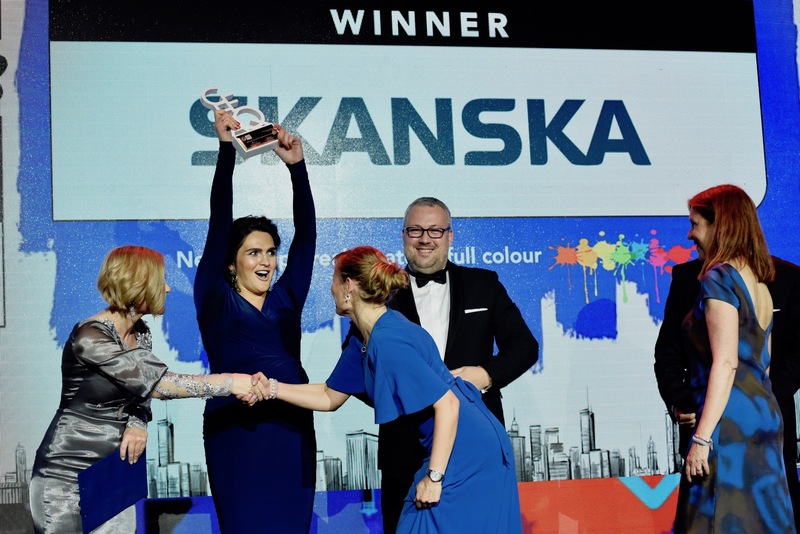 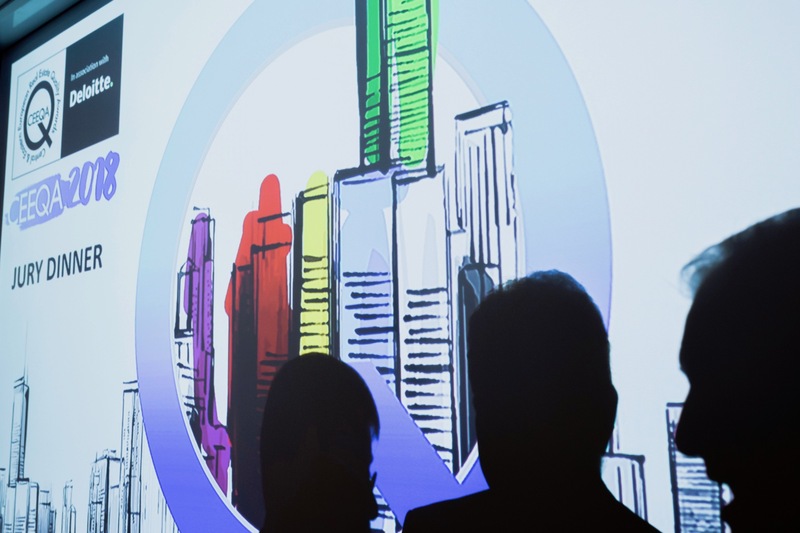 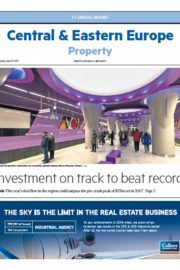 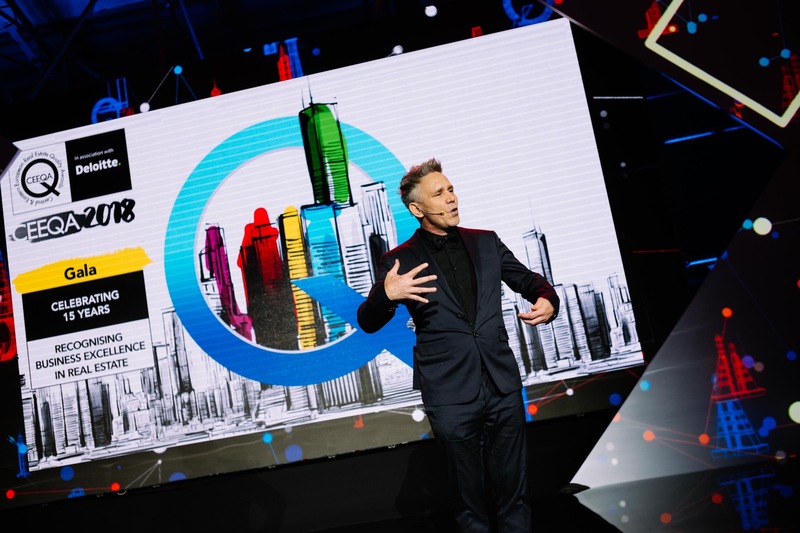 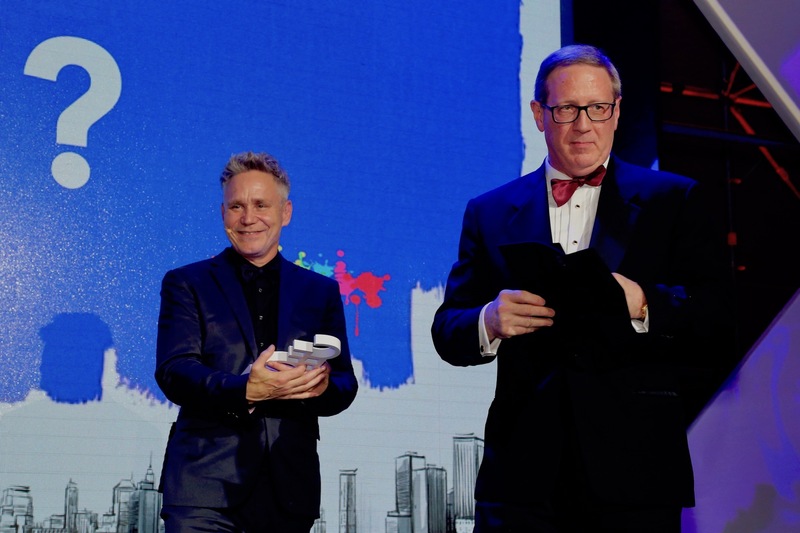 Skanska’s sustained monopo0ly in the green building segment over the past decade is becoming a thing of beauty and the stuff of sector legend, the company also picking up the Developer of the Year award, naturally. 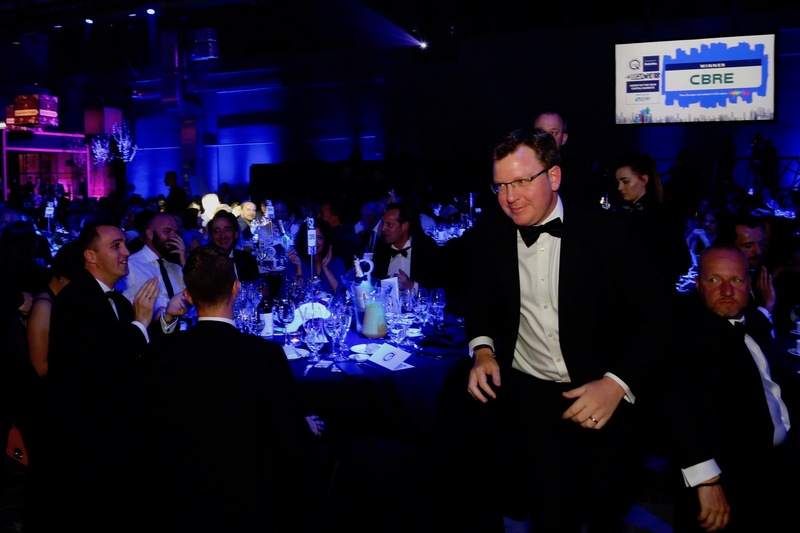 And eventually sashaying to a seemingly inevitable victory in the Overall Company of the Year award voted by nearly 900 guests on the night. 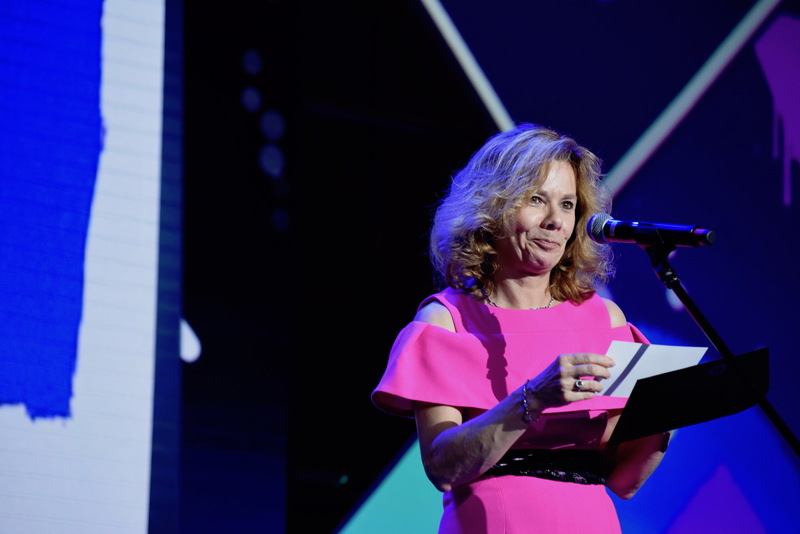 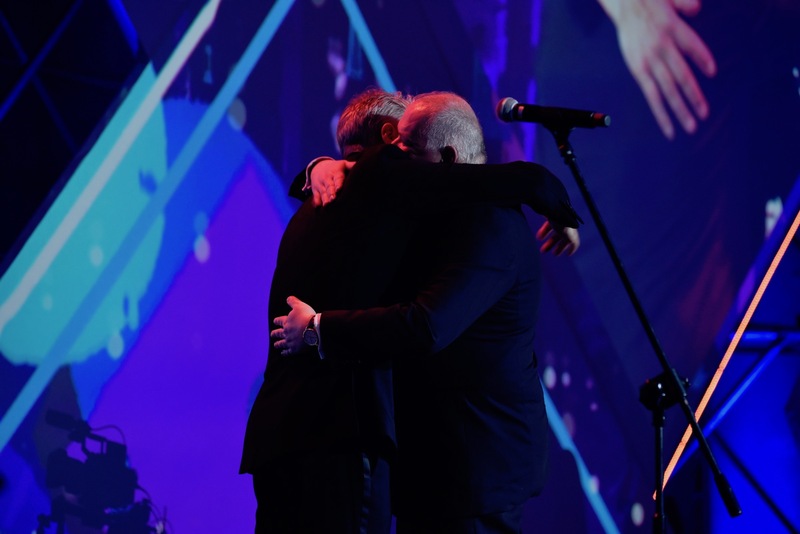 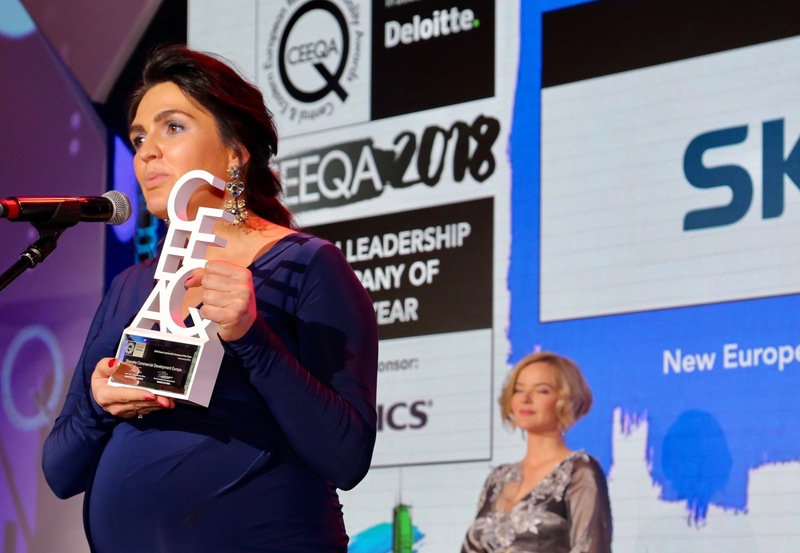 The only surprise was that the company’s leaders in the region didn’t receive more individual recognition for their outstanding work in recent years, their day will surely come. 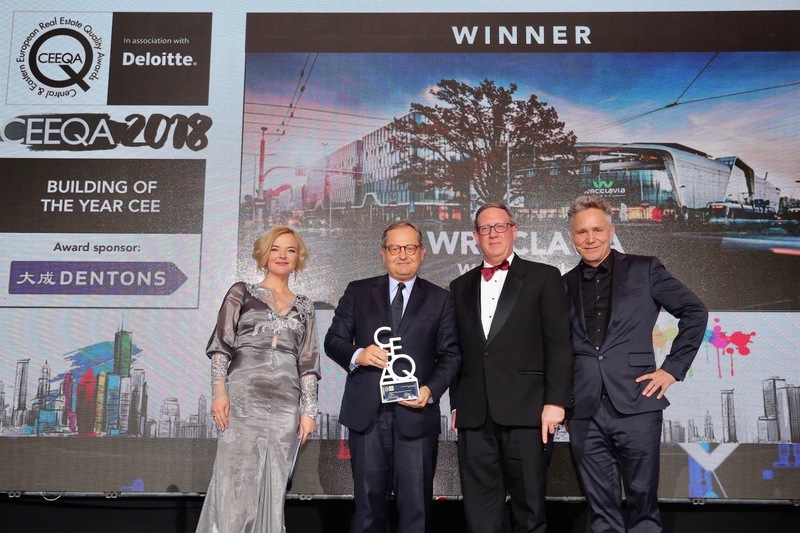 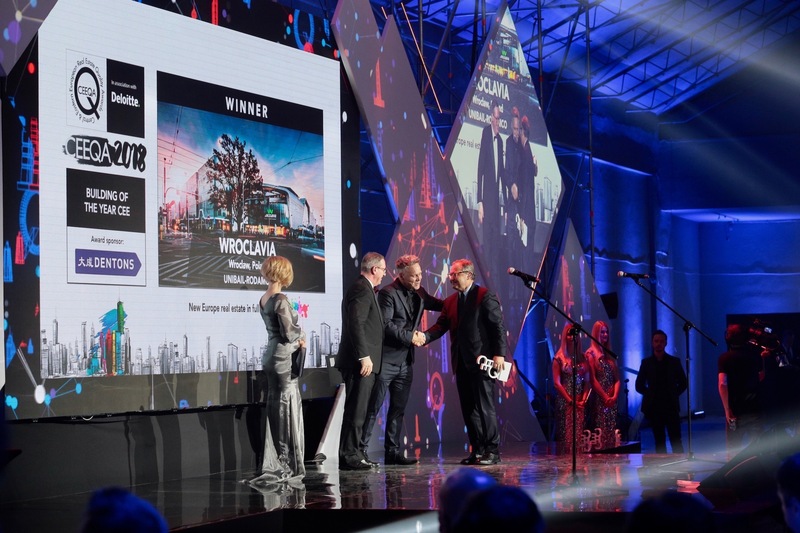 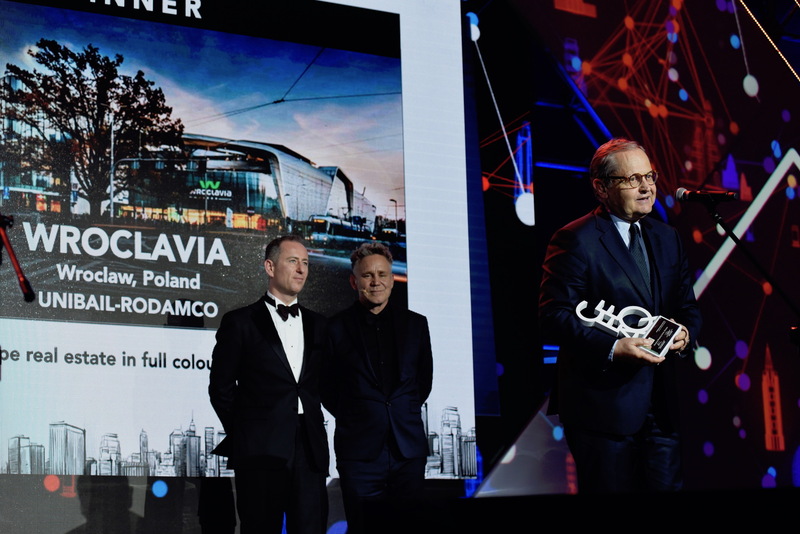 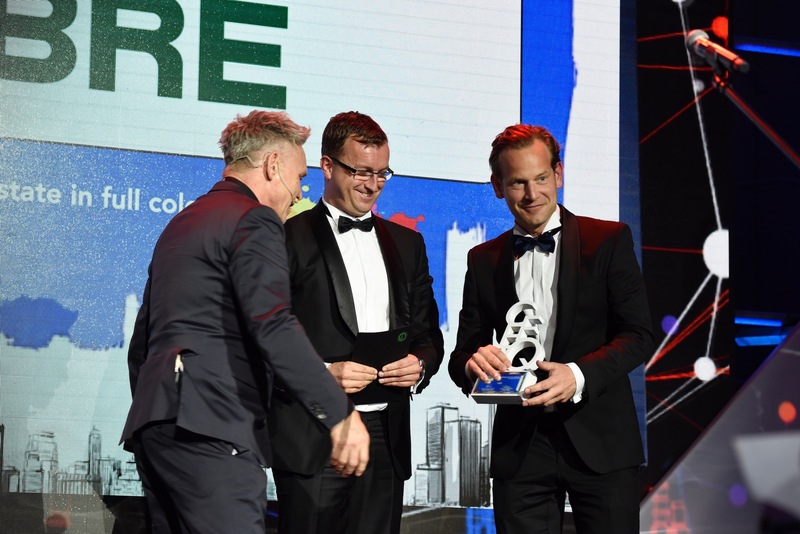 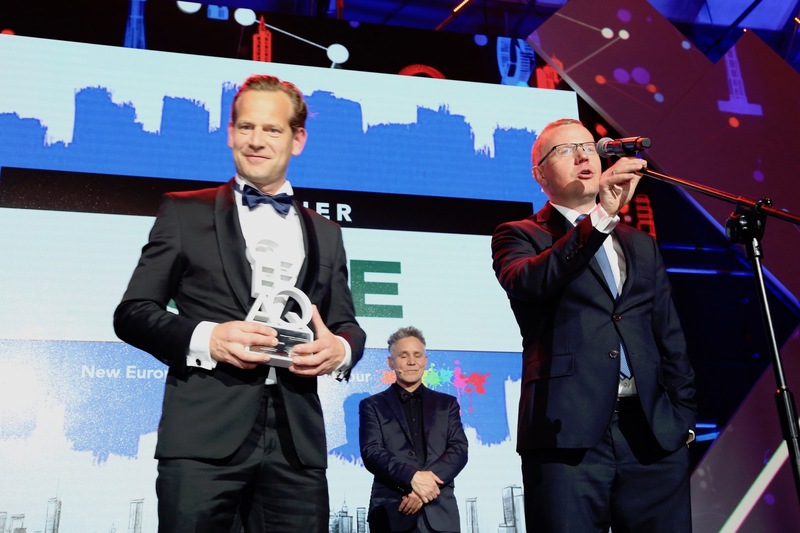 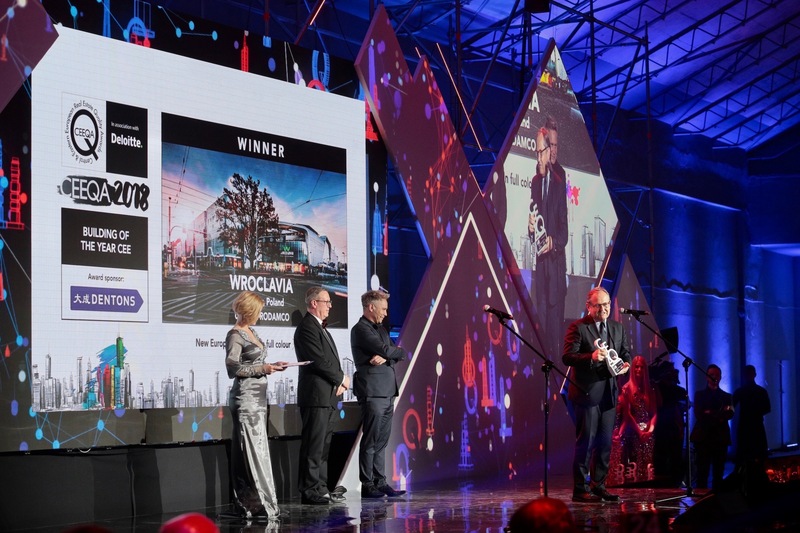 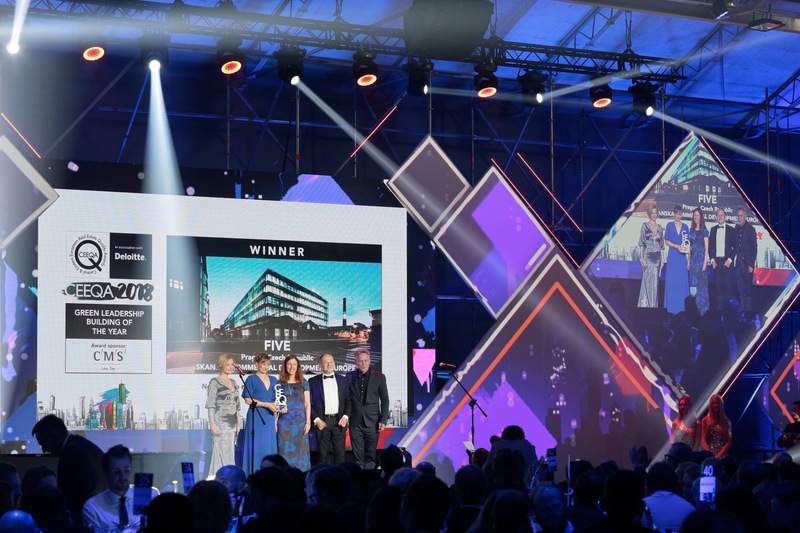 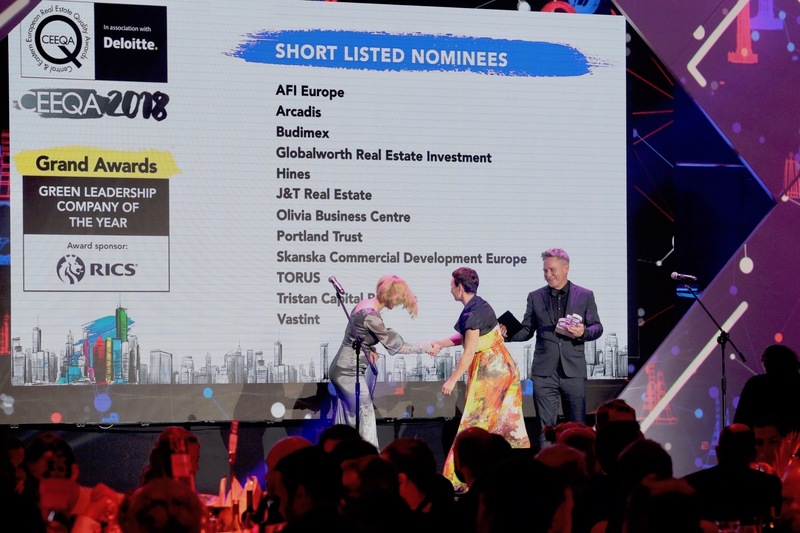 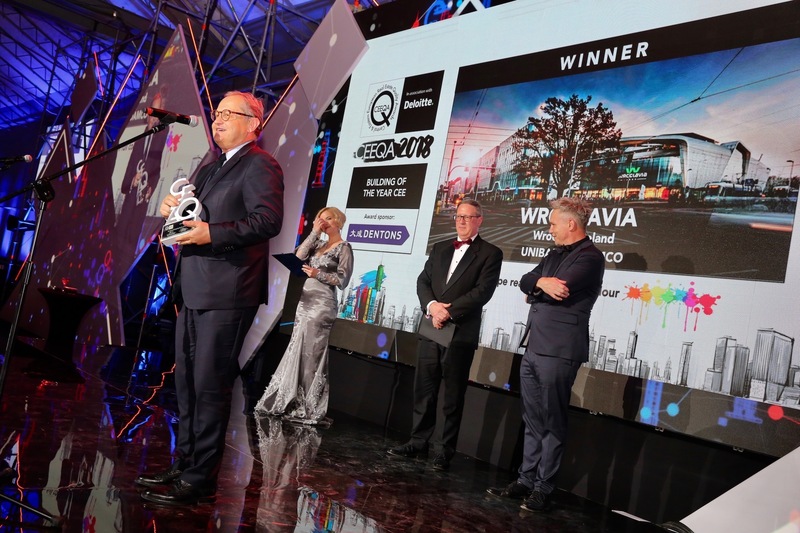 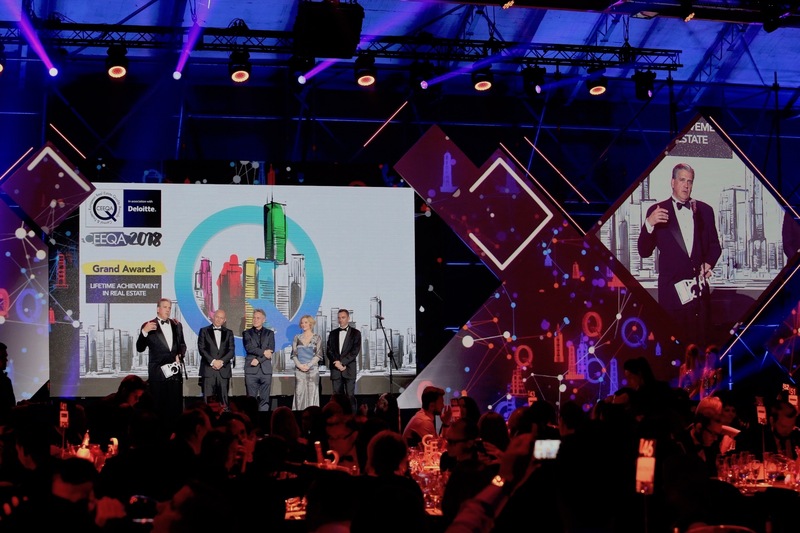 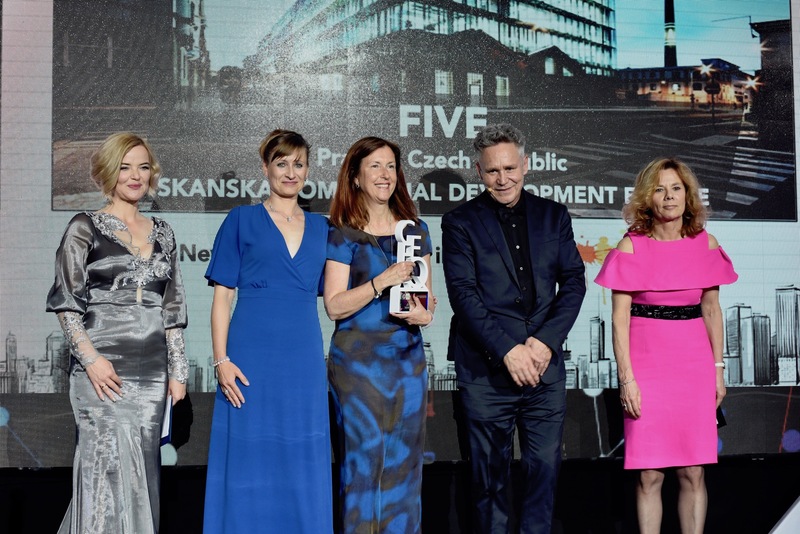 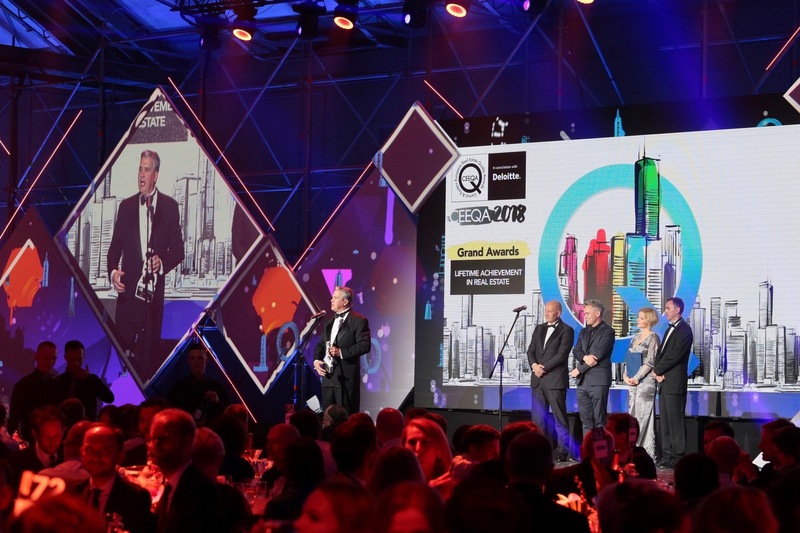 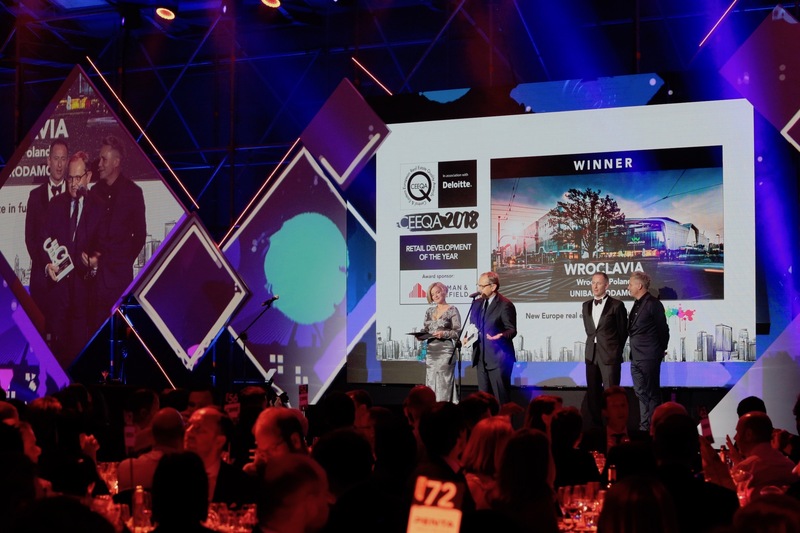 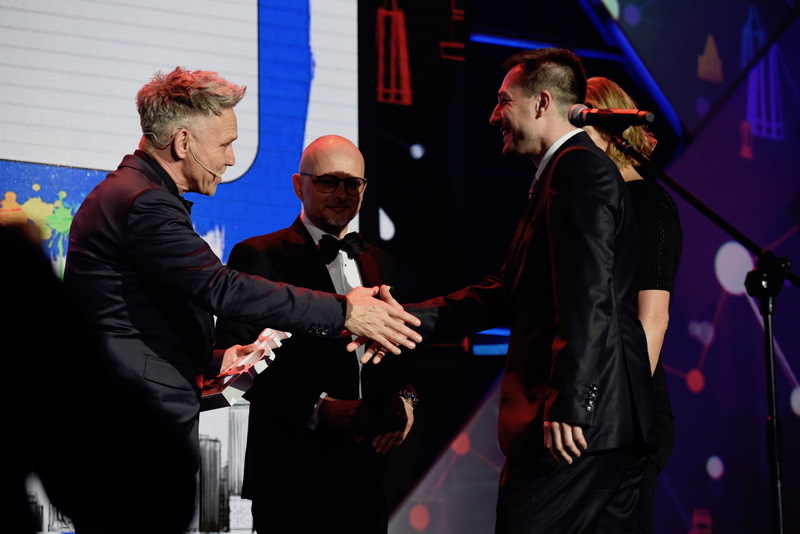 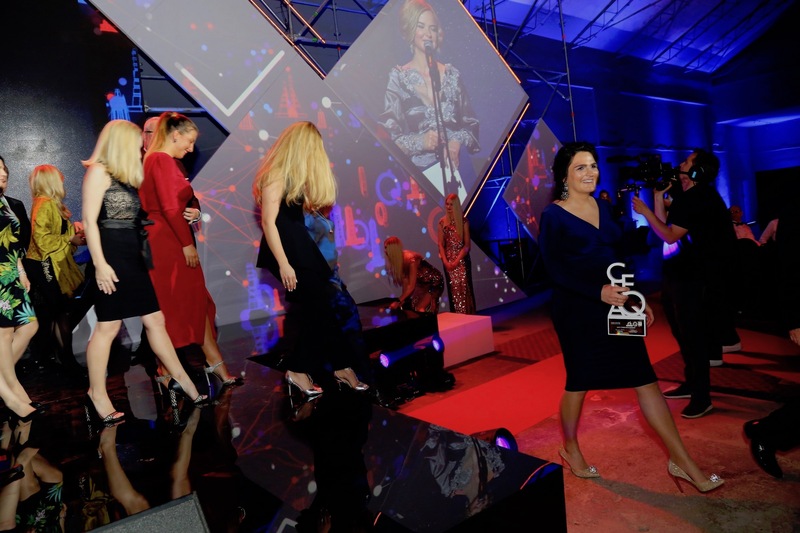 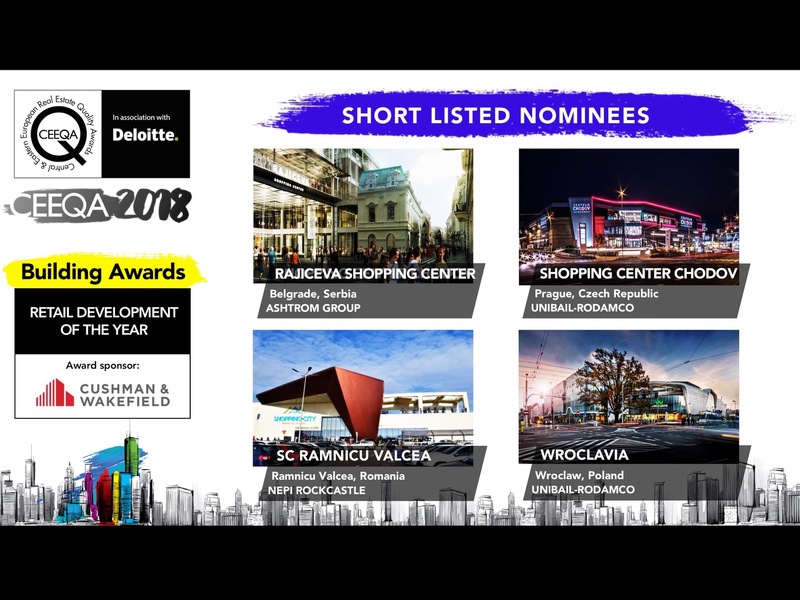 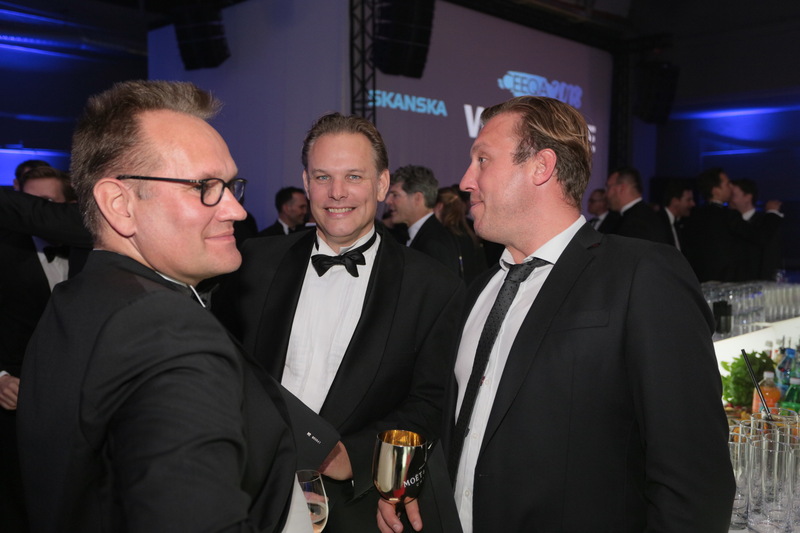 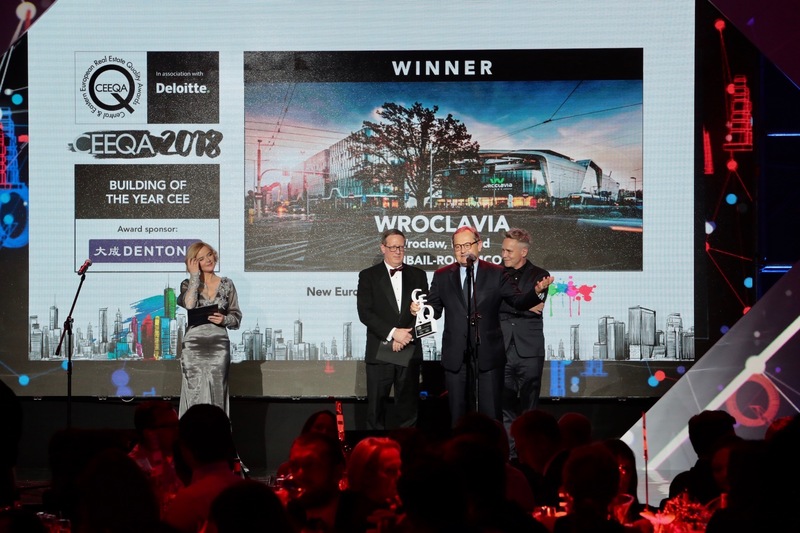 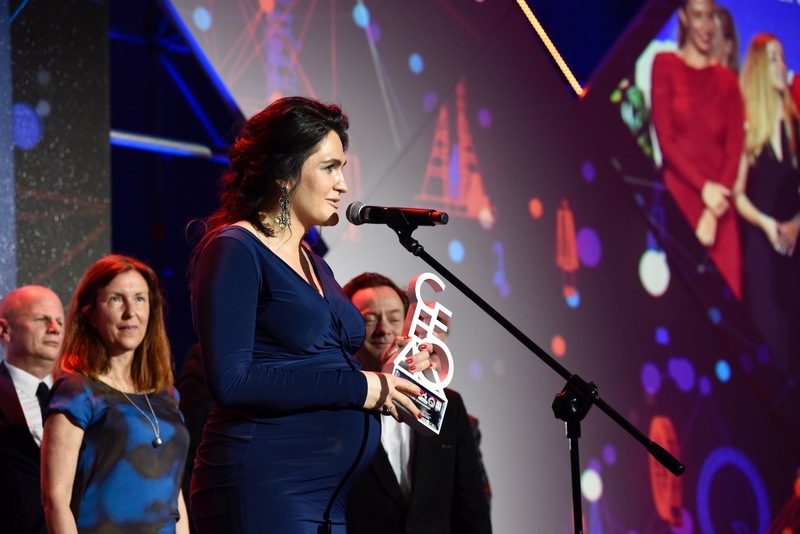 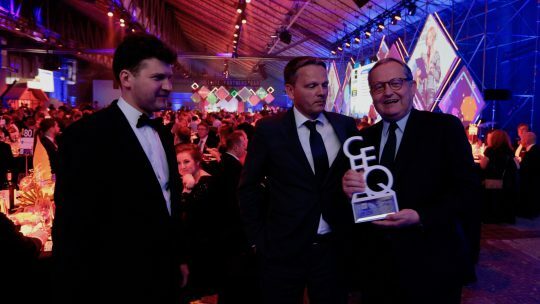 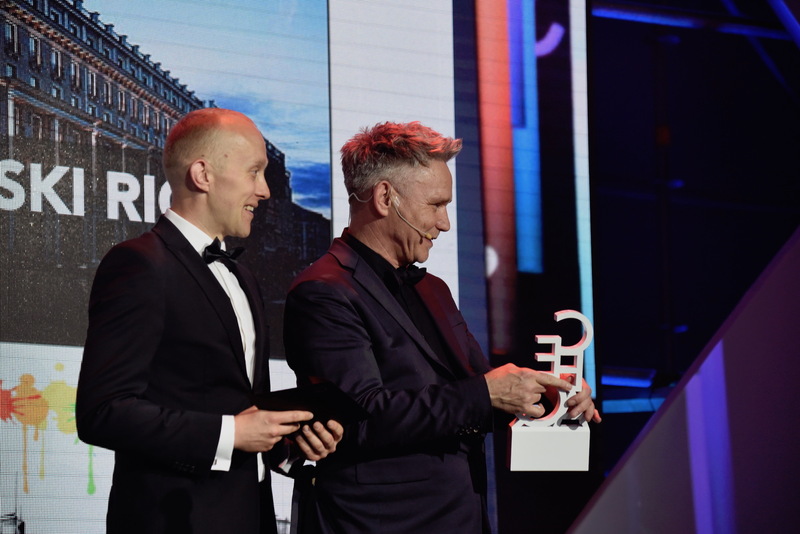 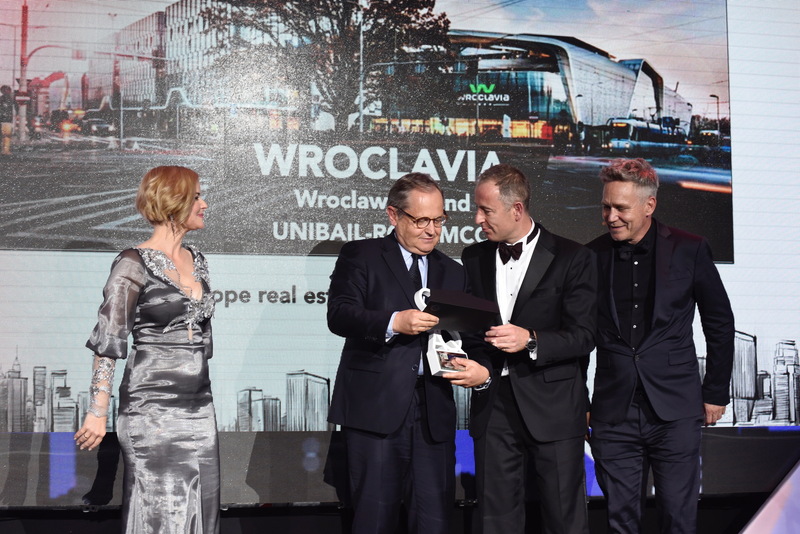 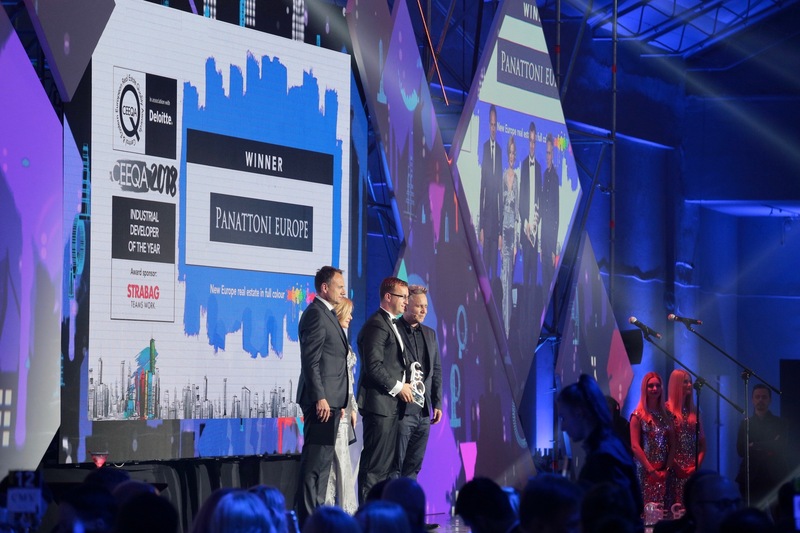 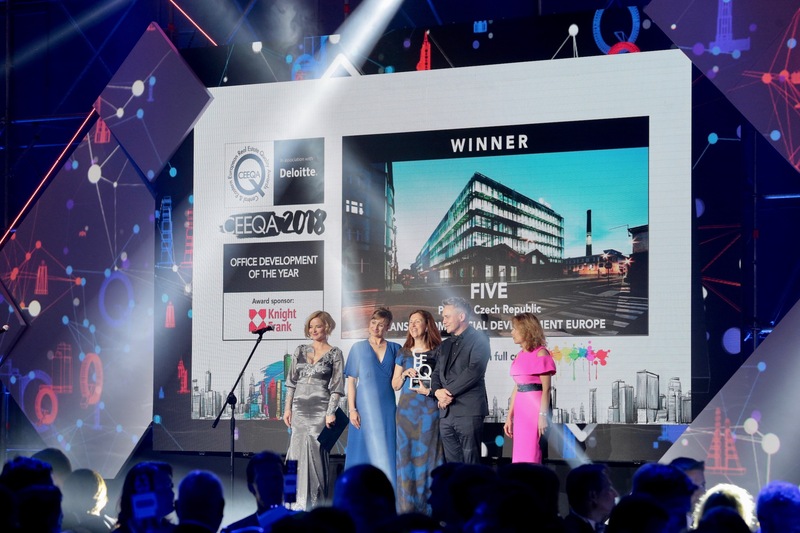 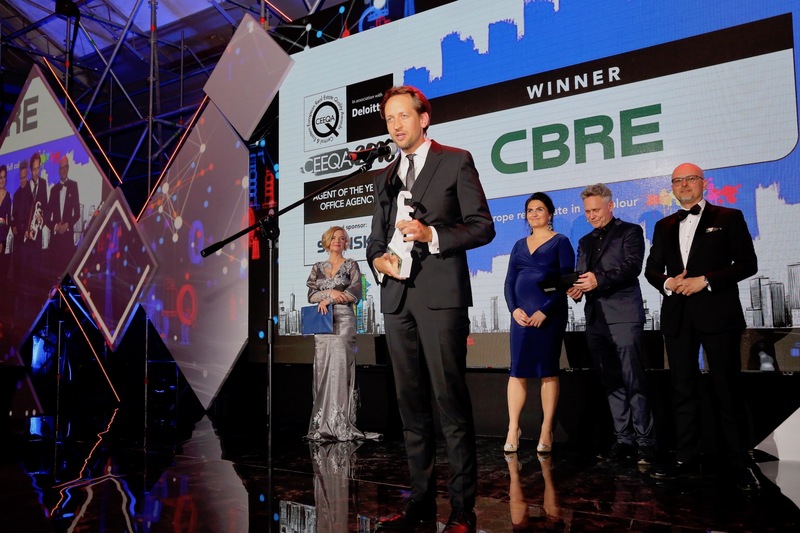 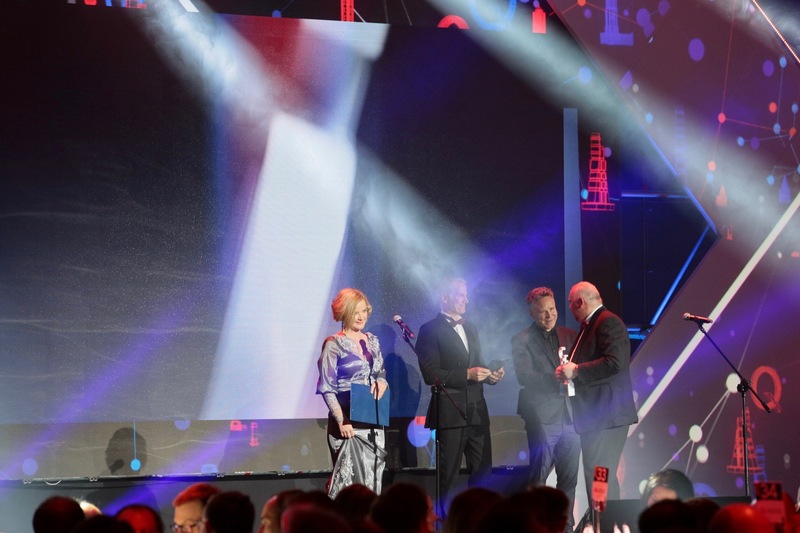 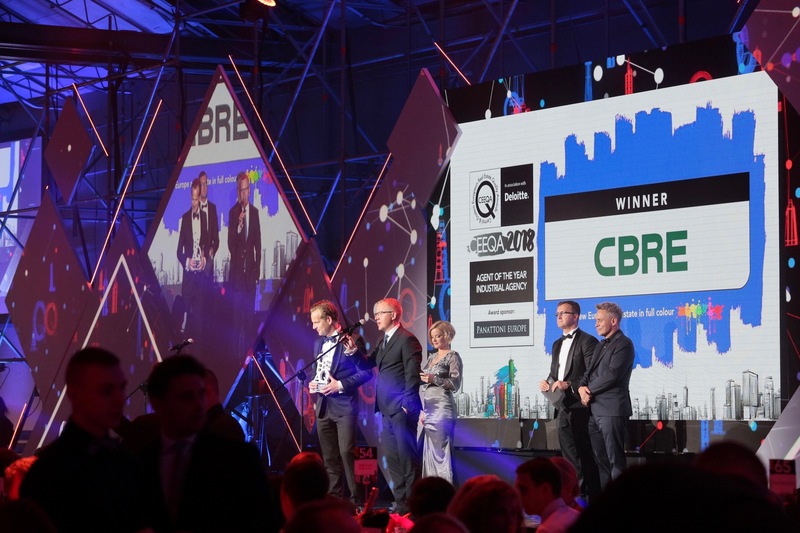 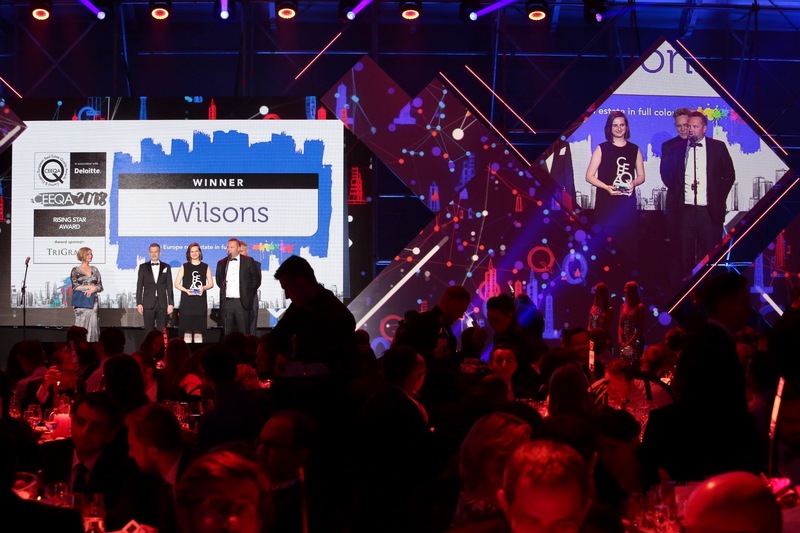 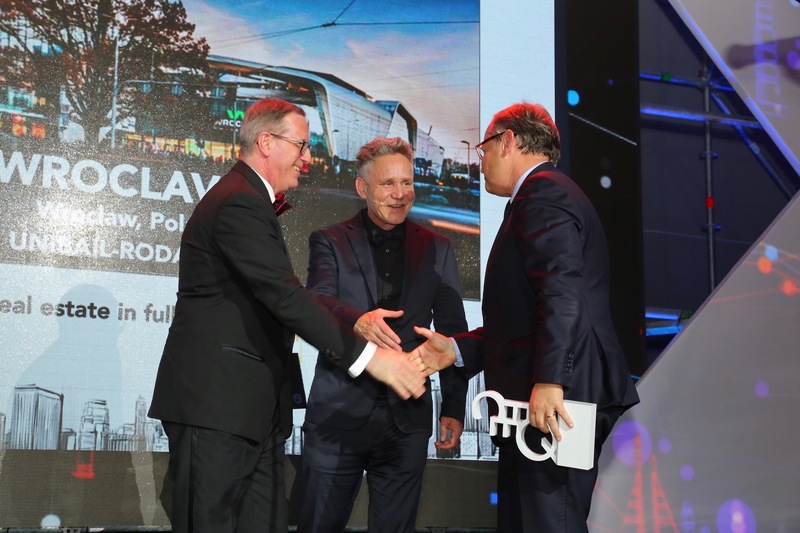 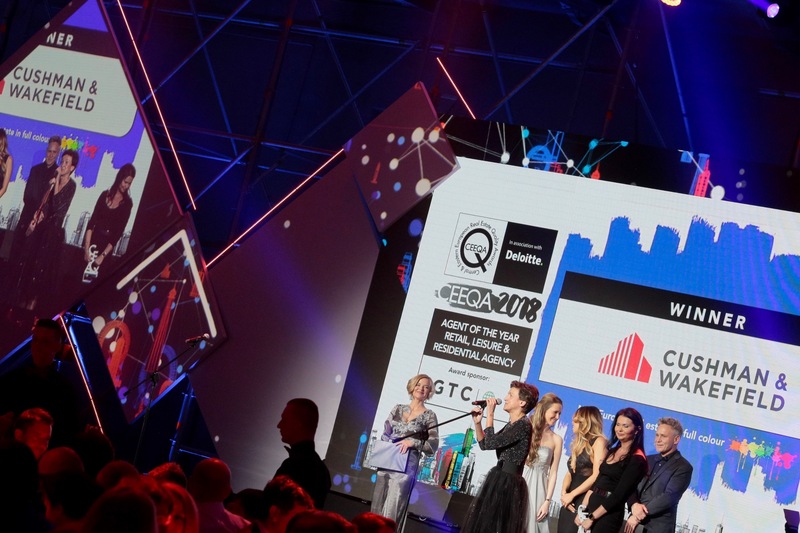 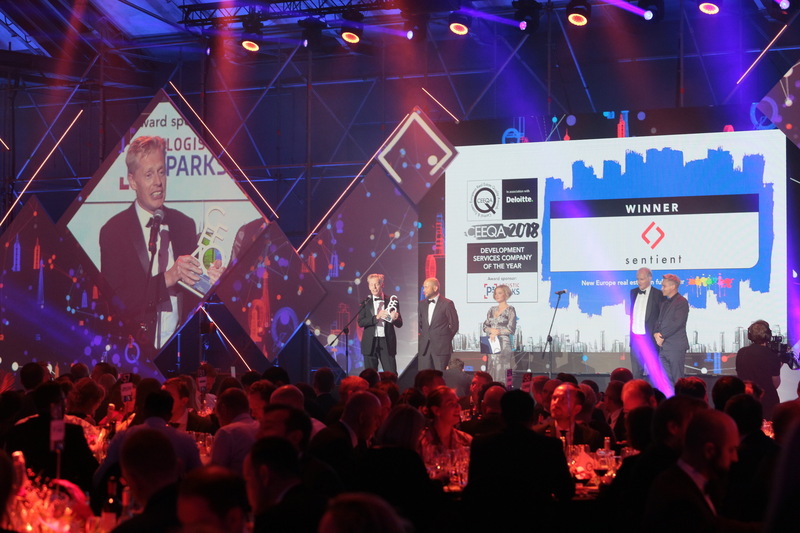 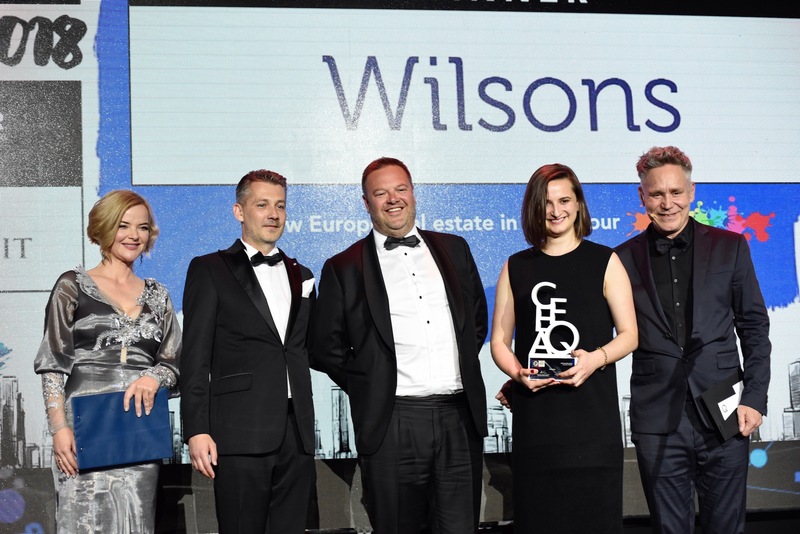 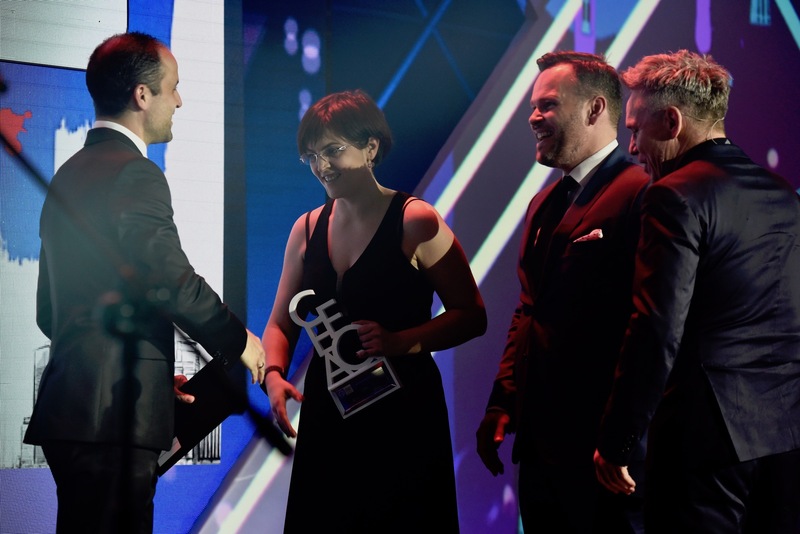 It was also Unibail-Rodamco’s year, their outstanding retail project Wroclavia, in Wroclaw, Poland, collecting both the Retail Development and overall Building of the Year CEE awards. 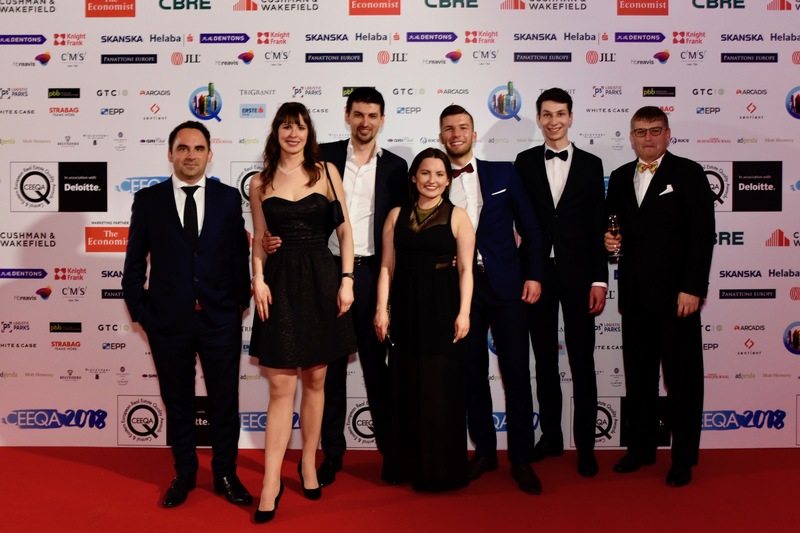 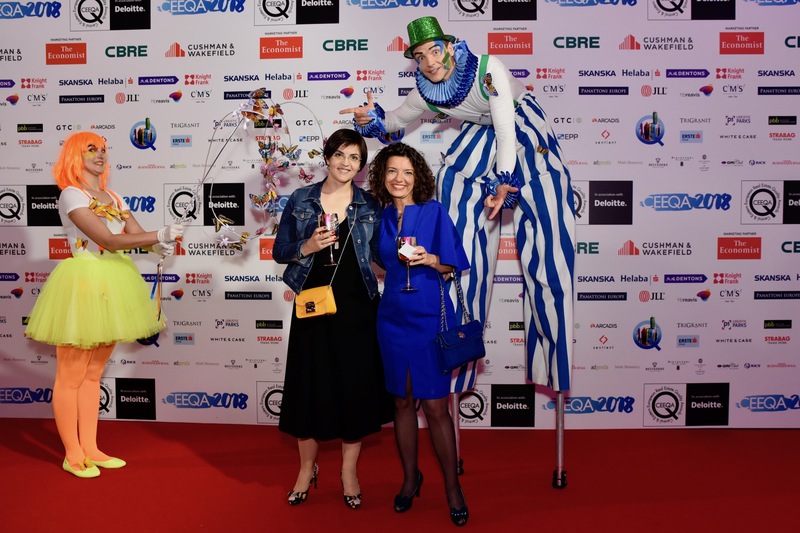 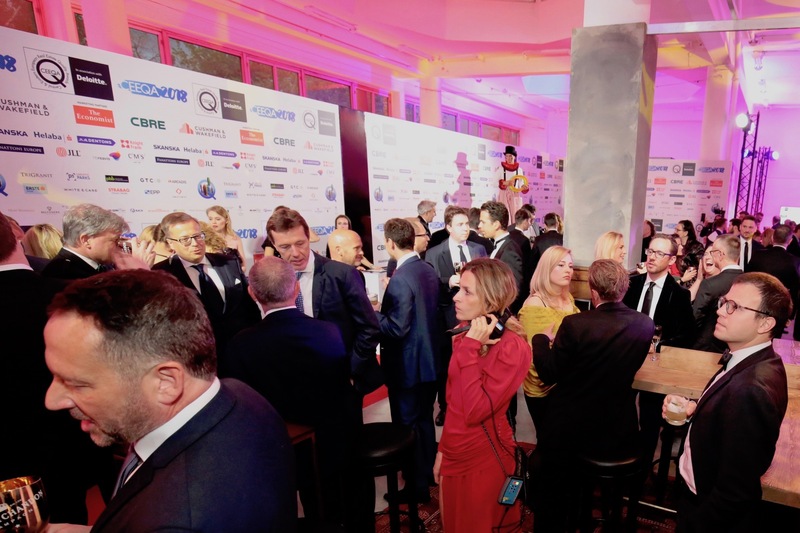 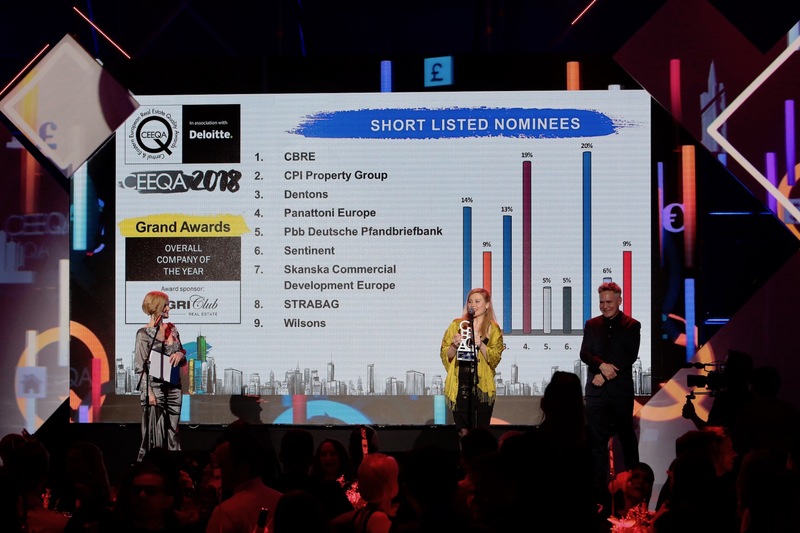 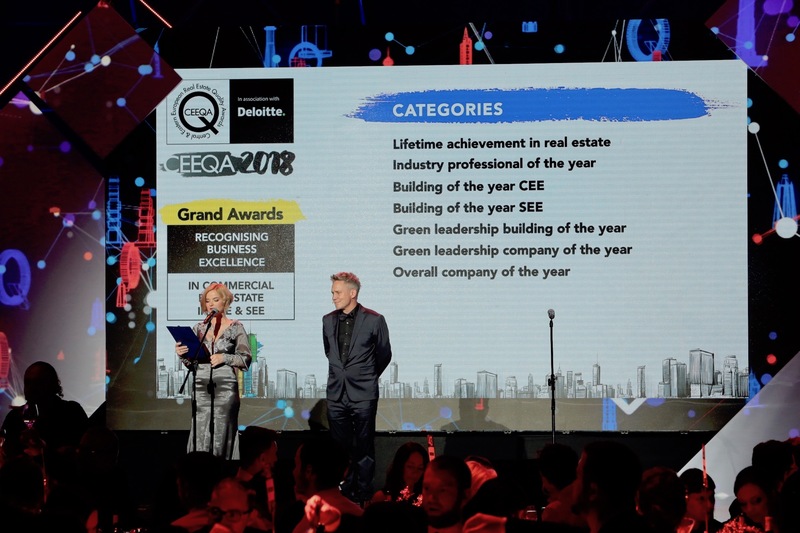 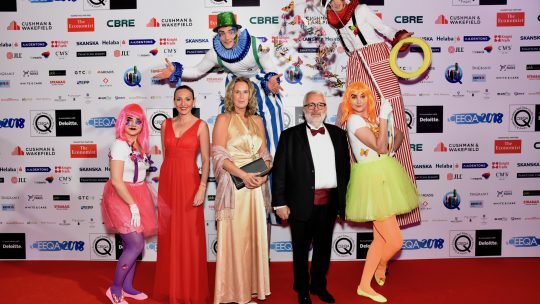 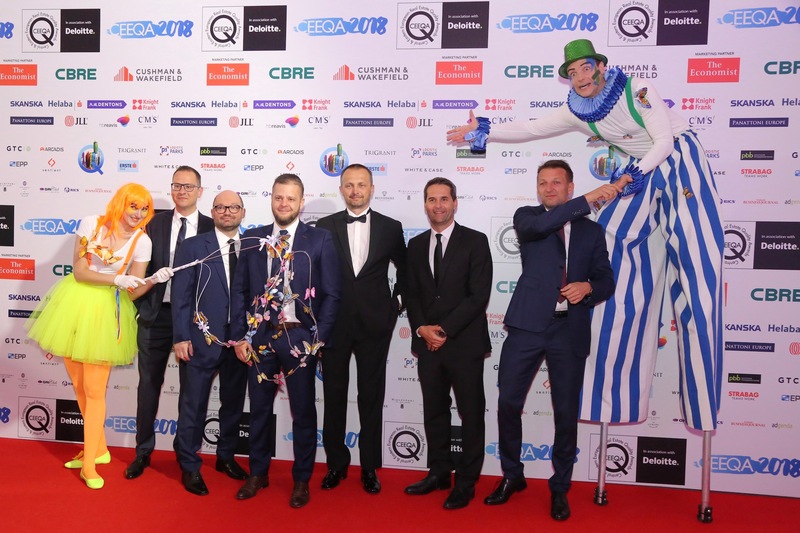 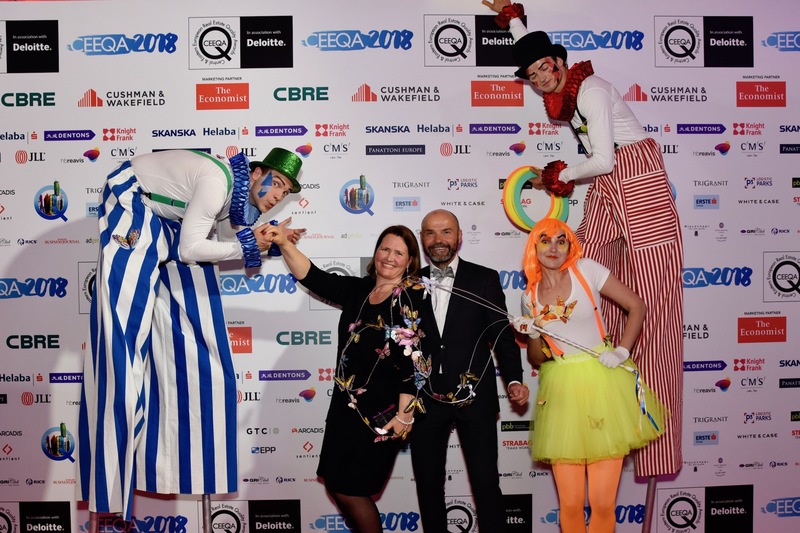 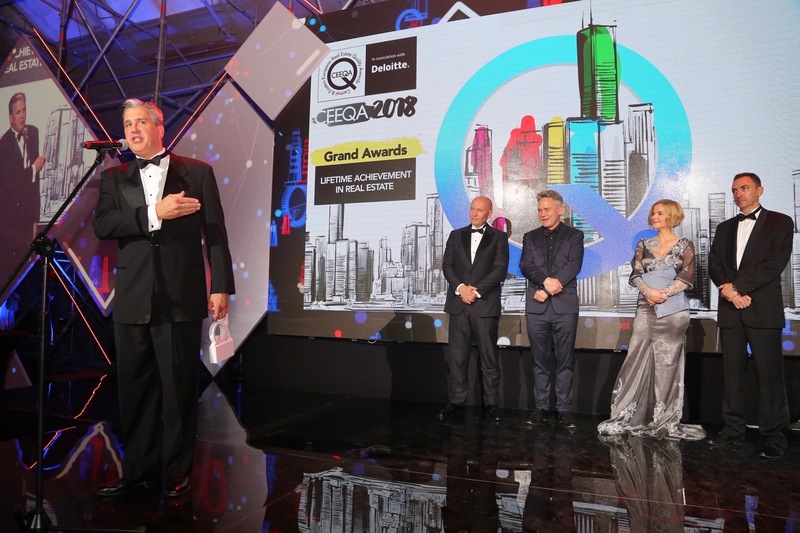 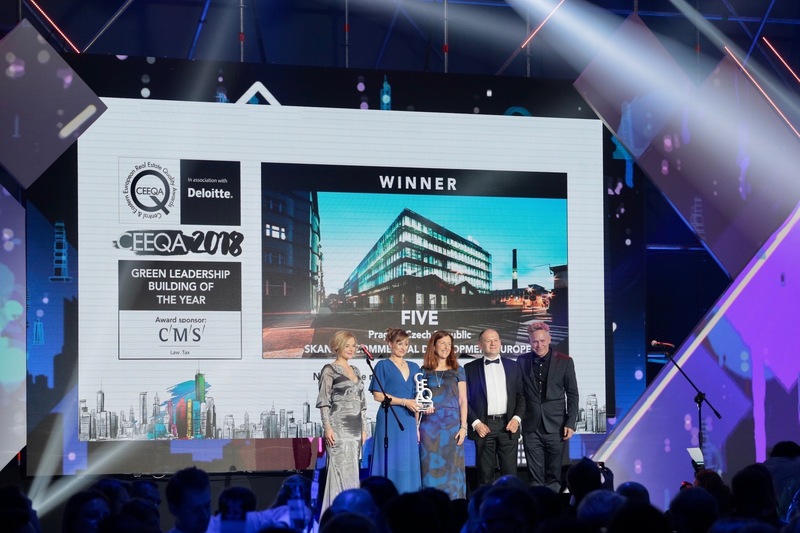 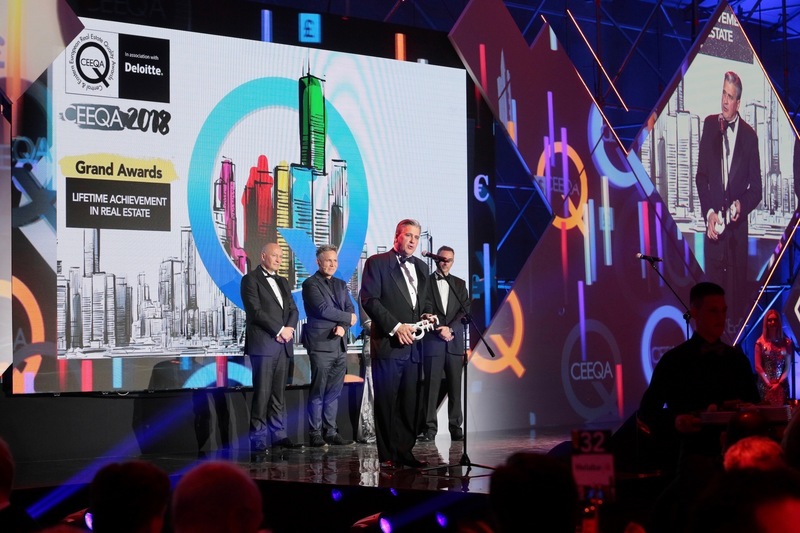 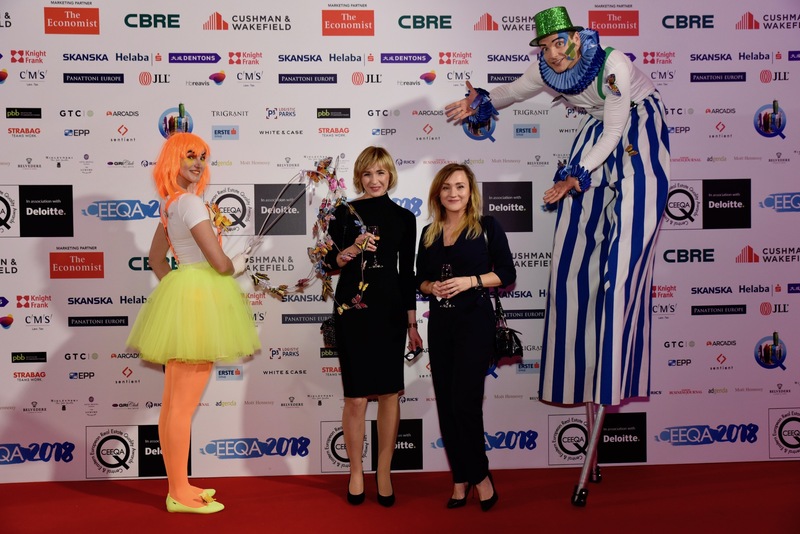 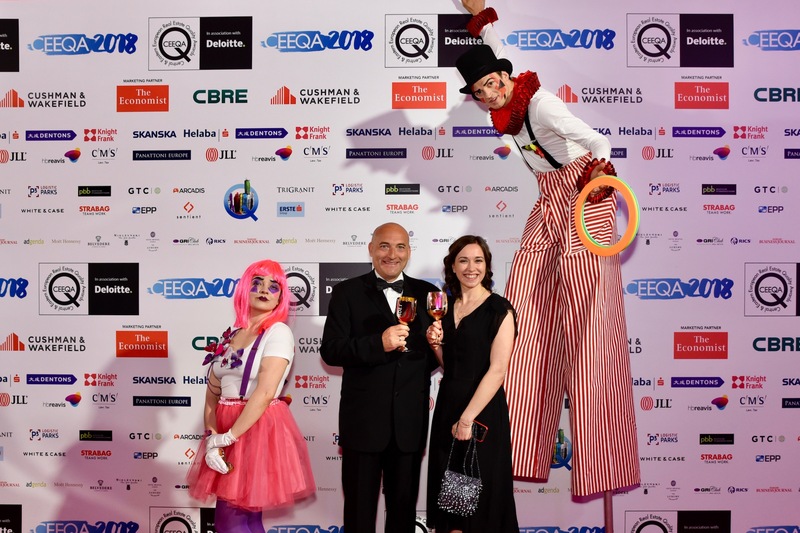 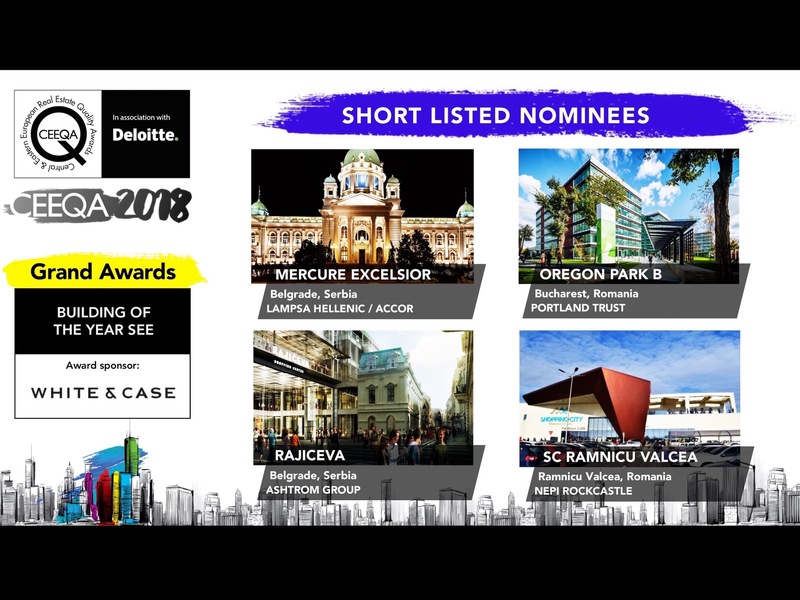 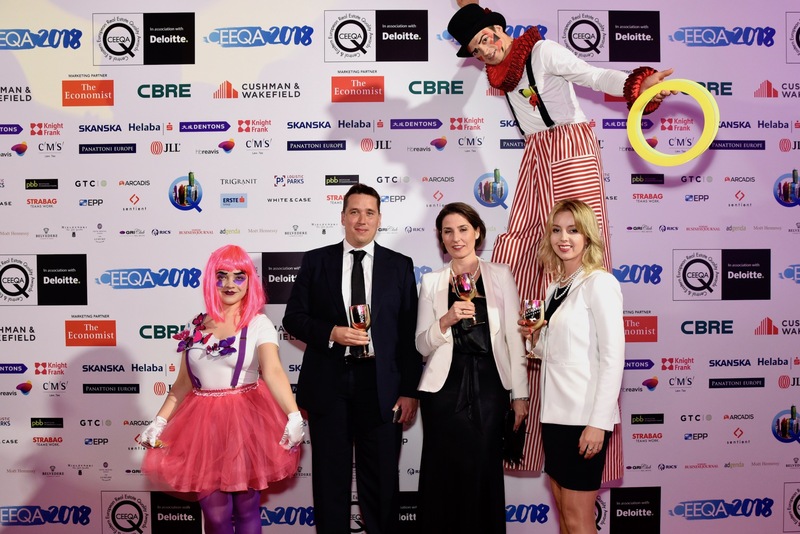 Other successful buildings in the 2018 edition of CEEQA were Oregon Park Building B in Bucharest, Romania, picking up the Building of the Year SEE award, and the Grand Hotel Kempinski Riga restoration in Latvia with the Hotel, Leisure and Residential Development title. 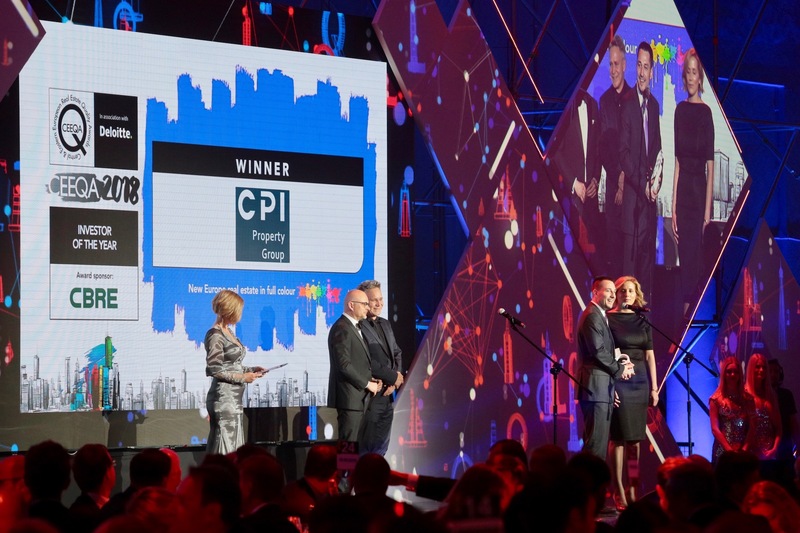 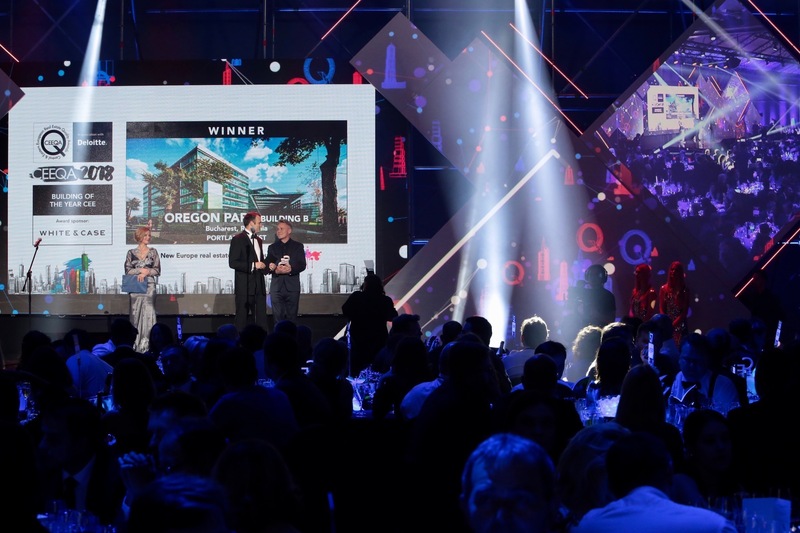 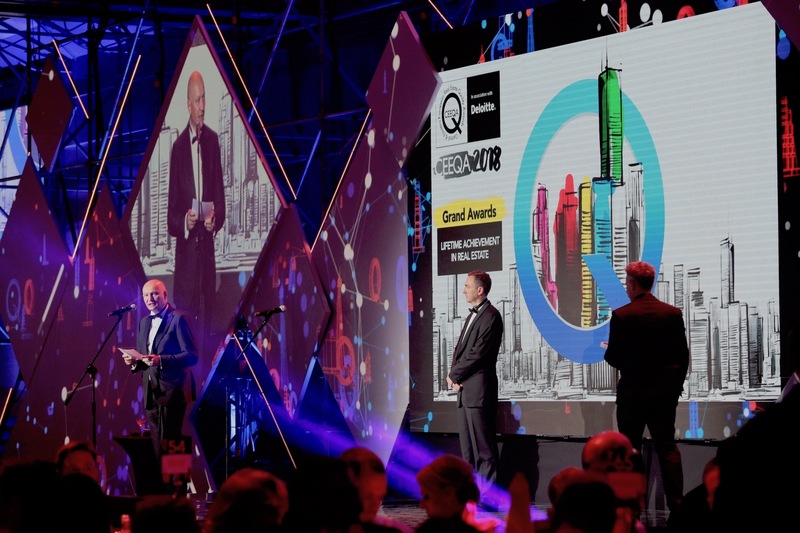 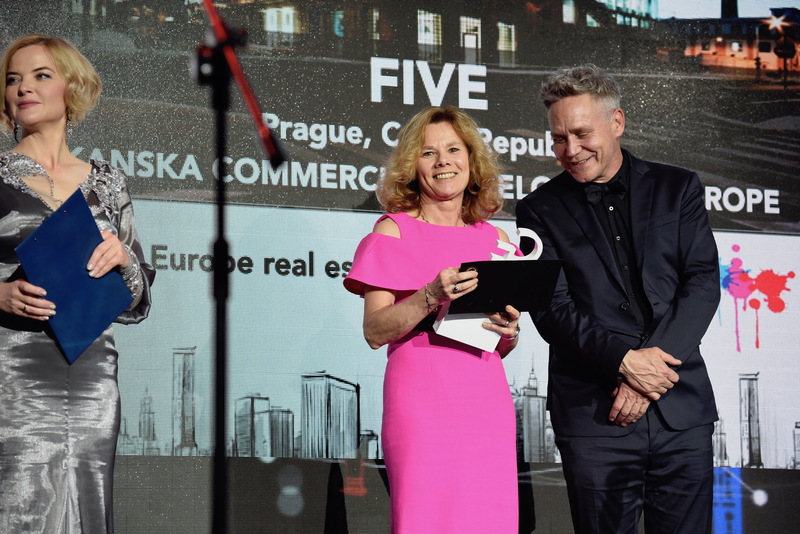 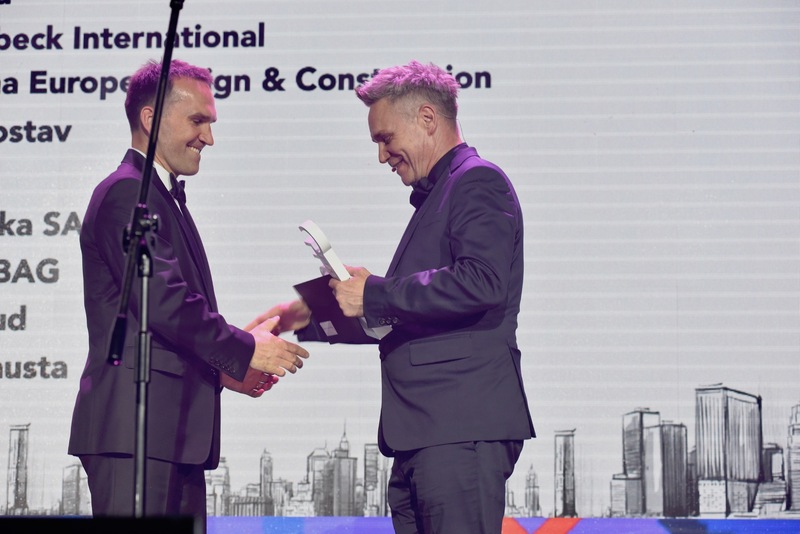 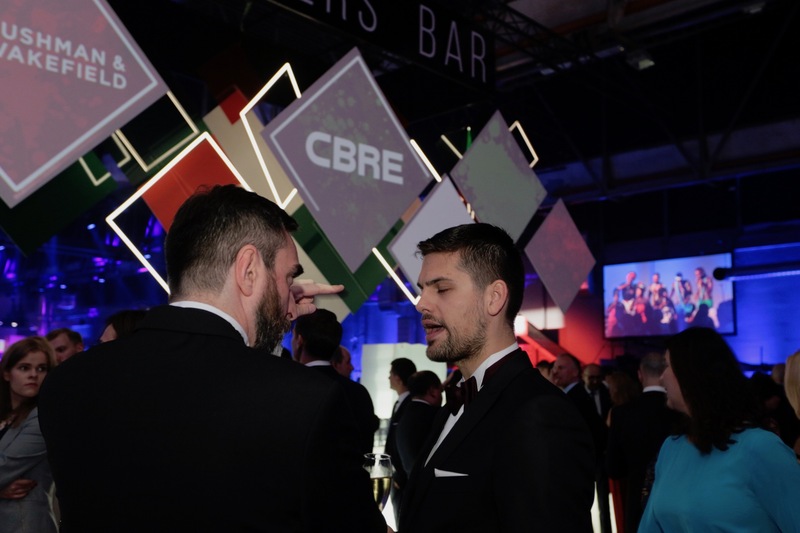 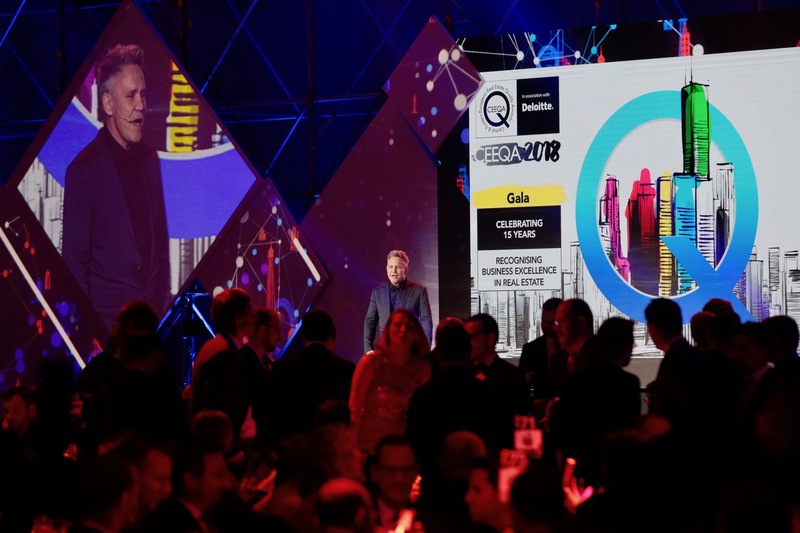 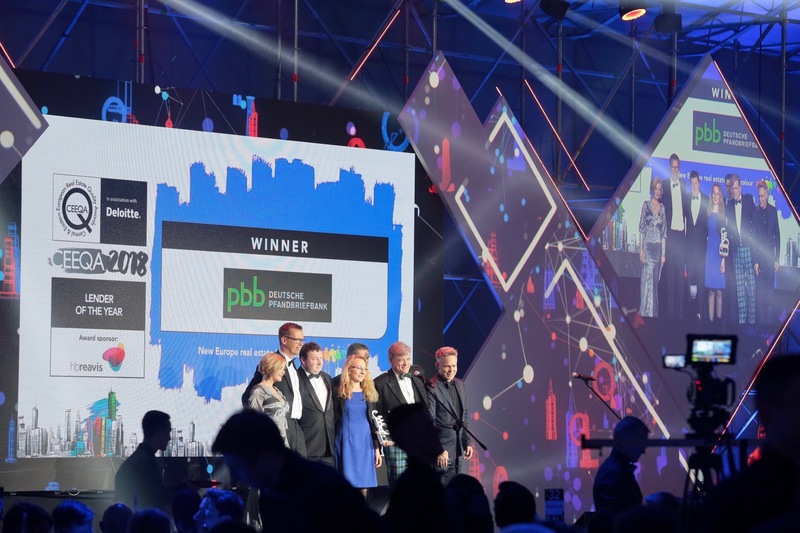 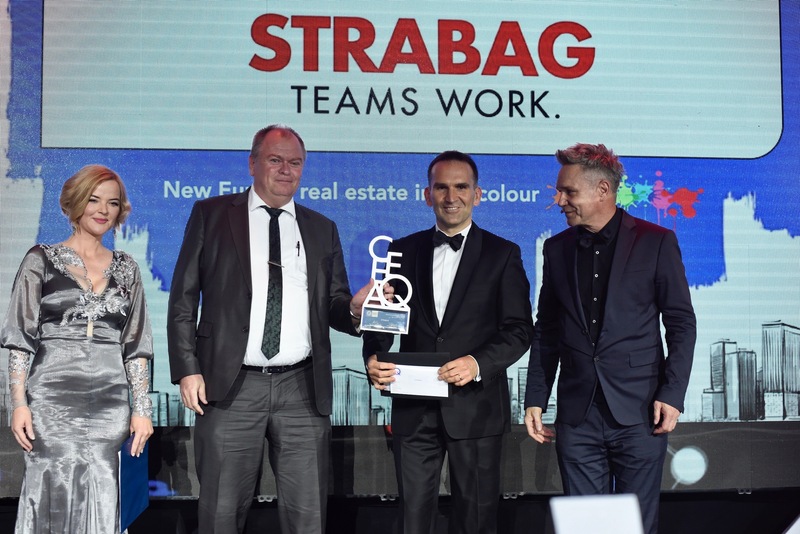 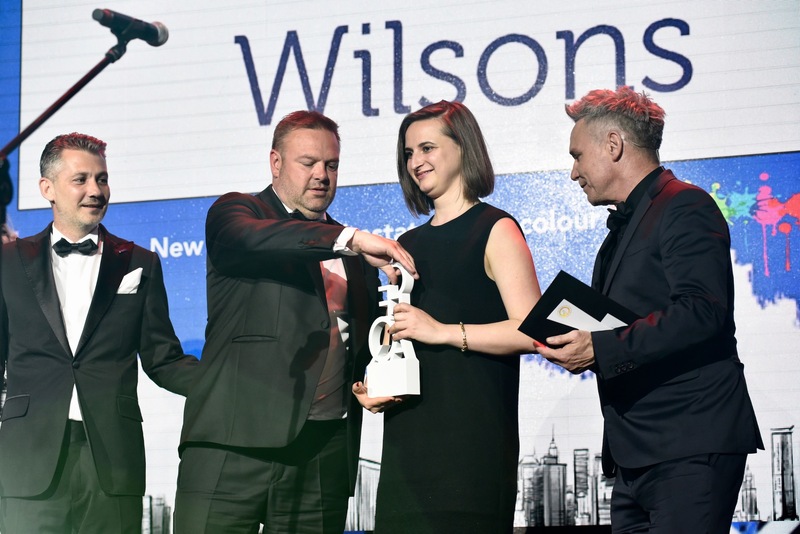 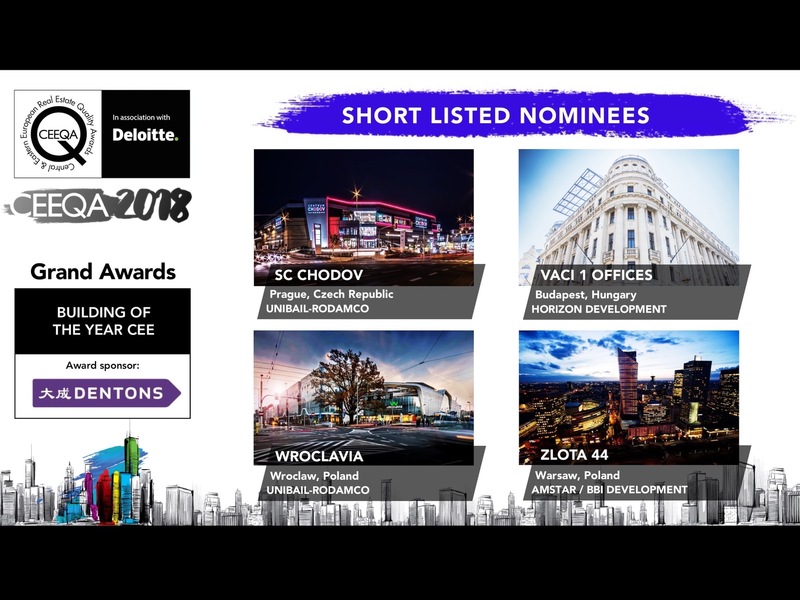 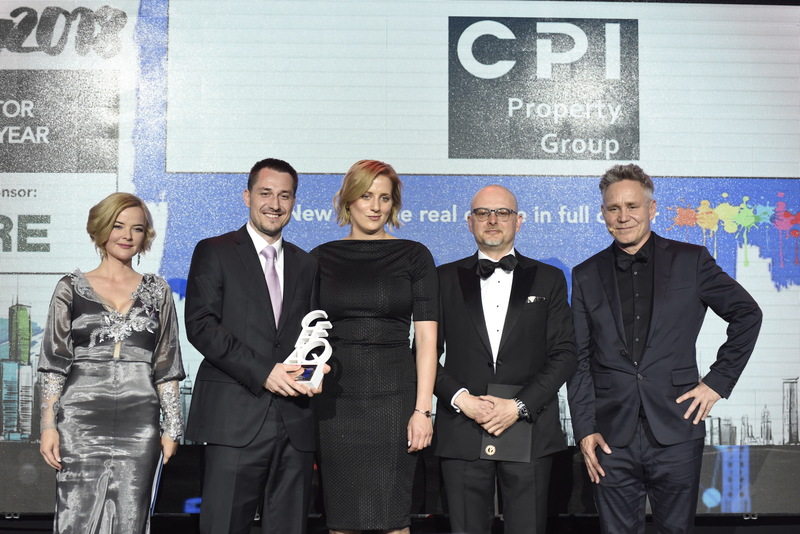 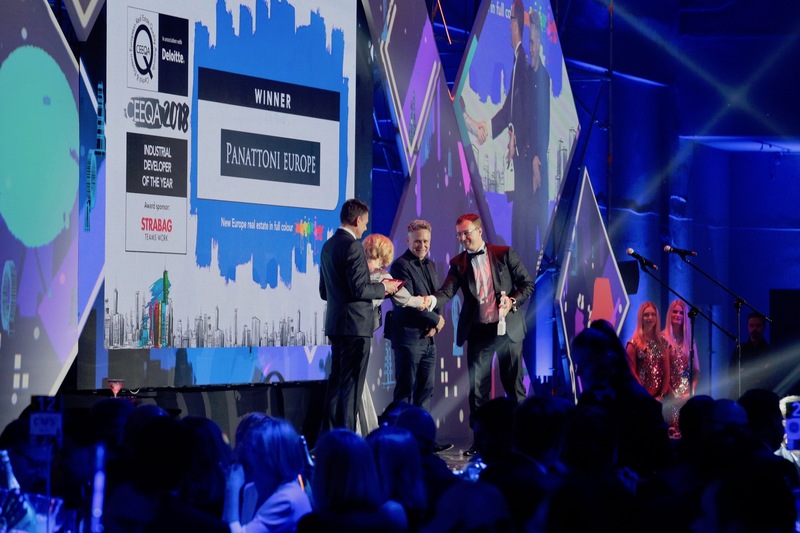 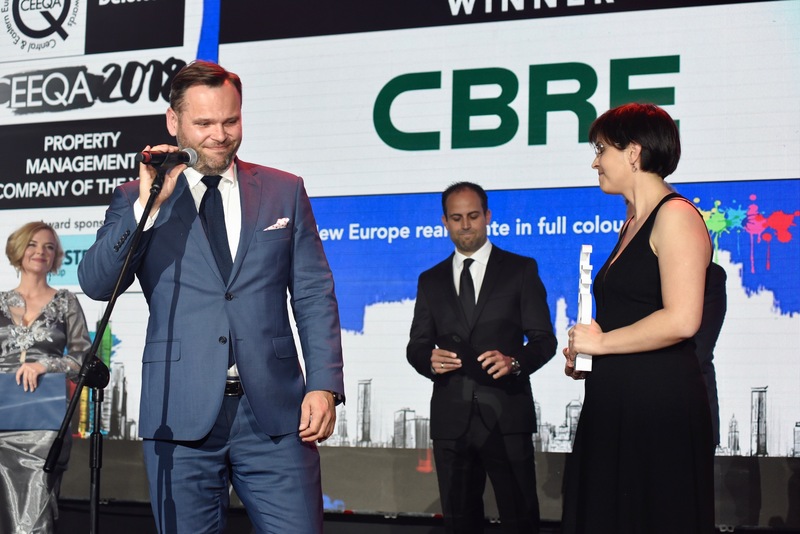 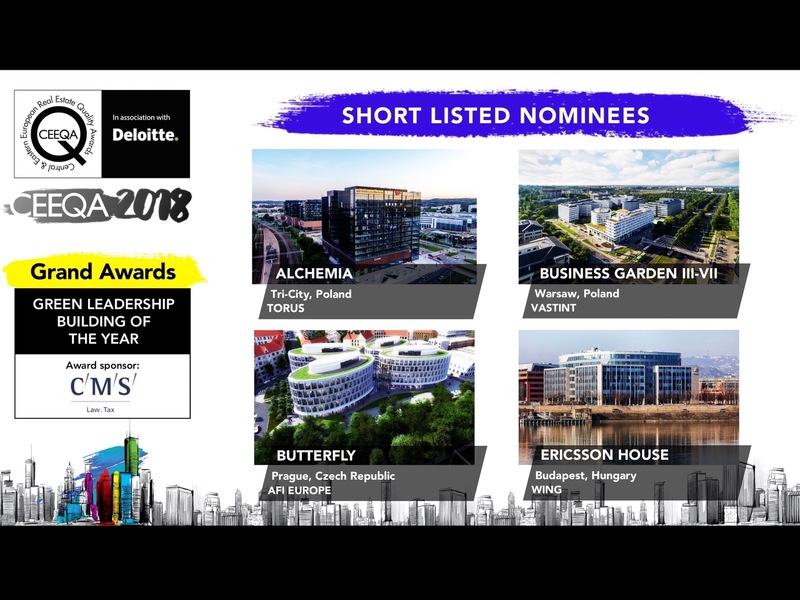 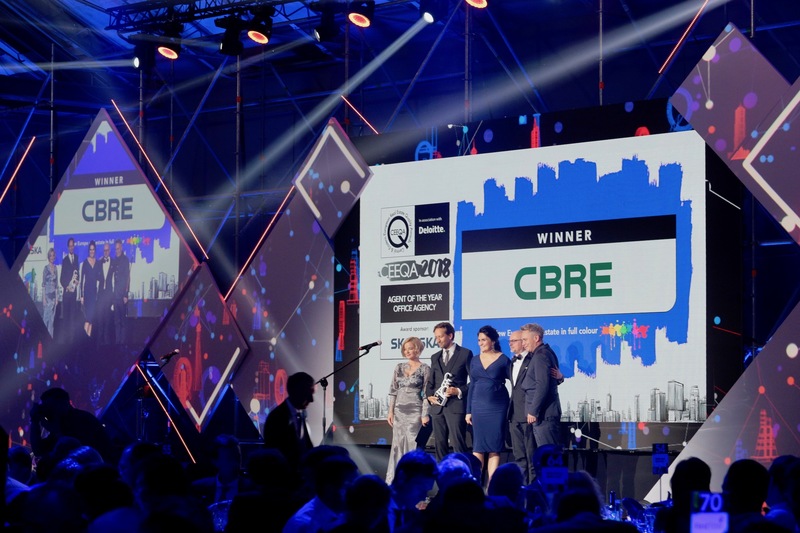 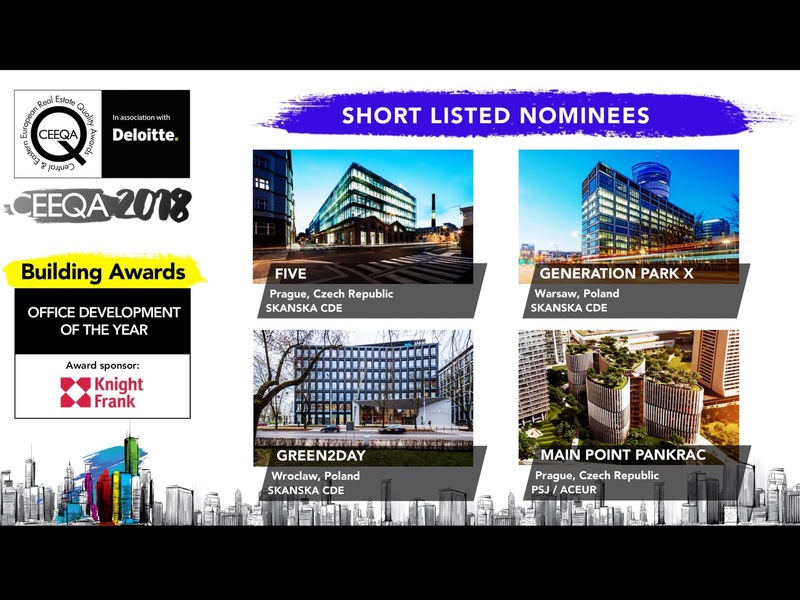 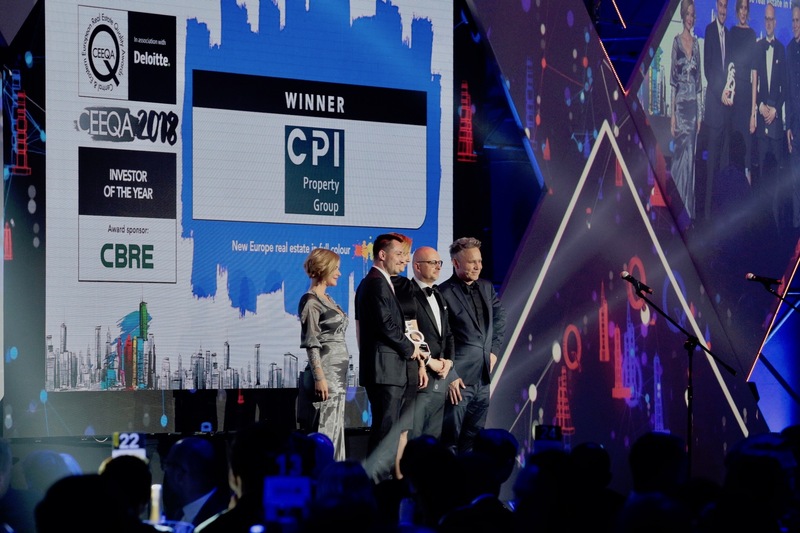 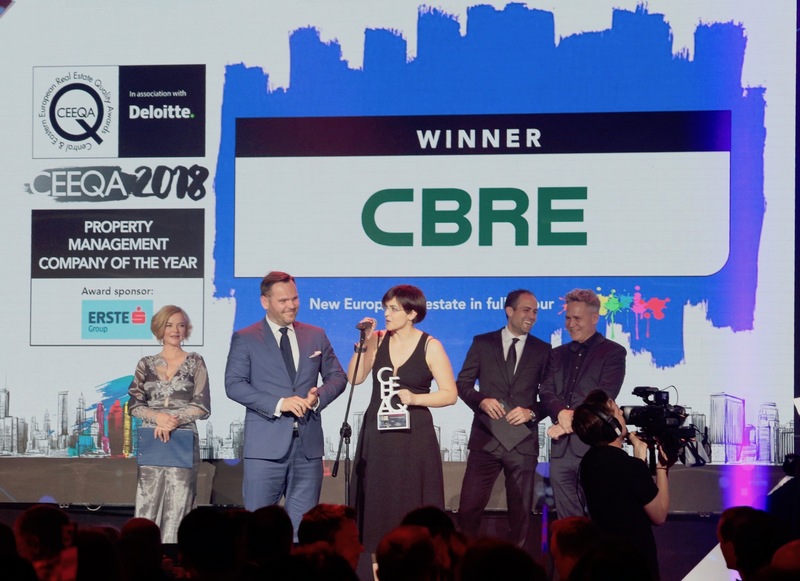 One of the main characteristics of the 2018 edition was the sheer volume of high calibre projects completed during 2017 compared with recent years, particularly in the Prague office segment which was dominant in the Building Awards categories. 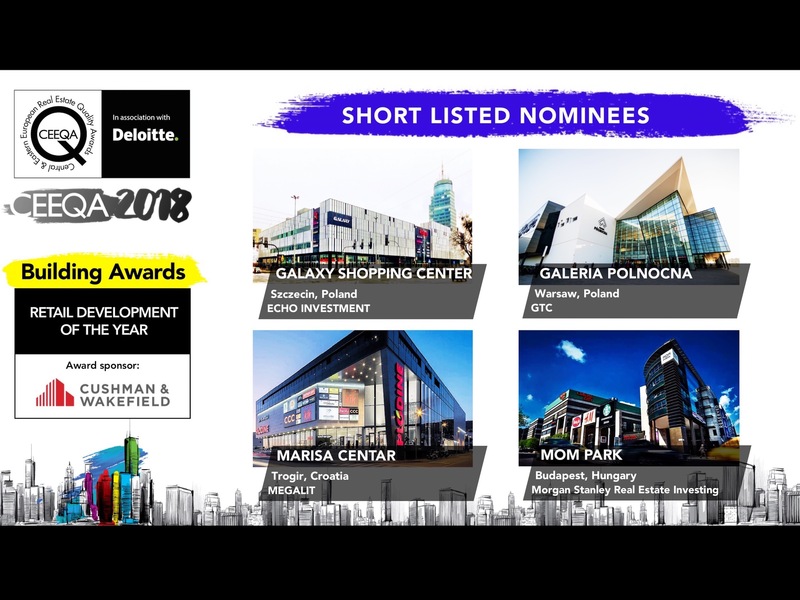 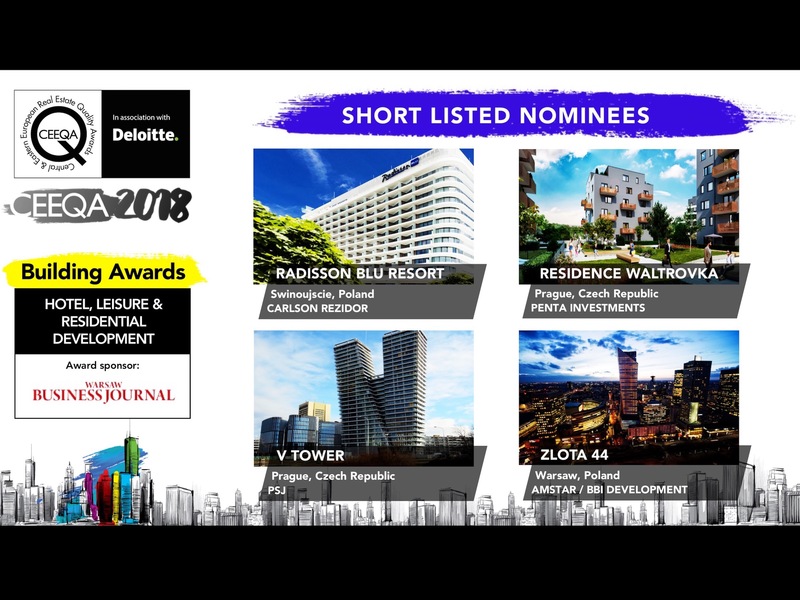 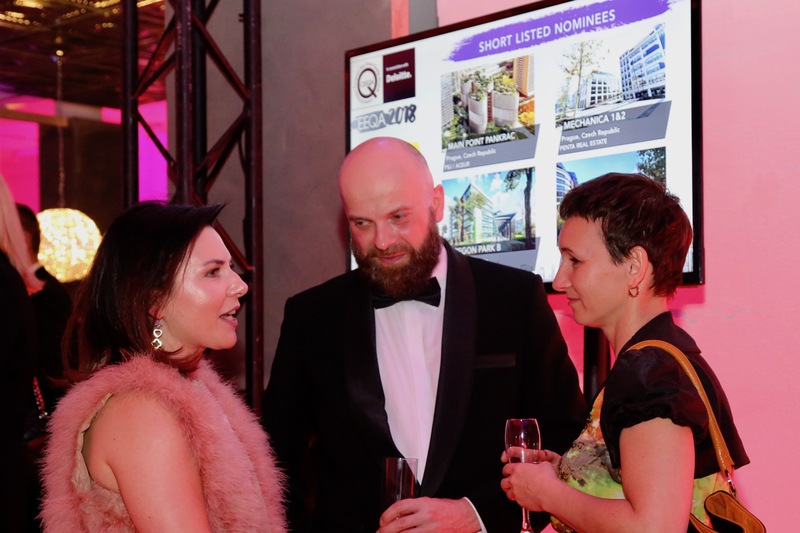 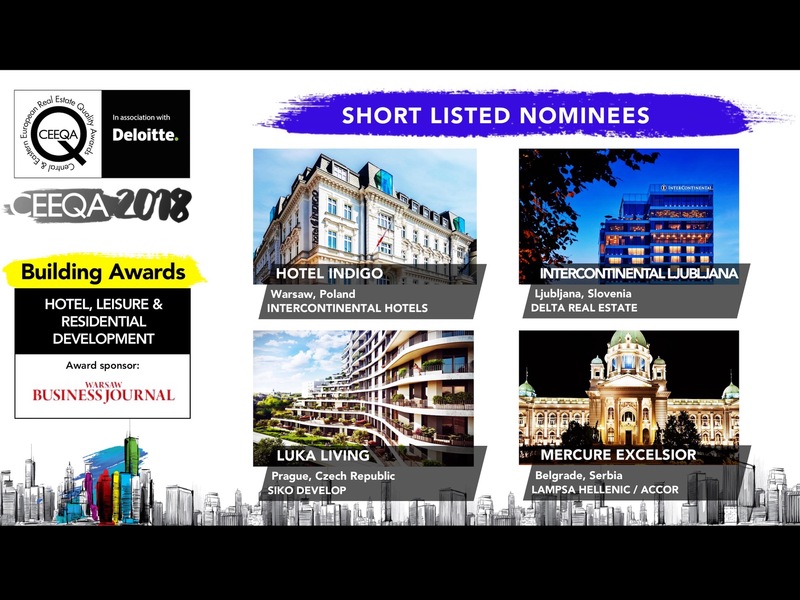 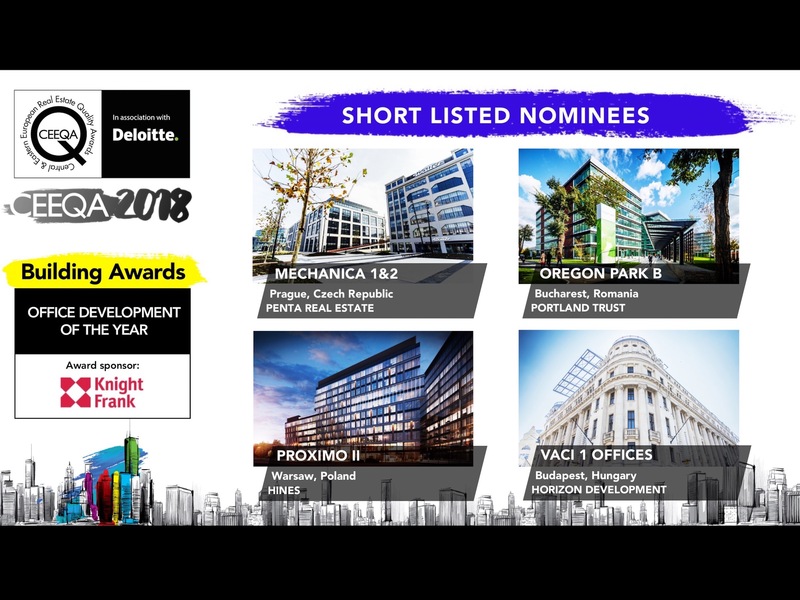 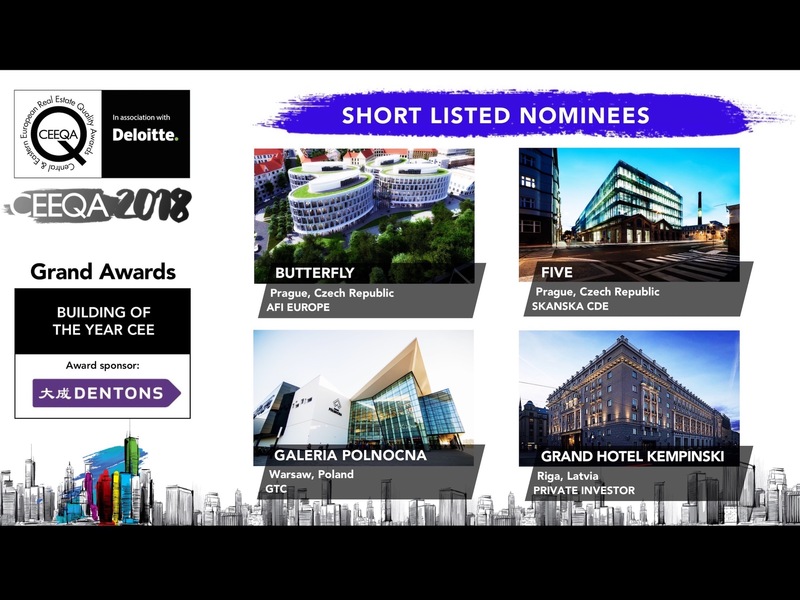 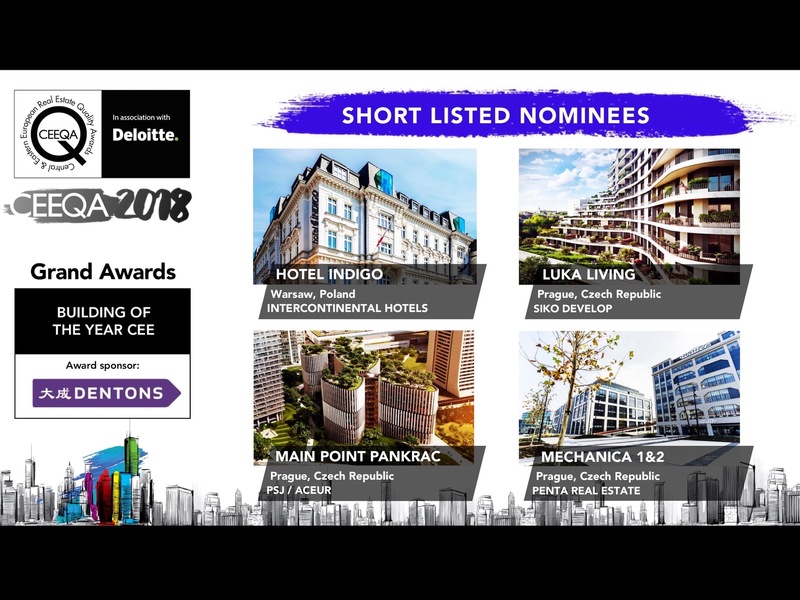 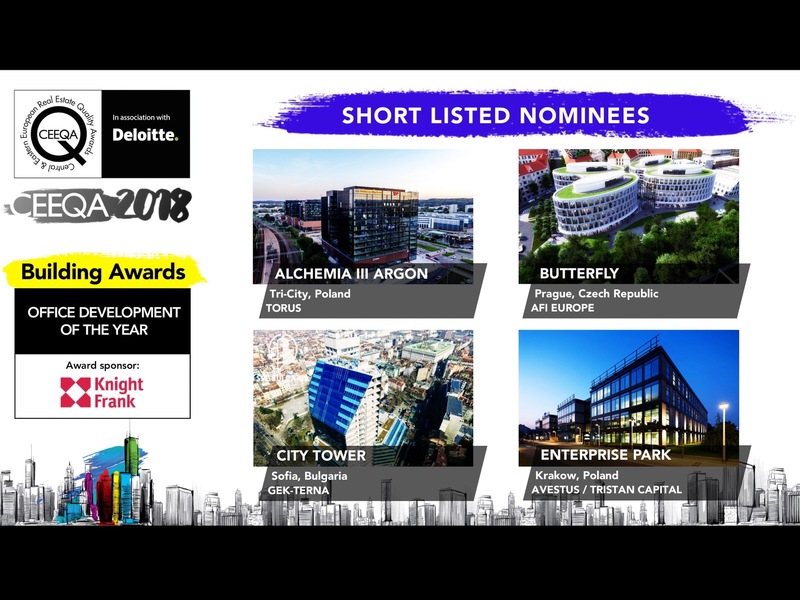 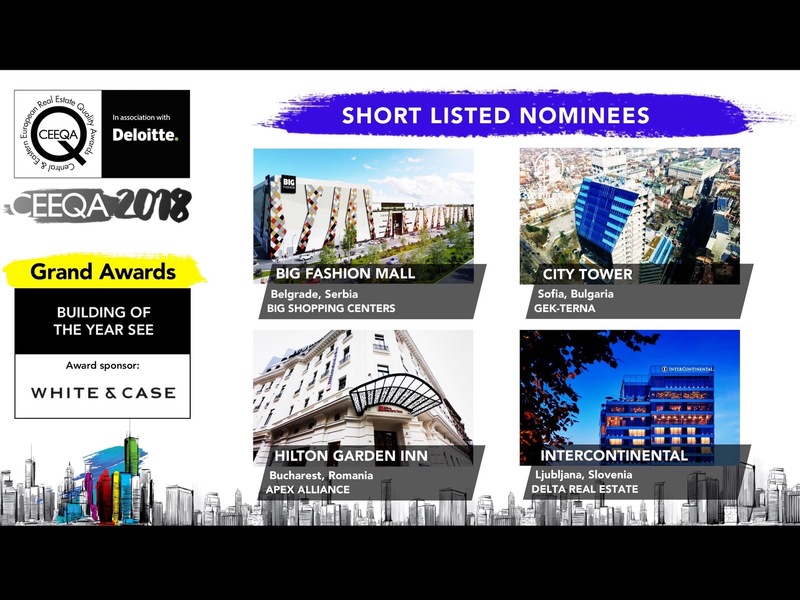 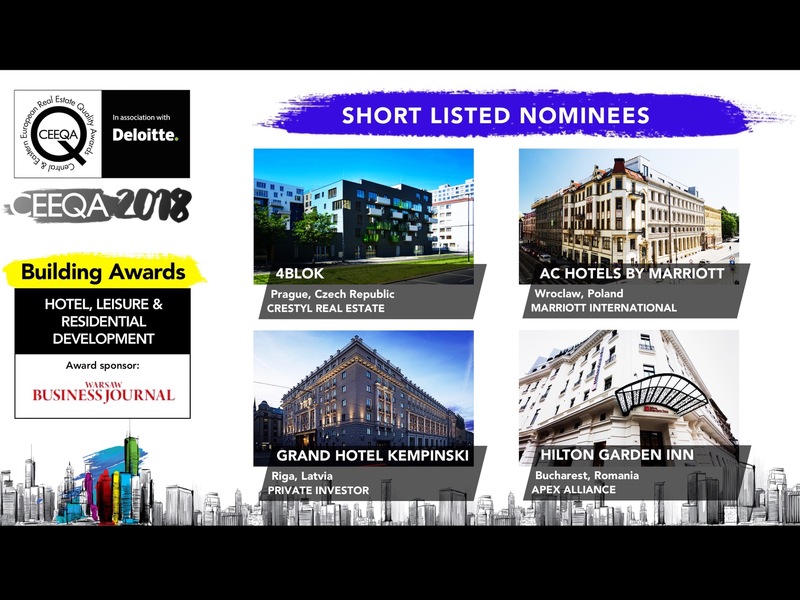 But also the number of ambitious restoration projects in all building awards categories, notably the hotel segment where more than half the short listed nominees were renovations, restorations or “renewals”, providing an interesting market signal for developers. 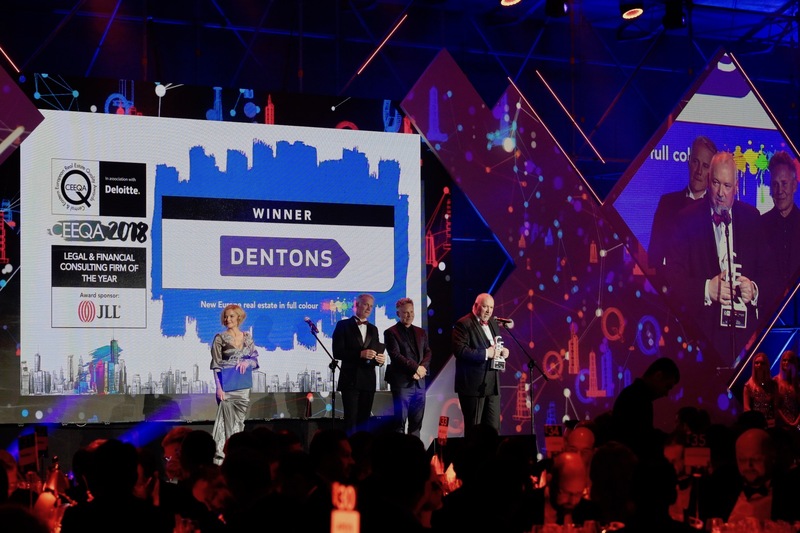 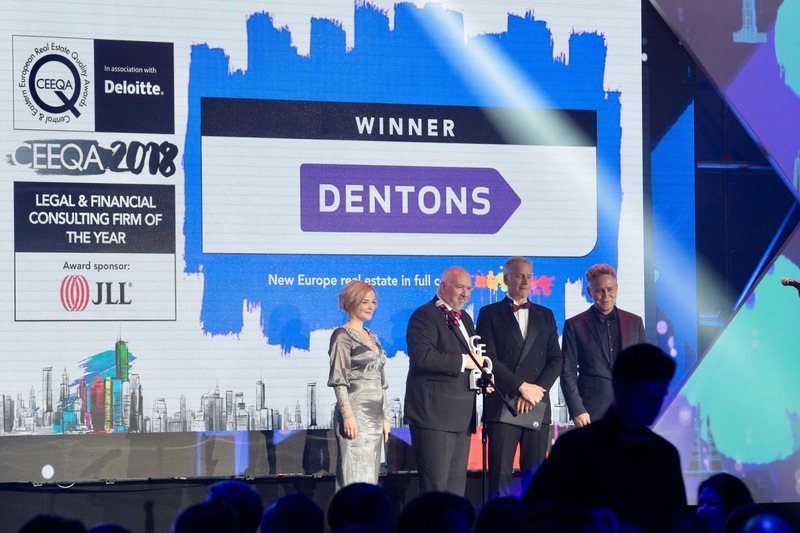 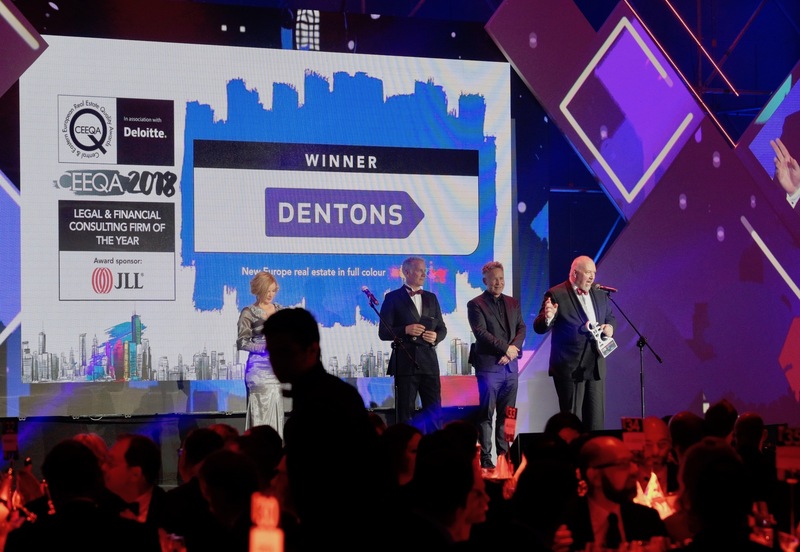 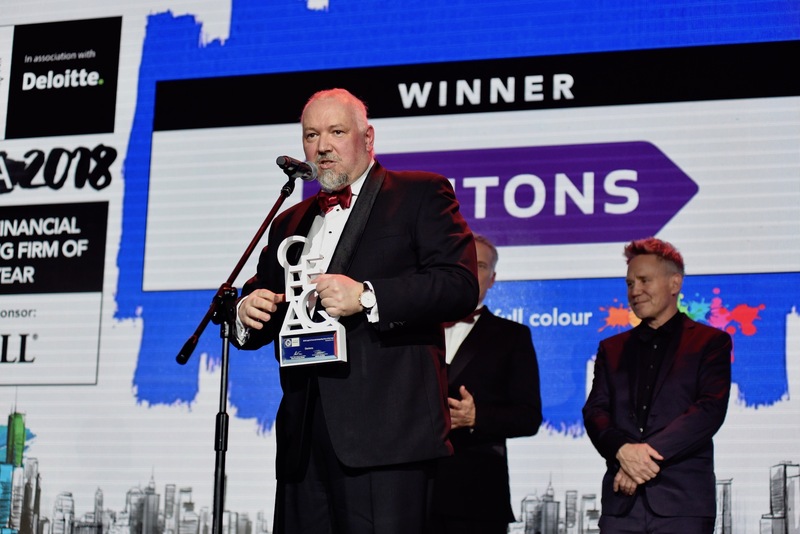 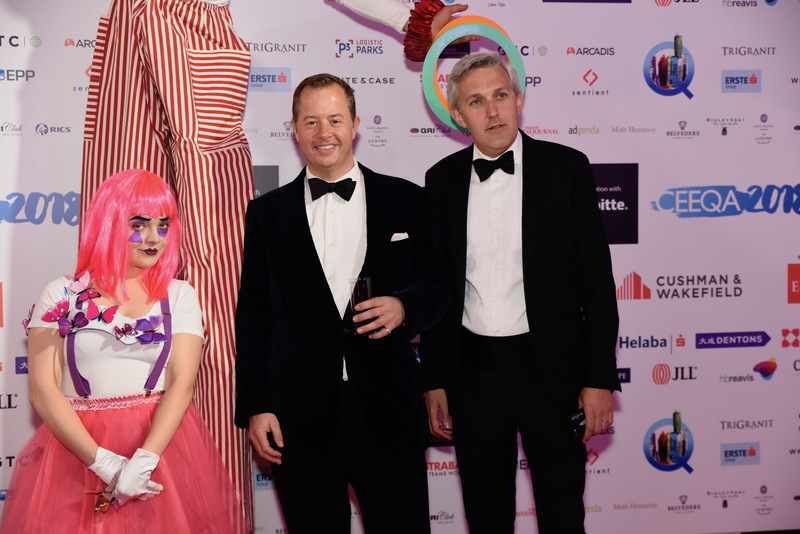 The biggest market whale of the them all in their segment, global legal practice Dentons, retained the Legal & Financial Services award for the ninth successive year, including two prior wins by the same team as Salans. 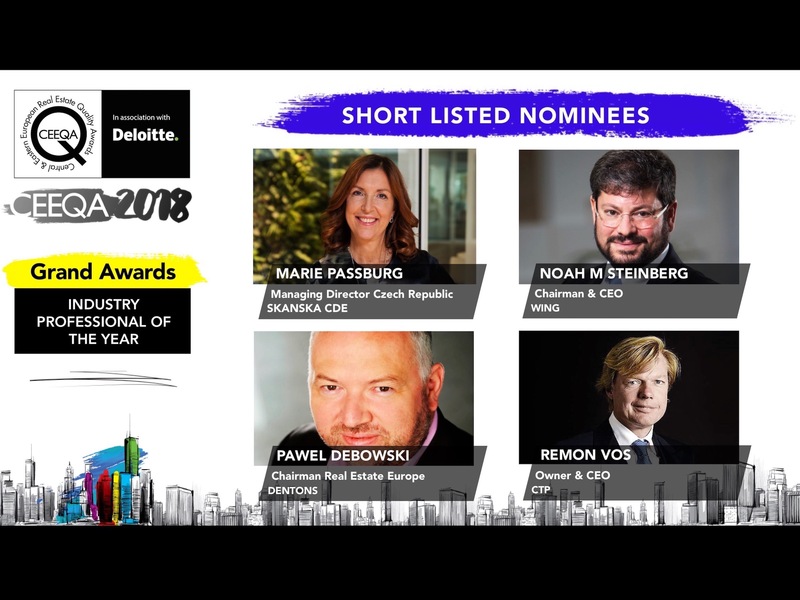 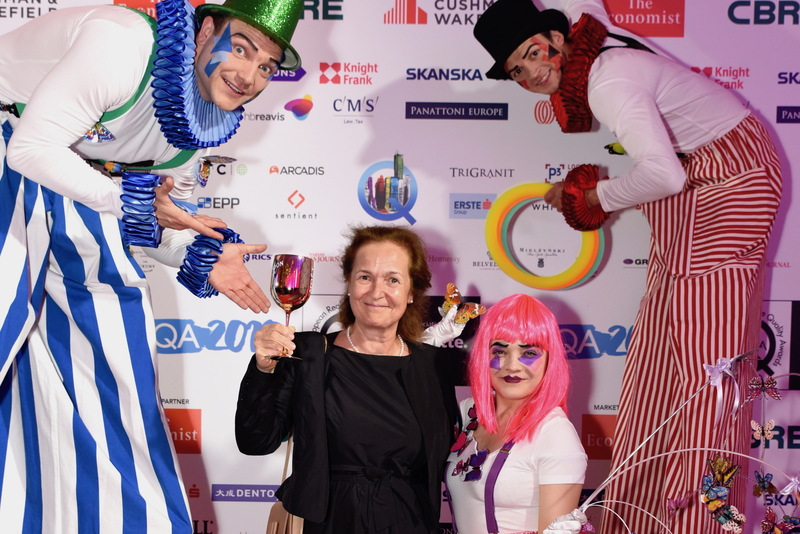 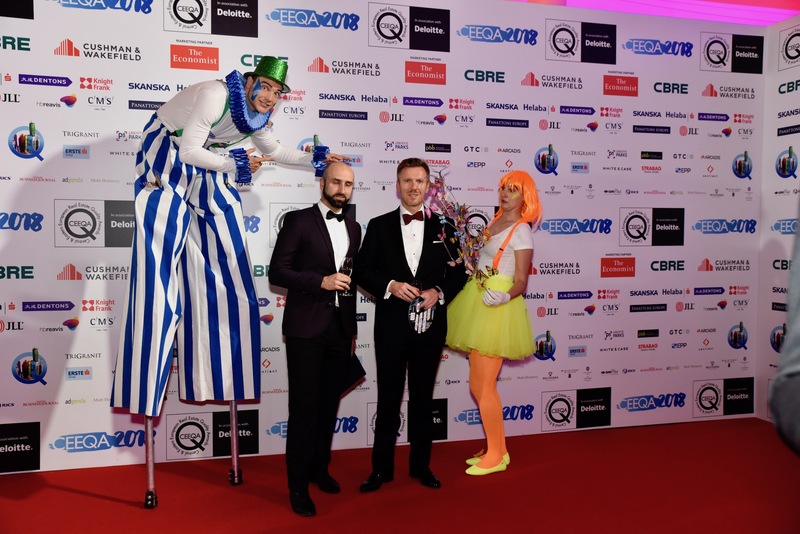 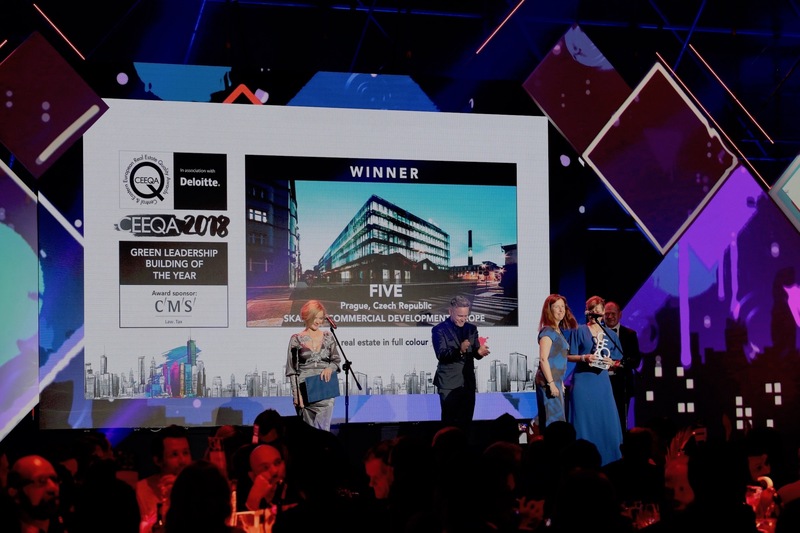 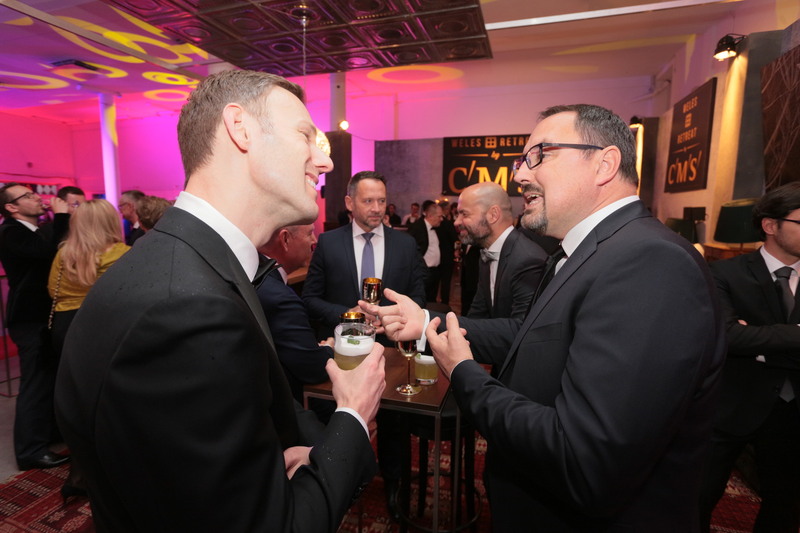 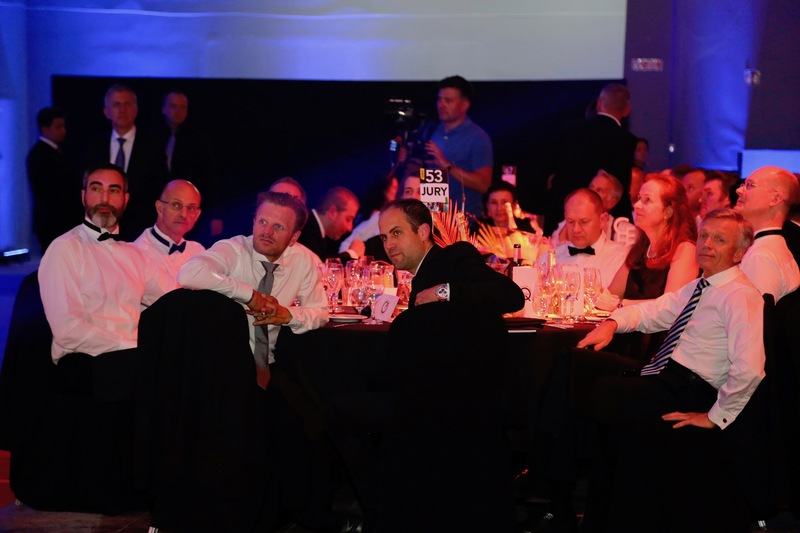 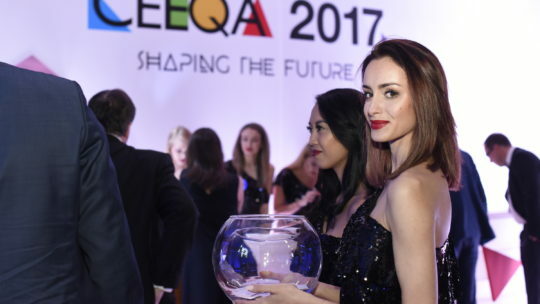 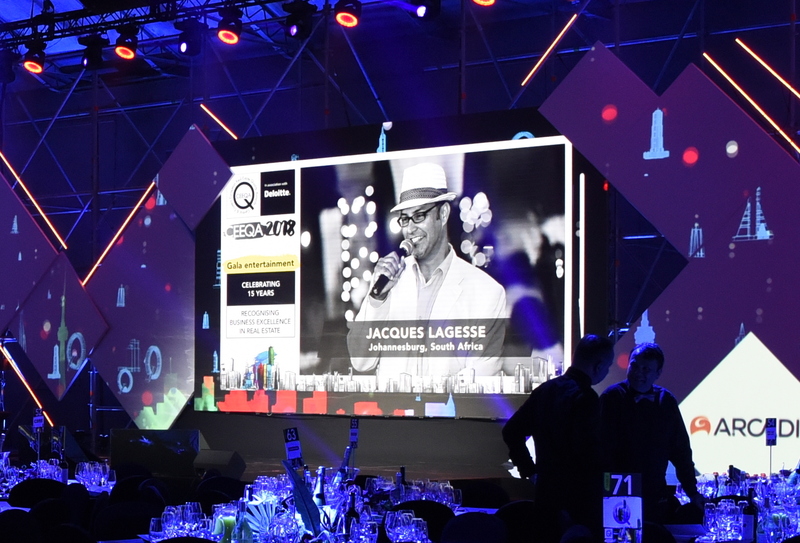 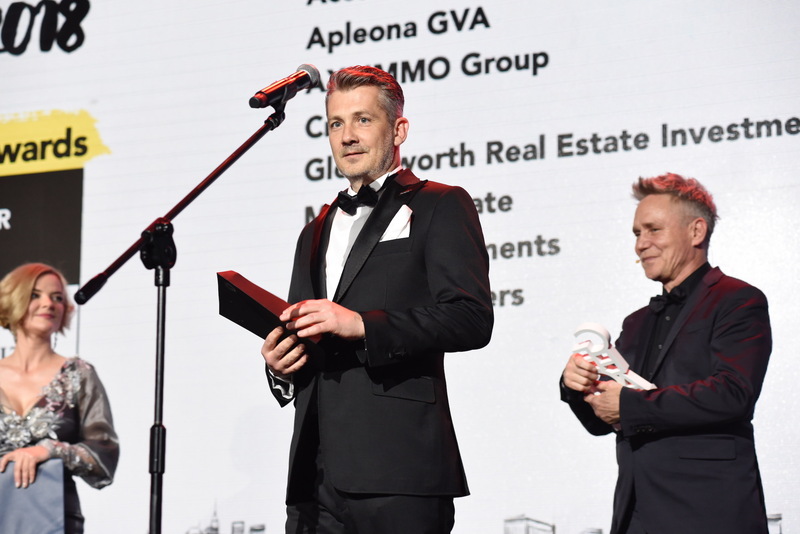 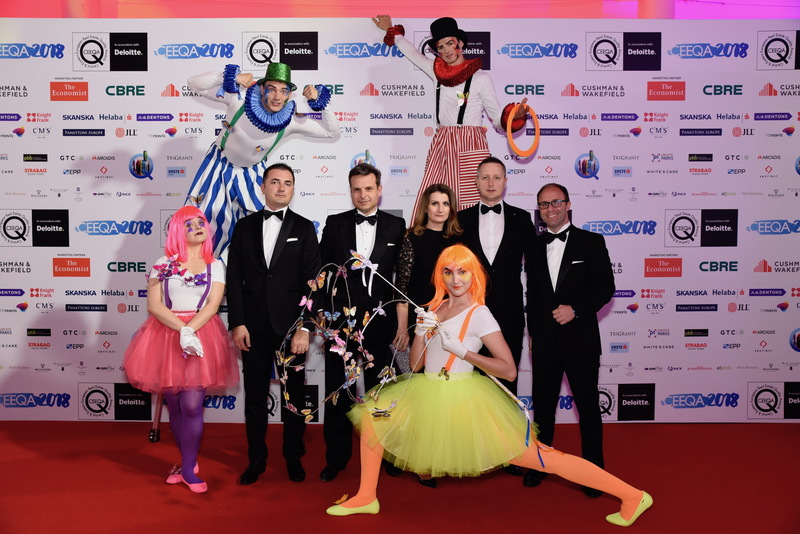 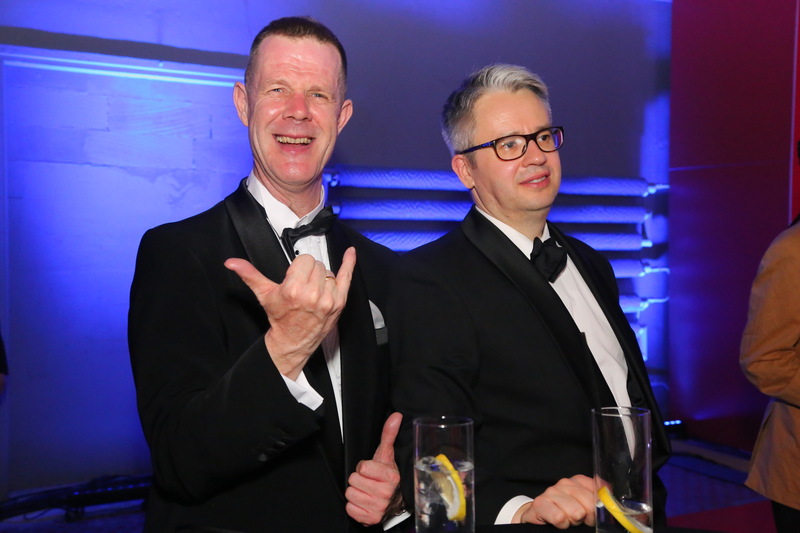 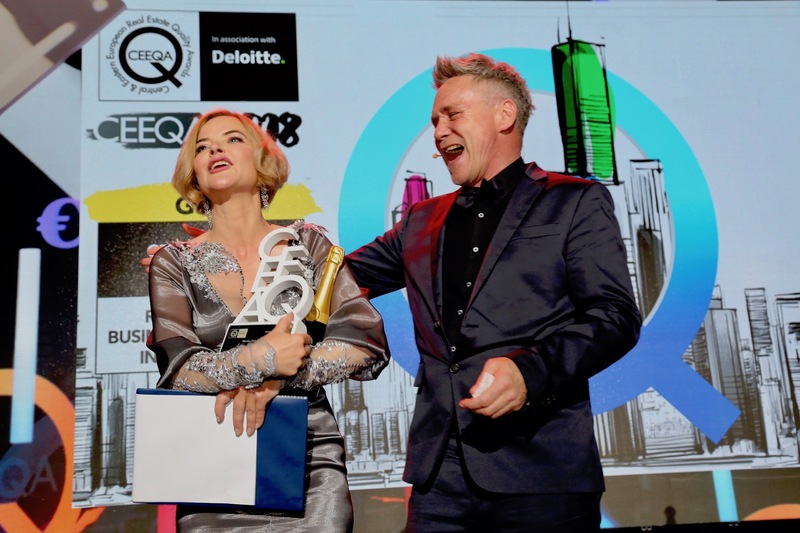 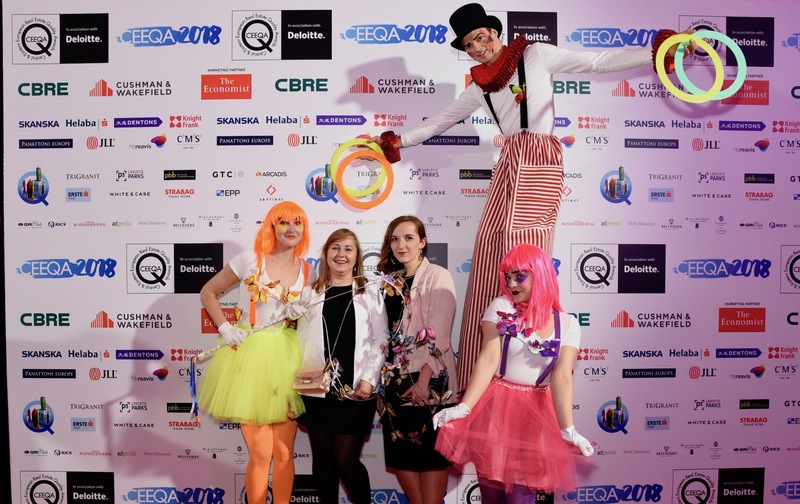 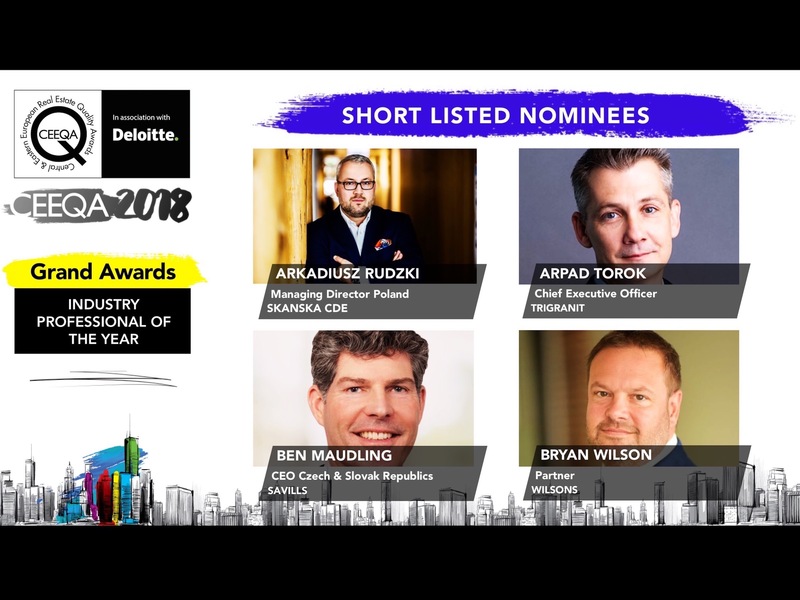 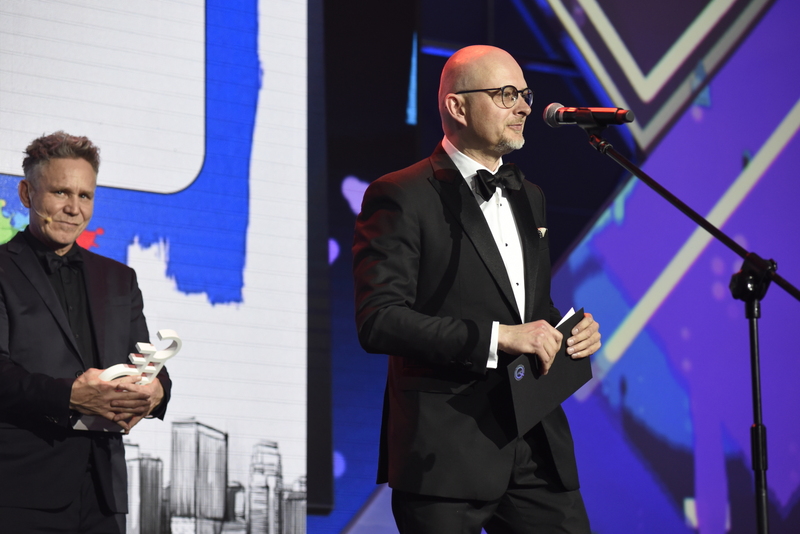 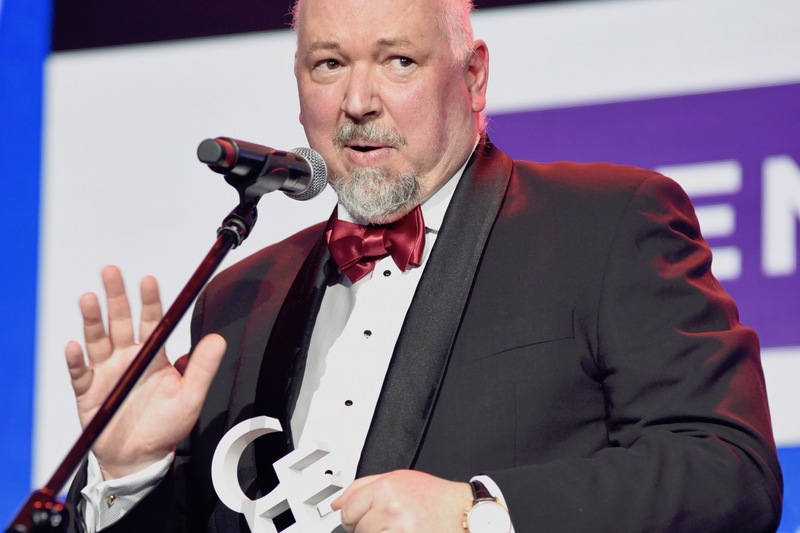 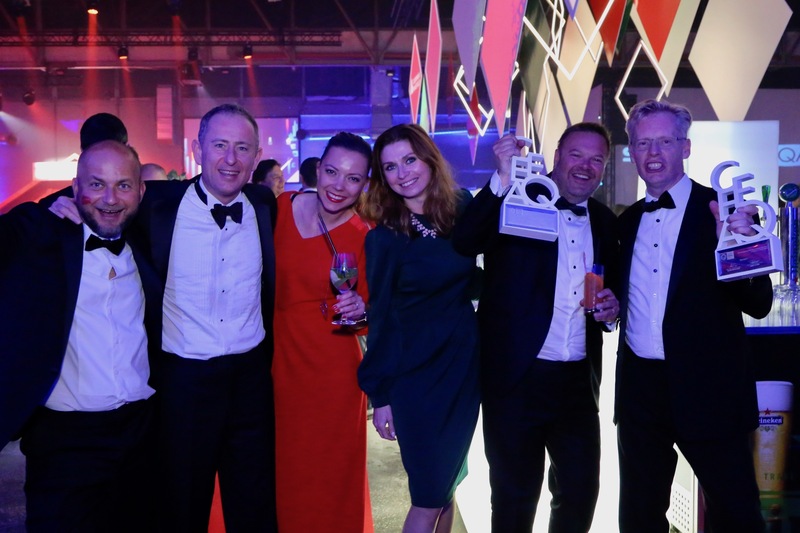 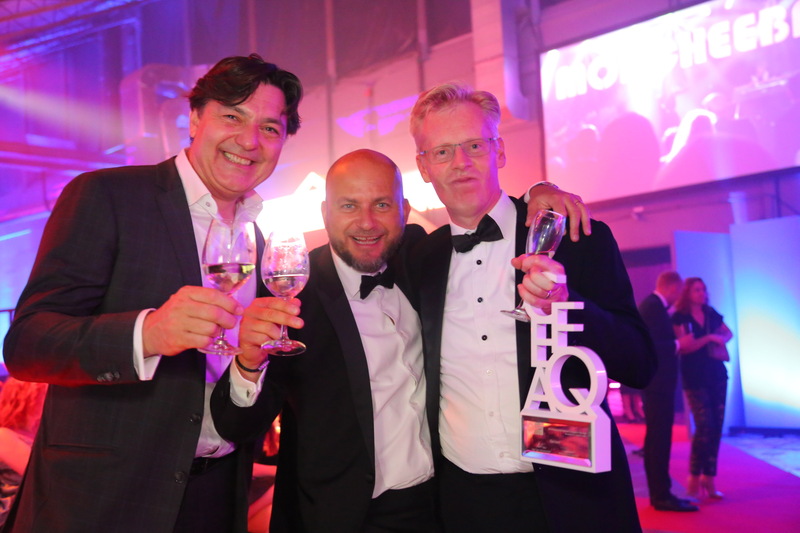 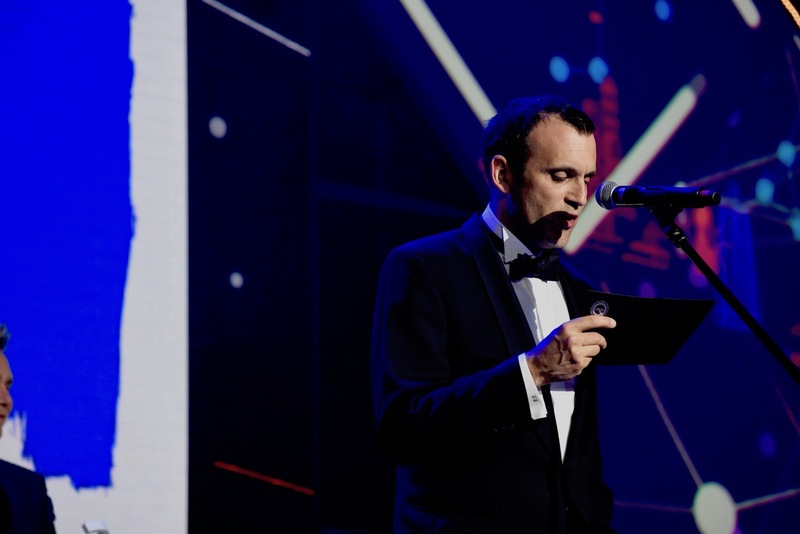 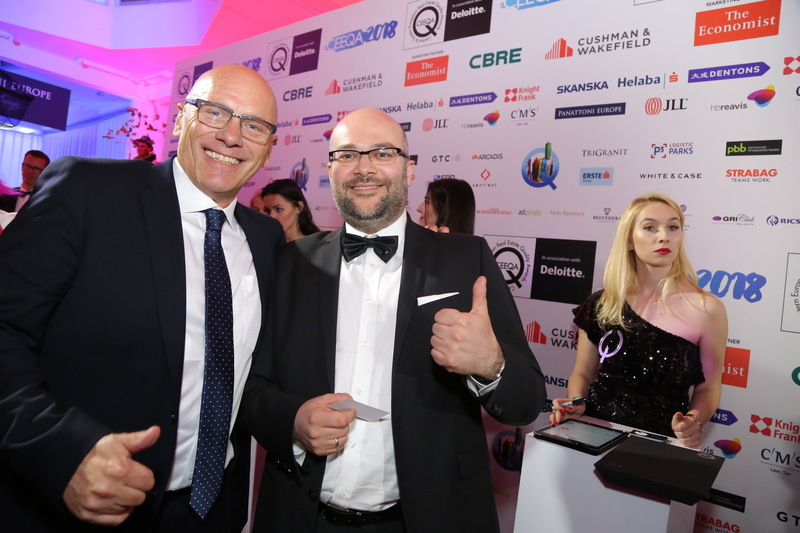 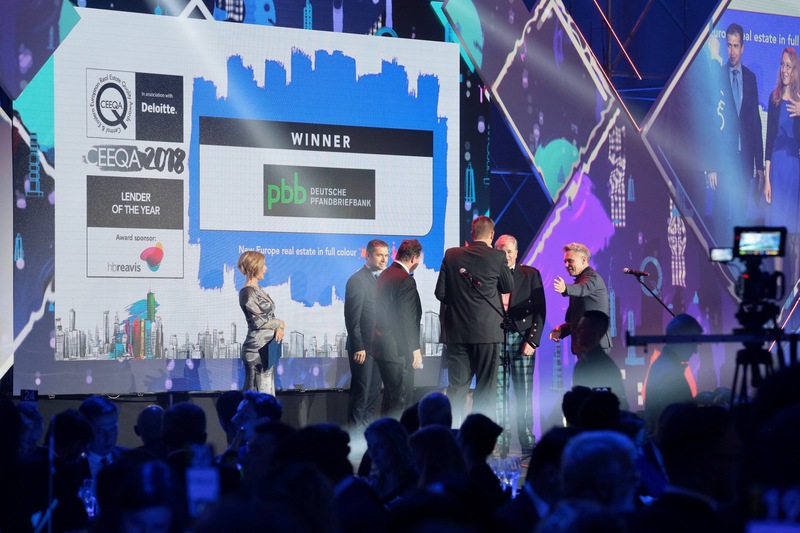 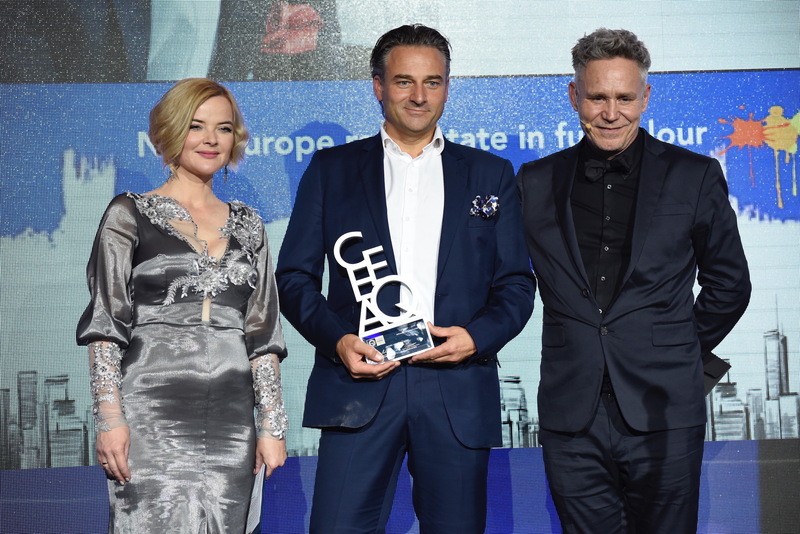 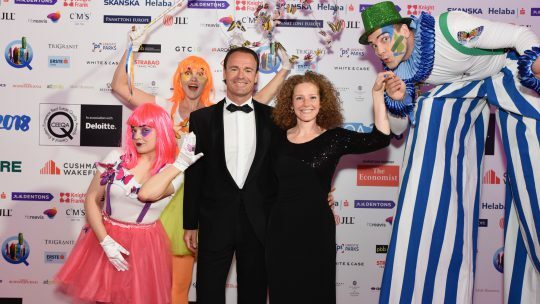 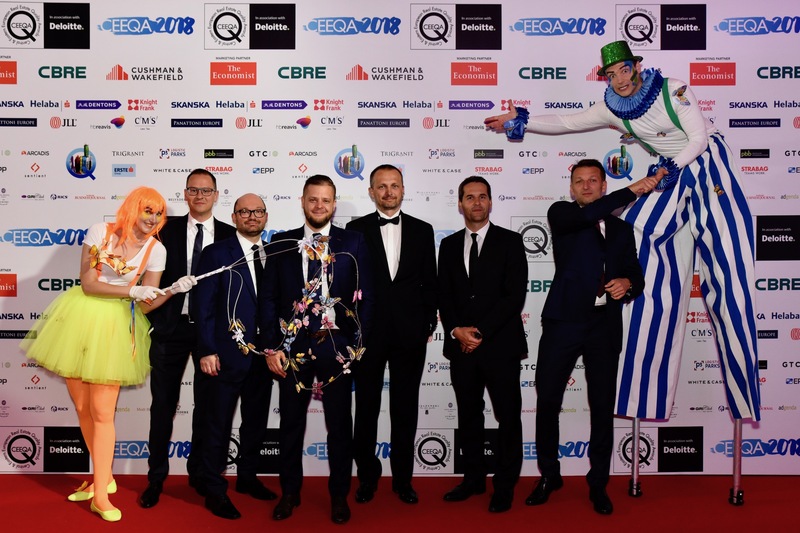 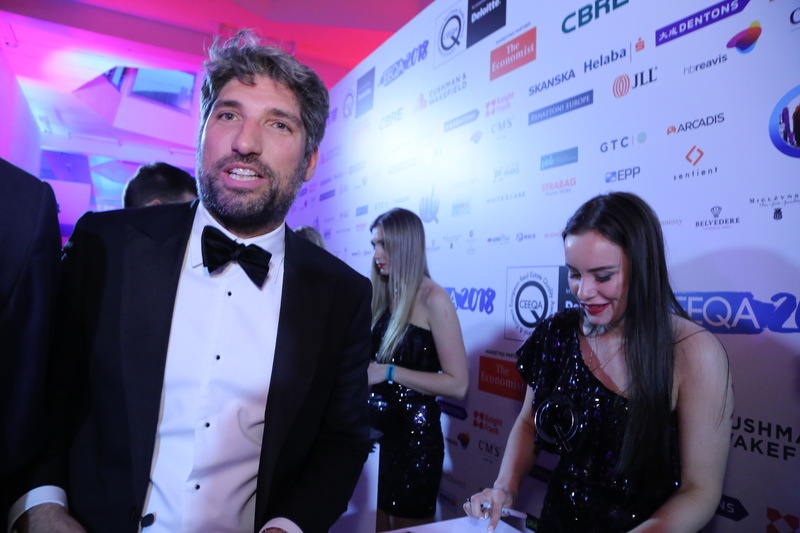 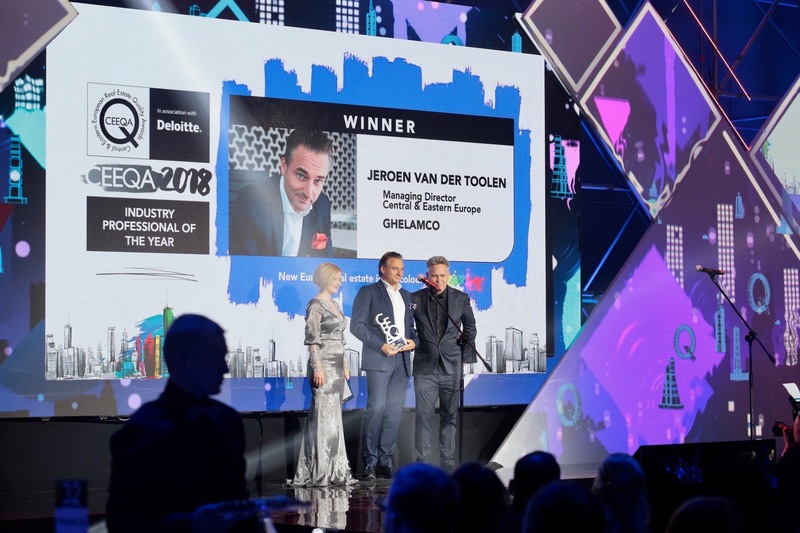 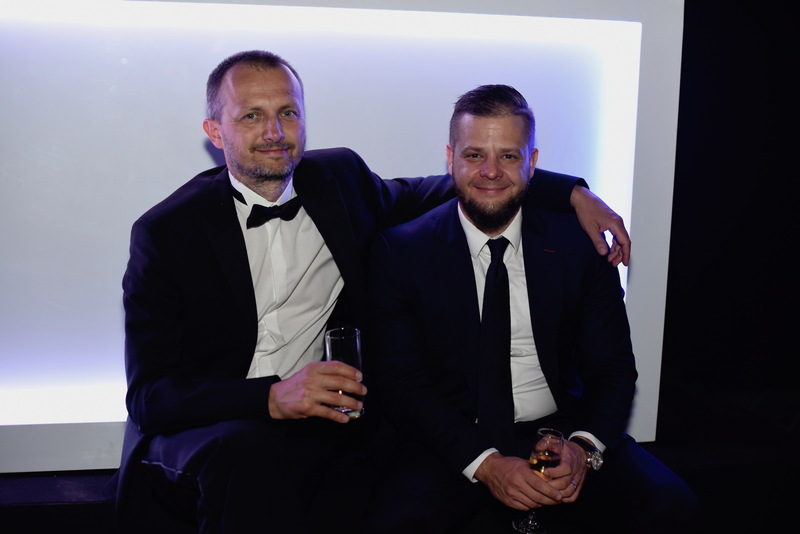 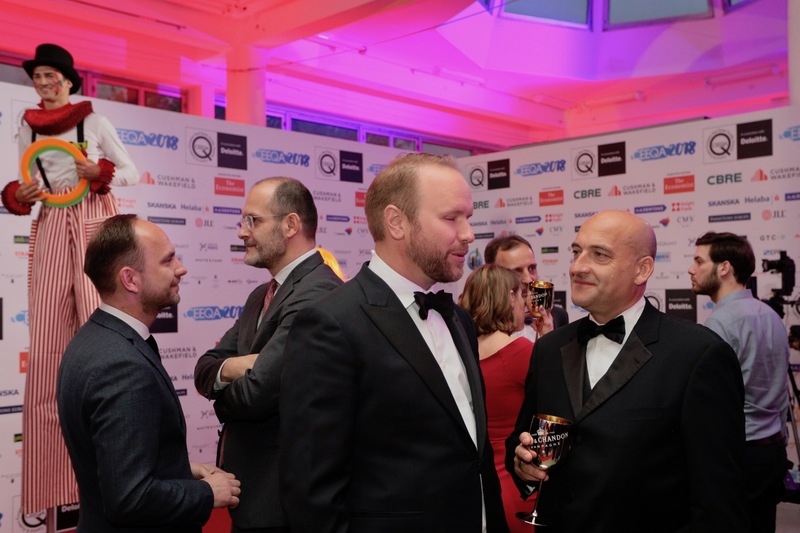 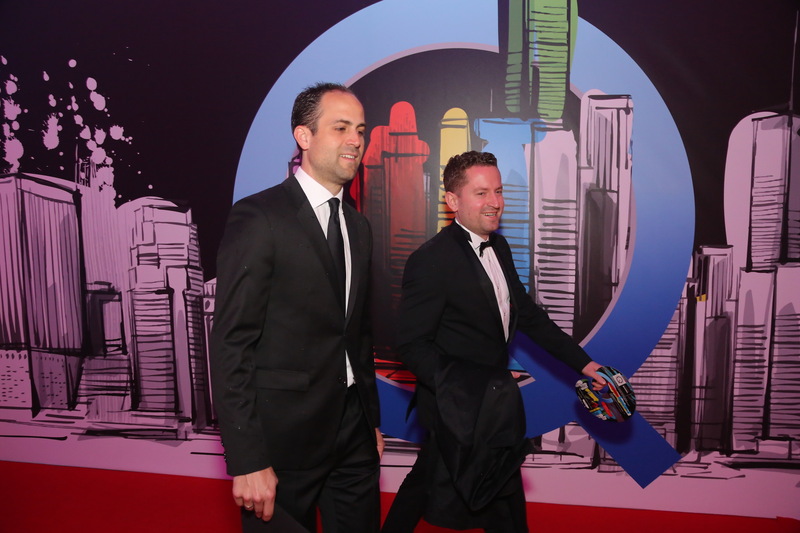 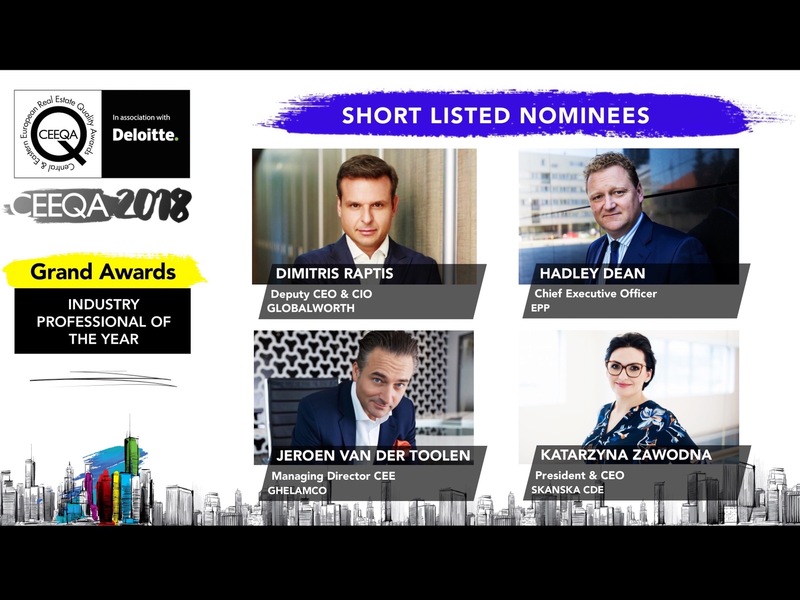 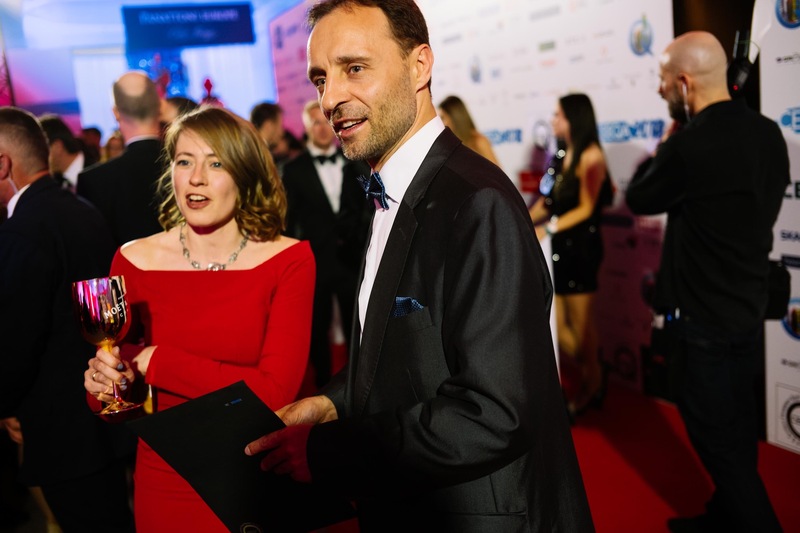 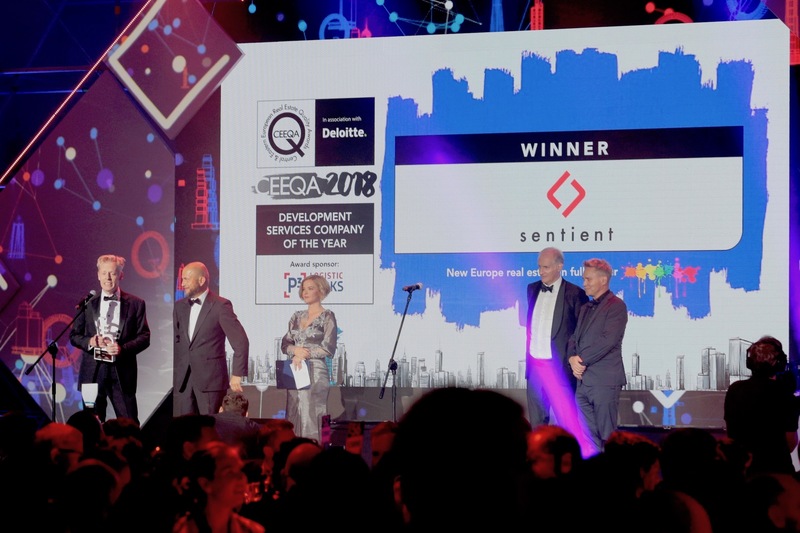 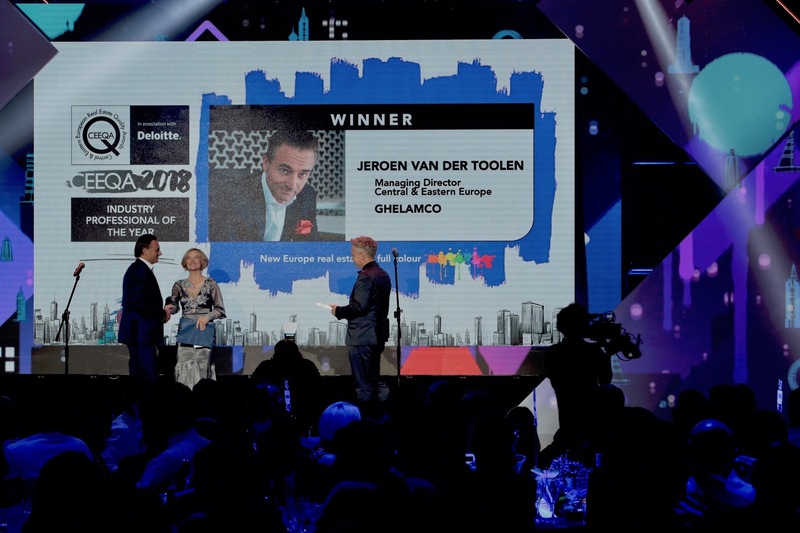 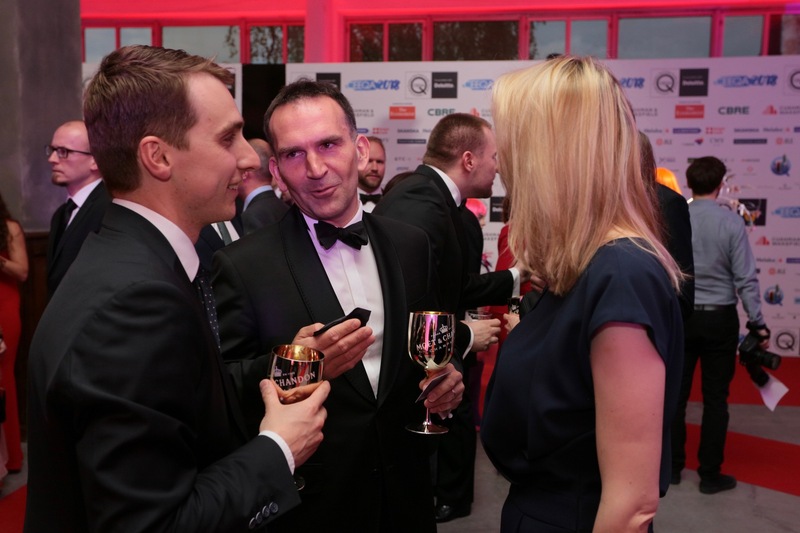 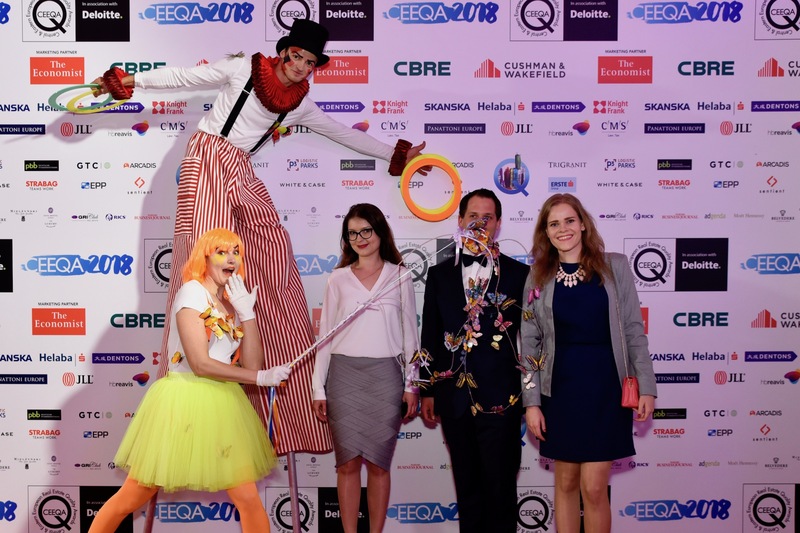 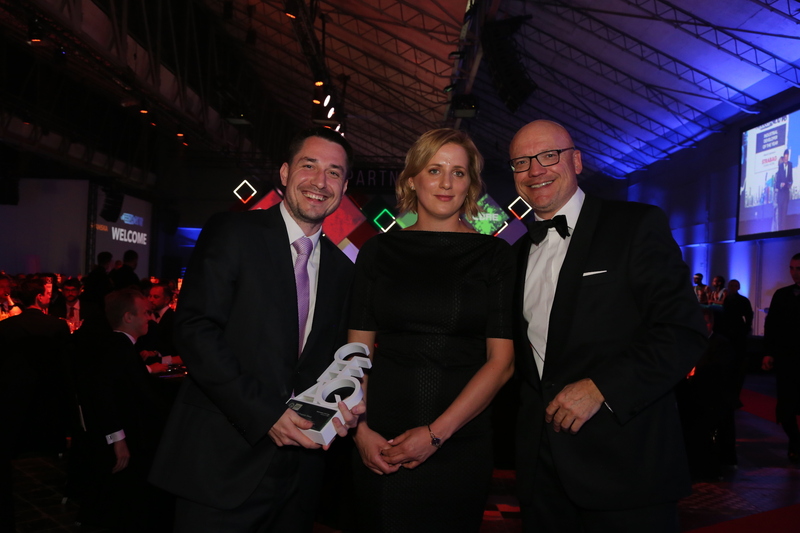 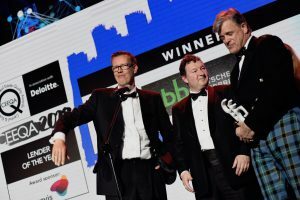 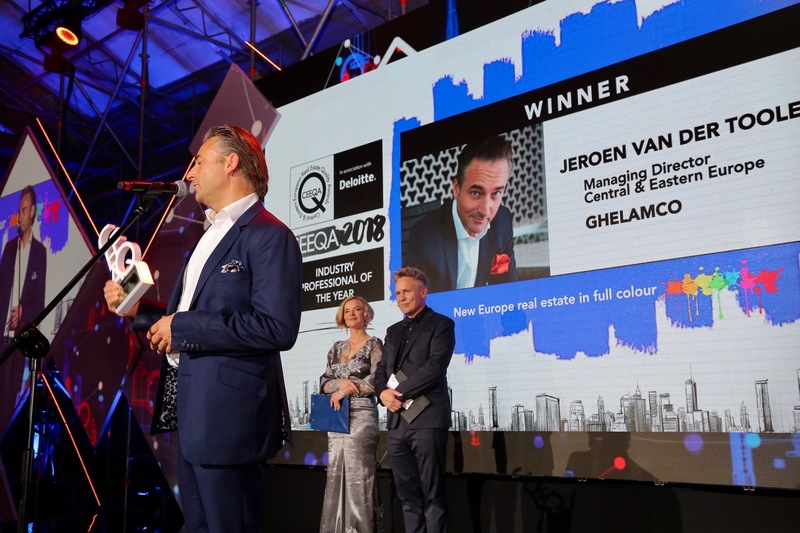 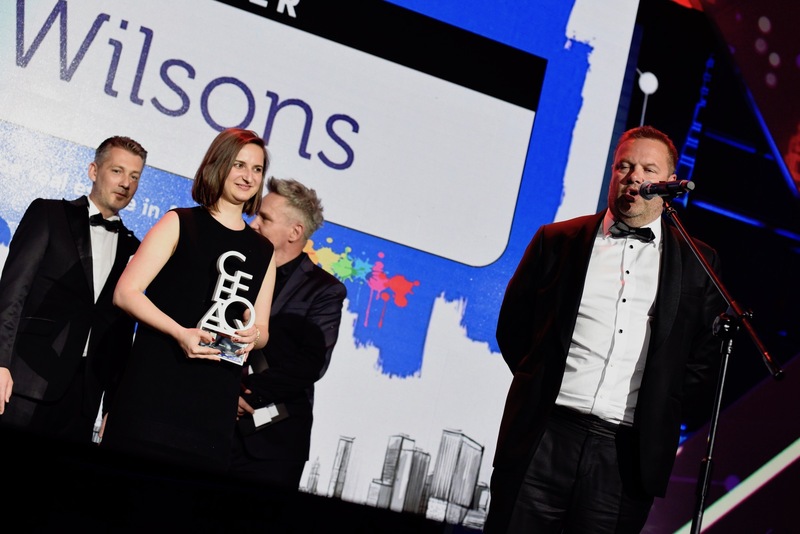 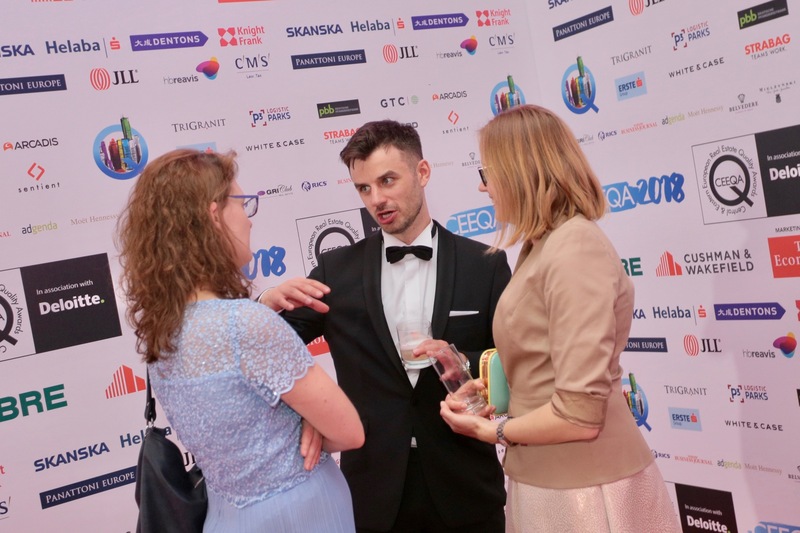 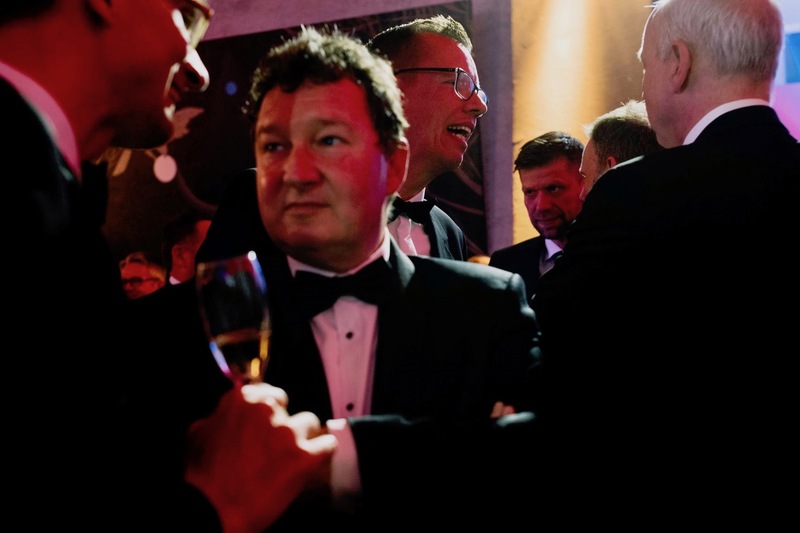 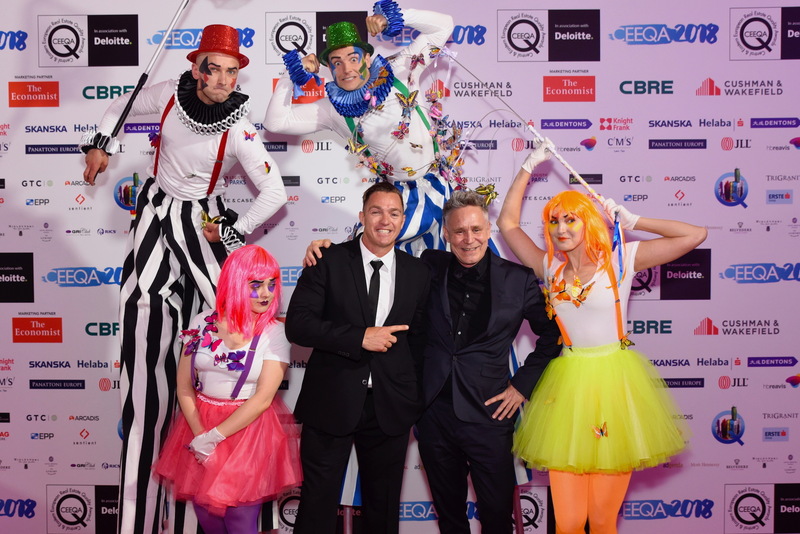 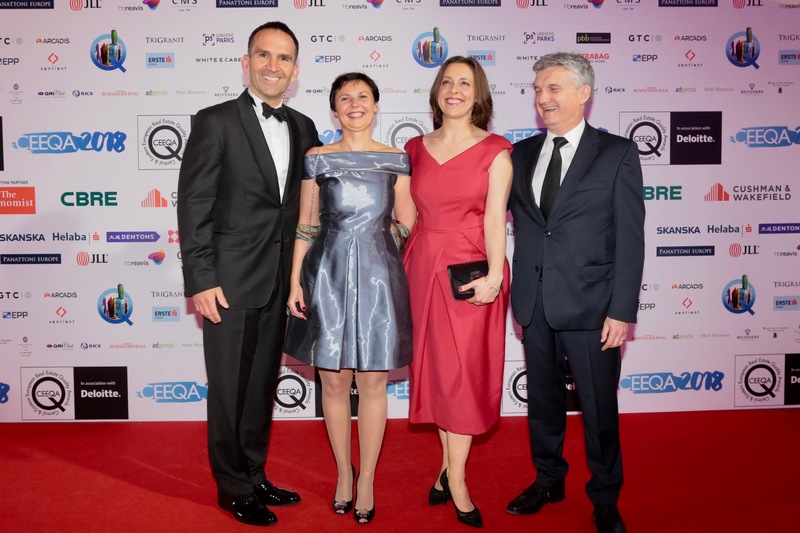 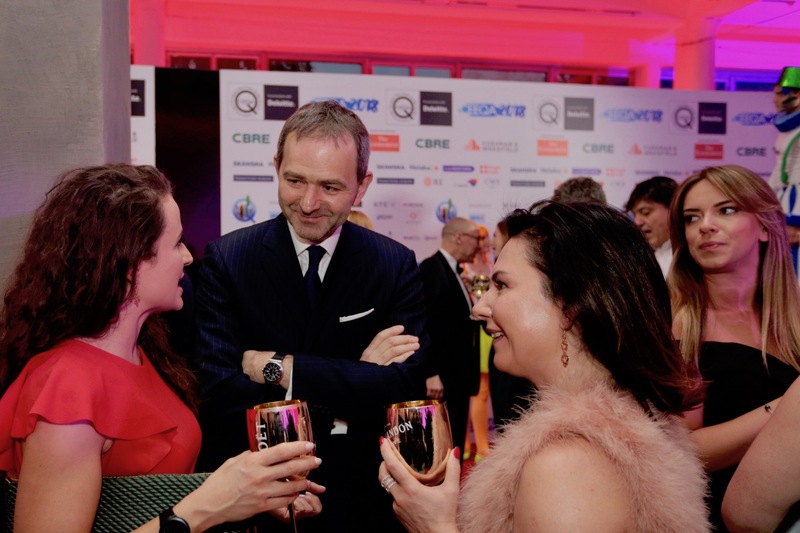 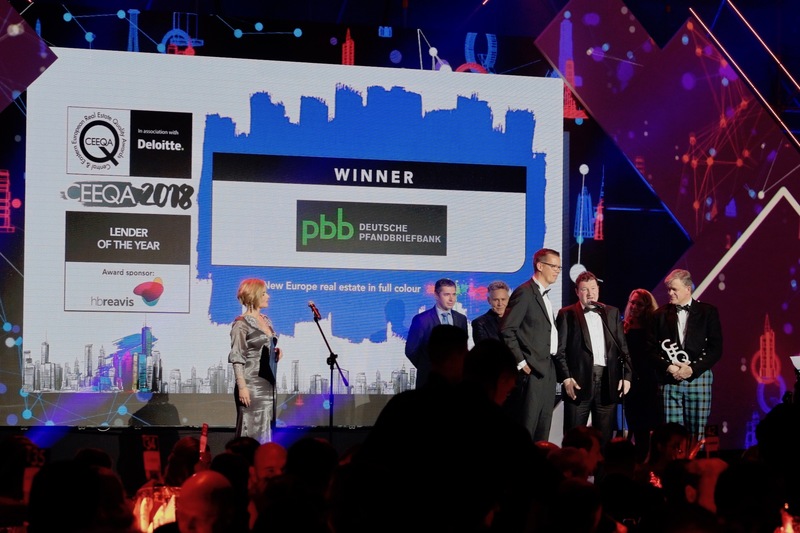 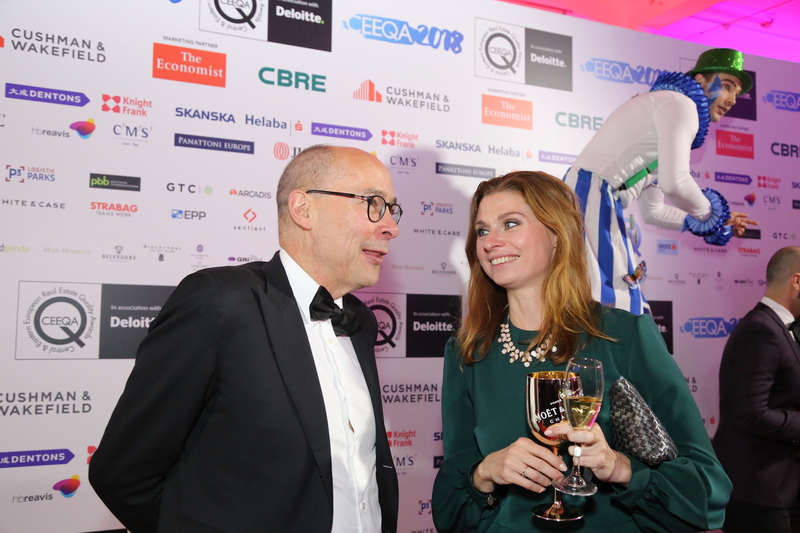 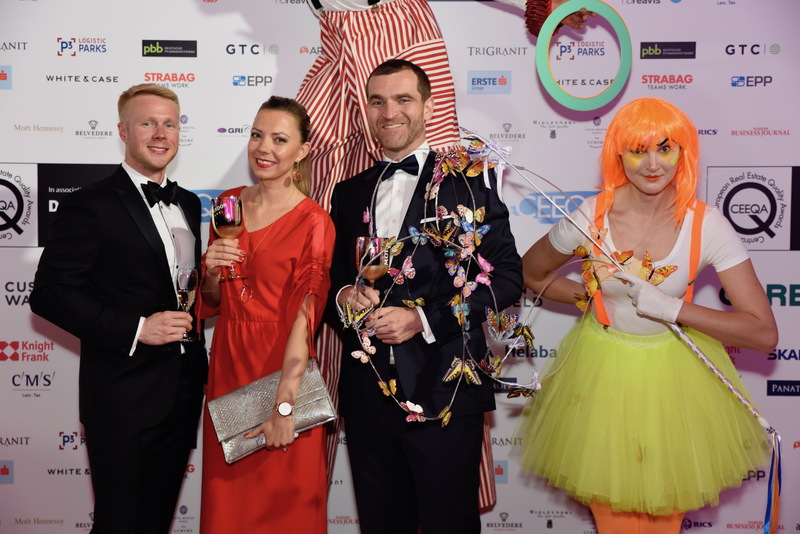 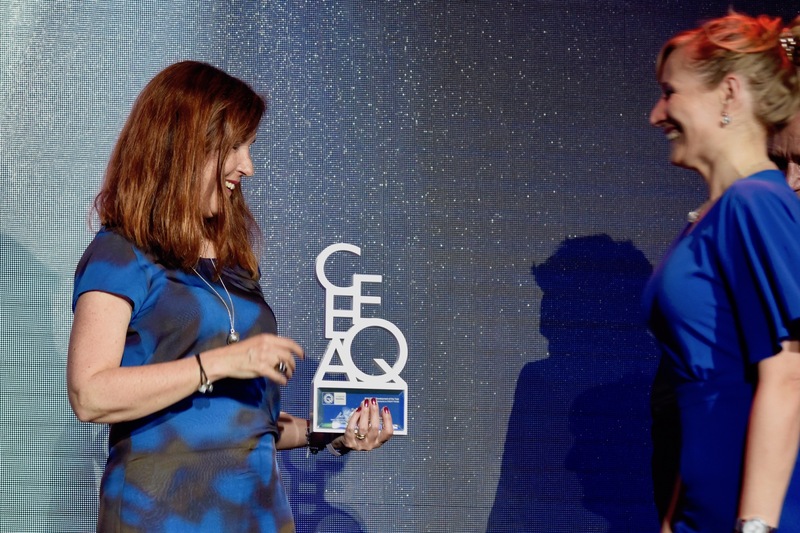 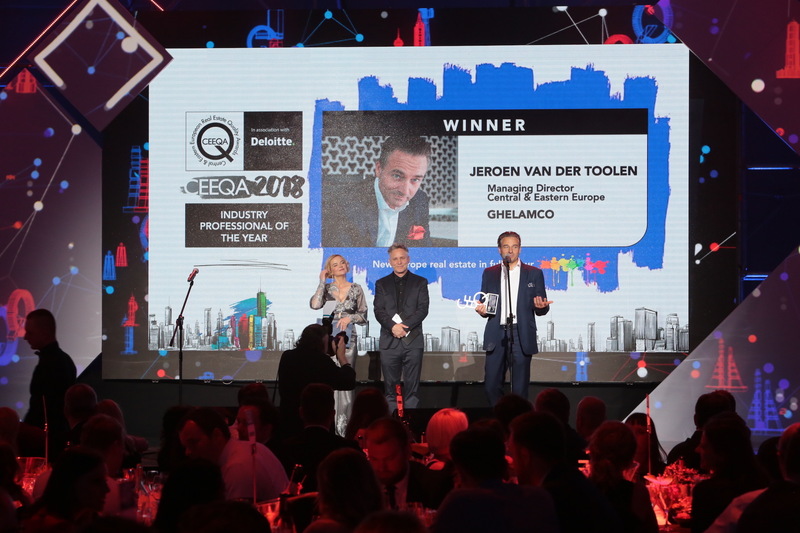 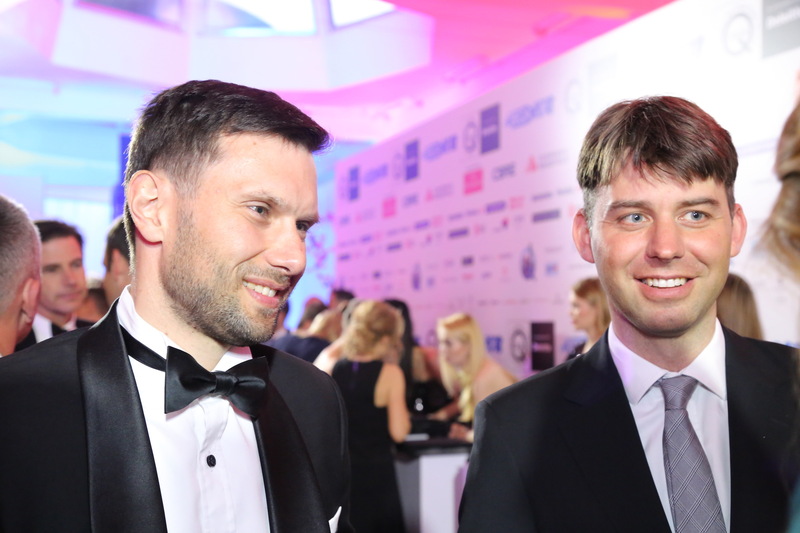 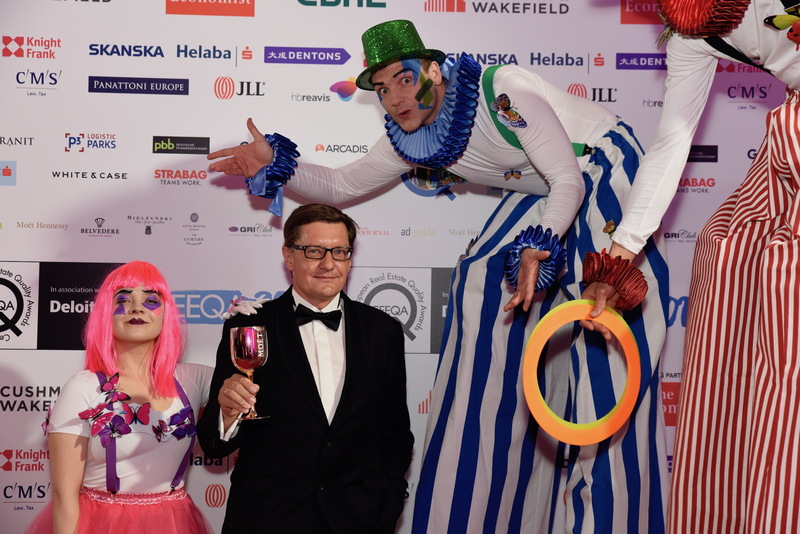 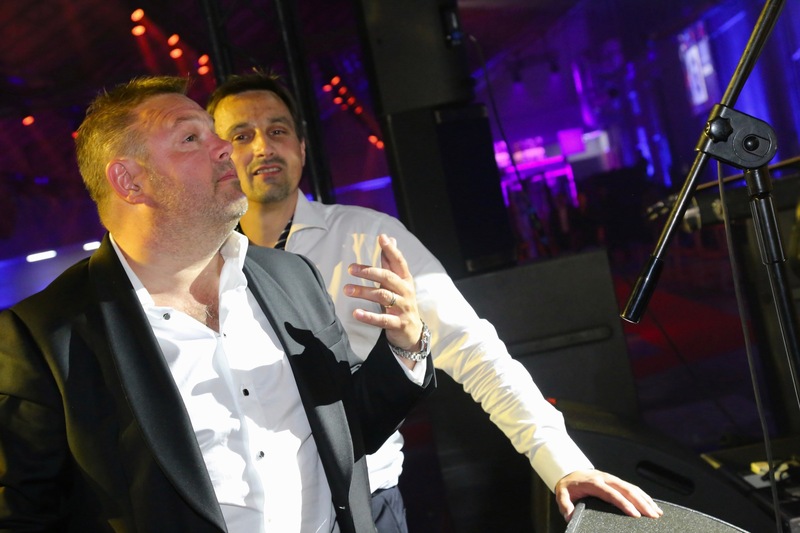 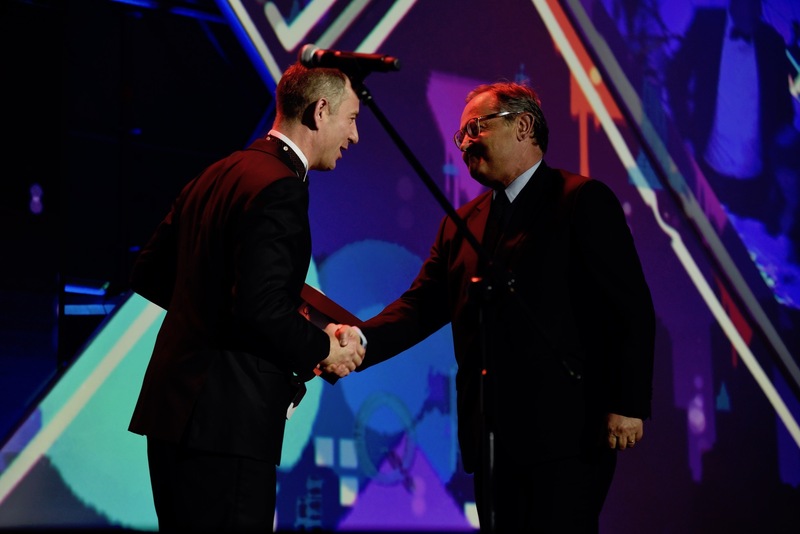 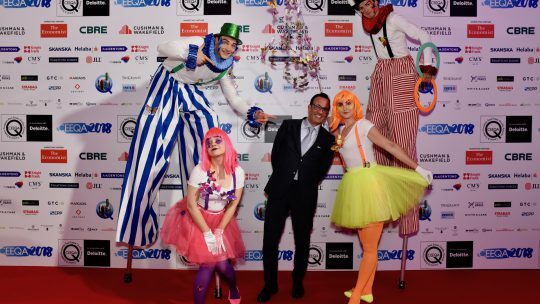 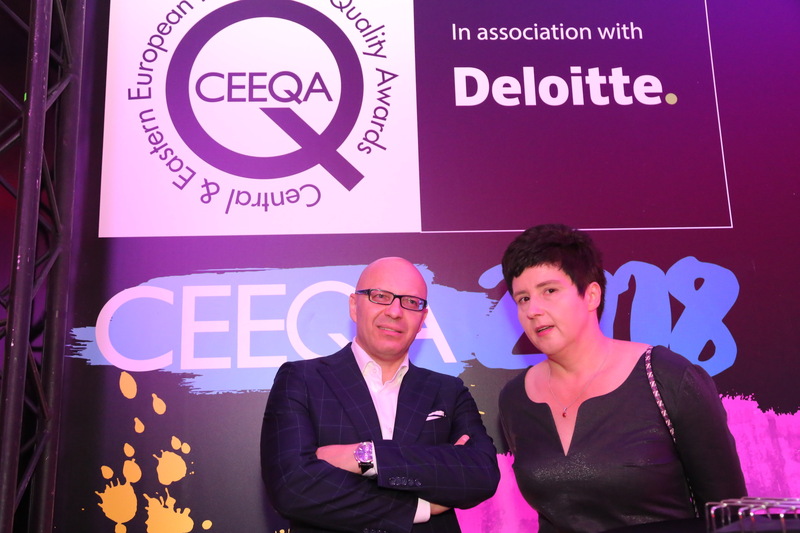 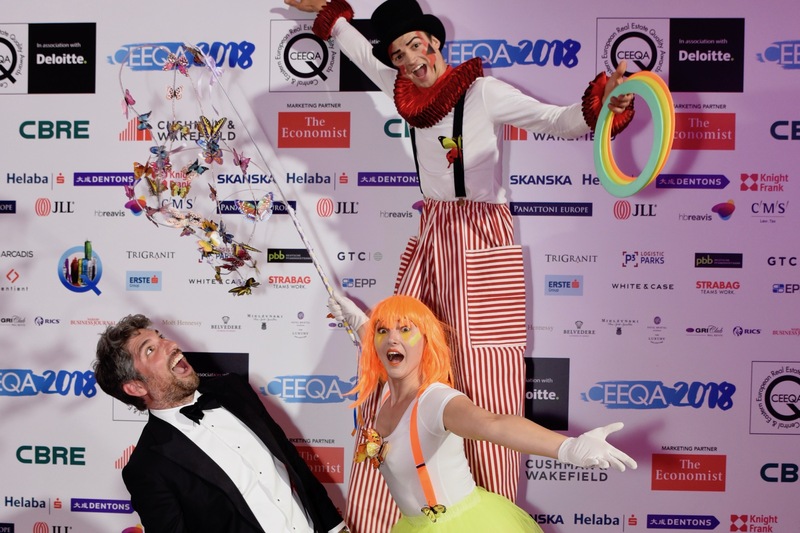 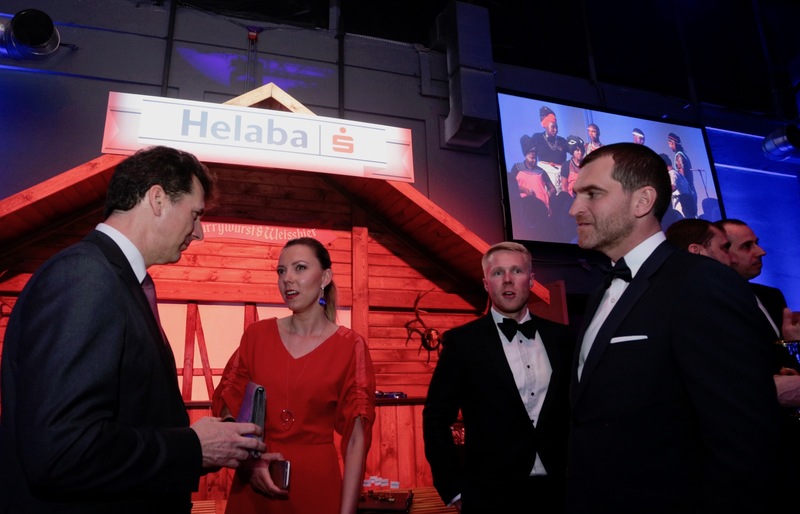 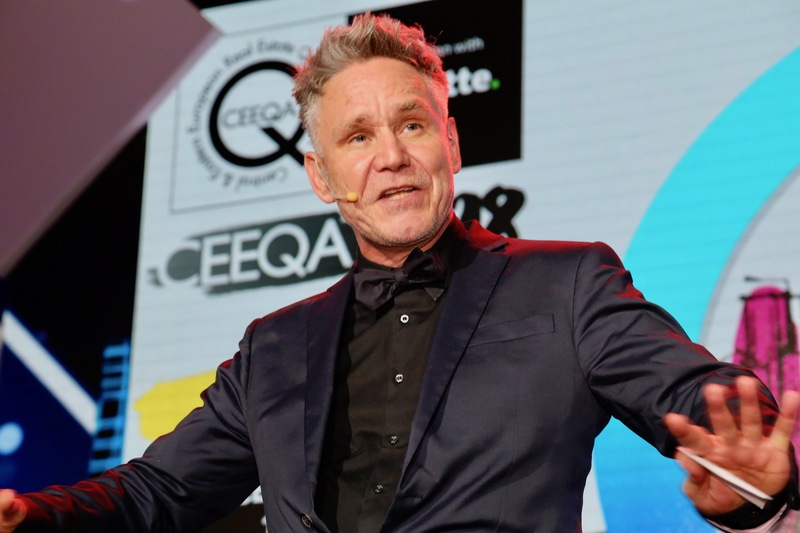 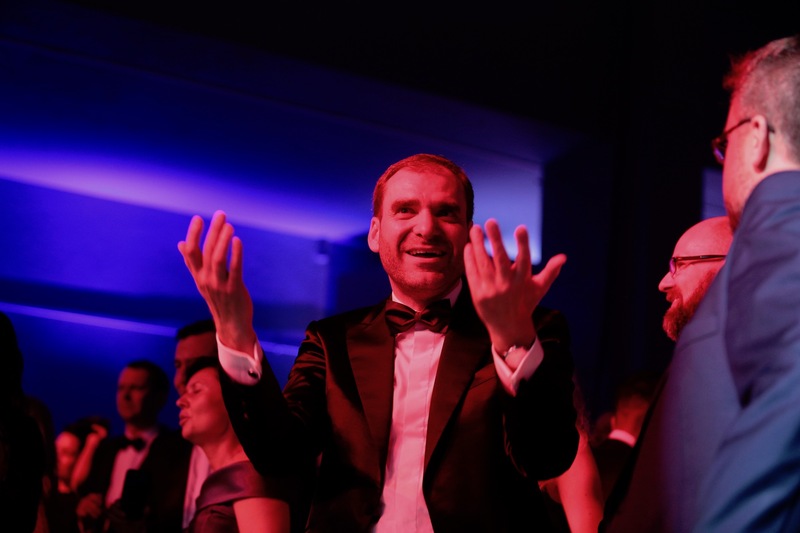 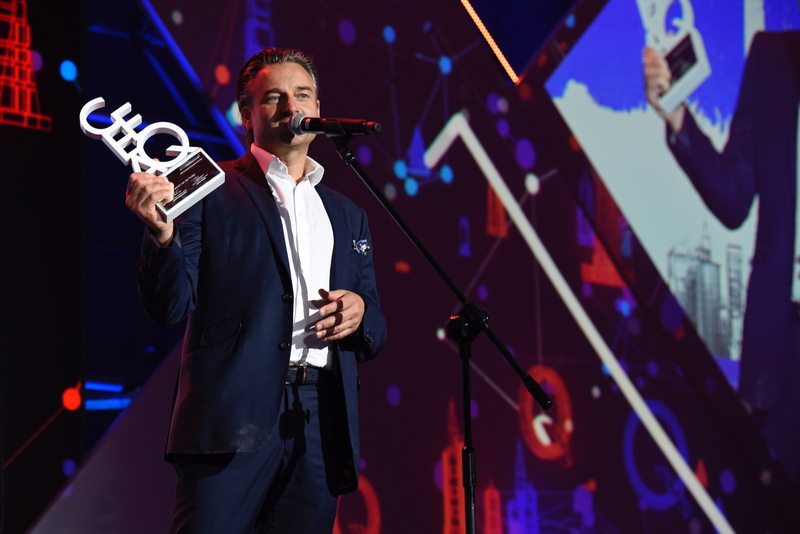 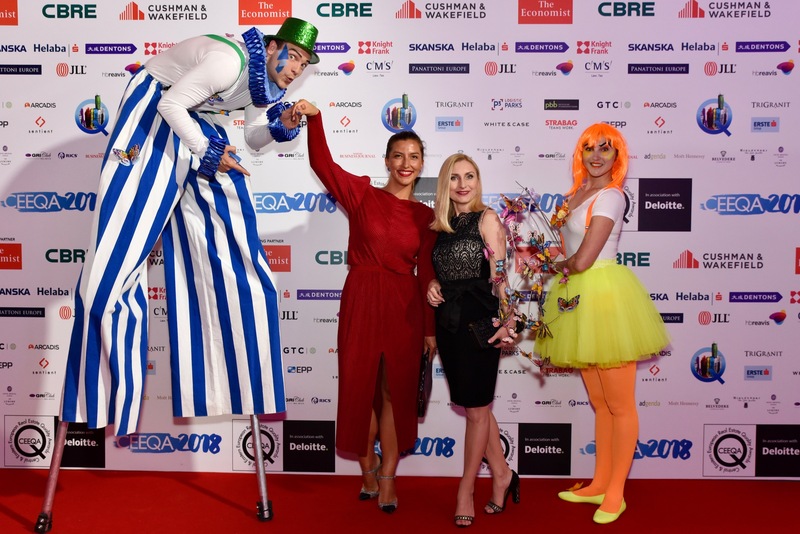 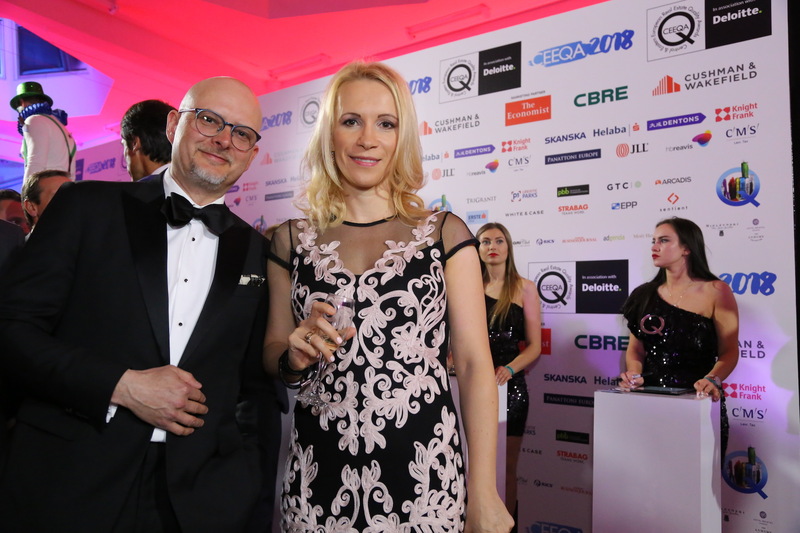 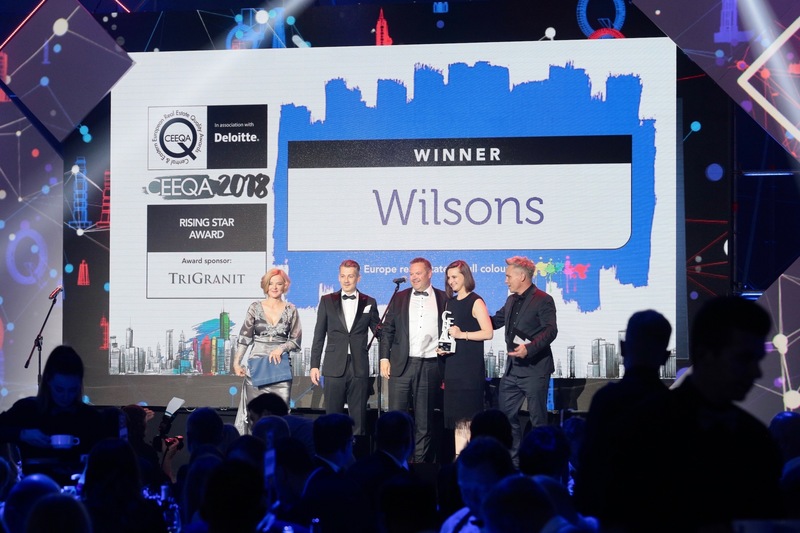 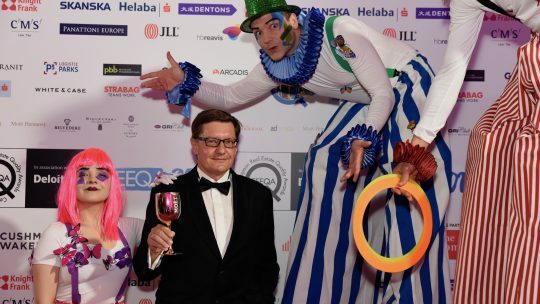 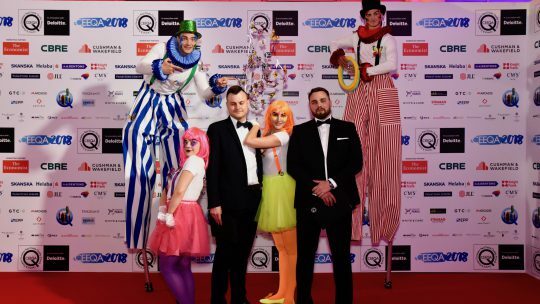 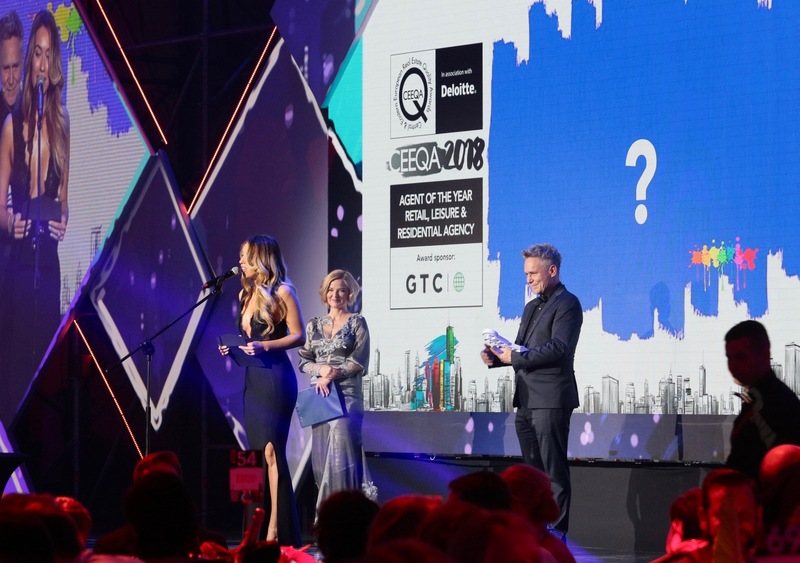 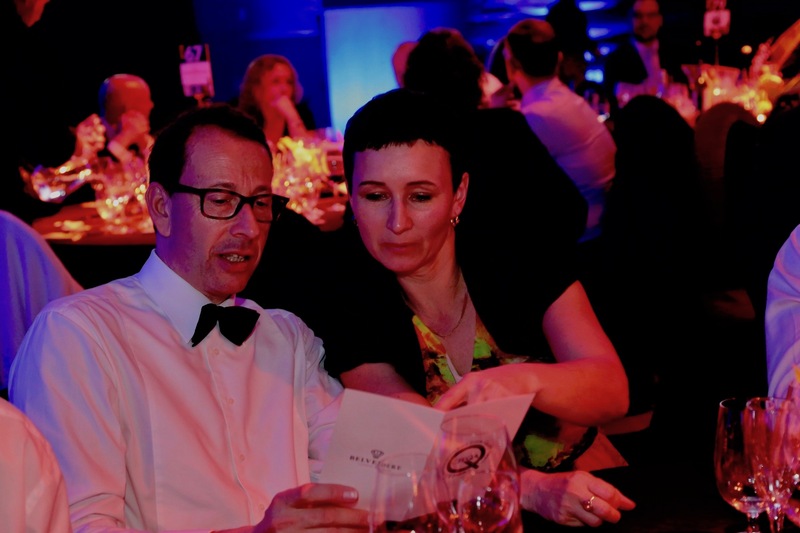 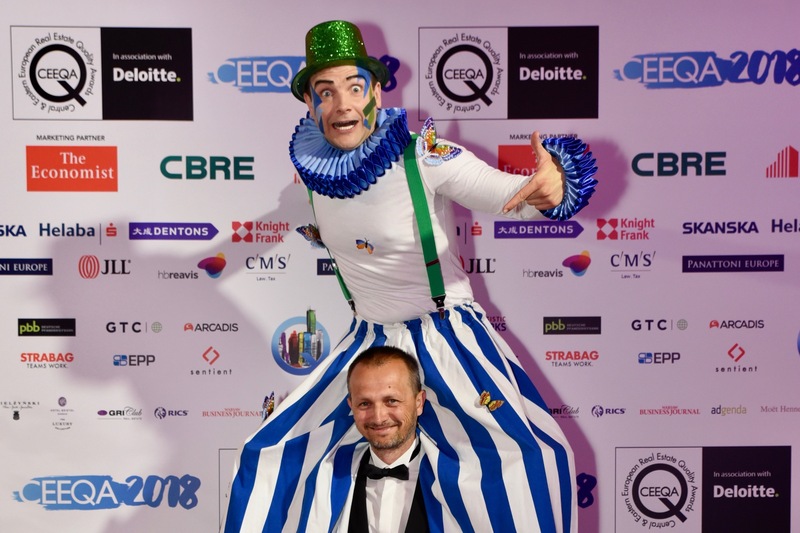 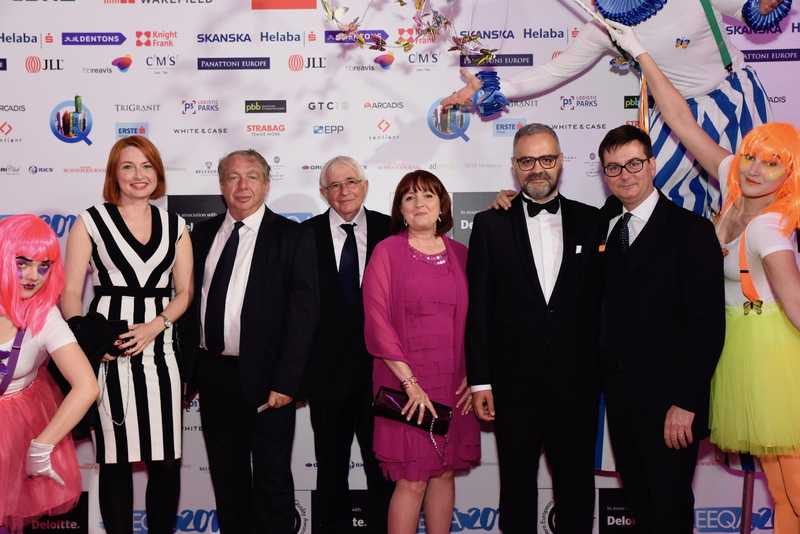 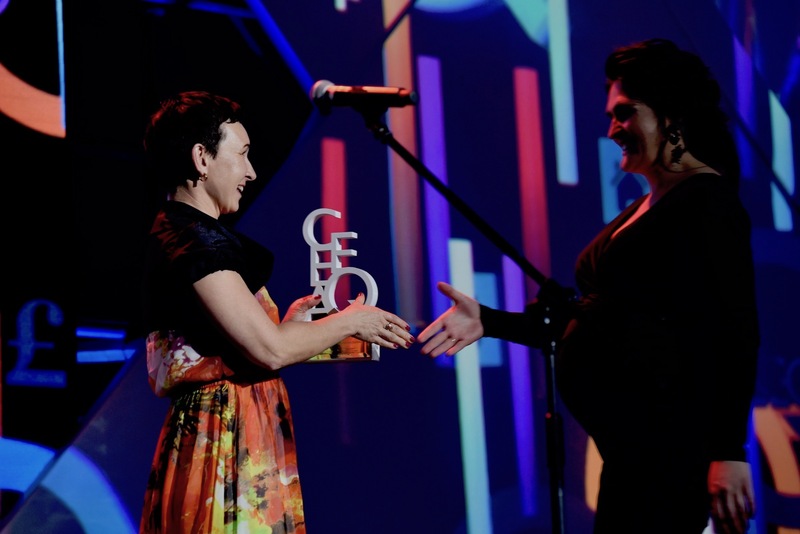 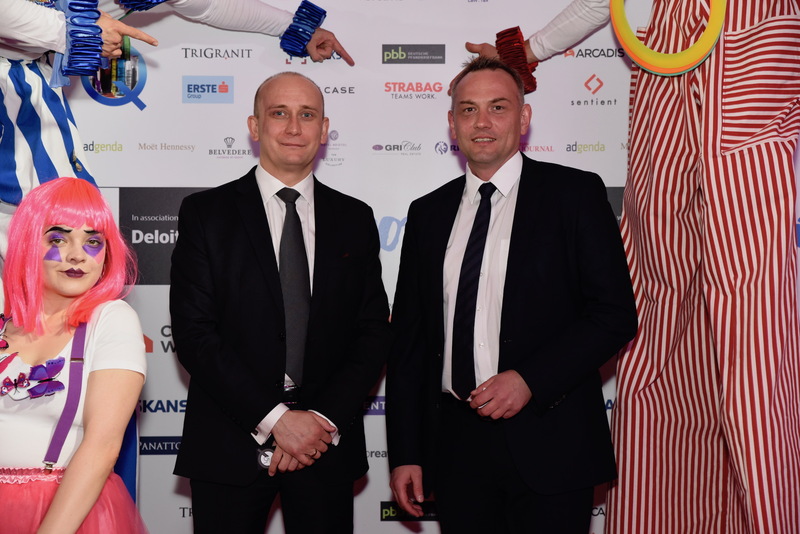 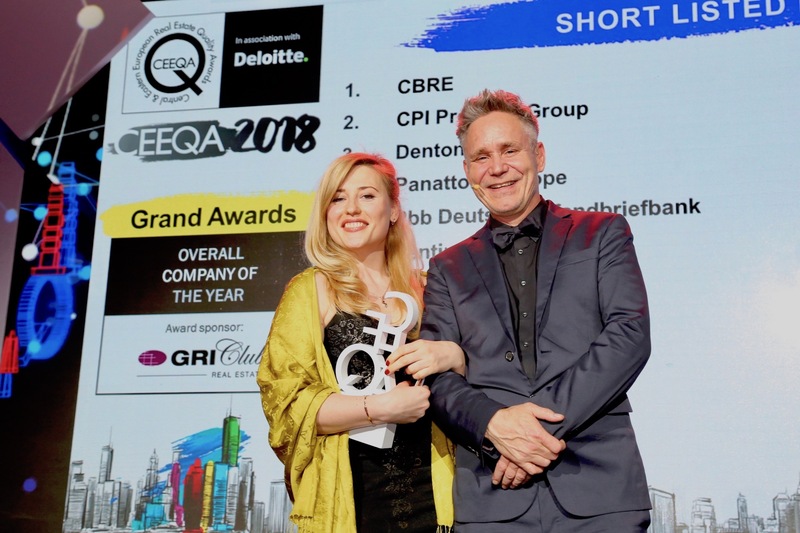 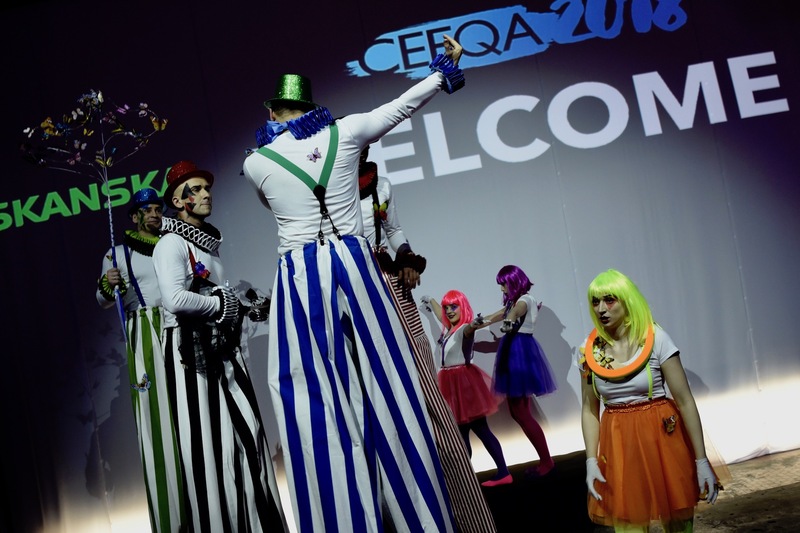 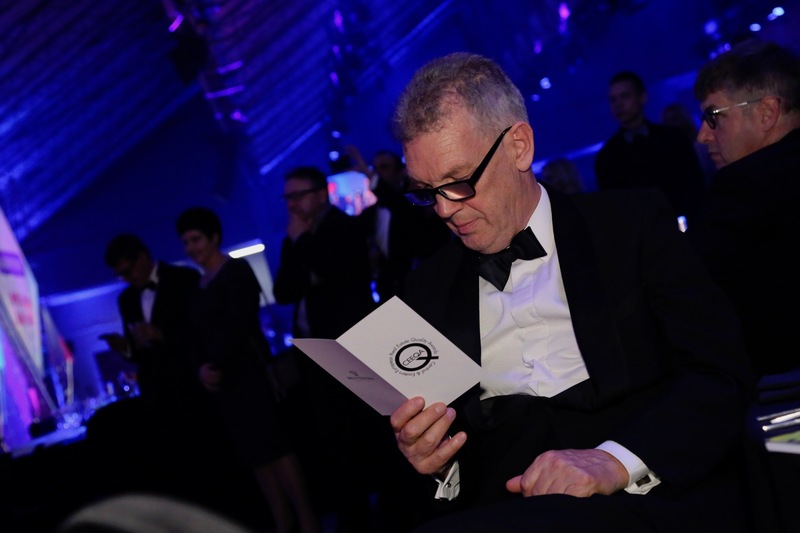 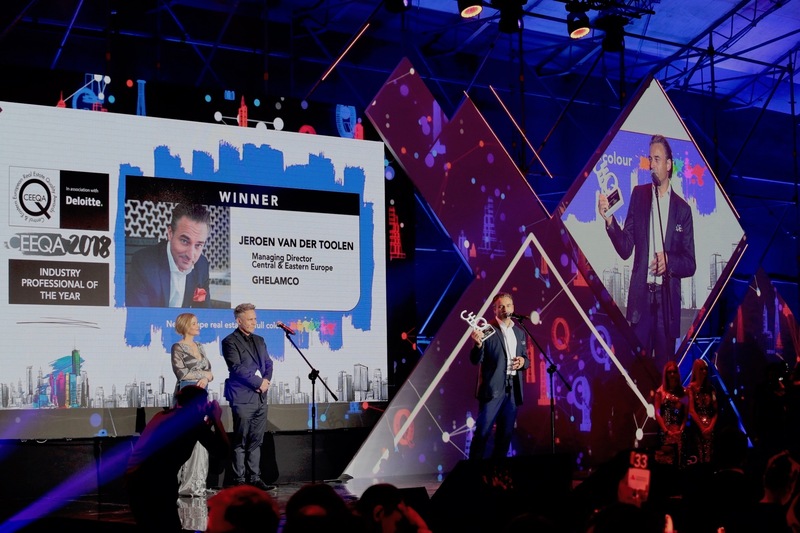 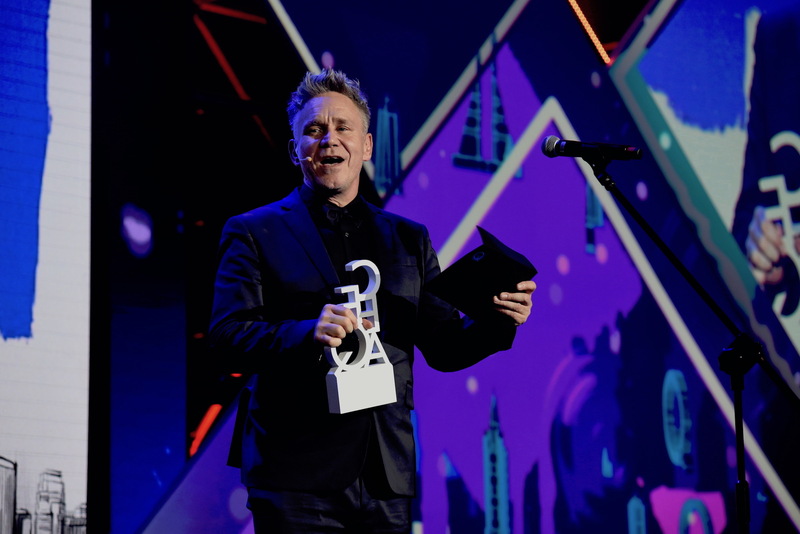 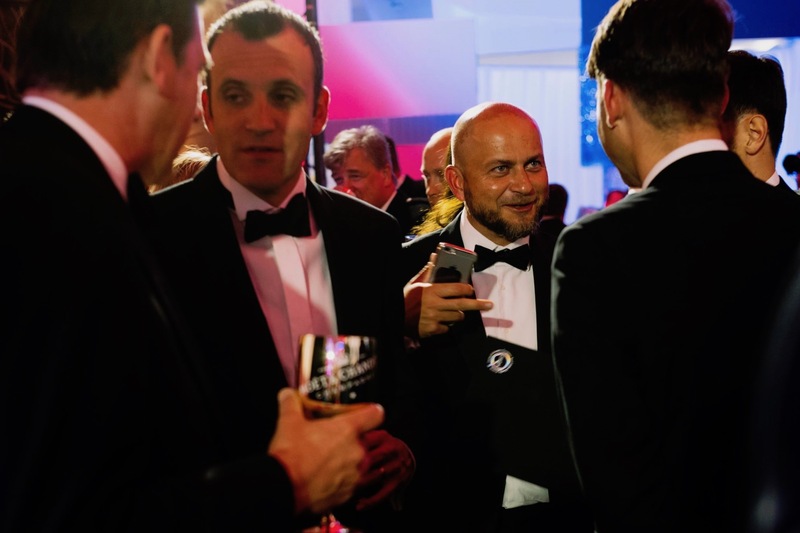 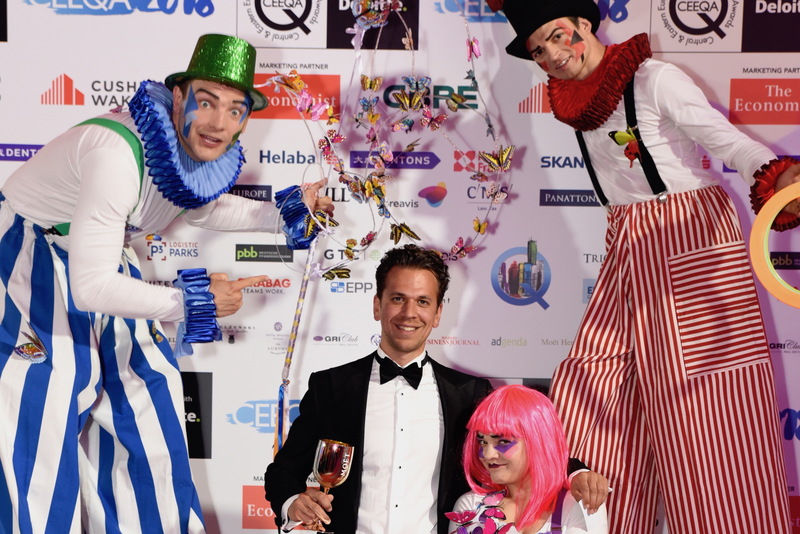 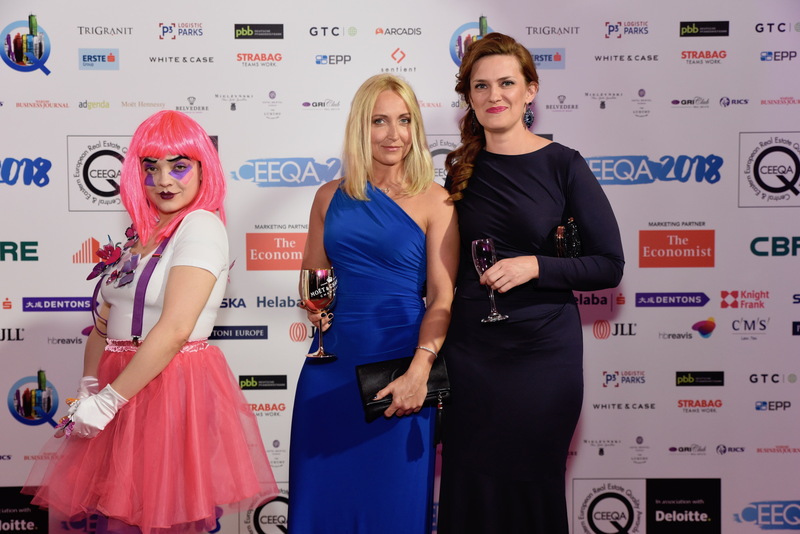 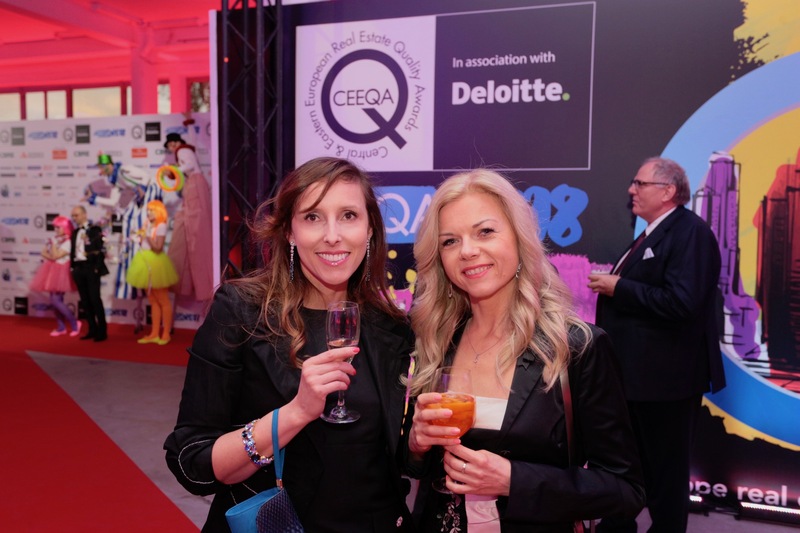 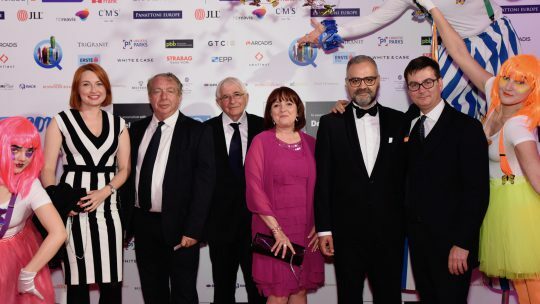 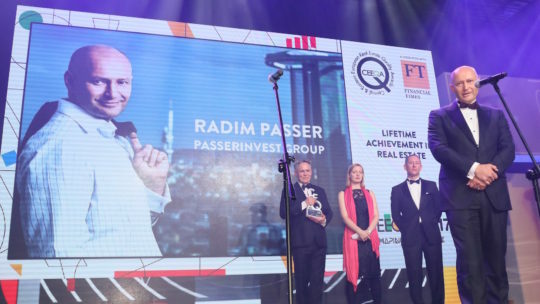 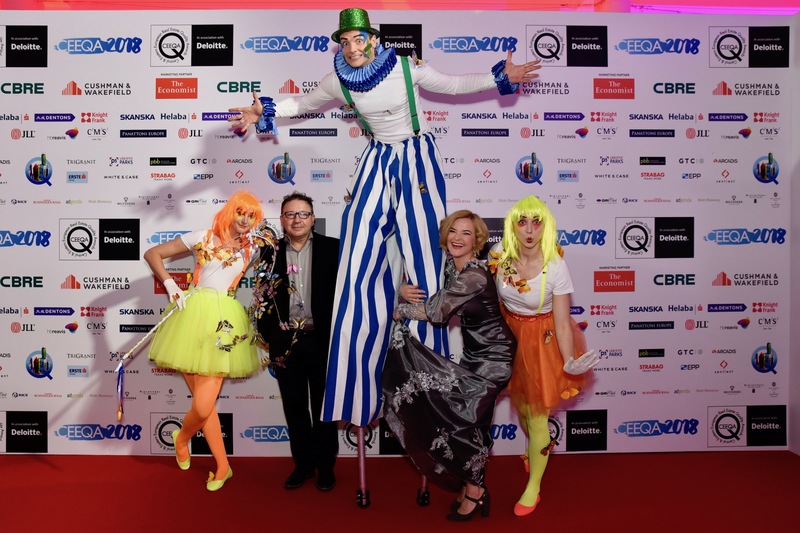 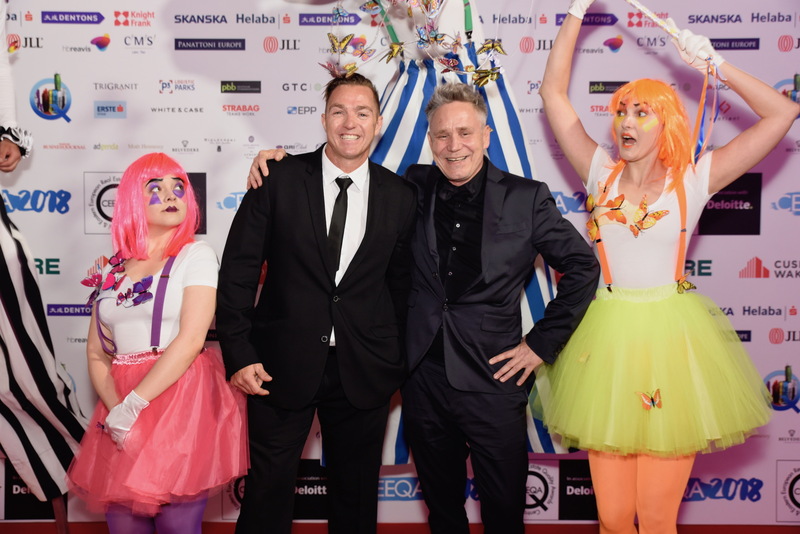 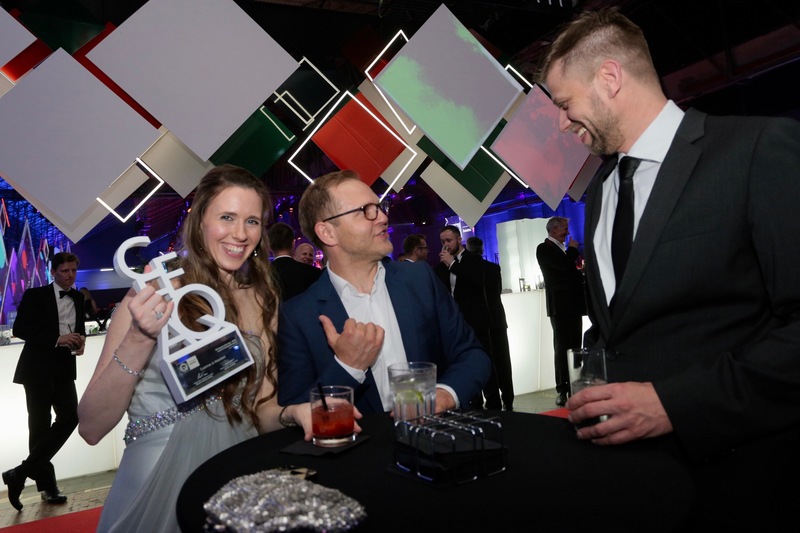 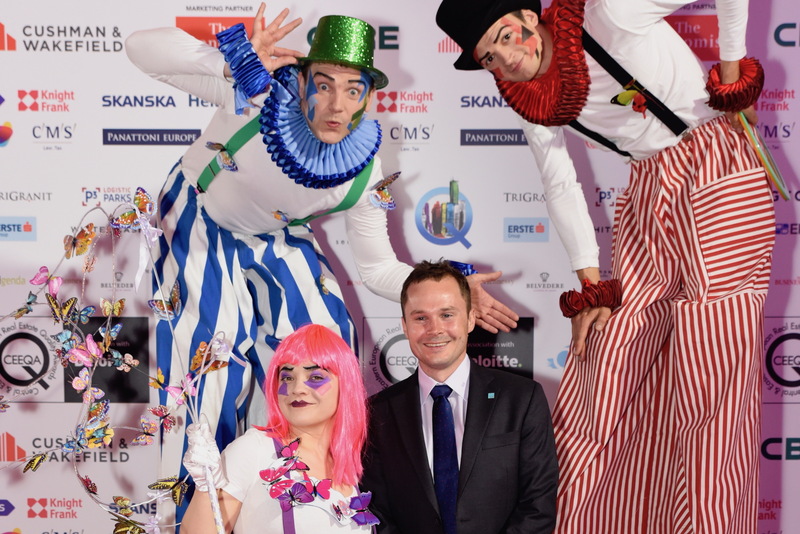 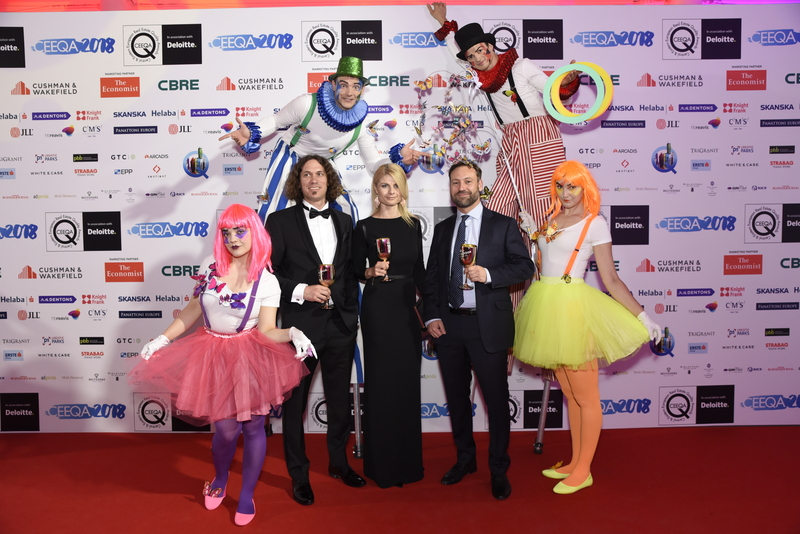 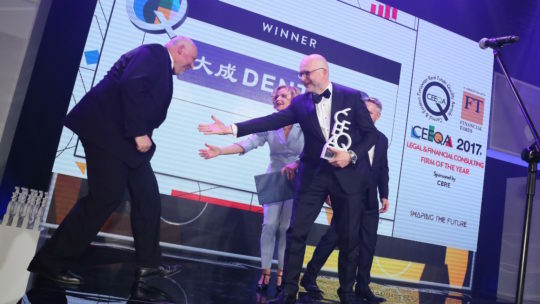 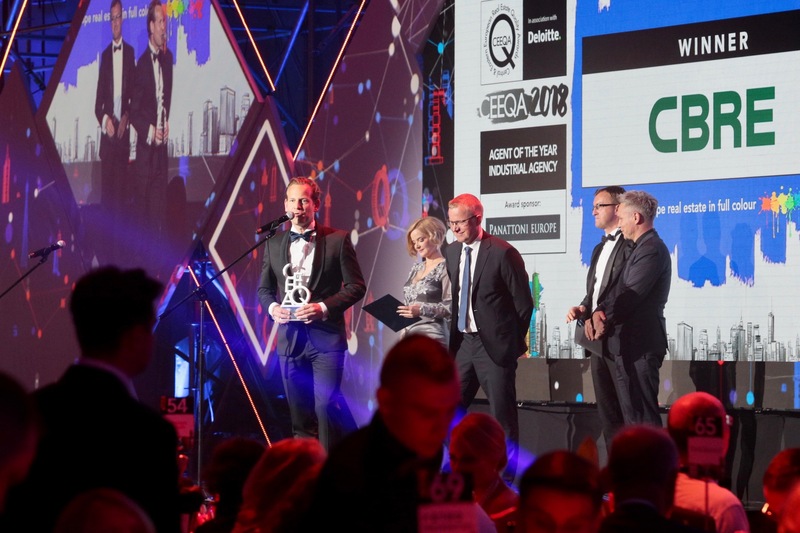 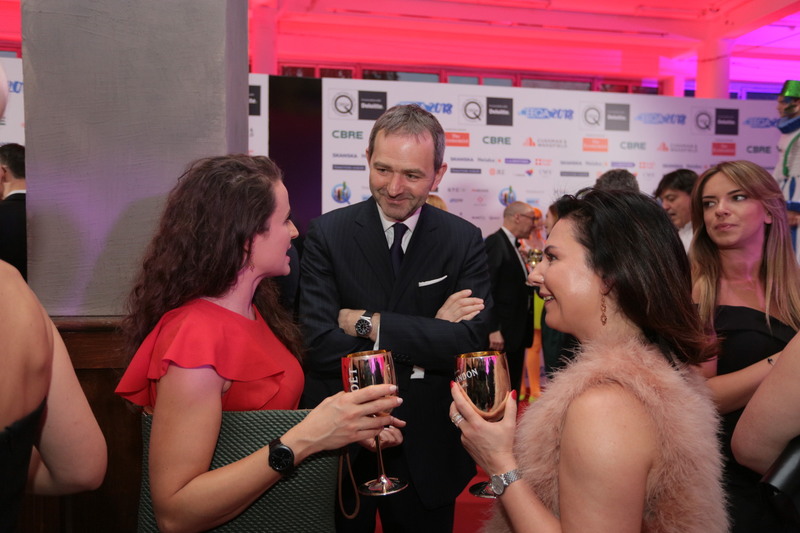 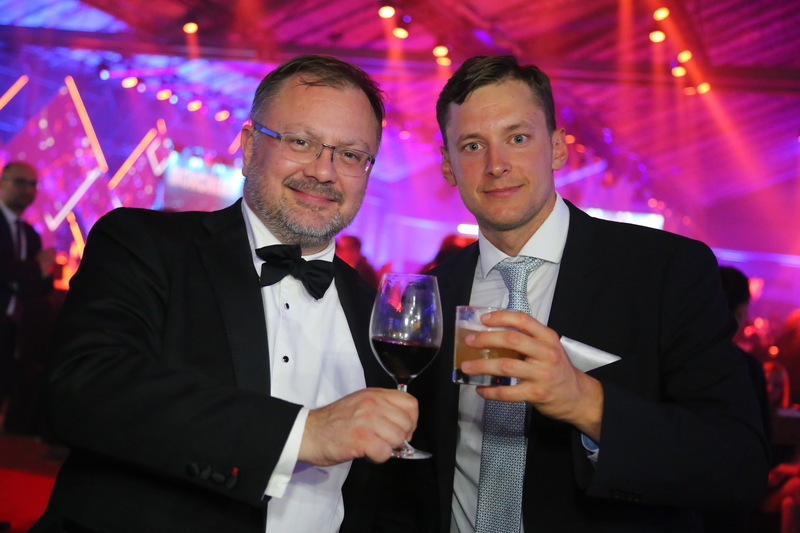 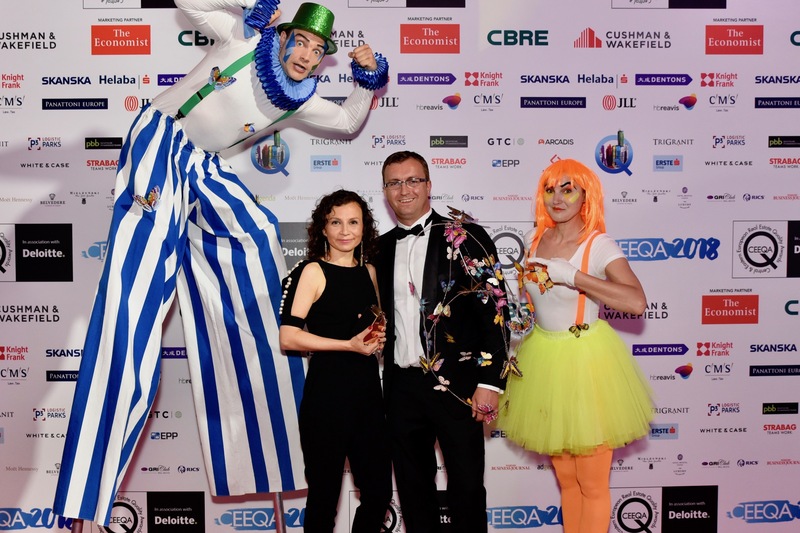 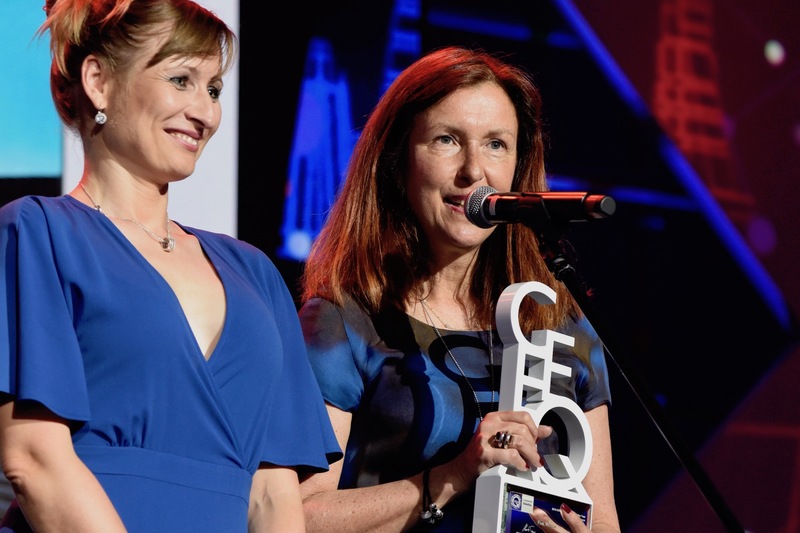 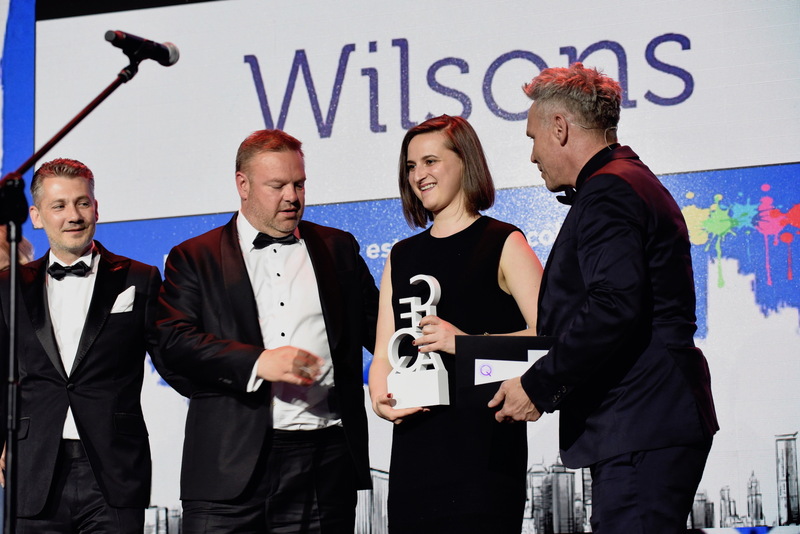 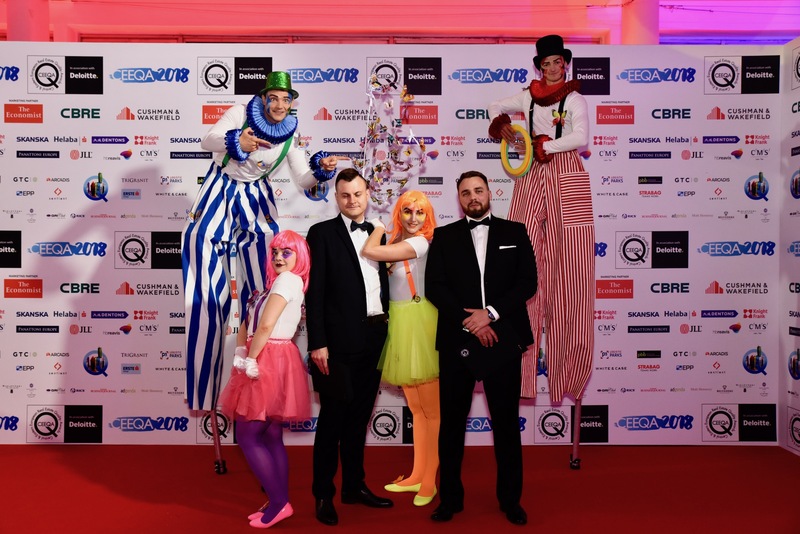 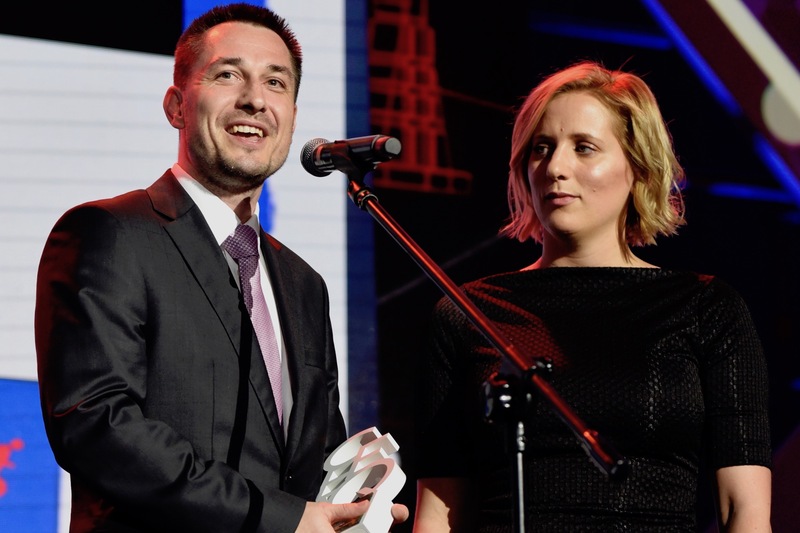 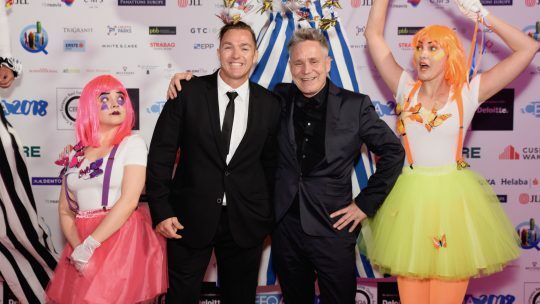 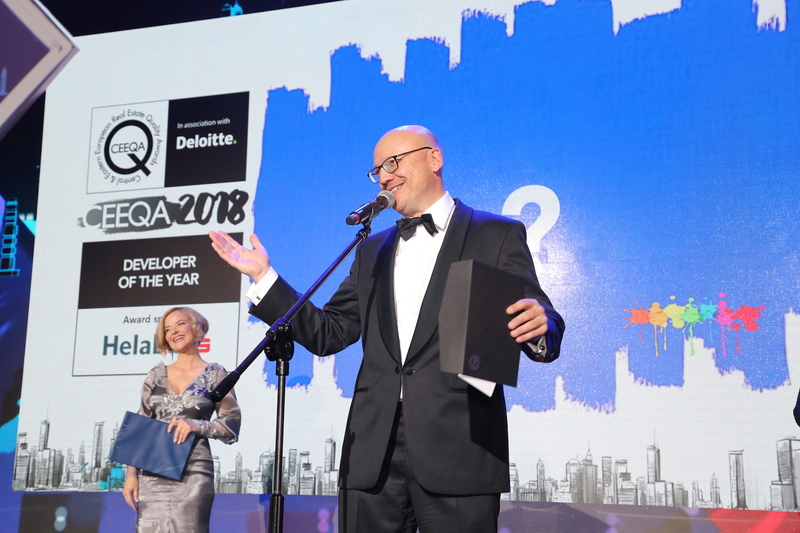 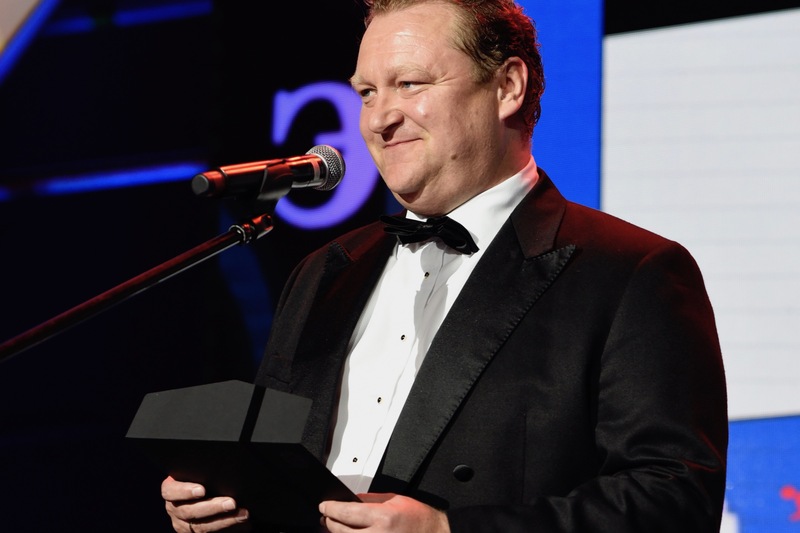 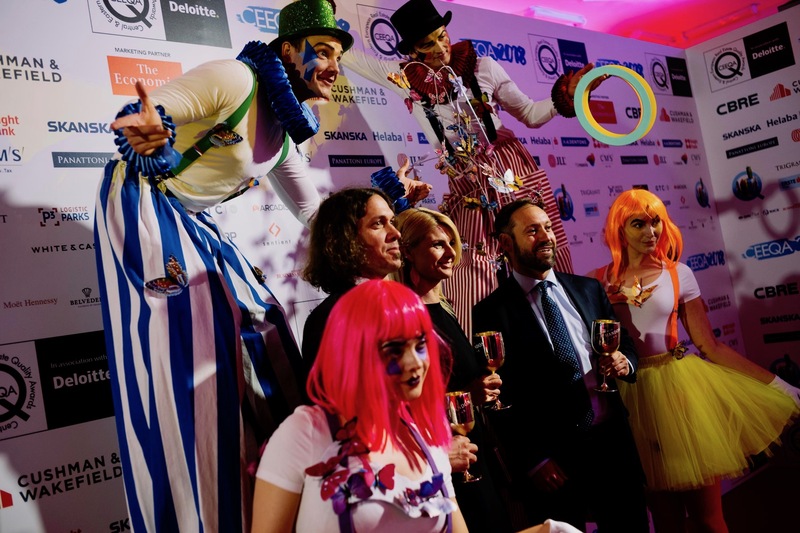 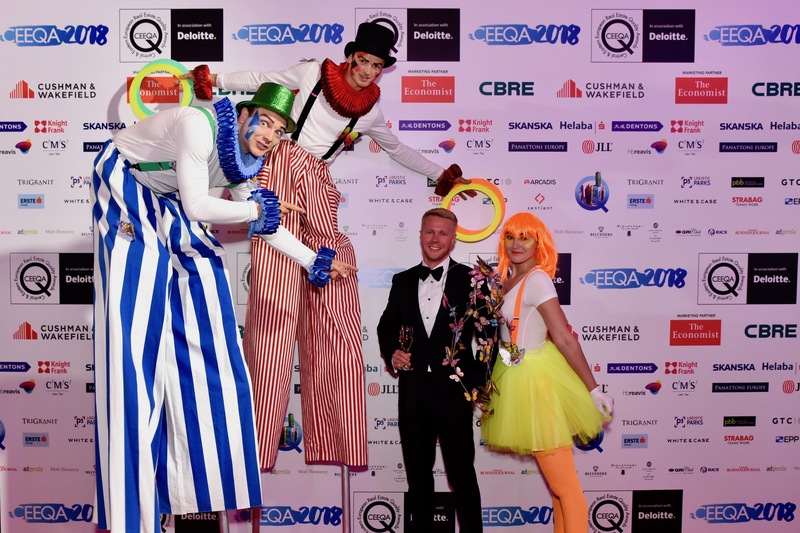 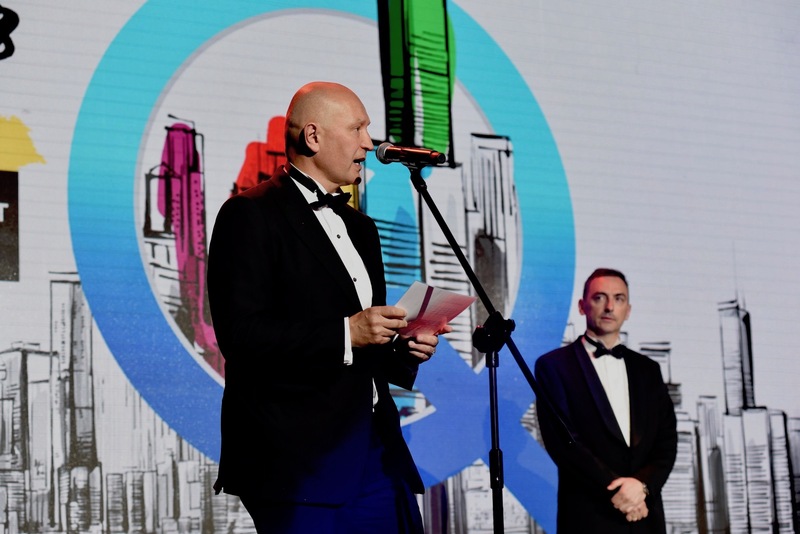 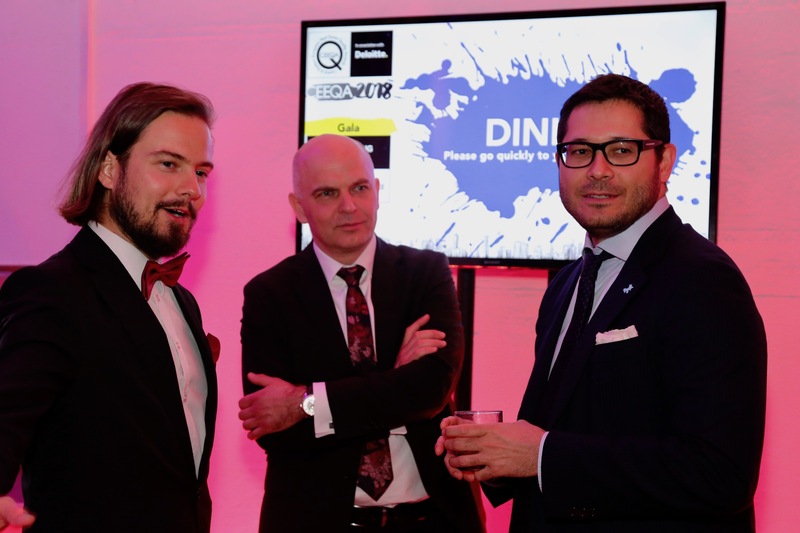 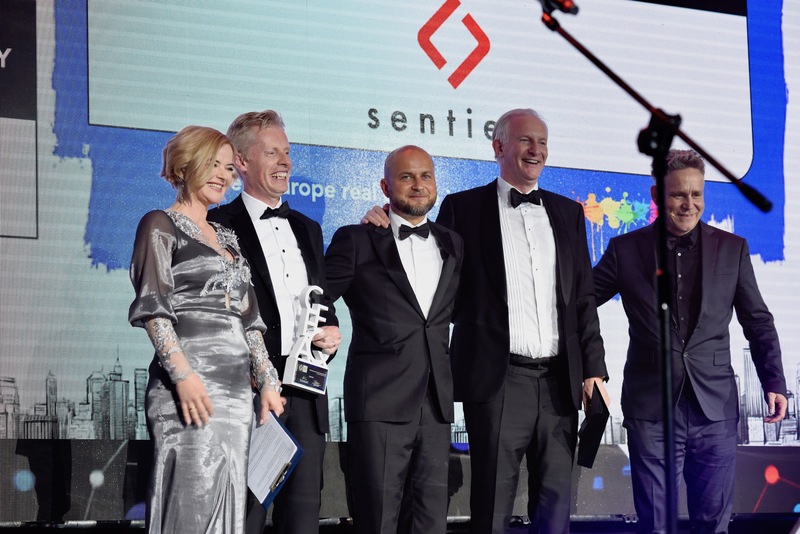 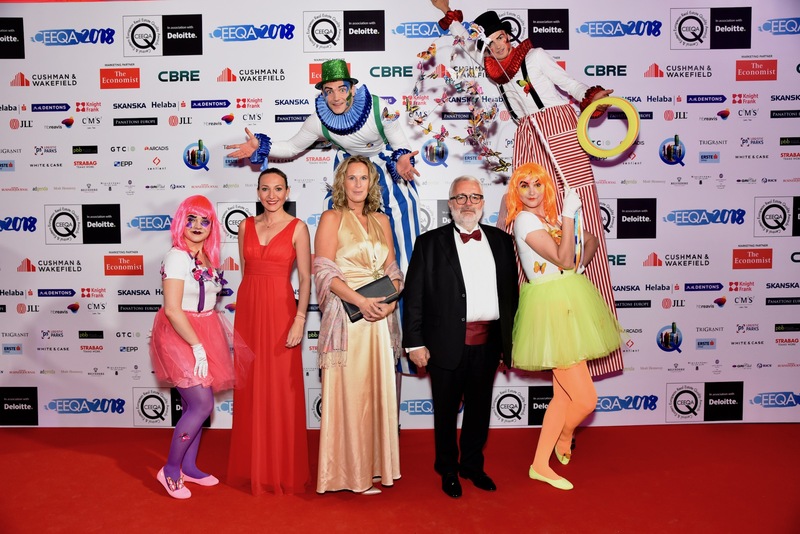 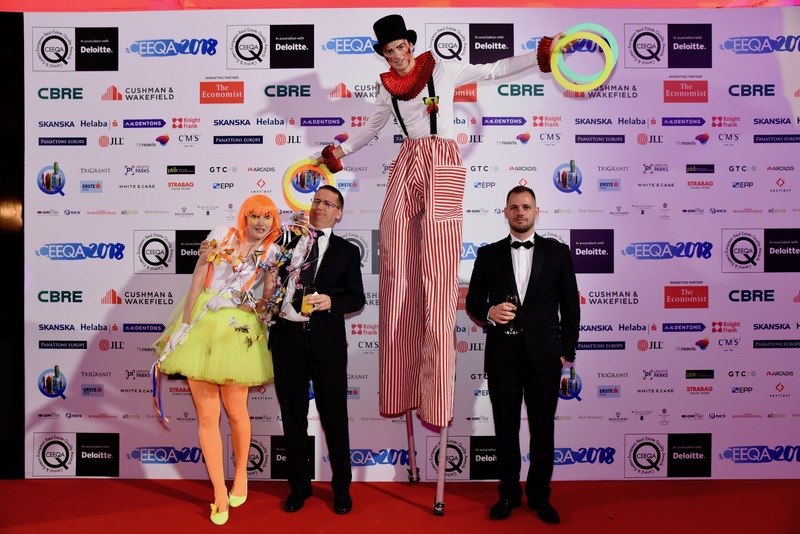 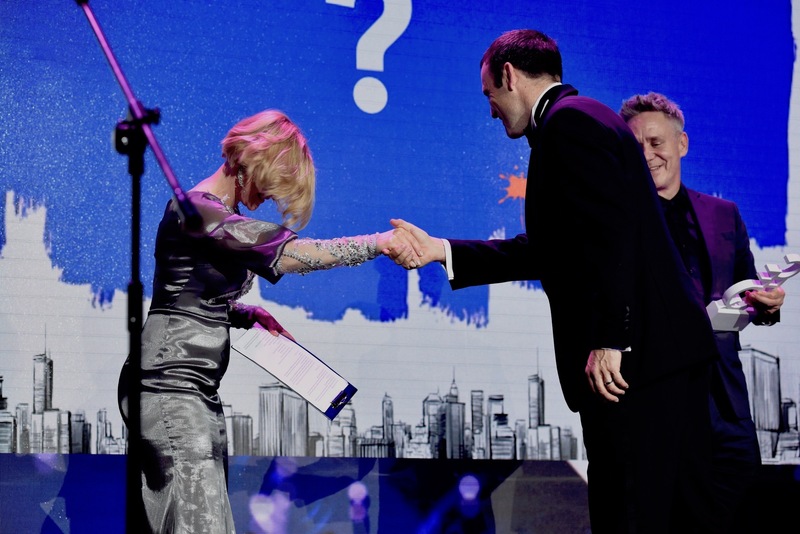 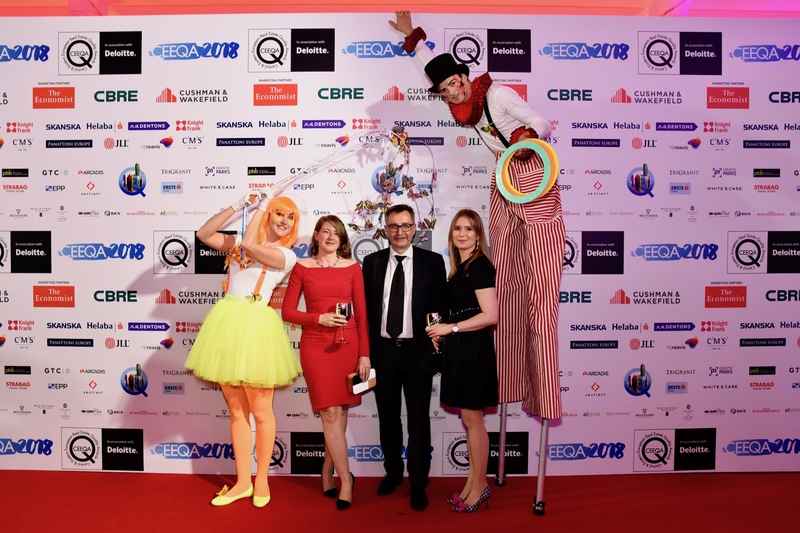 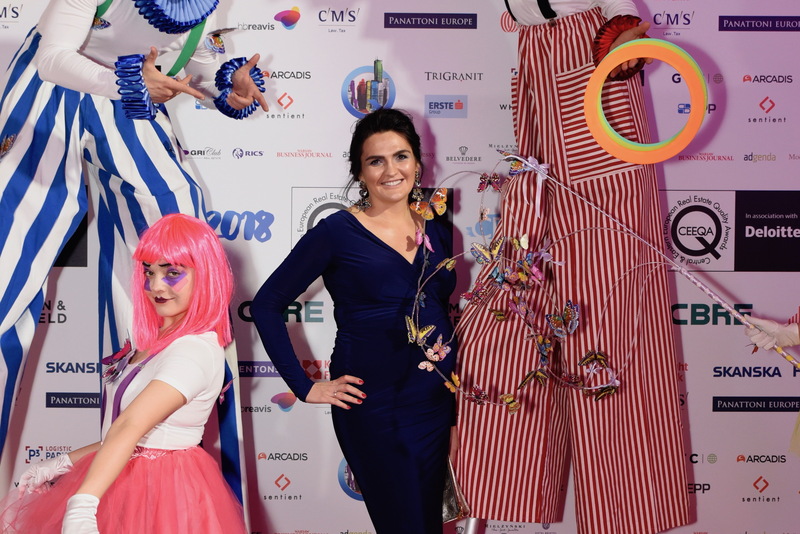 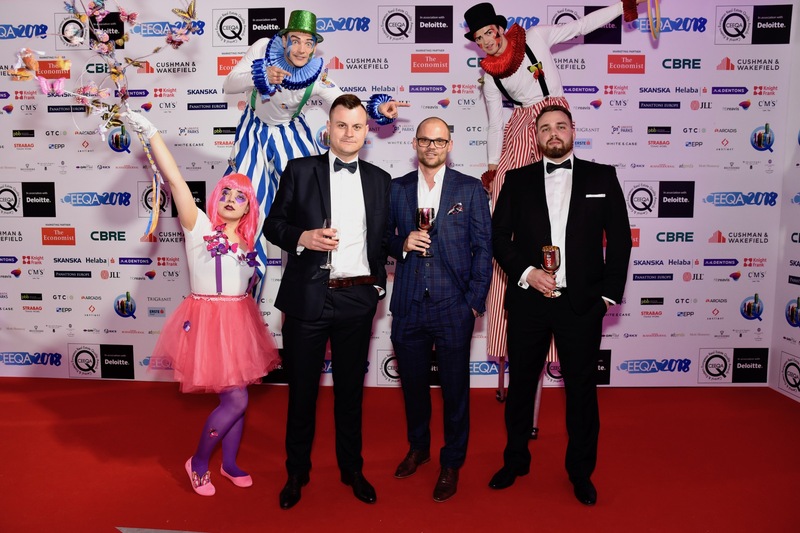 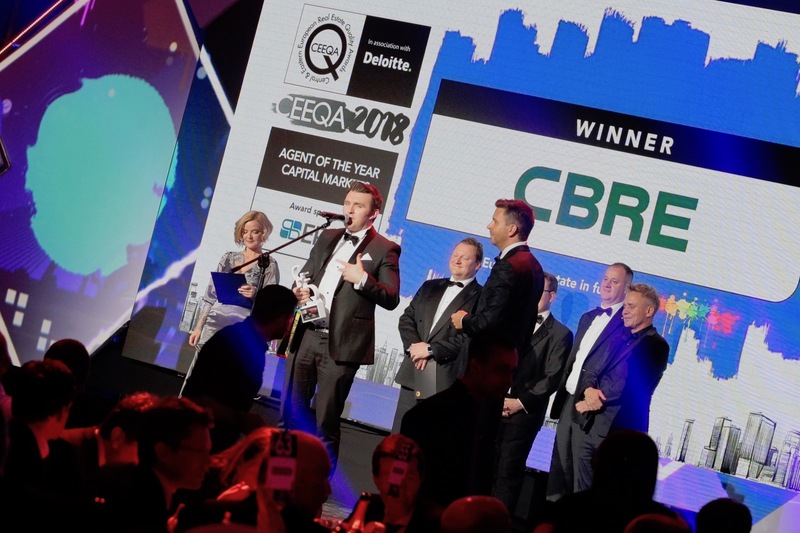 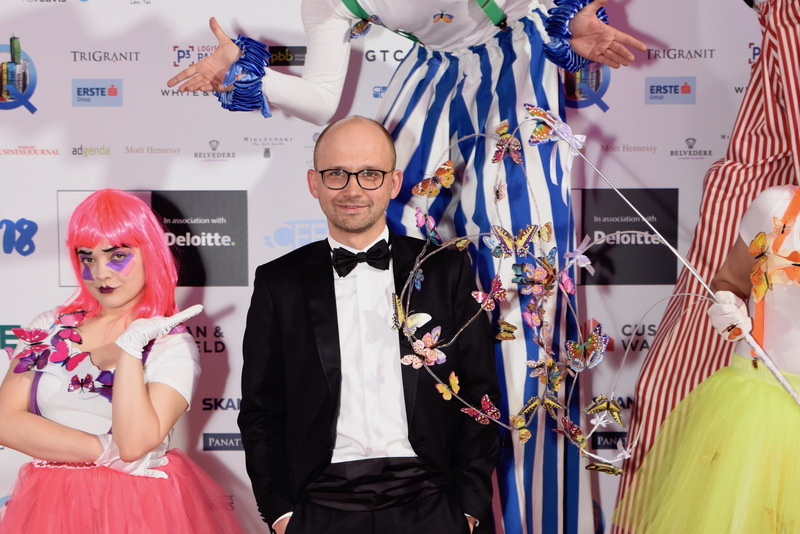 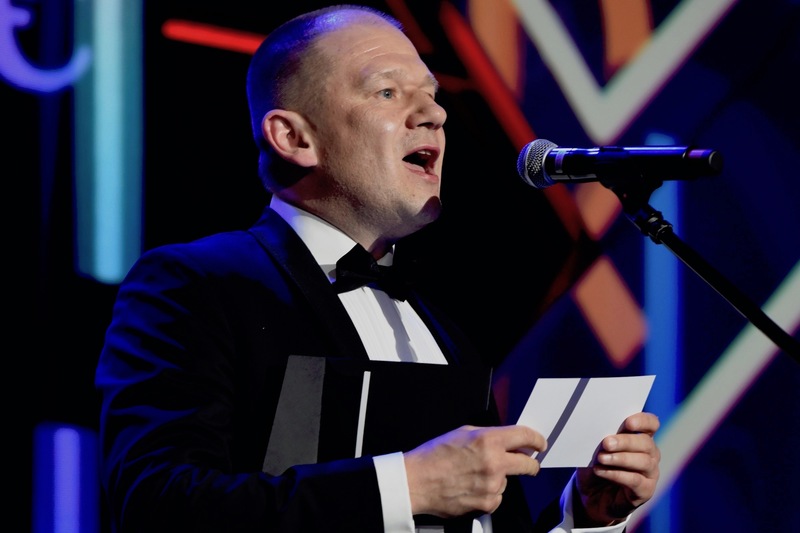 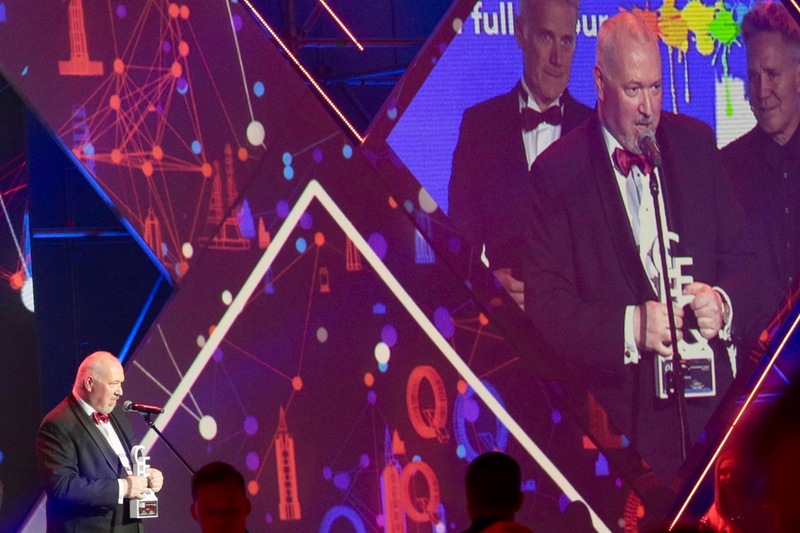 The award had the added intrigue that a legal team containing Pawel Debowski, himself a two time winner of the Industry Professional of the Year award, has won this award 13 times in the 15 years since CEEQA’s inception in 2003. 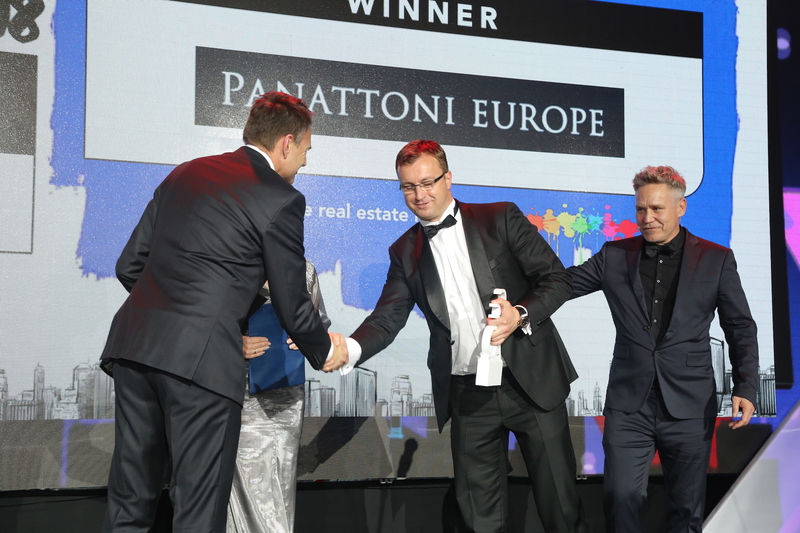 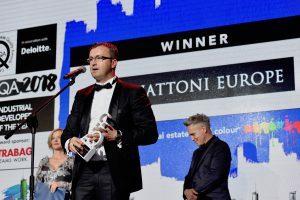 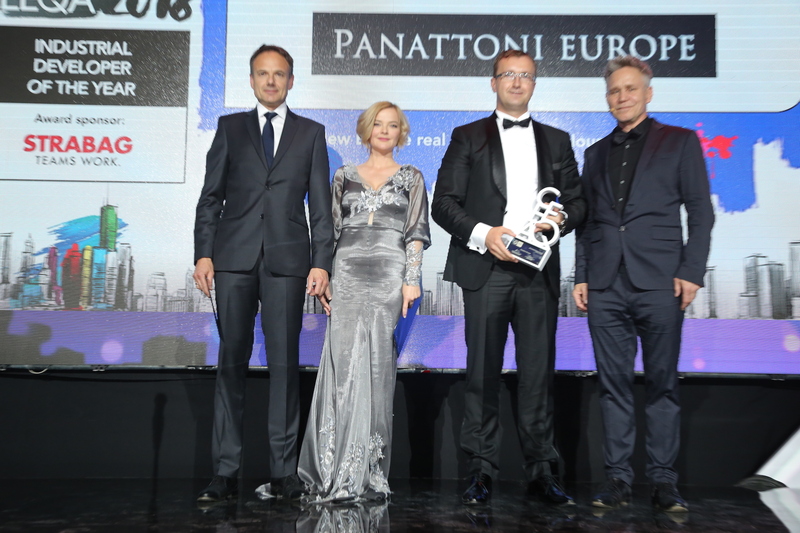 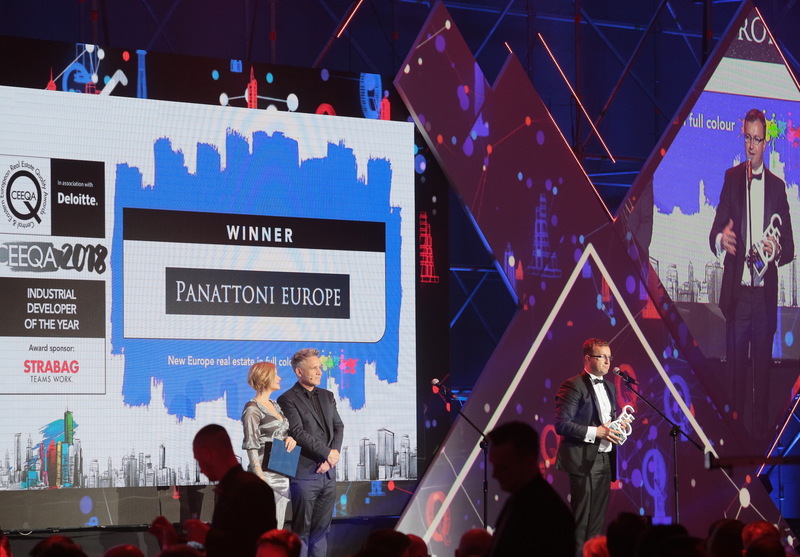 Also enjoying a sustained run of success was Panattoni Europe, taking the Industrial Developer title for the fourth year in a row, another emerging storyline in the sector, having unseated one of the biggest market whales in ProLogis to assume the position of undisputed king of sheds in New Europe. 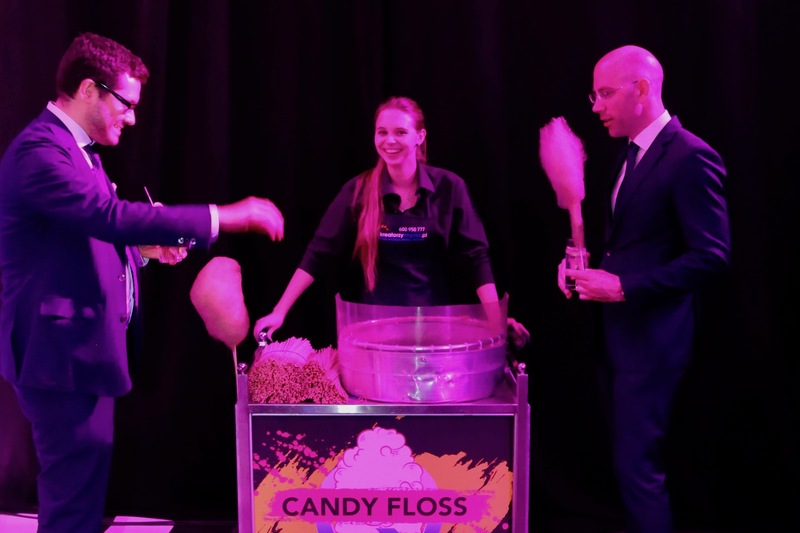 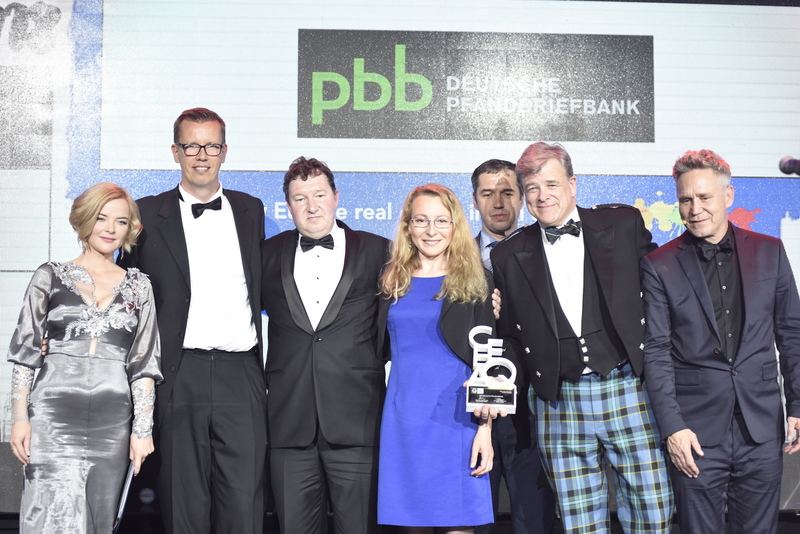 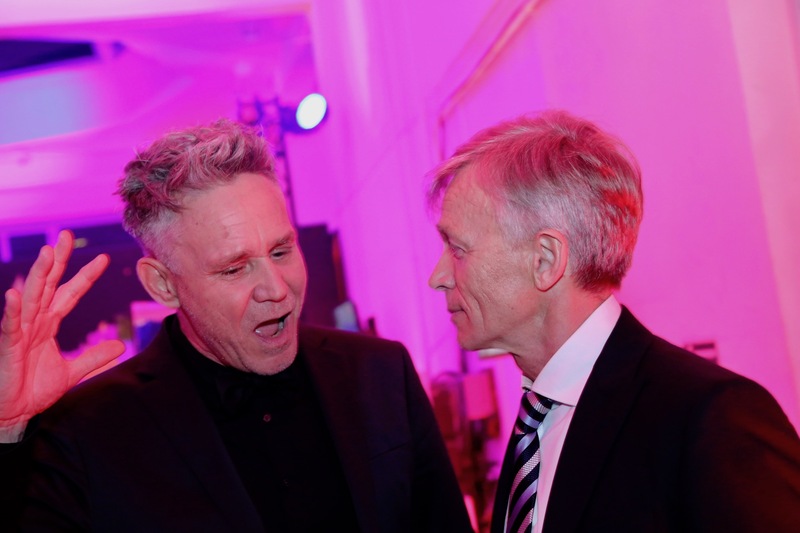 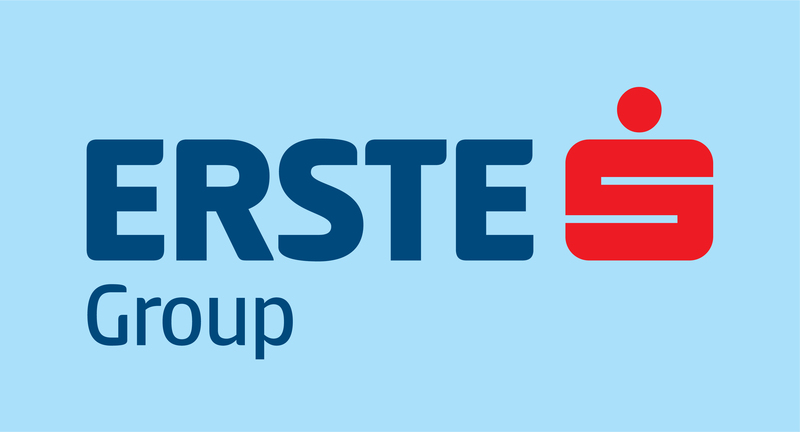 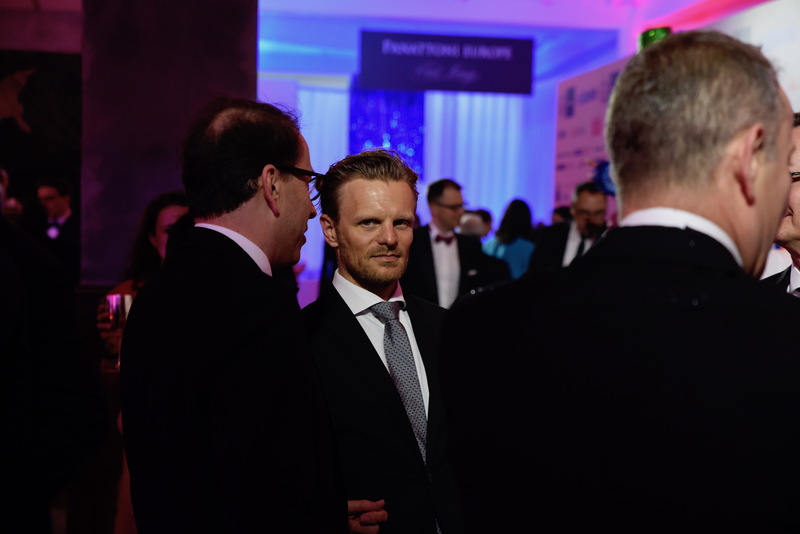 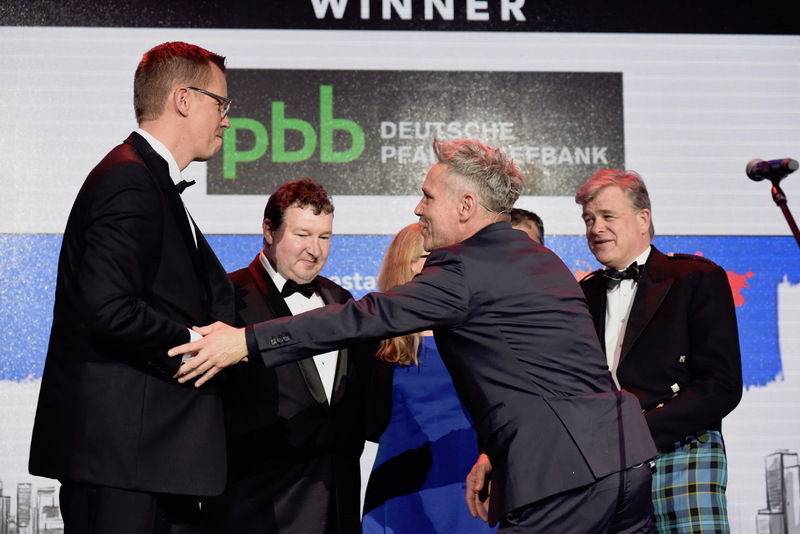 German cross-border financier pbb Deutsche Pfrandbriefbank were also successful once again in the Lender category, their see-saw battle with Helaba having been disrupted for the first time in a decade last year by Erste Bank. 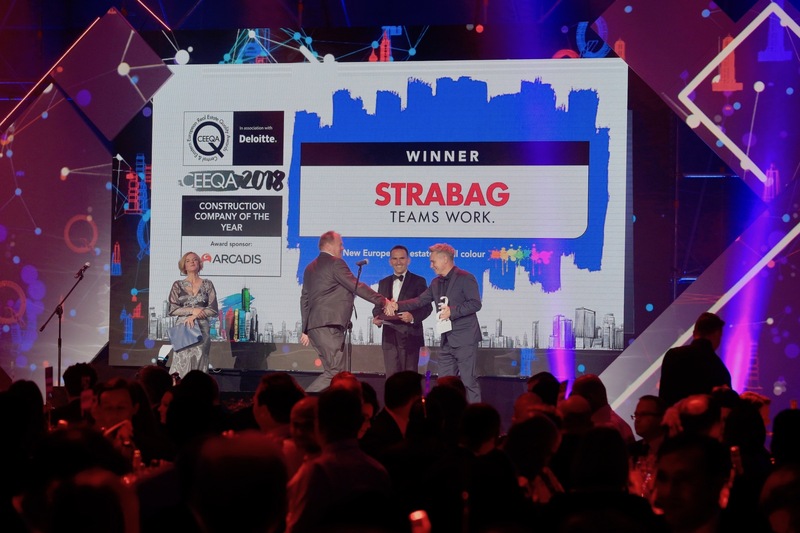 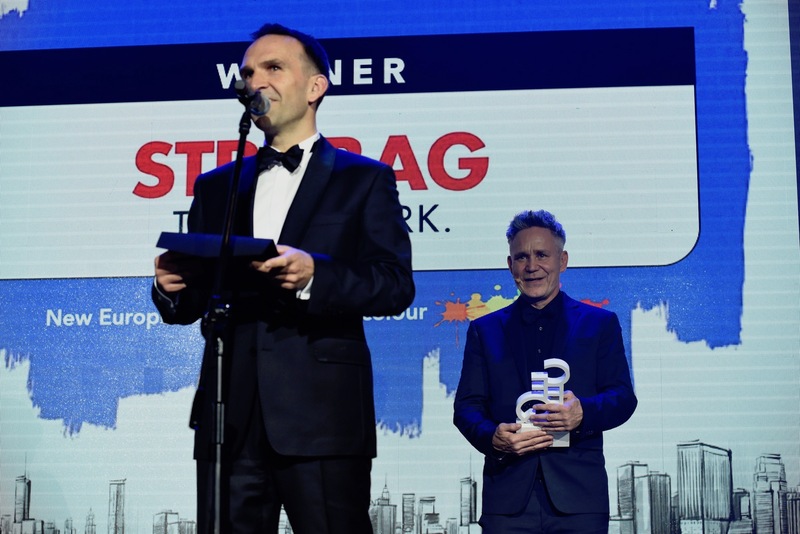 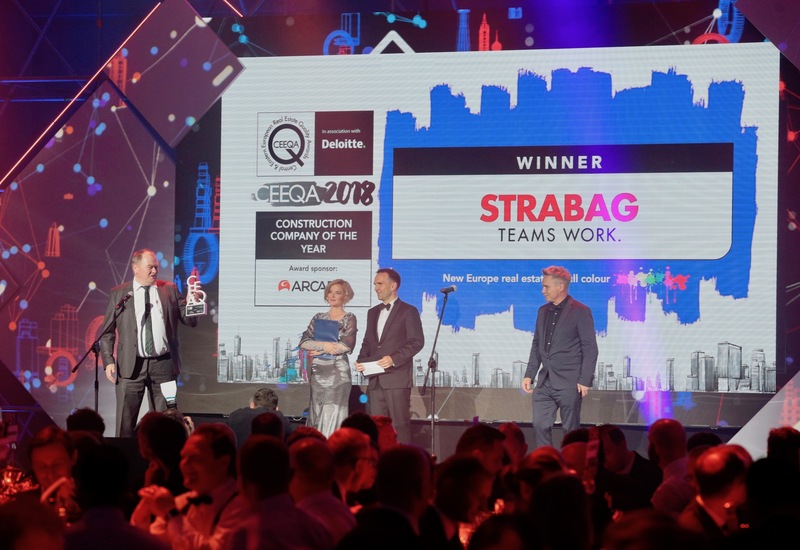 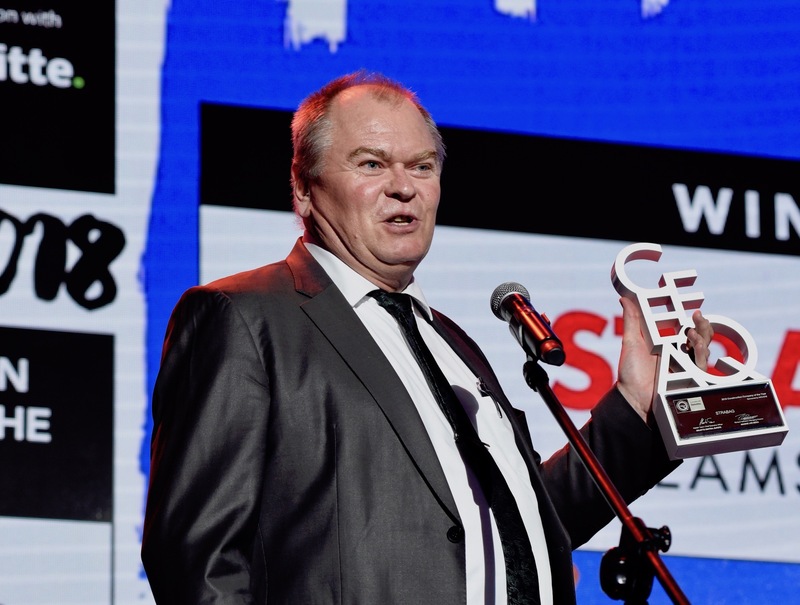 And another historic seesaw battle in the Construction Company category saw Strabag regain the title it lost last year to Skanska SA. 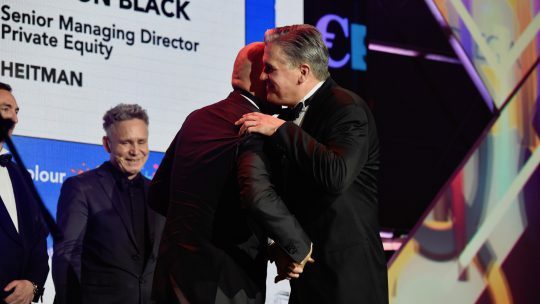 But the heavyweights didn’t have it all their own way. 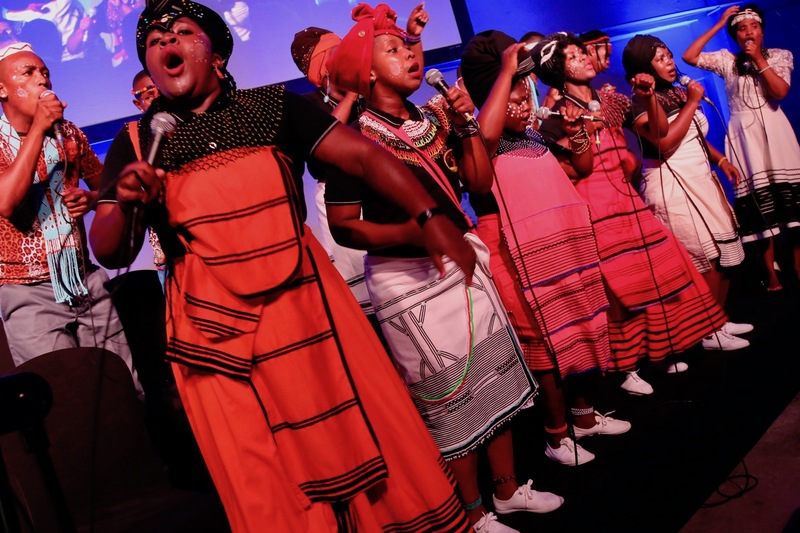 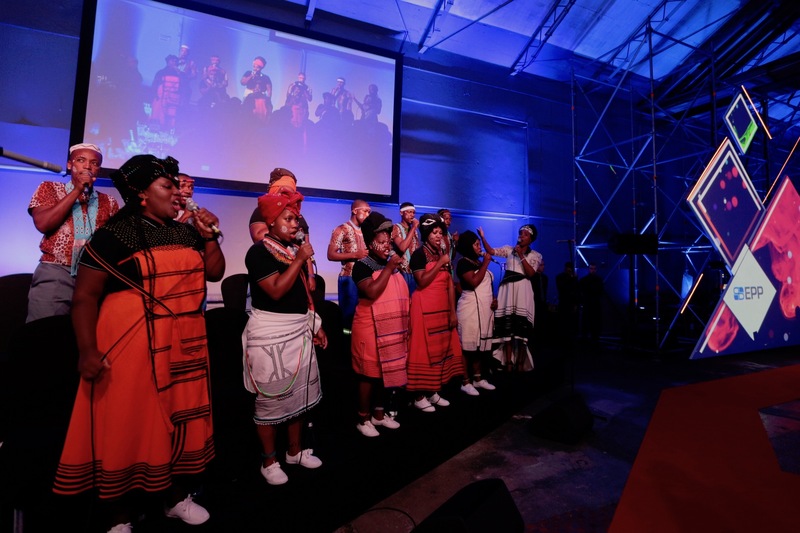 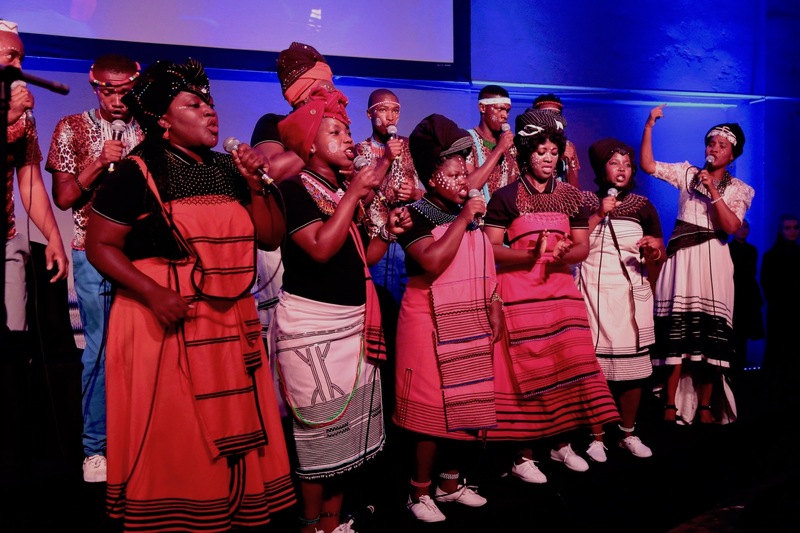 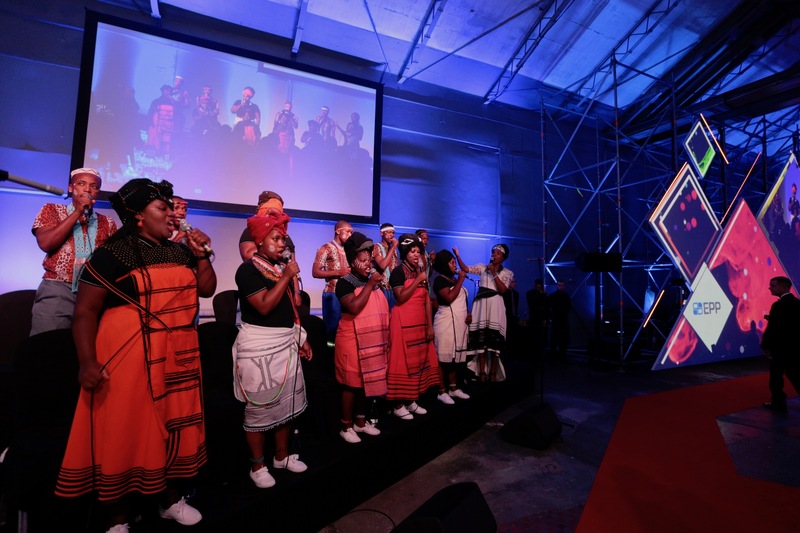 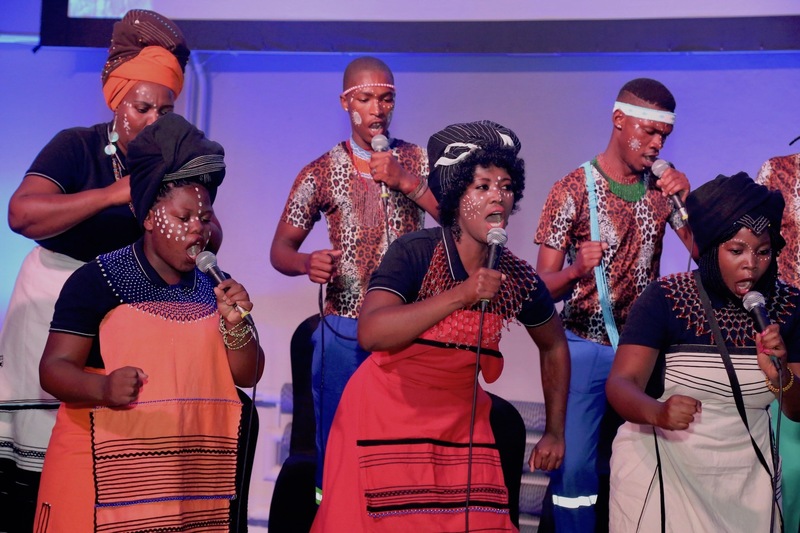 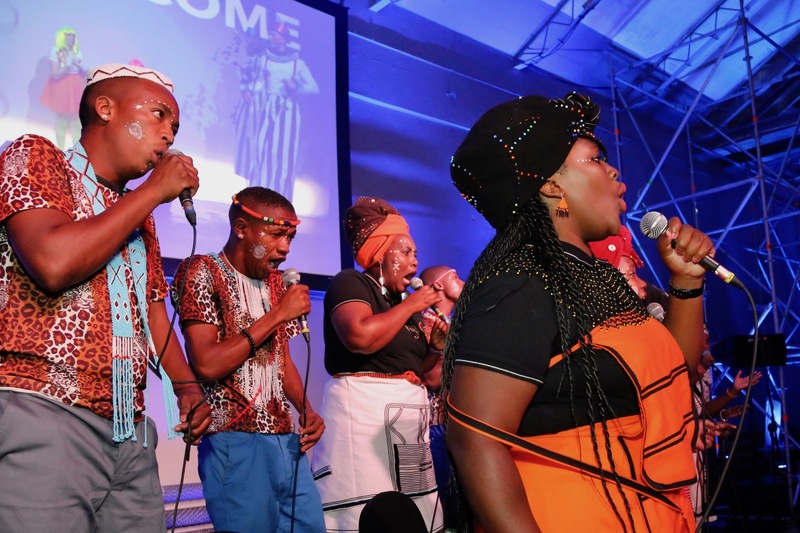 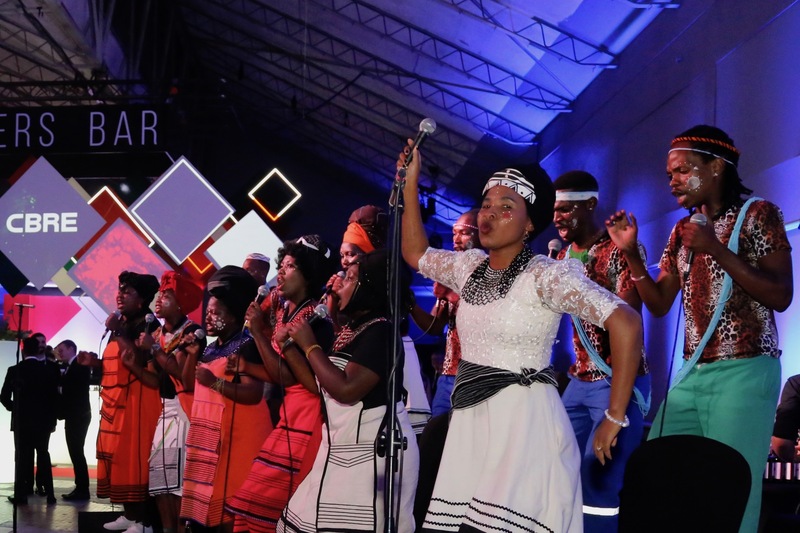 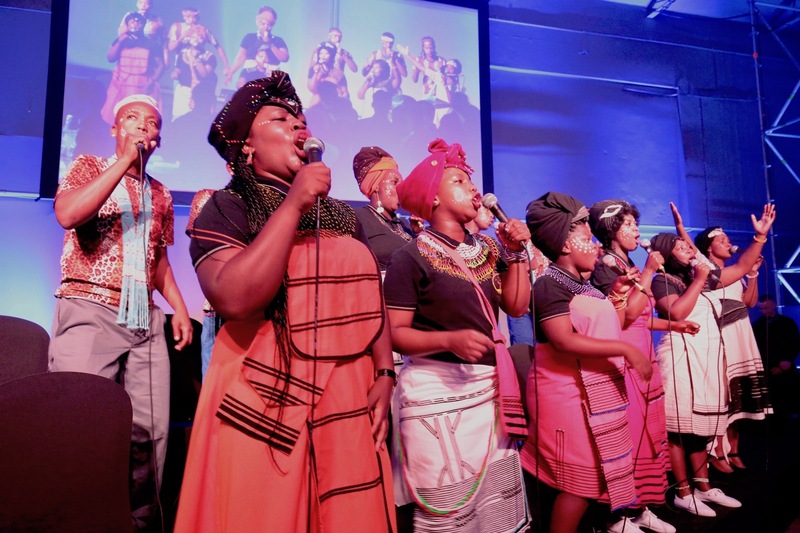 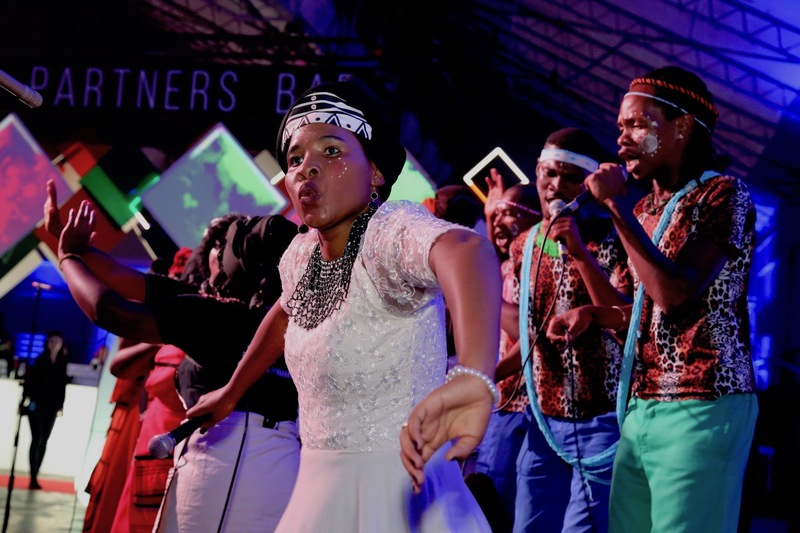 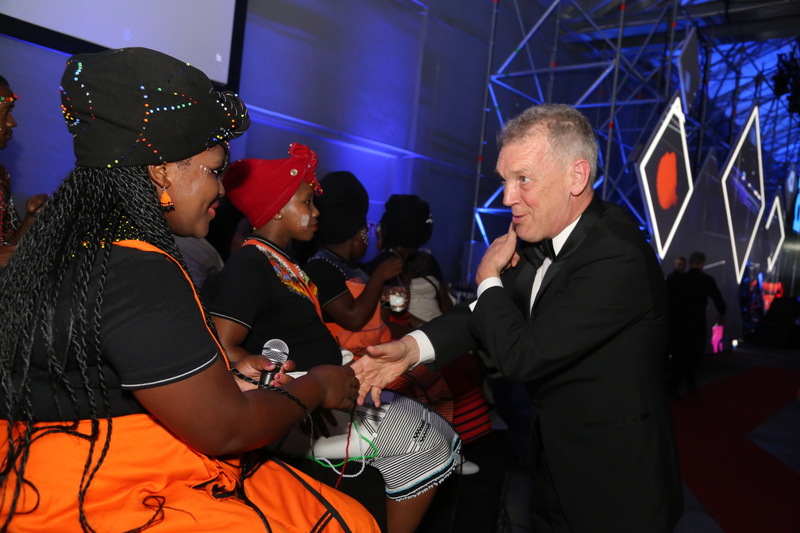 Home grown Czech firms, fund manager CPI Property Group and legal advisors Wilsons, as well as regional project management consultants Sentient, struck blows for the market salmon at the dinner and awards ceremony hosted by Monika Zamachowska for the 10th successive year, which was beautifully serenaded by the Isibane se Afrika gospel choir of Inkcubeko Arts & Culture, flown in especially for the event from Cape Town in South Africa. 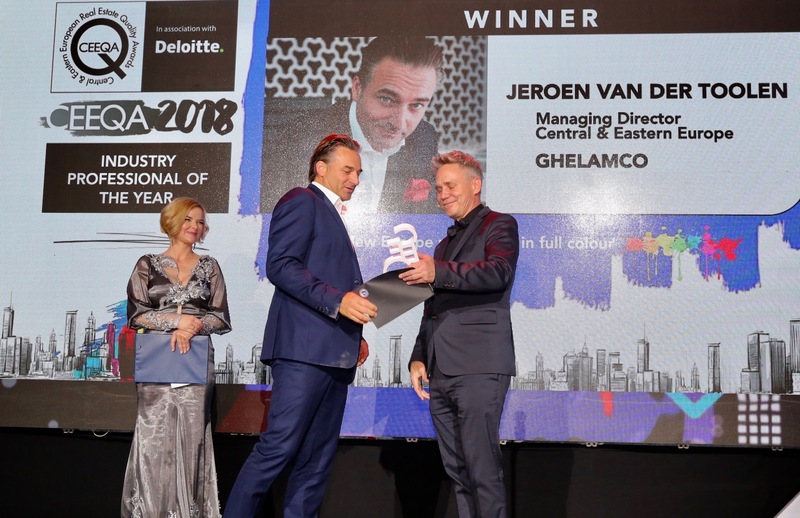 Jeroen van der Toolen of Belgian developer Ghelamco was named Industry Professional of the Year for outstanding individual achievement, and on a star studded evening perhaps the biggest star of the show was Heitman’s Gordon Black who stepped up to receive the sector’s garland award for Lifetime Achievement in Real Estate. 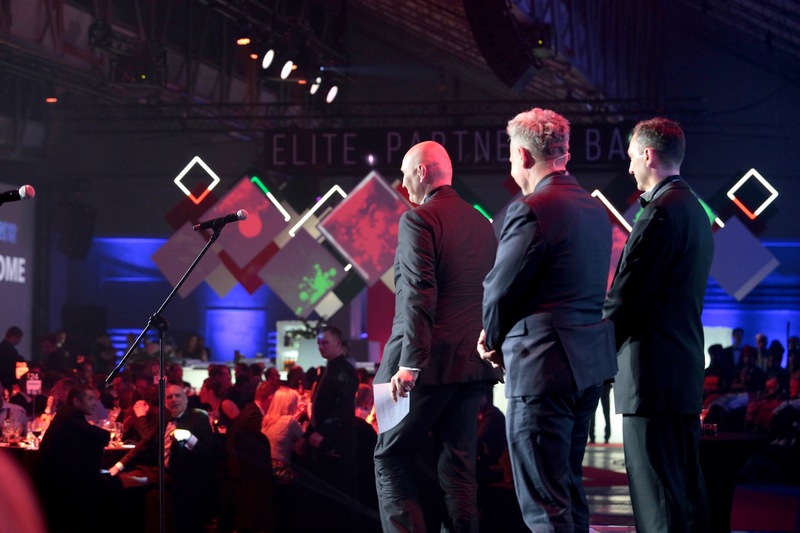 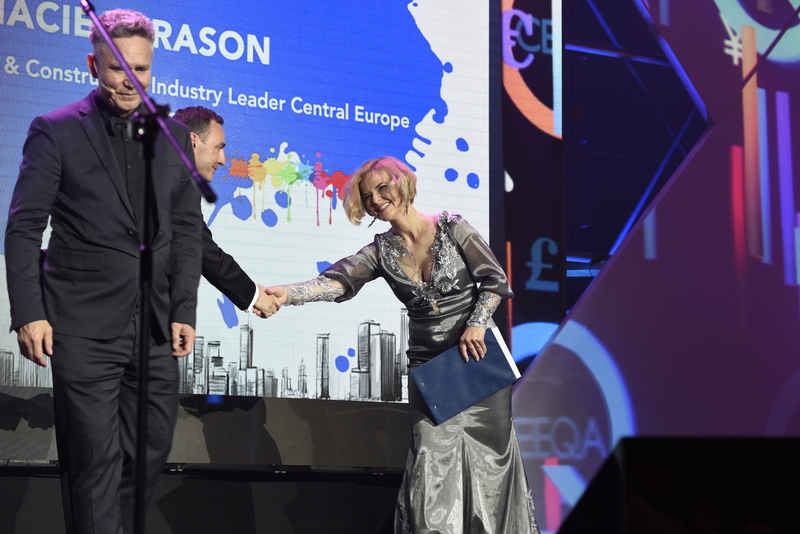 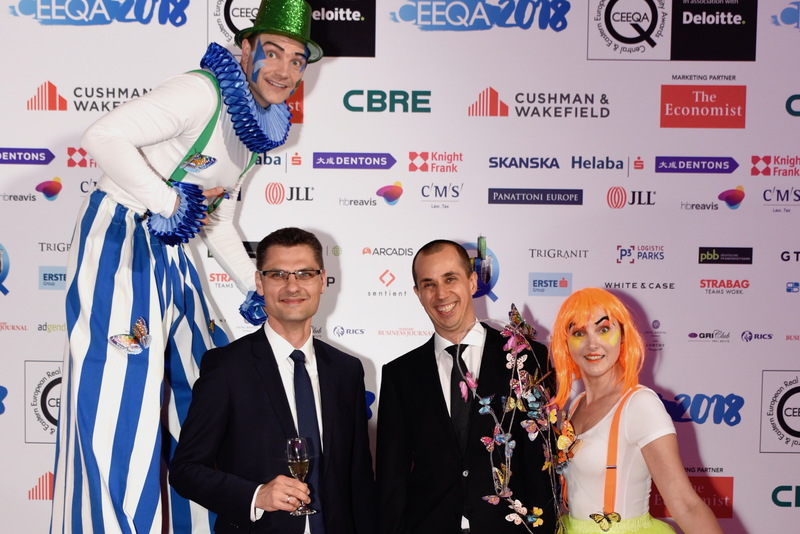 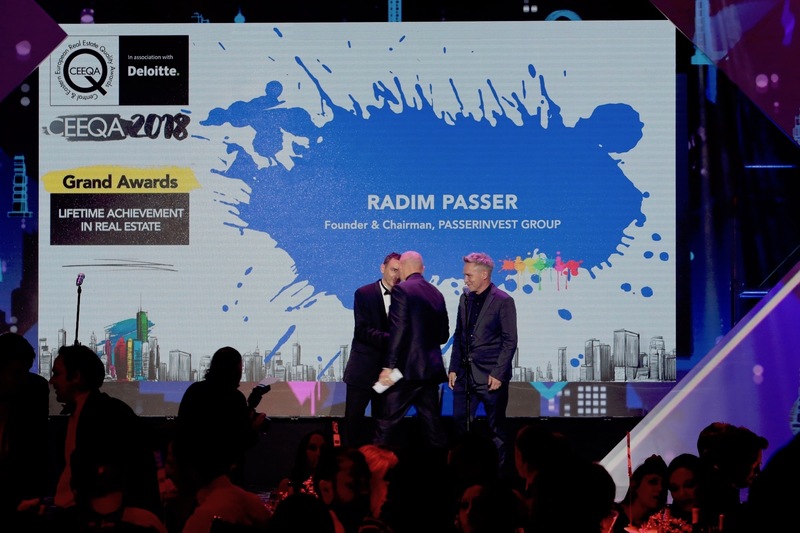 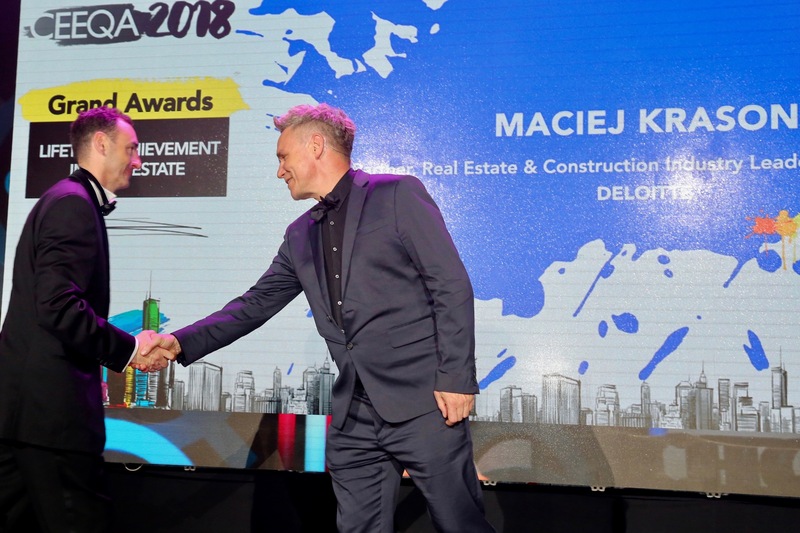 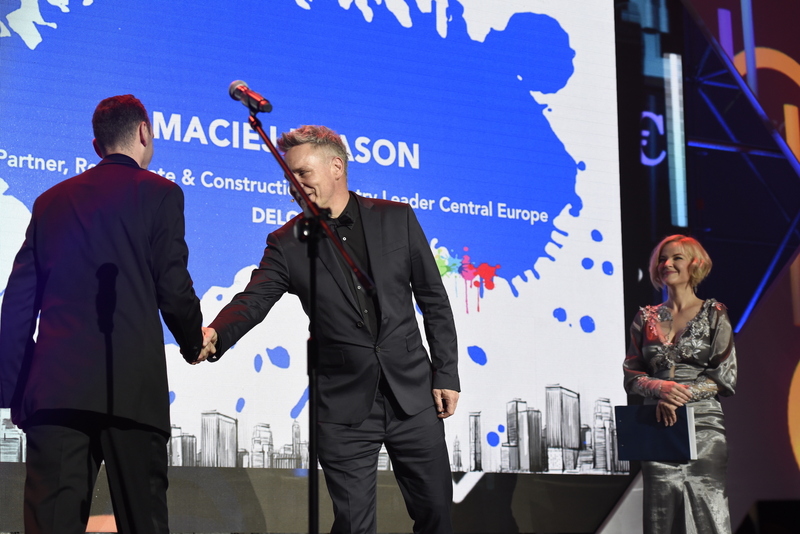 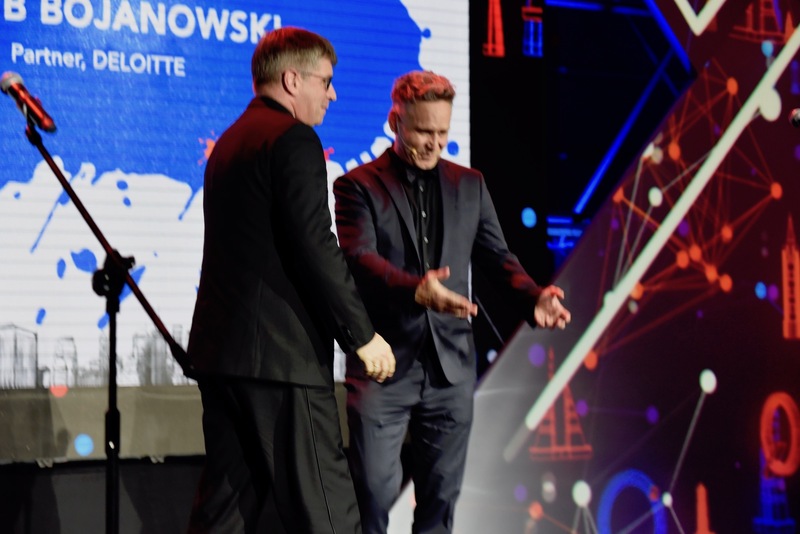 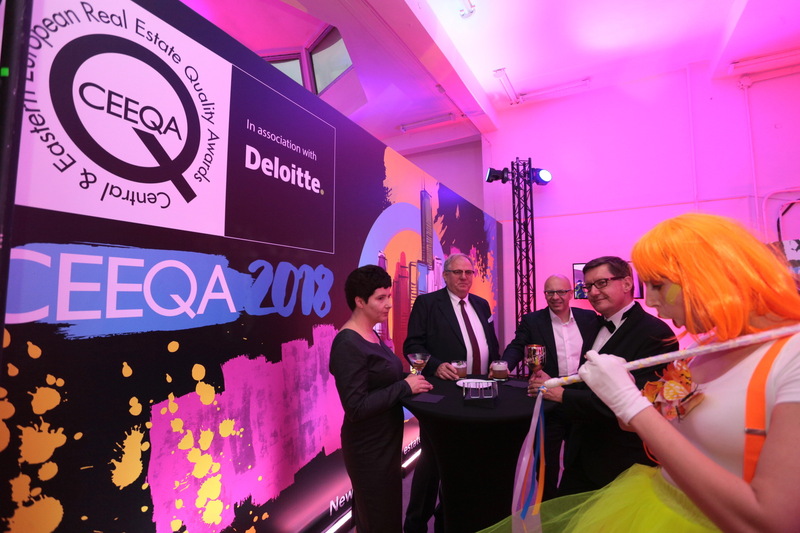 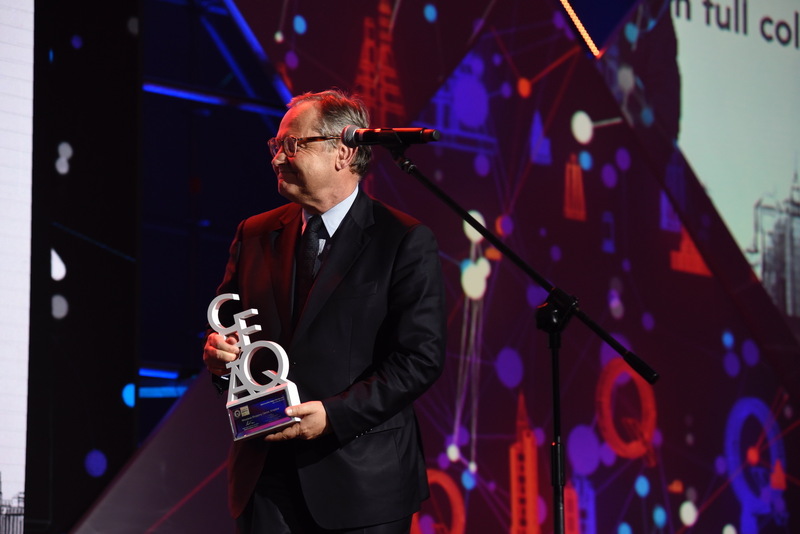 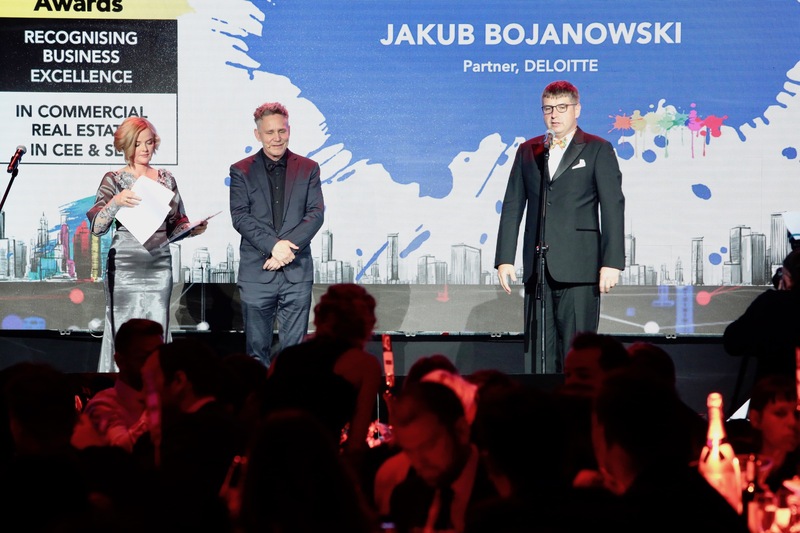 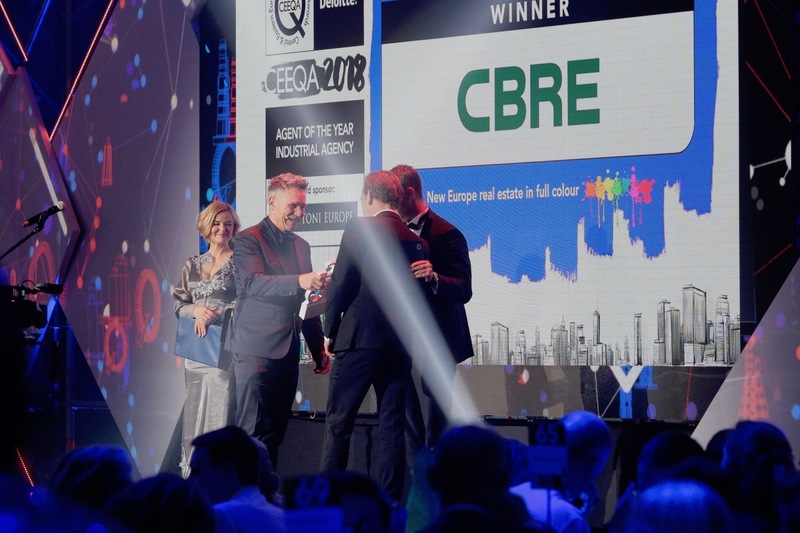 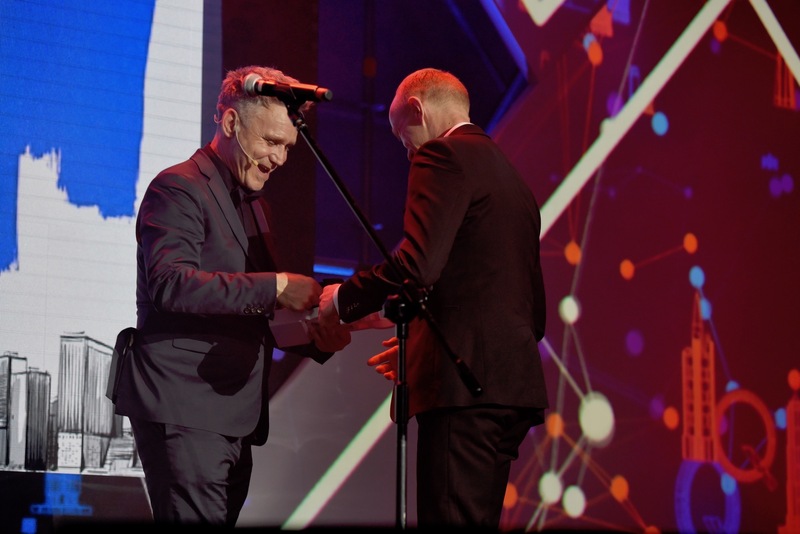 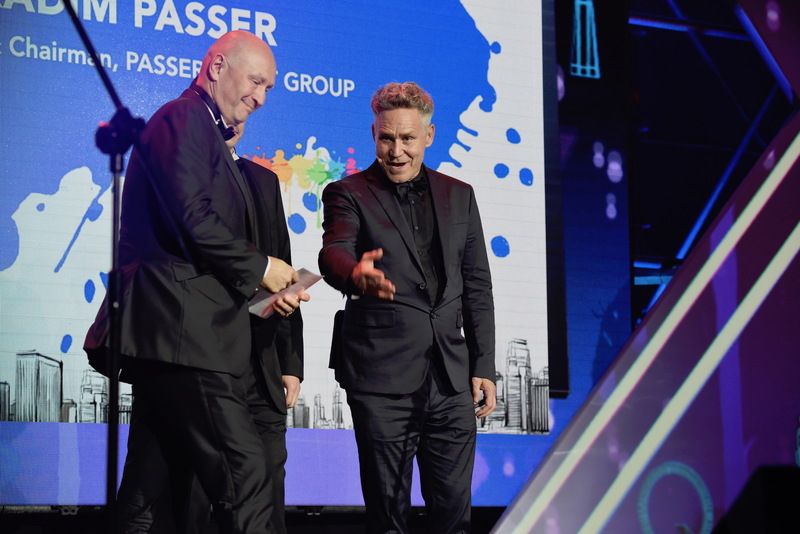 The award was presented to him by the previous year’s recipient, Radim Passer of Passerinvest, with Deloitte’s Maciek Krason also assisting with the presentation as lead partner of CEEQA 2018. 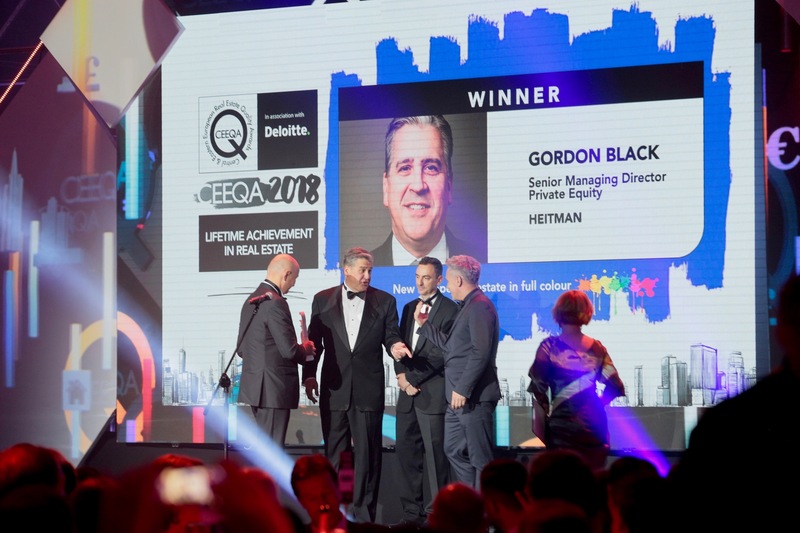 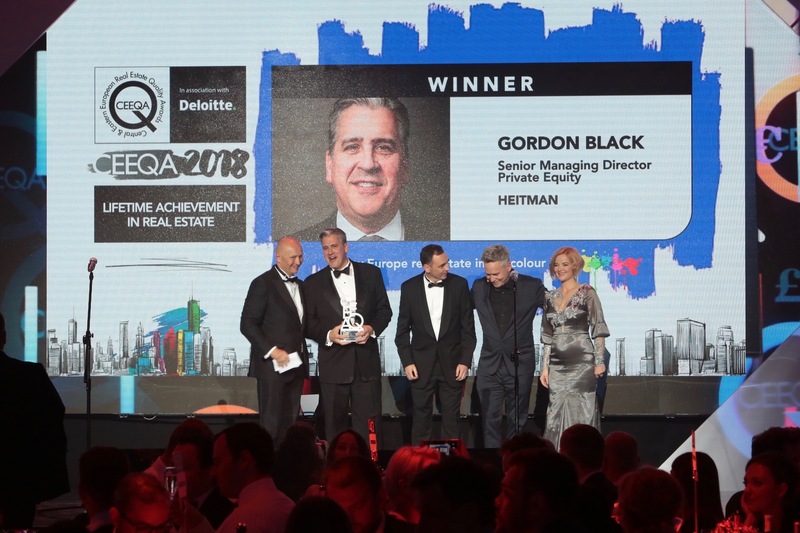 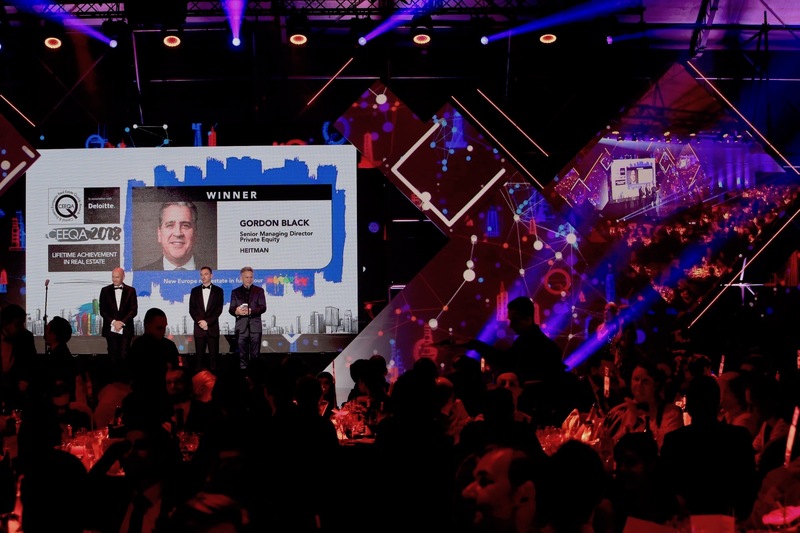 As the leader of Heitman’s European Private Equity operations since 1995, Gordon Black has been one of the central figures in the emergence and growth of the CEE and SEE real estate markets for over two decades as he and his team have frequently led the charge of institutional capital investing across the region as the various country markets have cascaded open behind them. 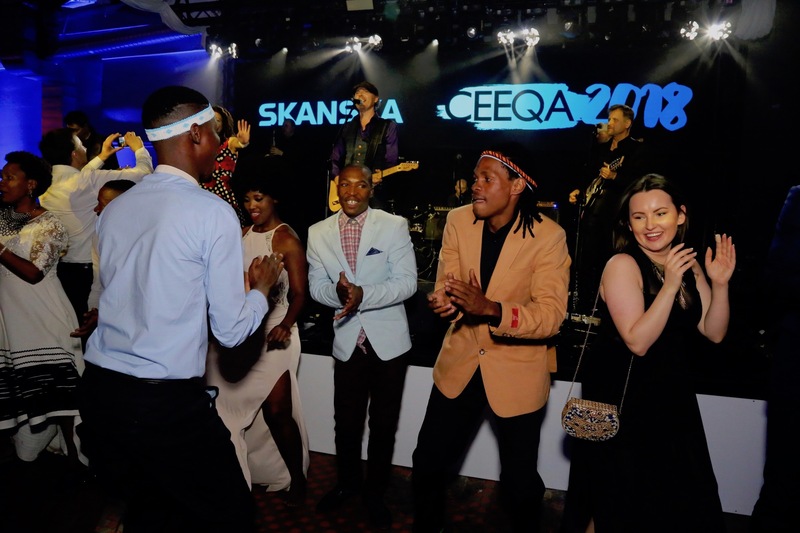 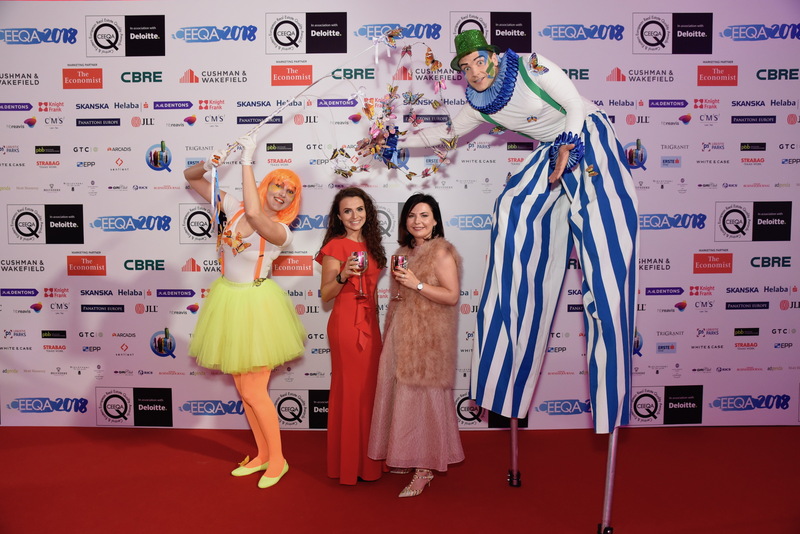 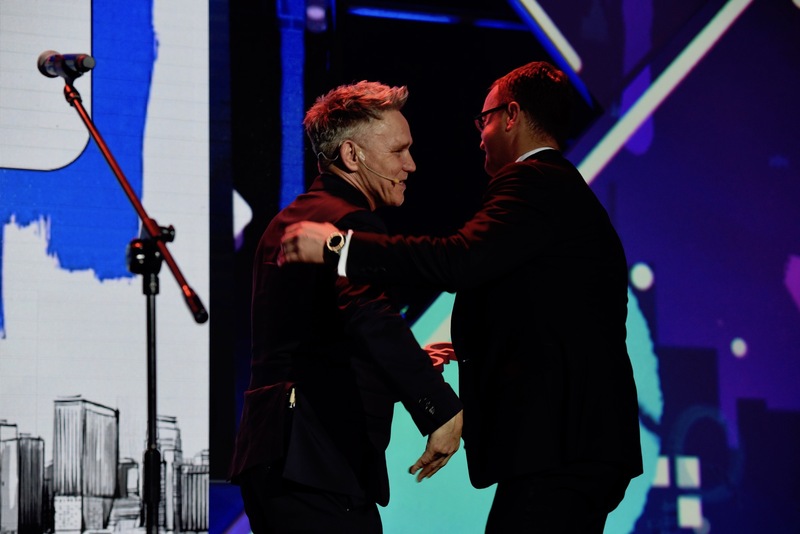 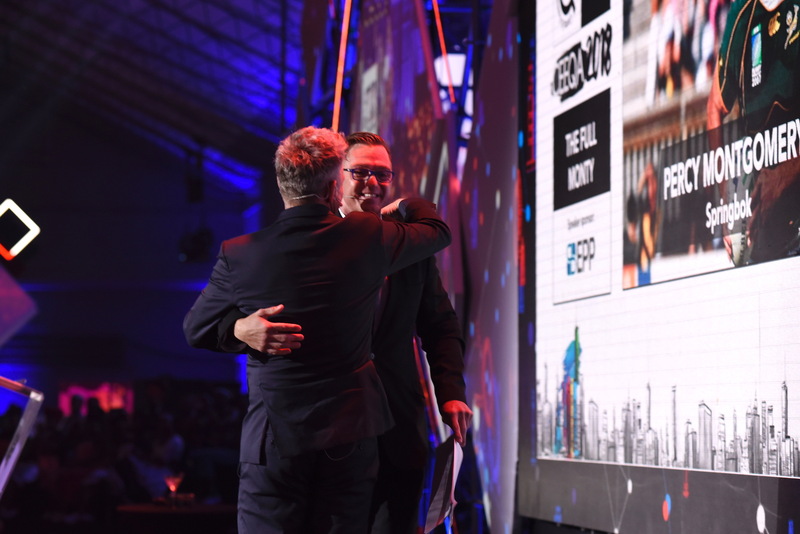 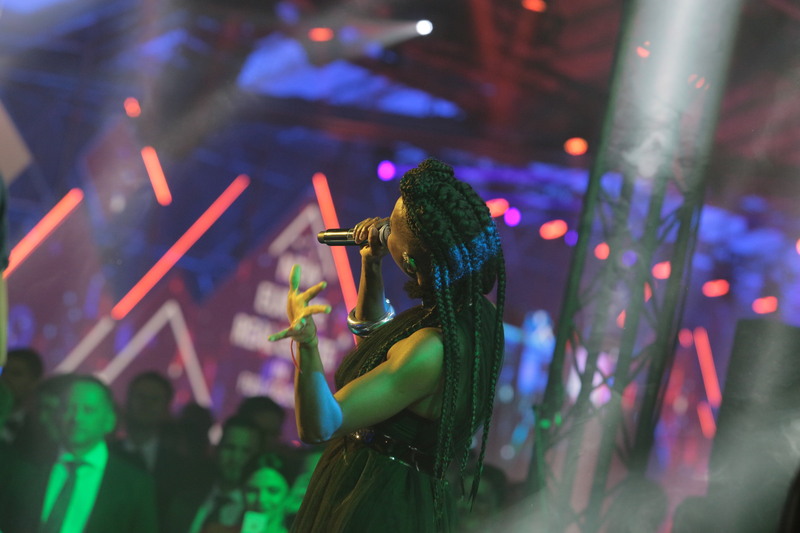 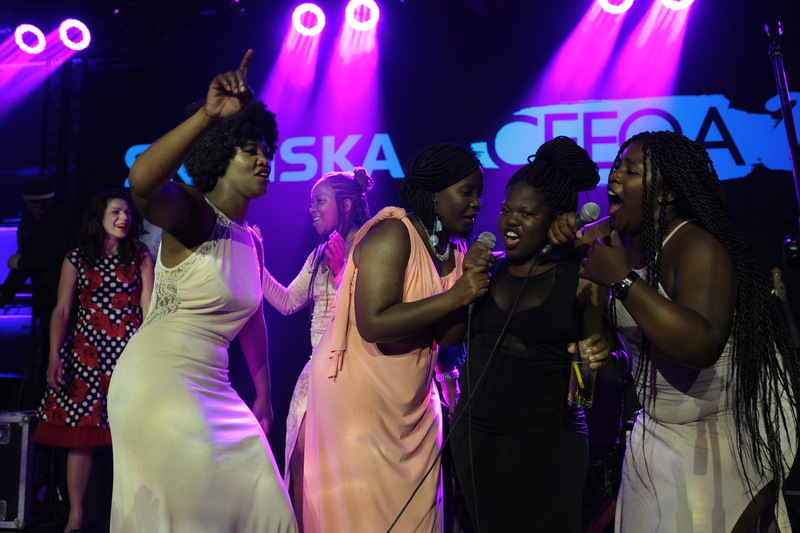 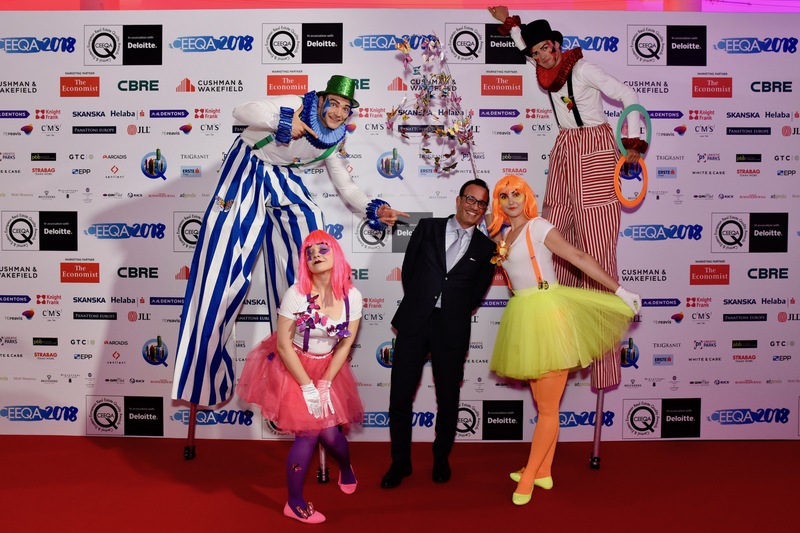 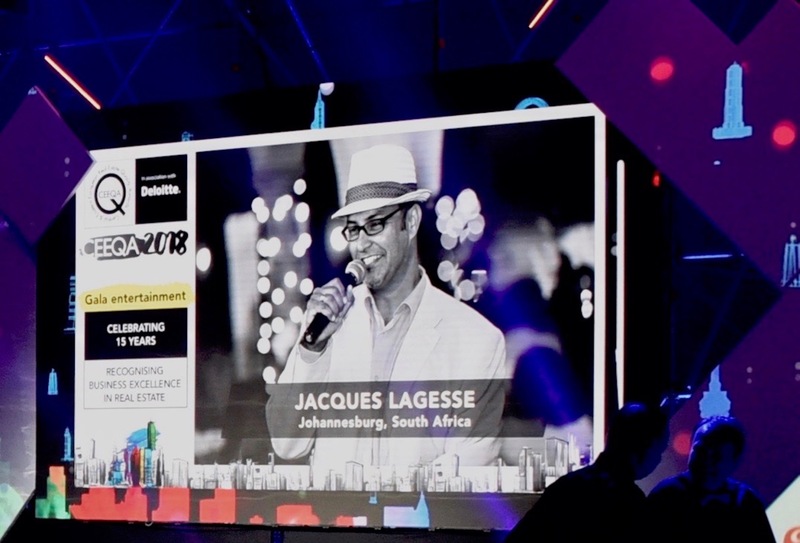 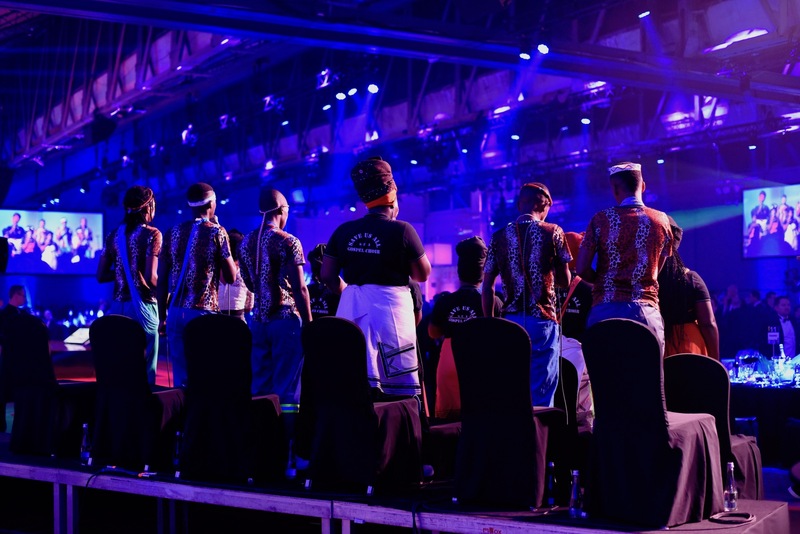 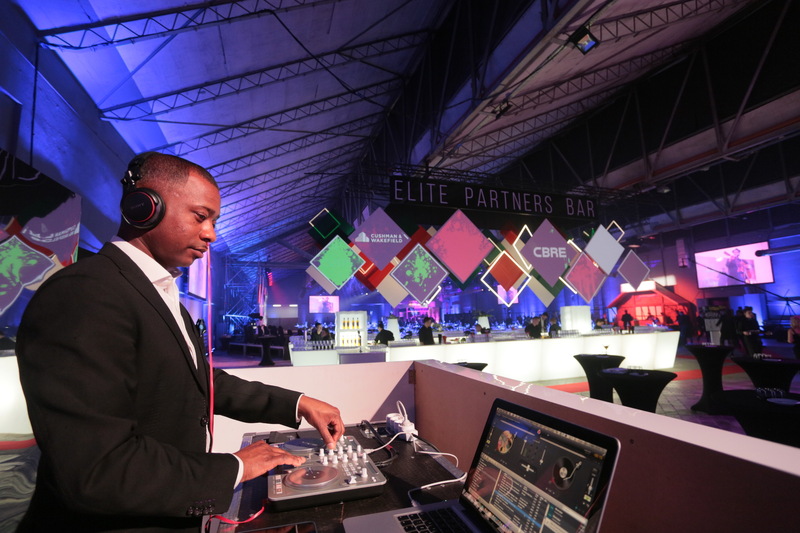 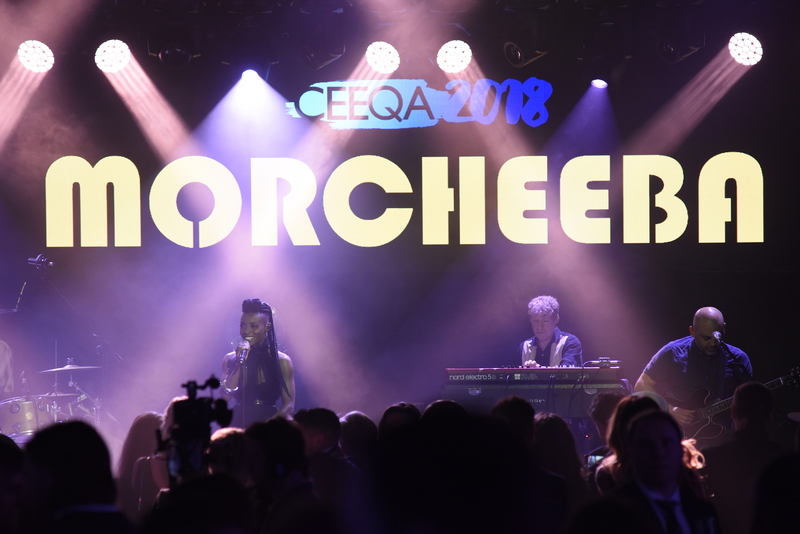 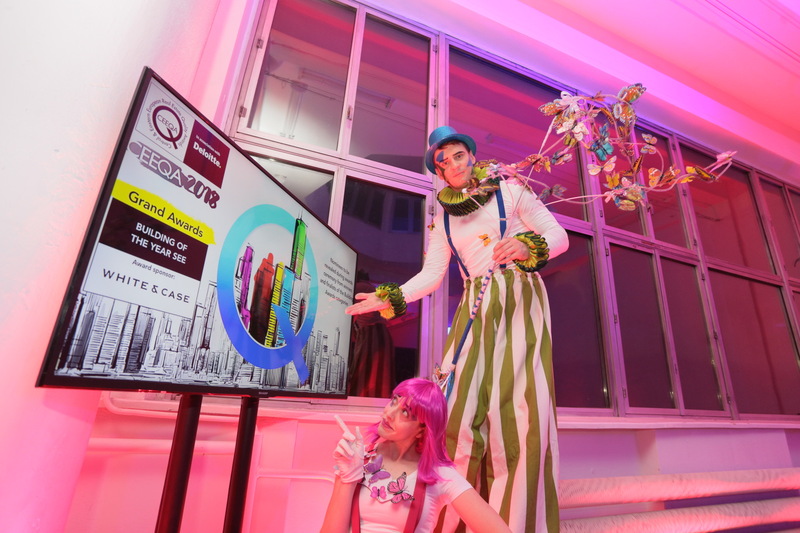 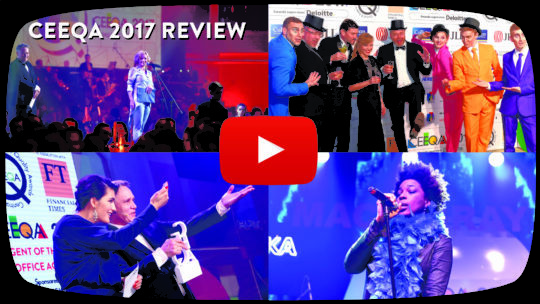 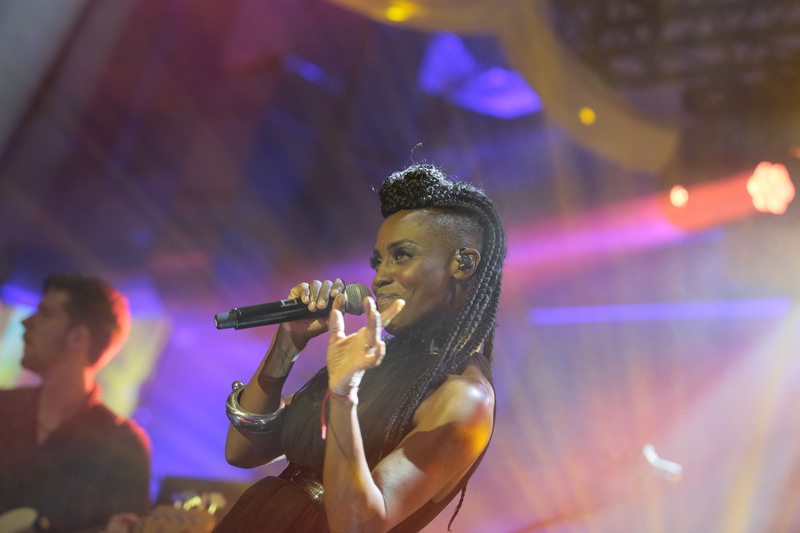 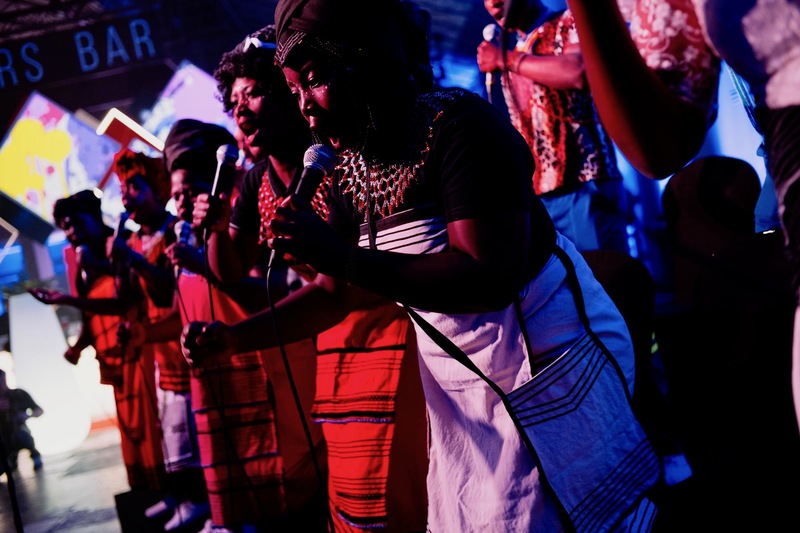 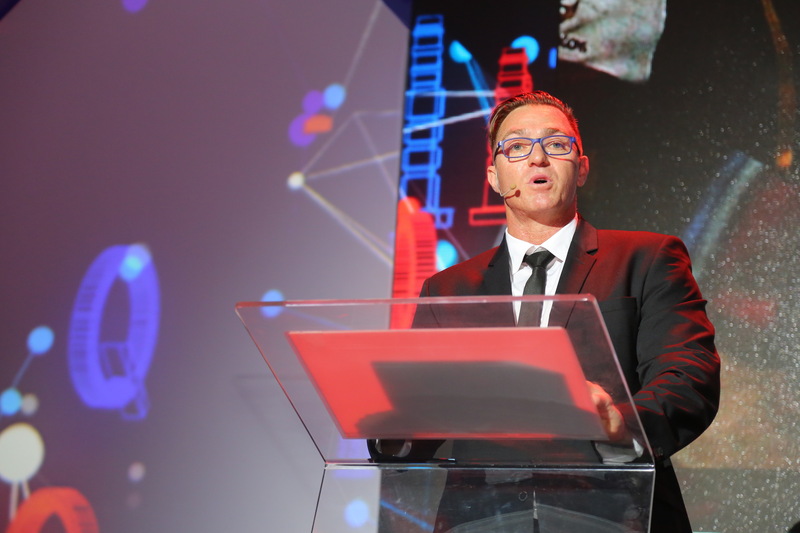 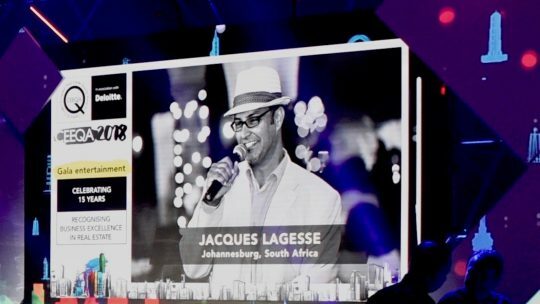 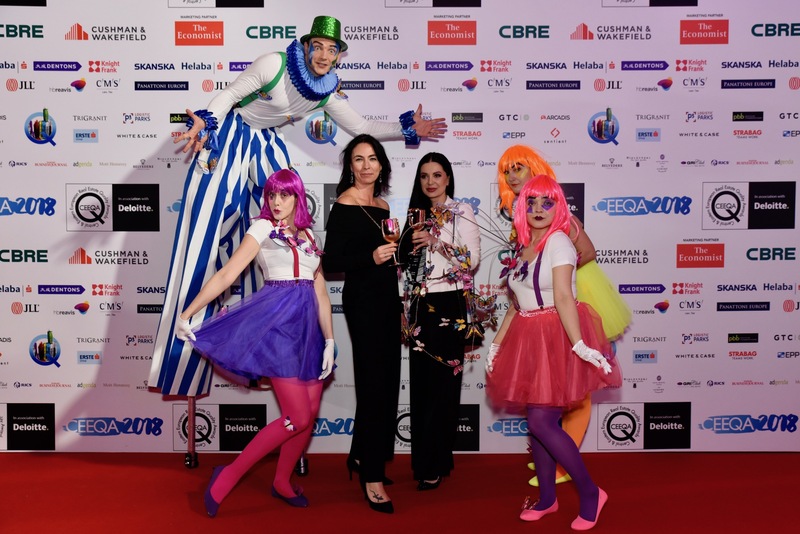 A successful year in the field was complemented by an outstanding eventing of hospitality and entertainment including an invasion of South African talent reflecting the country’s invasion of region’s real estate capital markets in recent years >> Full CEEQA 2018 results. 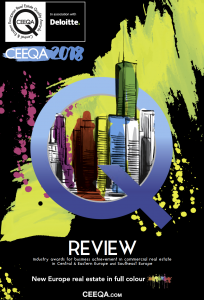 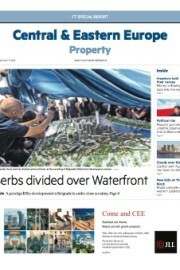 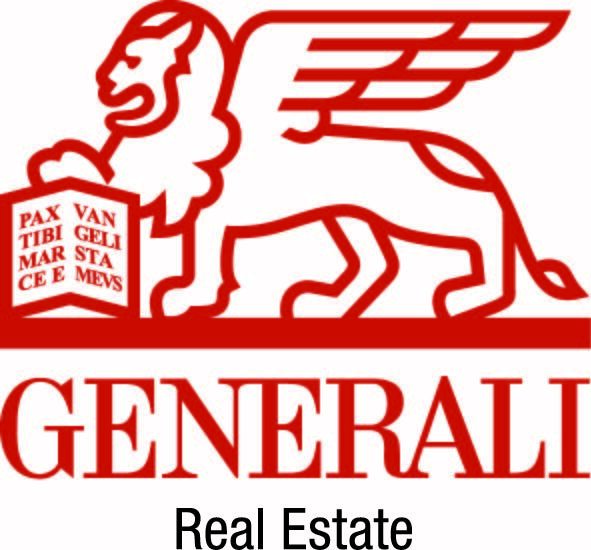 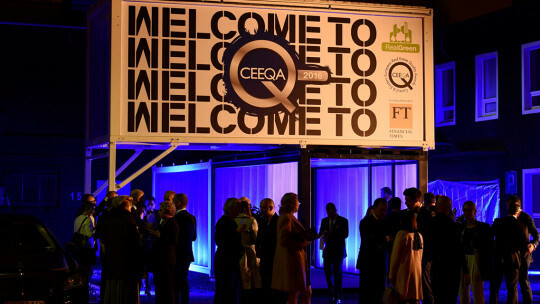 “Over 15 years of its presence on the market CEEQA has established unique trust credentials in the real estate sector. 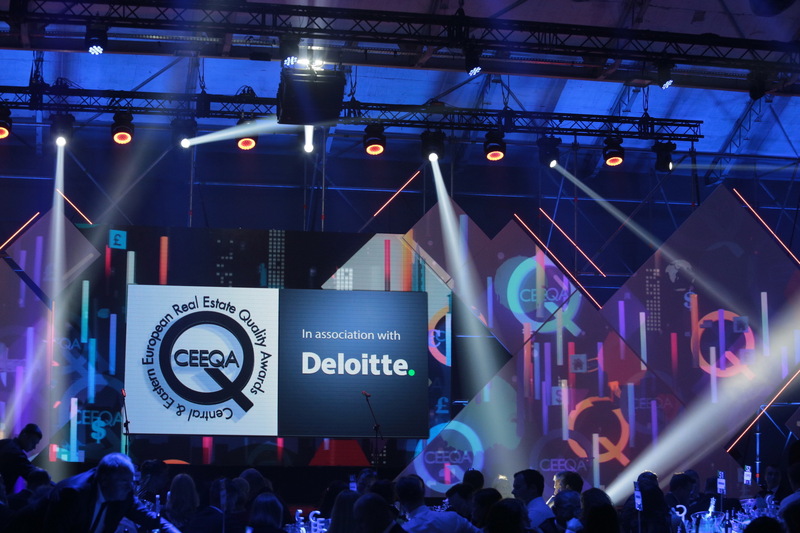 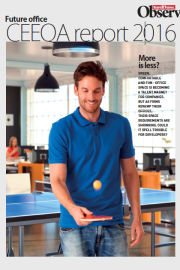  As Deloitte we recognize CEEQA’s mission to project opportunities and successes for market participants as values which Deloitte identifies with as well. 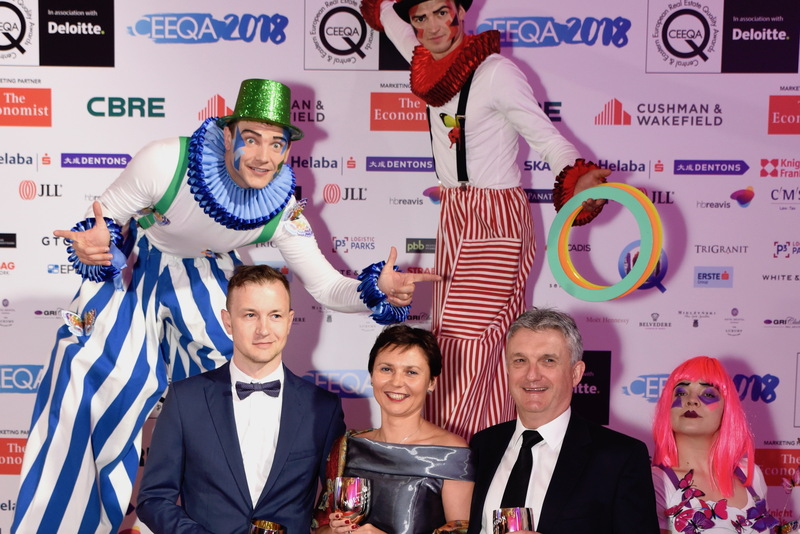 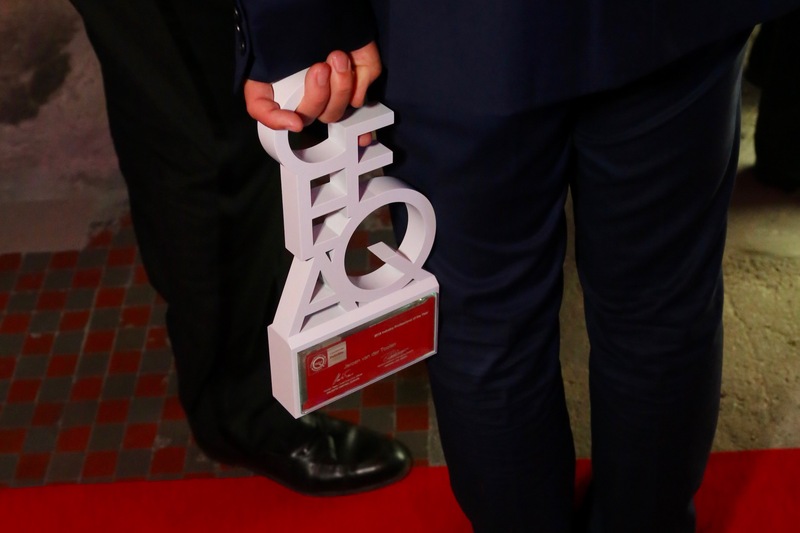 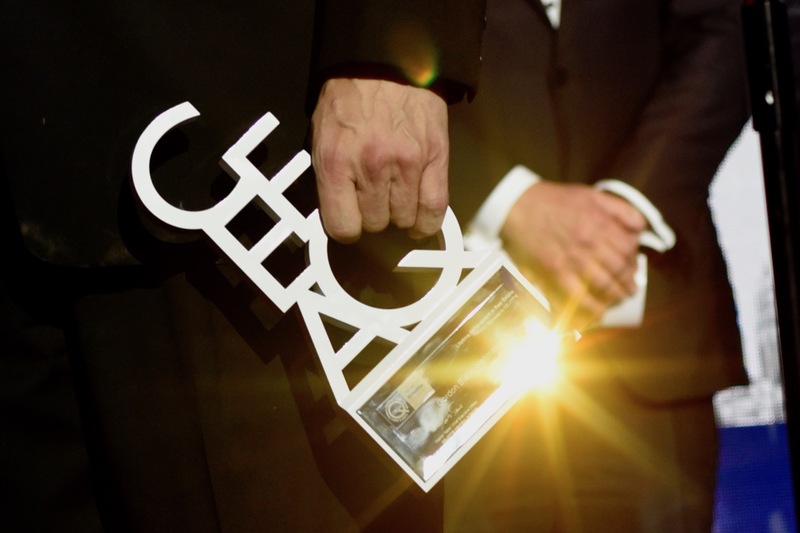 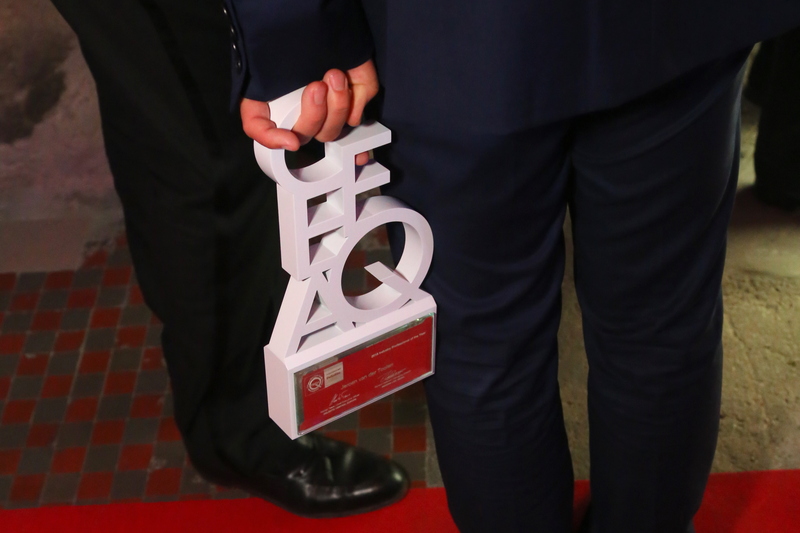 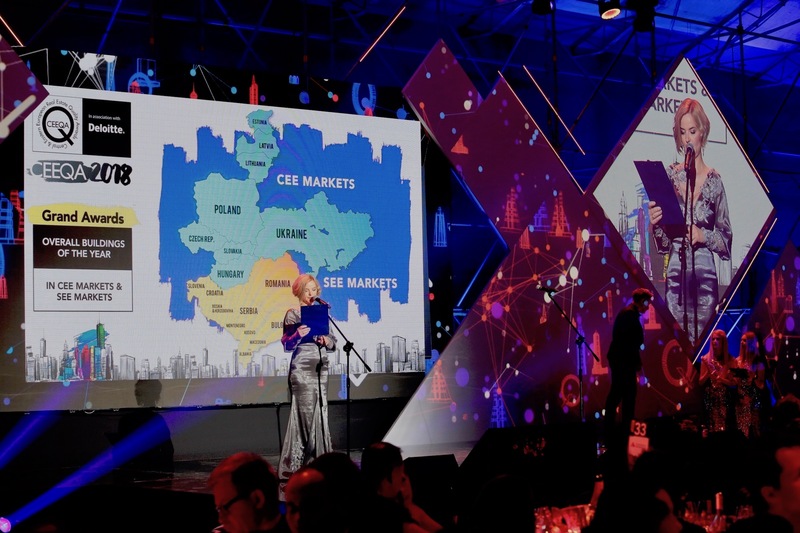 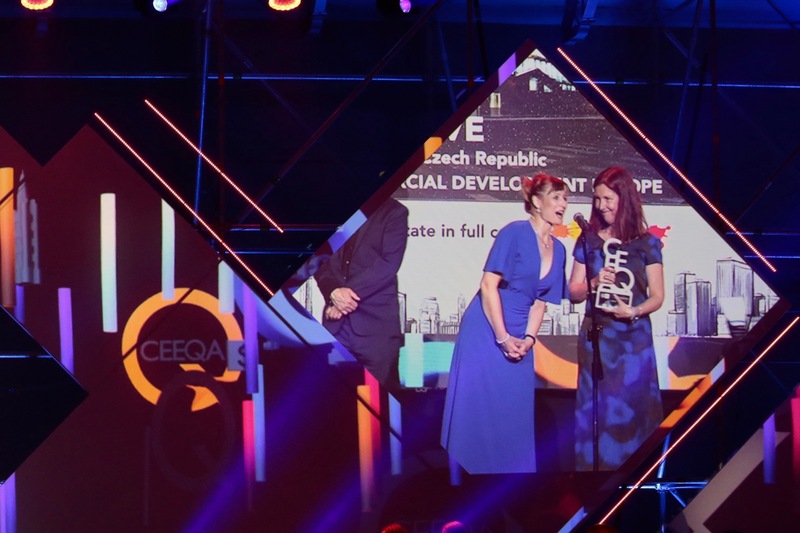 As Leading Partner of CEEQA, we would like to congratulate all the award winners and wish them further successful and challenging projects in this very dynamic market. 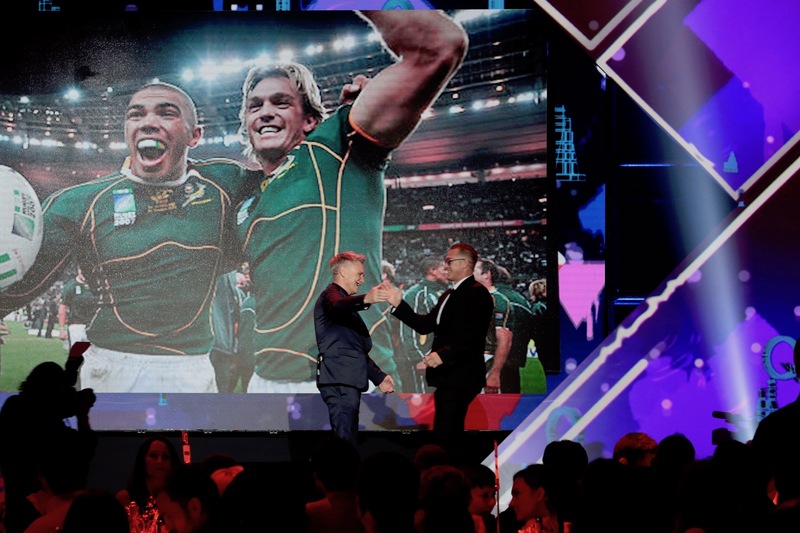 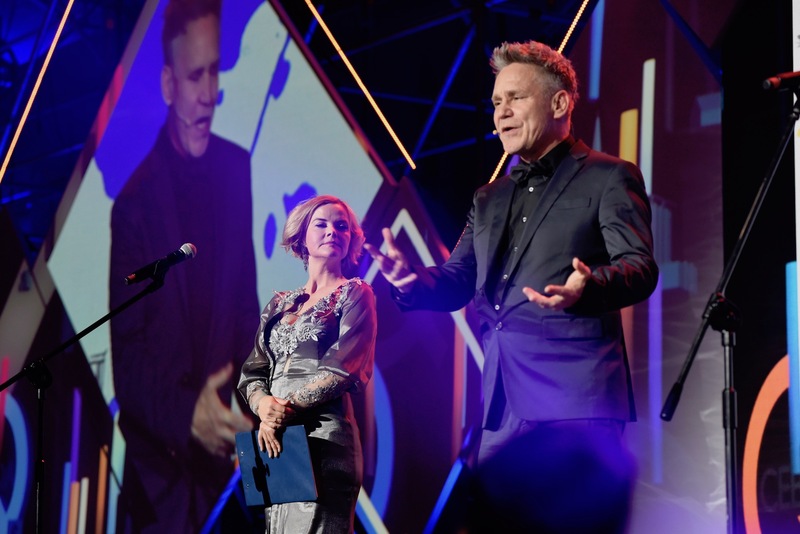 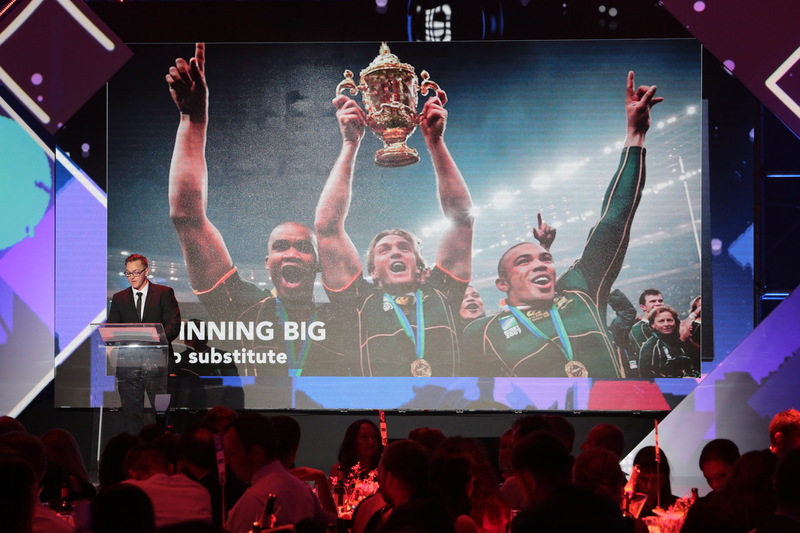 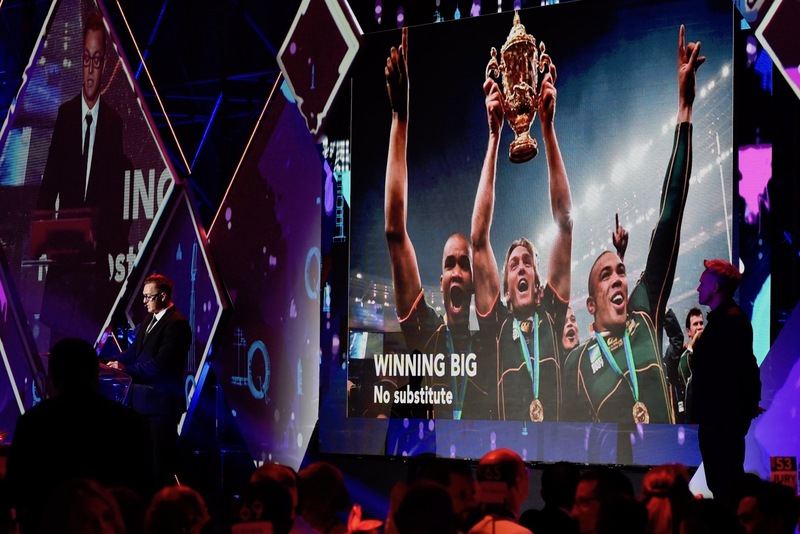 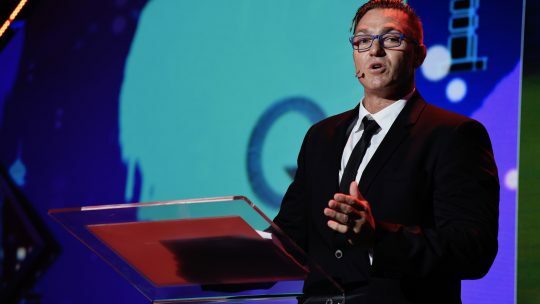 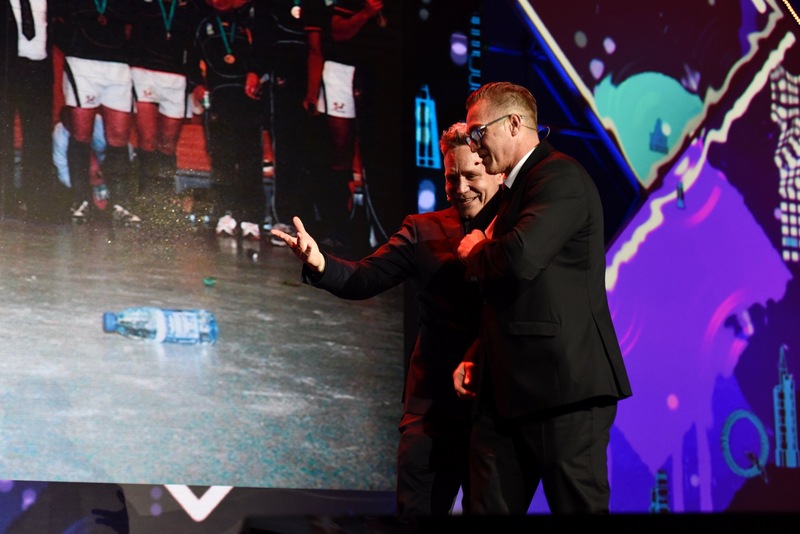 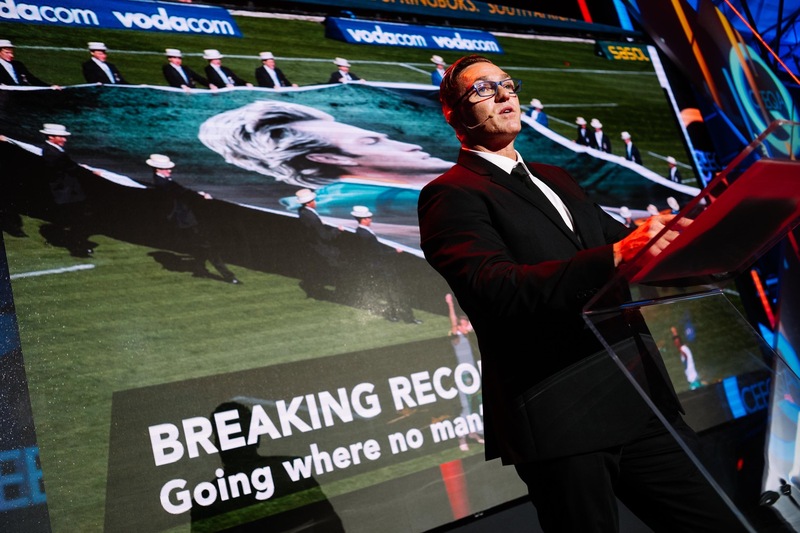 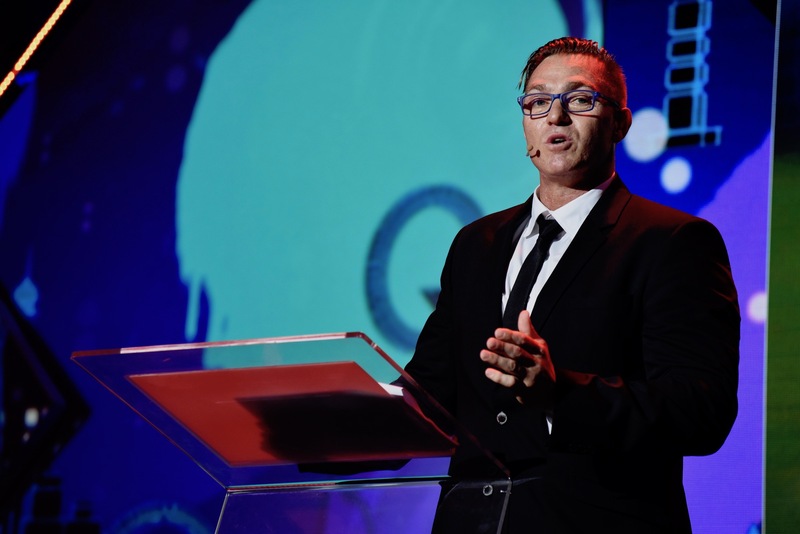 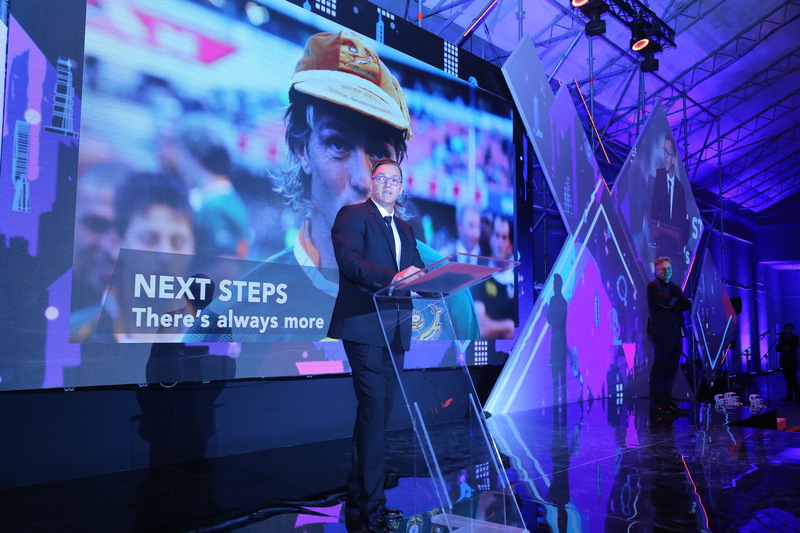 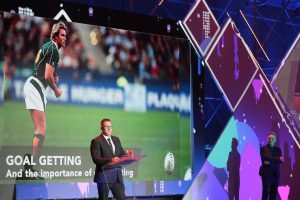 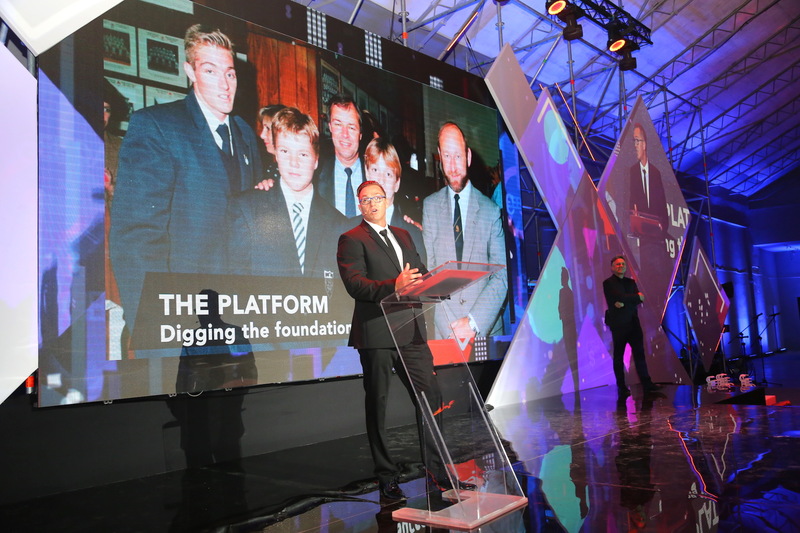 Gala guests were treated to a mide-ceremony motivational pep talk by guest speaker and a proven winner, legendary South African Springbok rugby player Percy Montgomery. 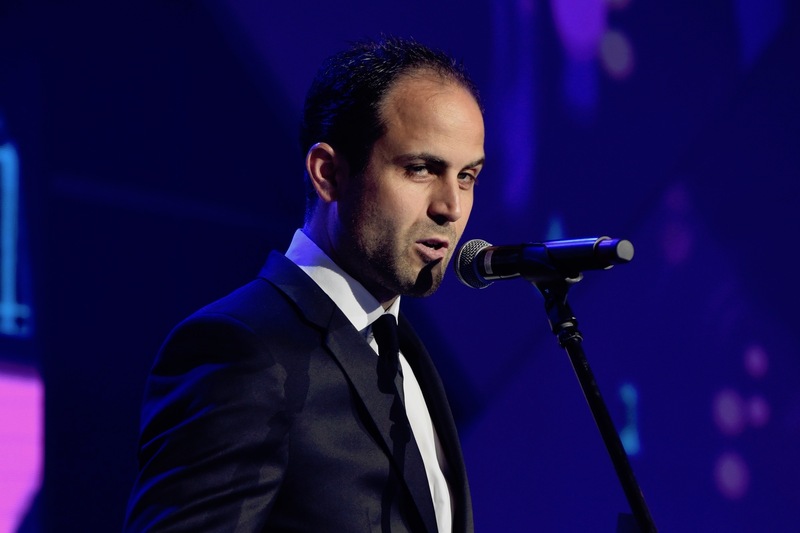 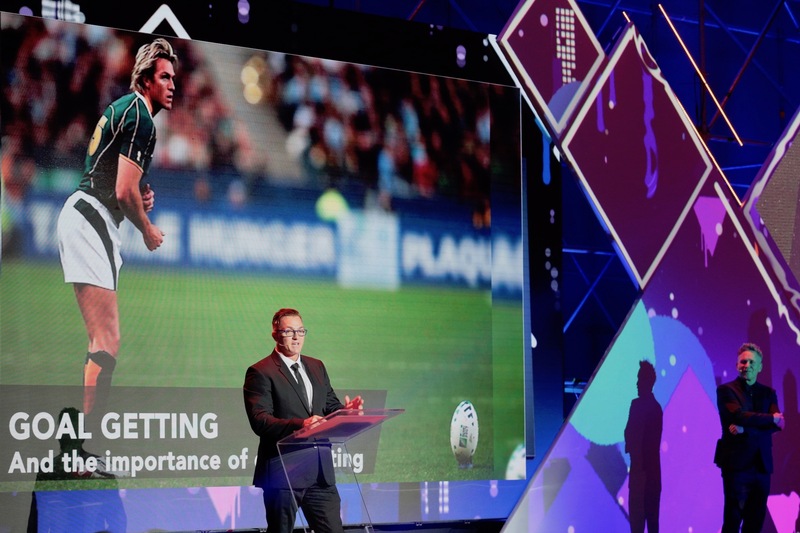 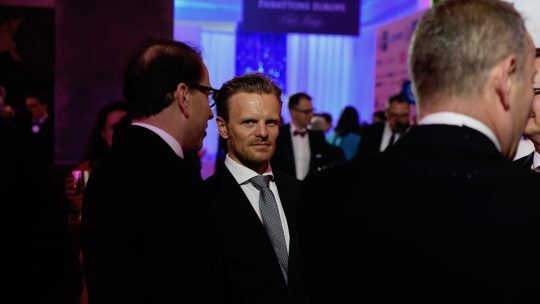 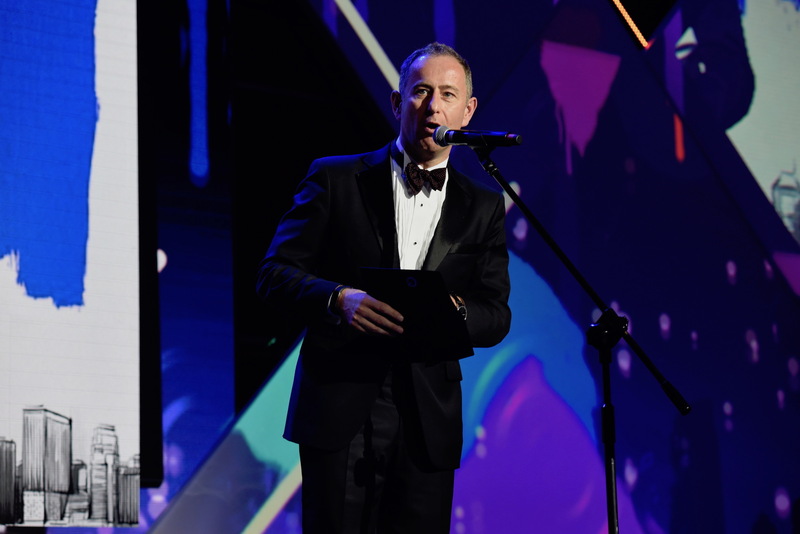 His speech drew parallels with business and sport in the pursuit of excellence, from the sacrifices made in building the platform for success to the importance of goal setting, teamwork and digging deep when things don’t go right to the rewards of winning big and the focus required to raise the bar and set new records. 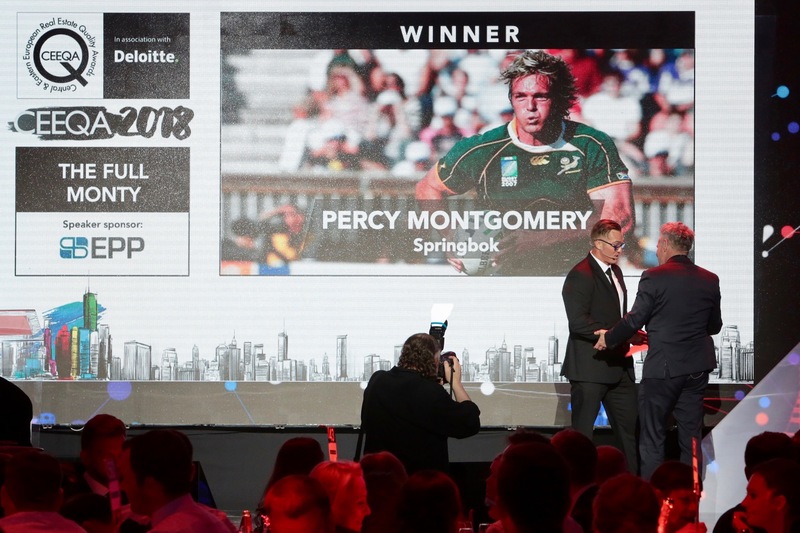 Celebrated for the accuracy of his left boot and his electric pace, “Monty” was the first player in South African rugby history to play 100 Test matches for the national “Springbok” team and a decade after his retirement still holds the record for the most points scored by a Springbok player. 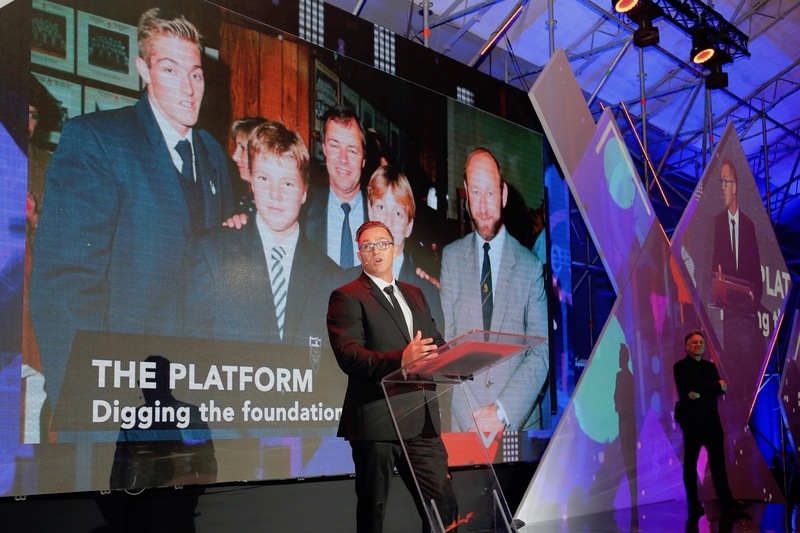 A true legend of the game, he was a Rugby World Cup winner for the national team in 2007 among a host of international and provincial rugby honours and more than 90 playing records set over a 12 year first class rugby career. 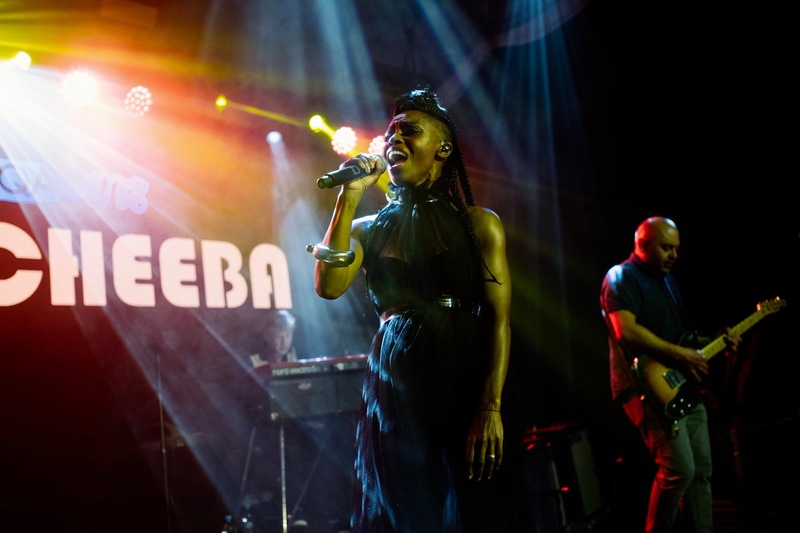 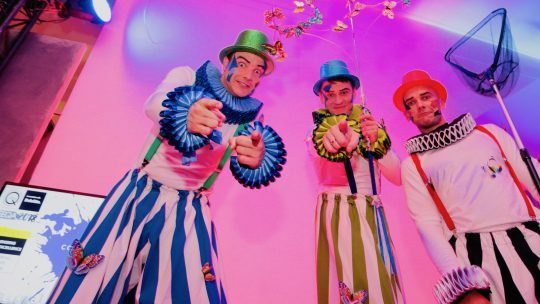 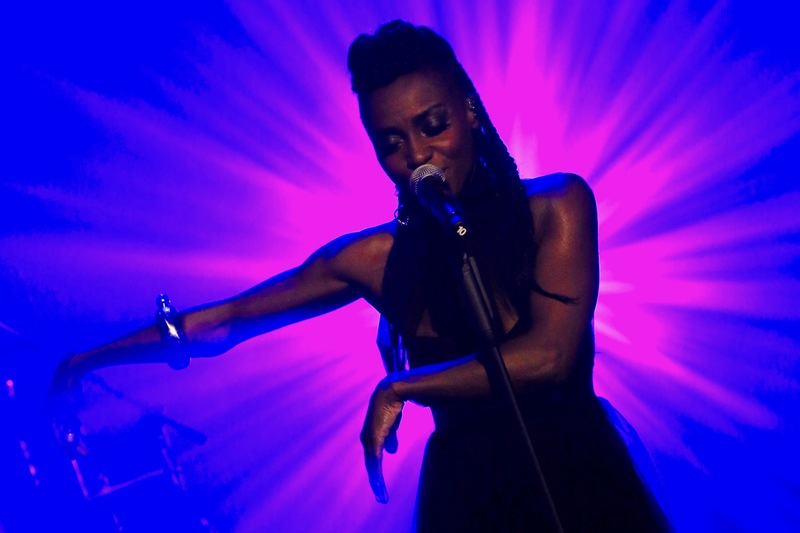 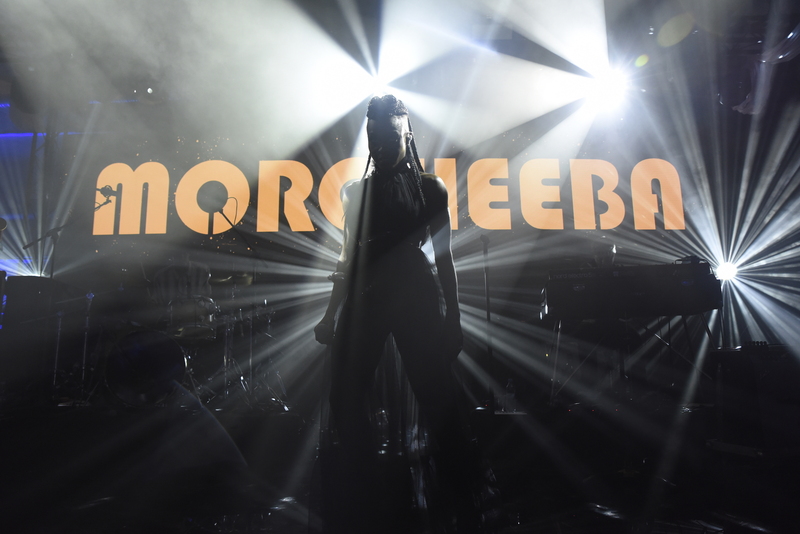 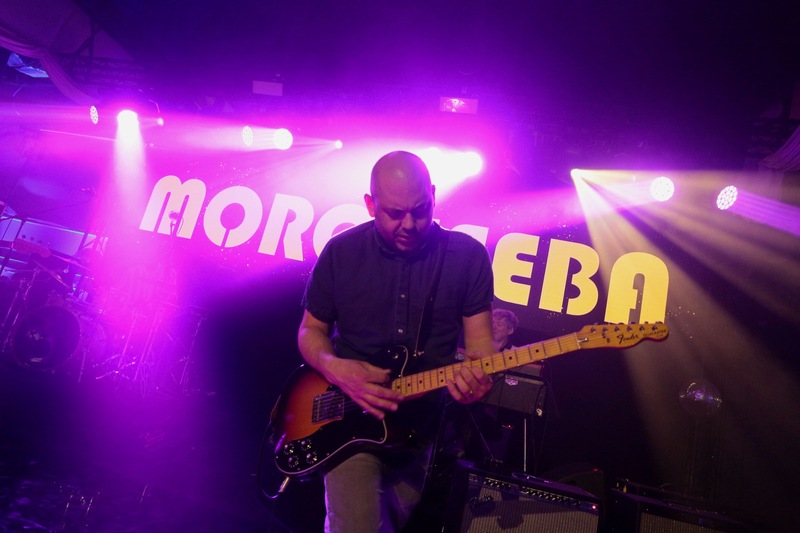 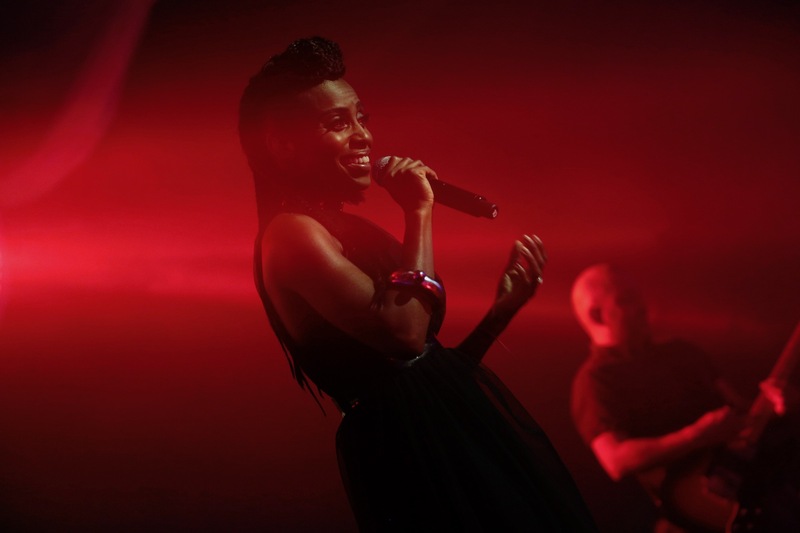 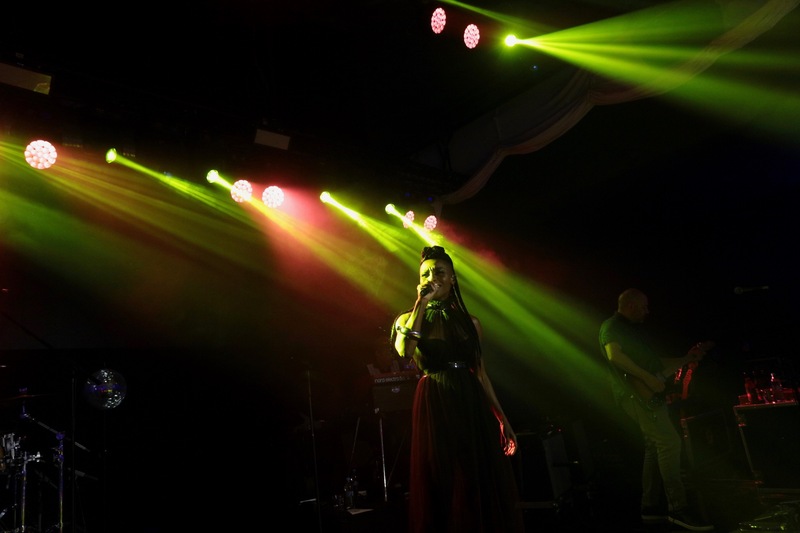 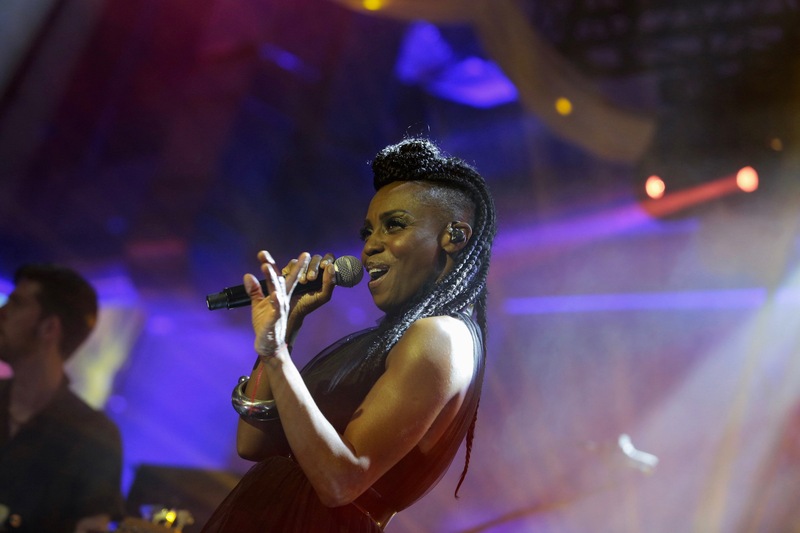 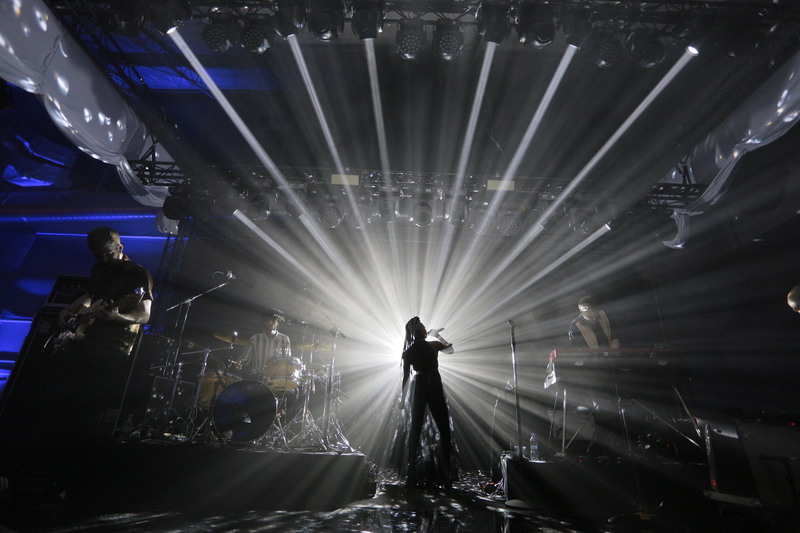 Due to release its ninth album, the band rose to prominence in the mid-nineties at the forefront of the trip-hop genre, touring the world and selling over 10 million albums across two decades including the hit album “Big Calm”. They did not disappoint. 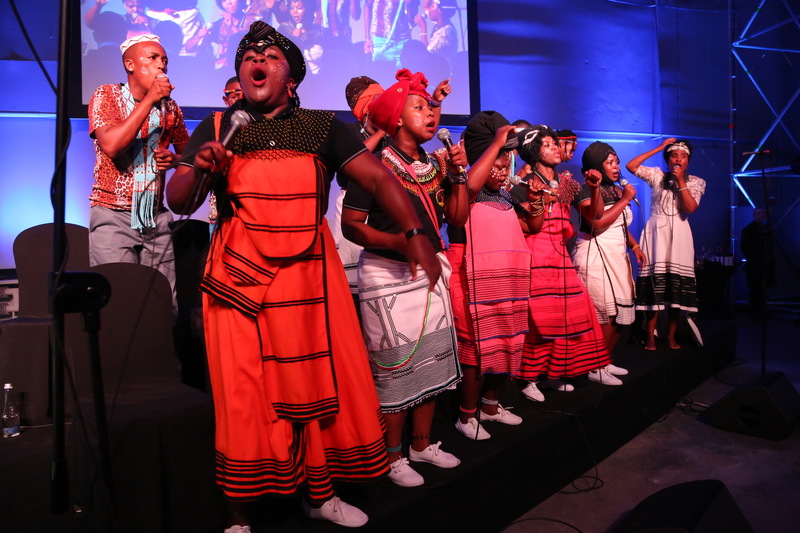 Joining the South African invasion for a pre-dinner concert and beautifully serenading the awards ceremony was this Isibane se Afrika group of gospel singers flown in from Cape Town especially for the occasion, as was Johannesburg based entertainment legend Jacques Lagesse to serenaded the champagne reception with his unique silky voice and repertoir of crooner staples and contemporary ballads. 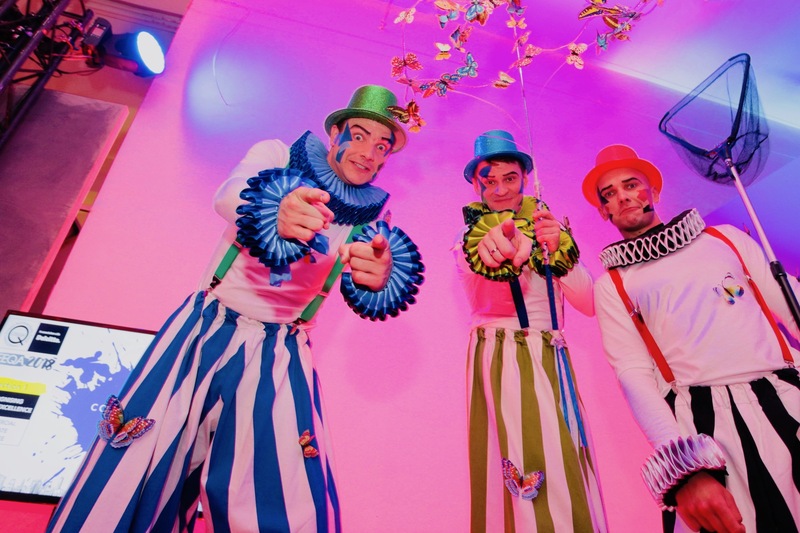 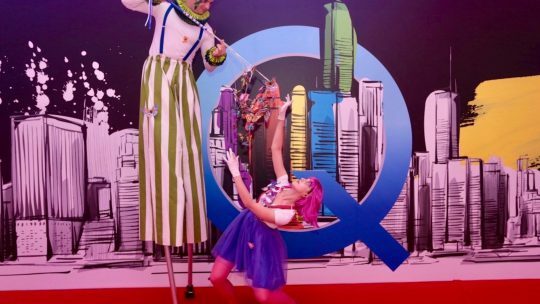 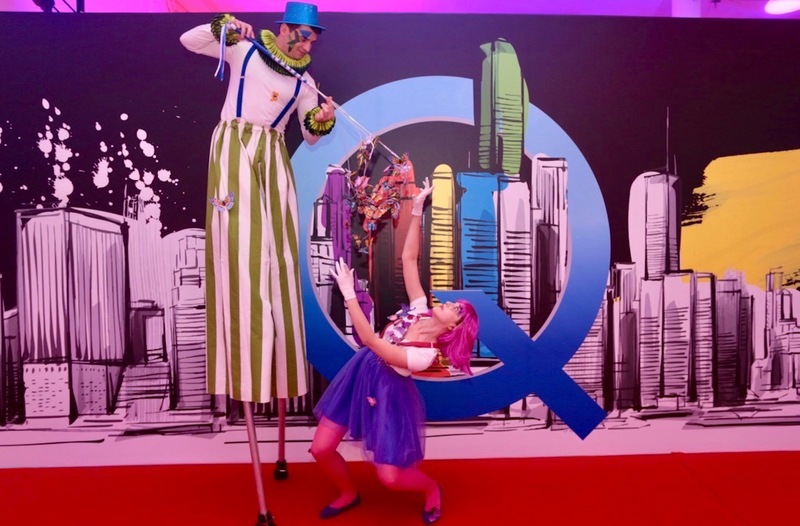 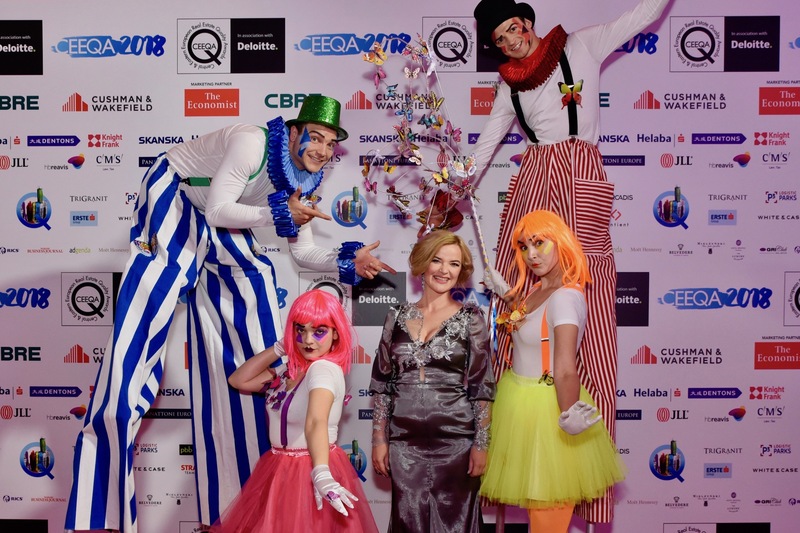 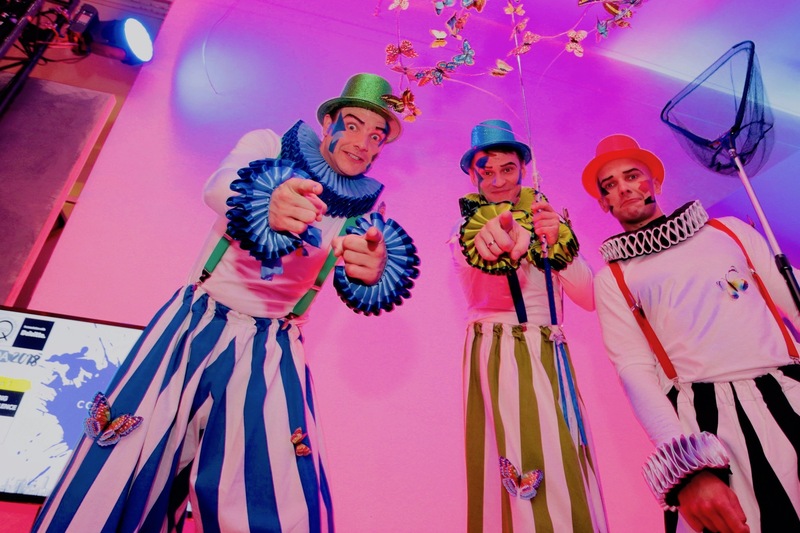 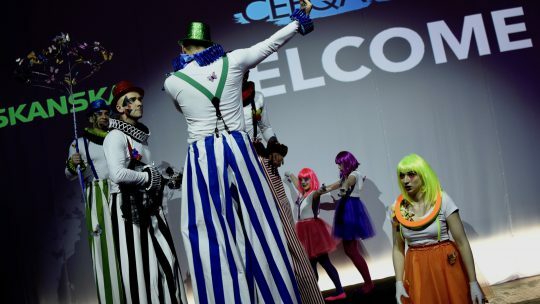 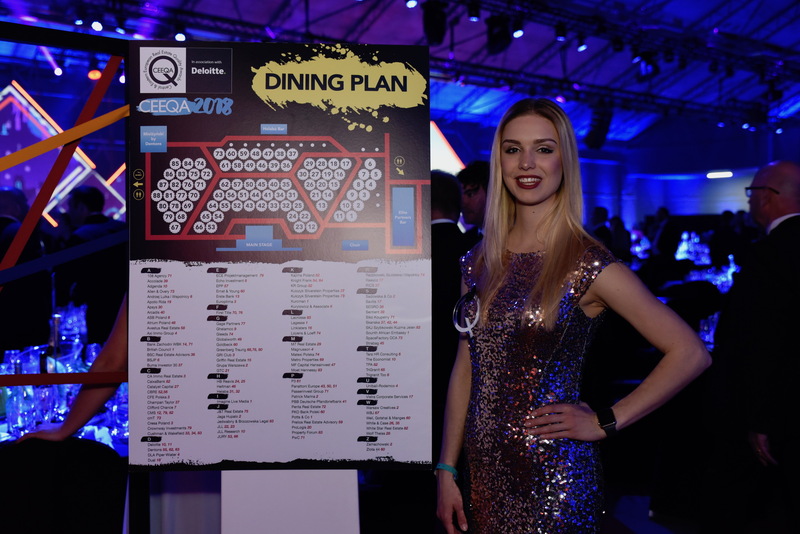 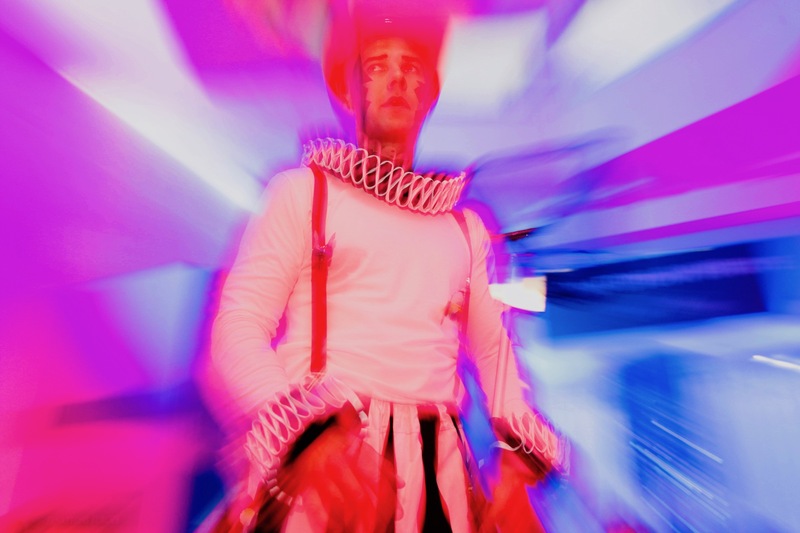 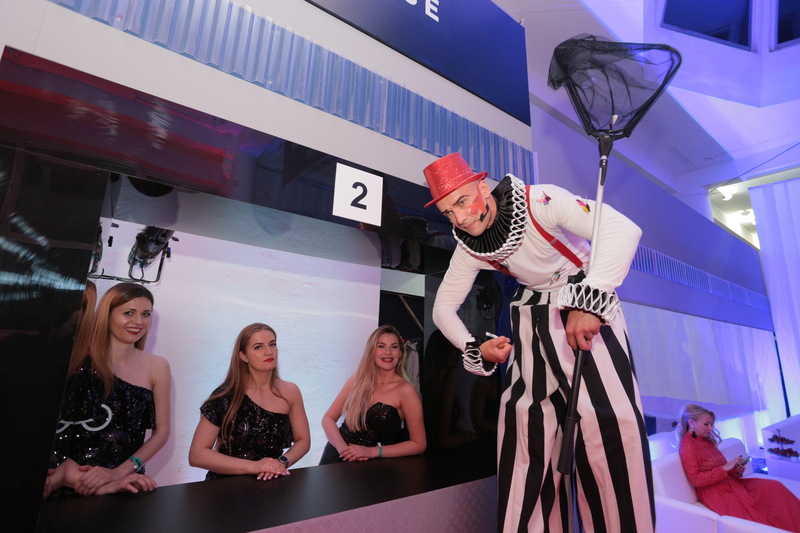 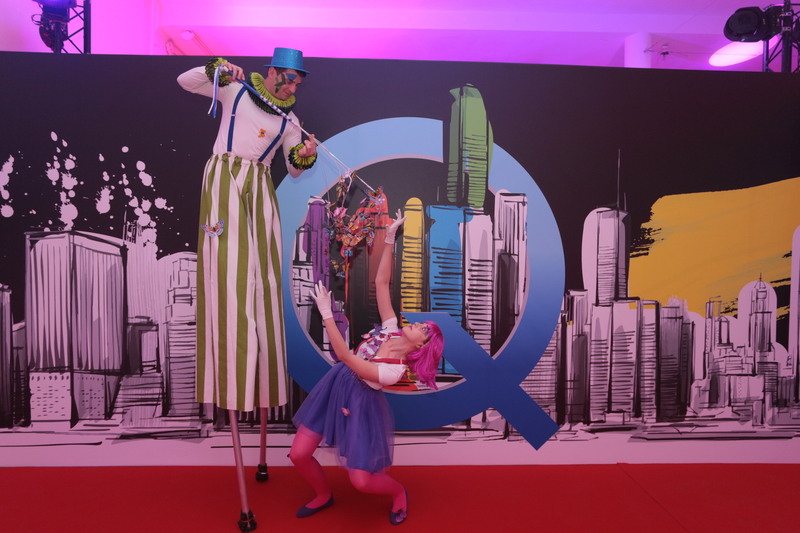 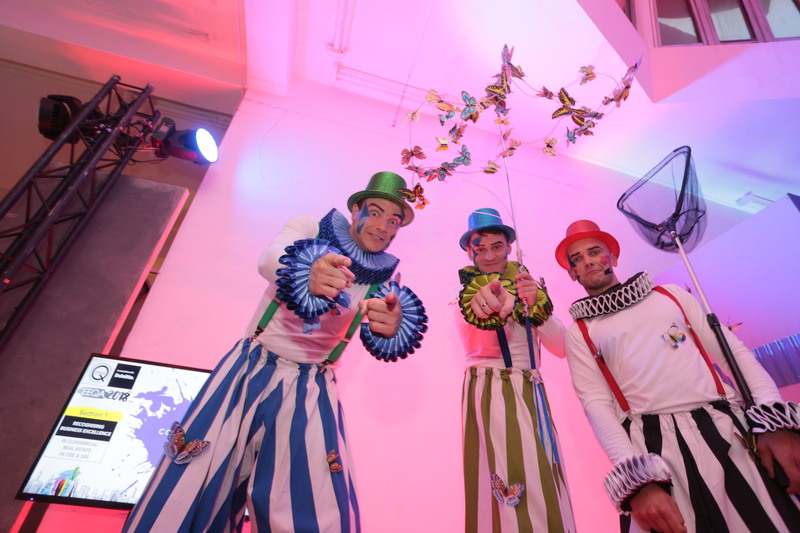 Regular CEEQA gadlfies, Warsaw based mime troupe Mimello, put in their usual shift of keeping guests amused and moving from the Media Wall to their dining seats. 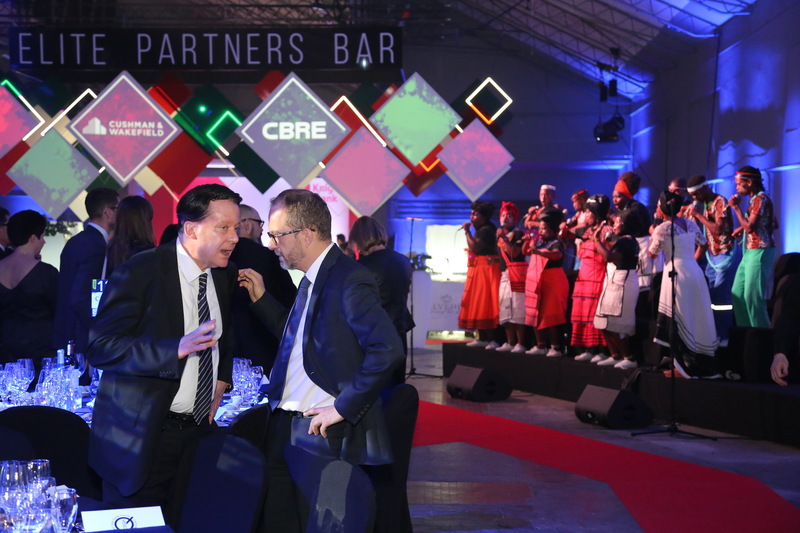 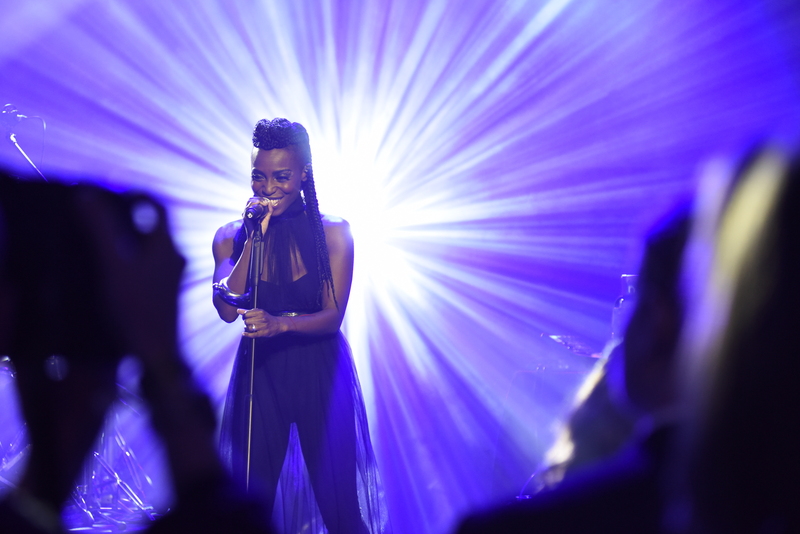 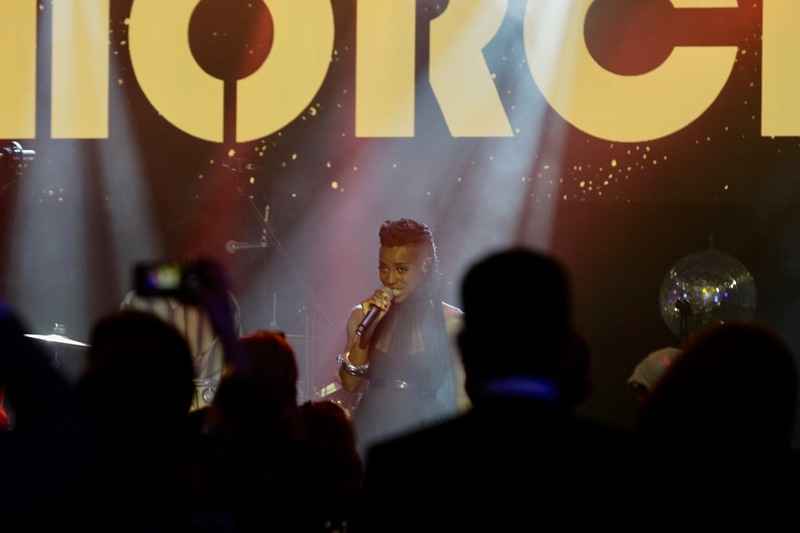 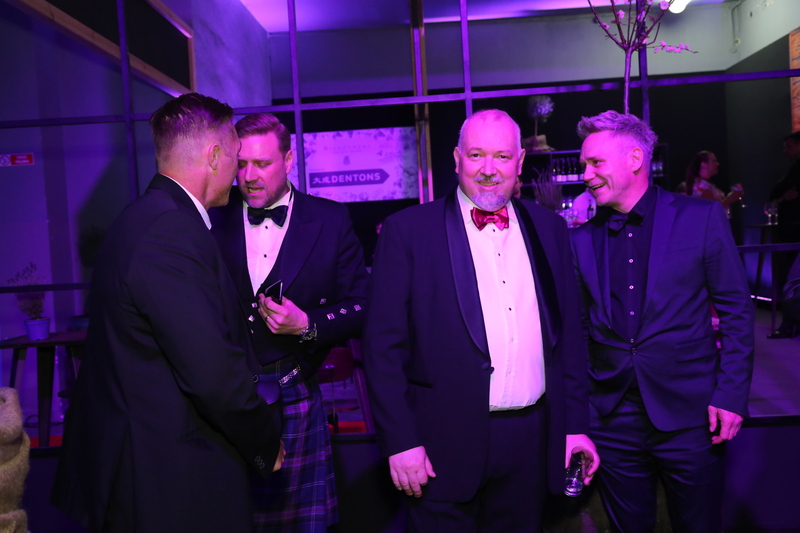 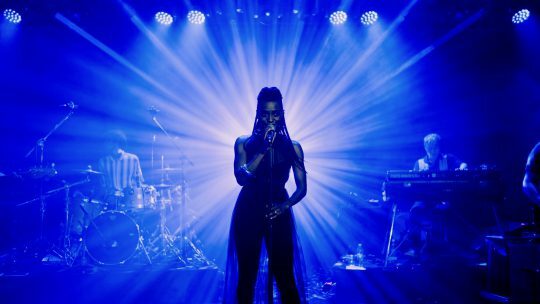 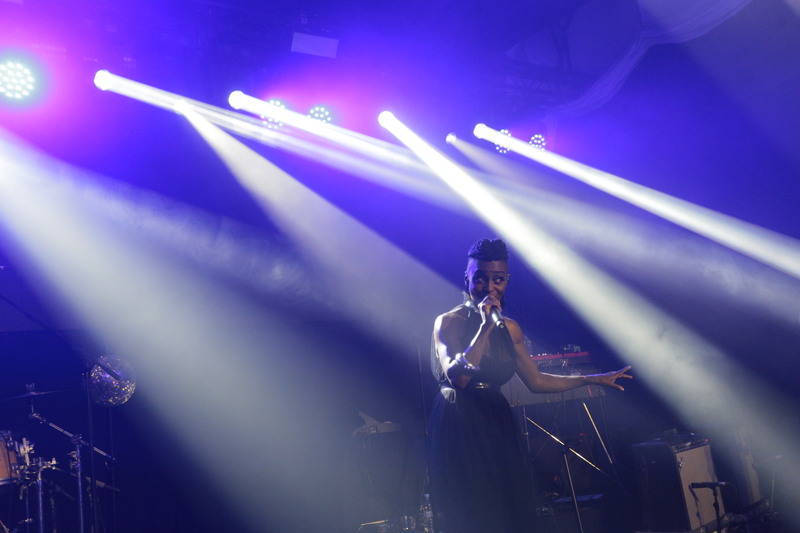 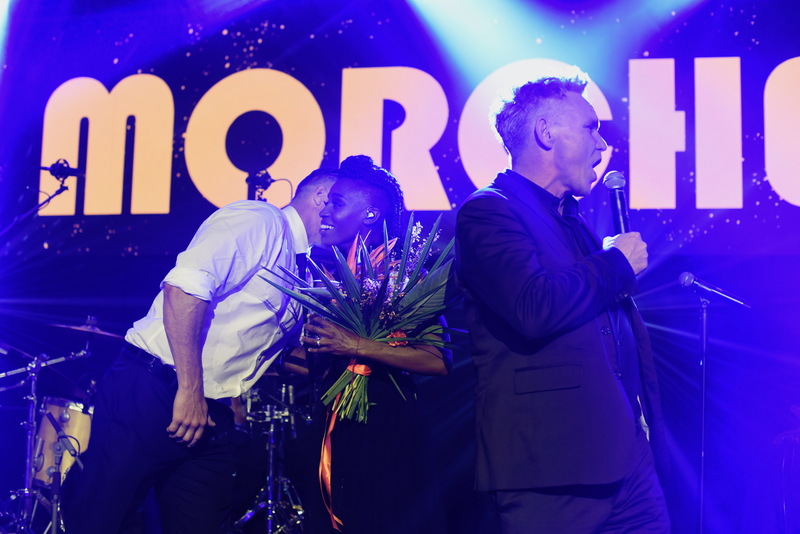 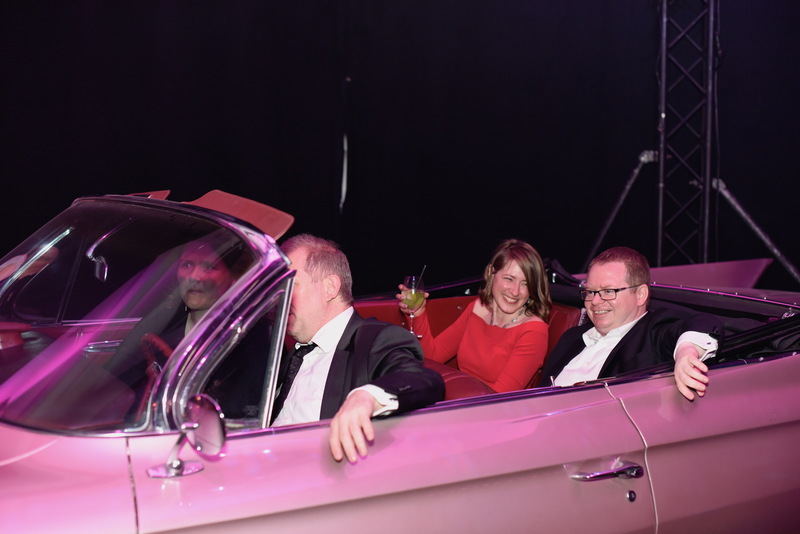 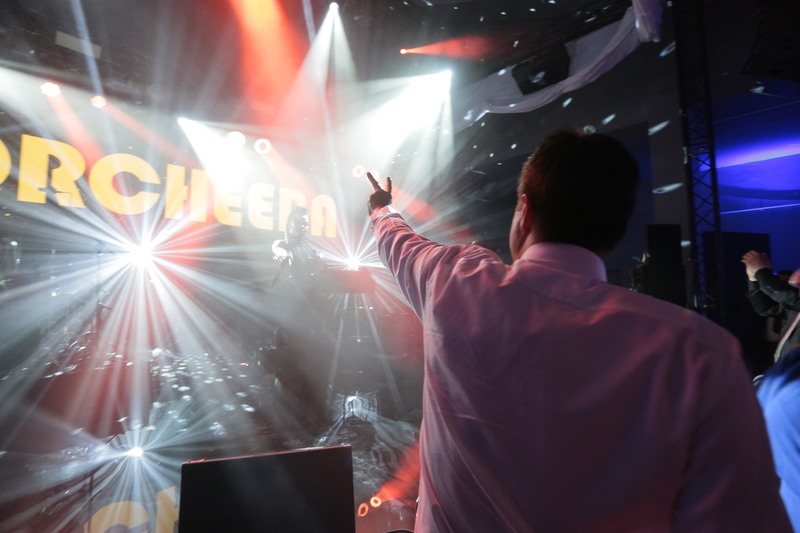 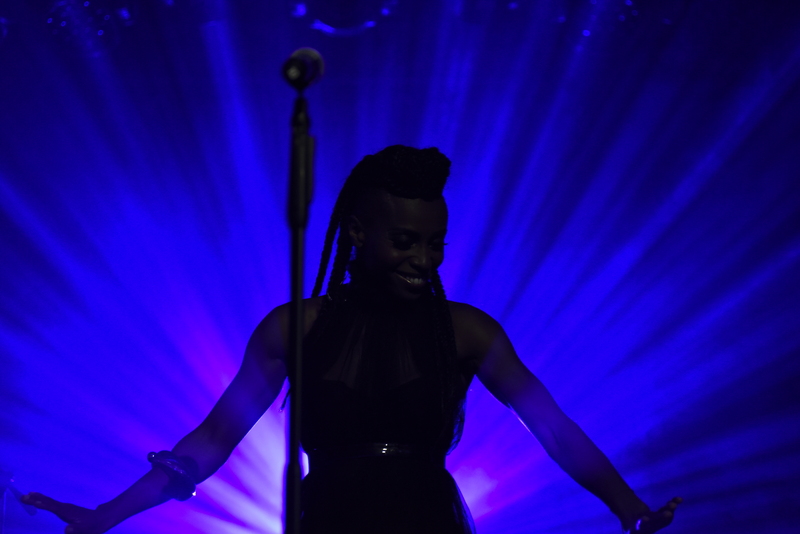 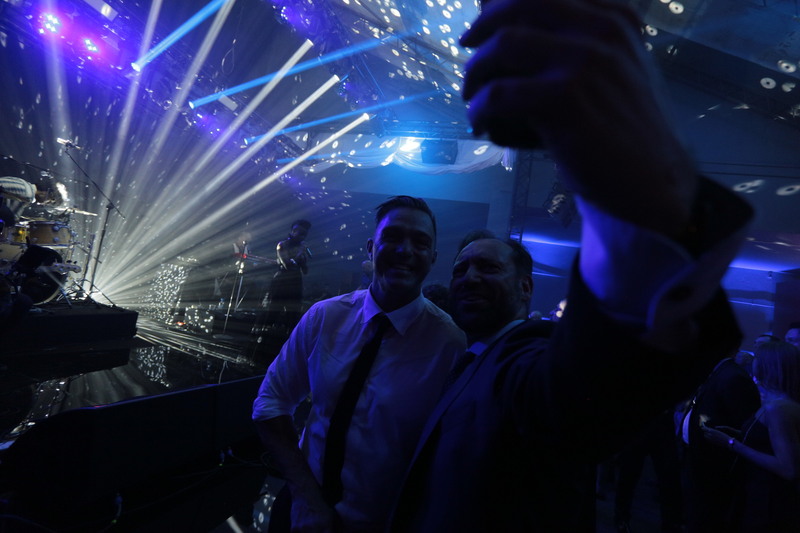 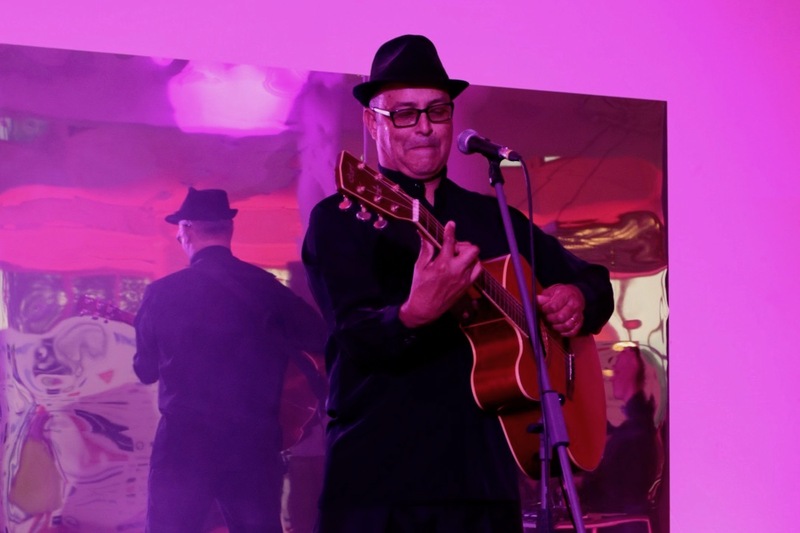 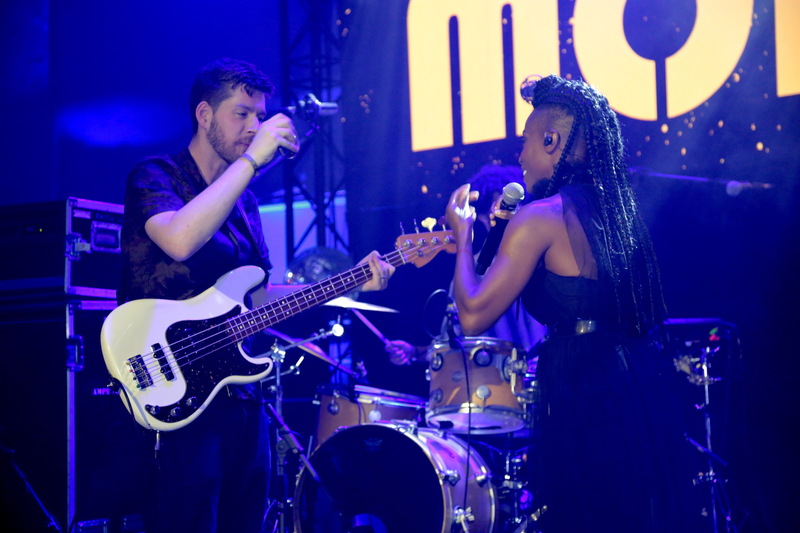 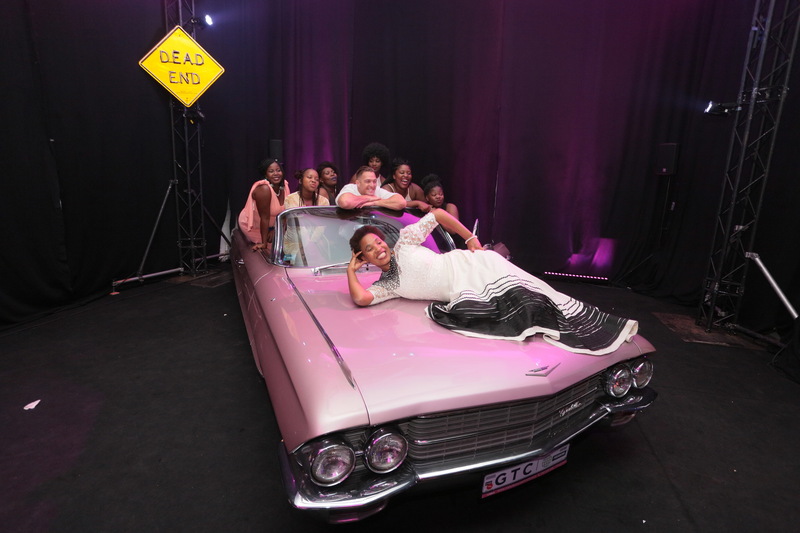 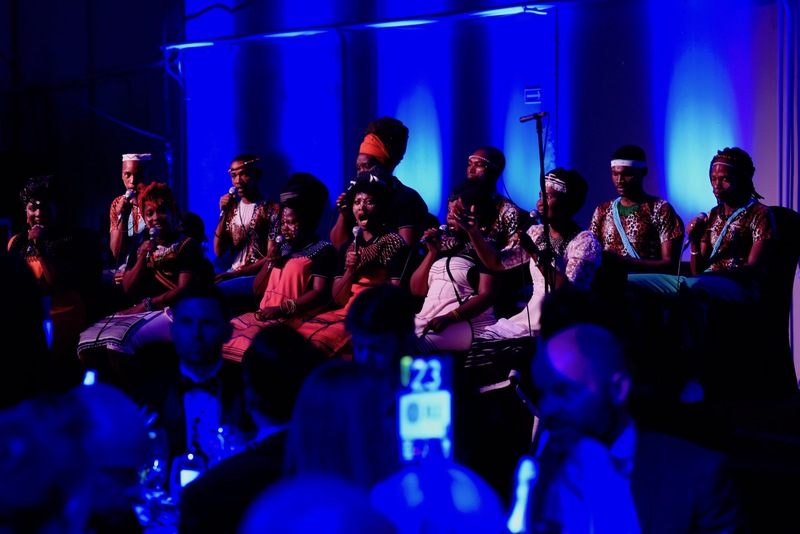 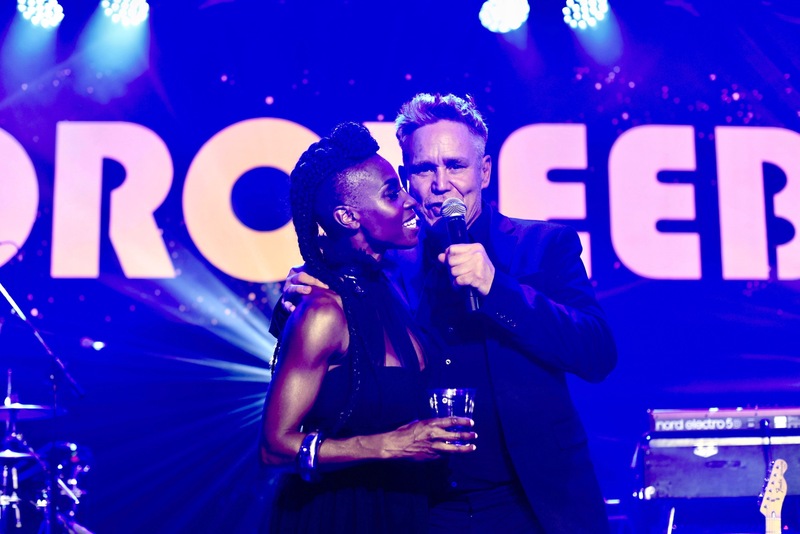 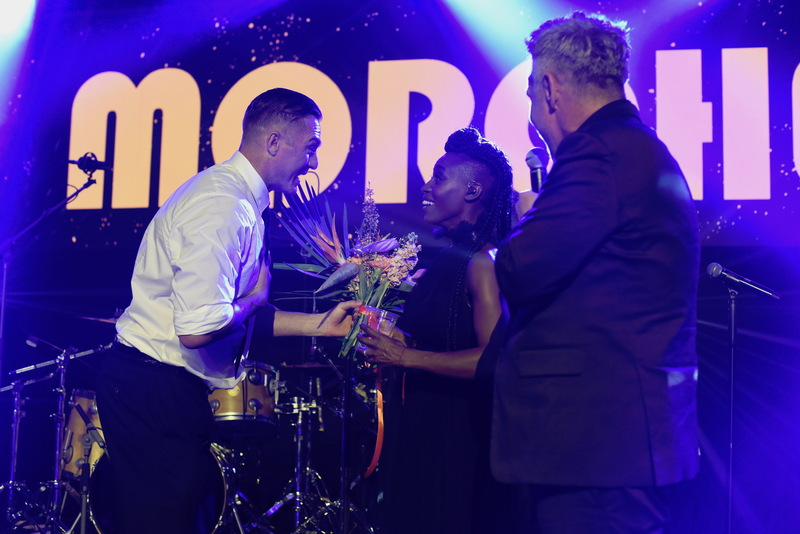 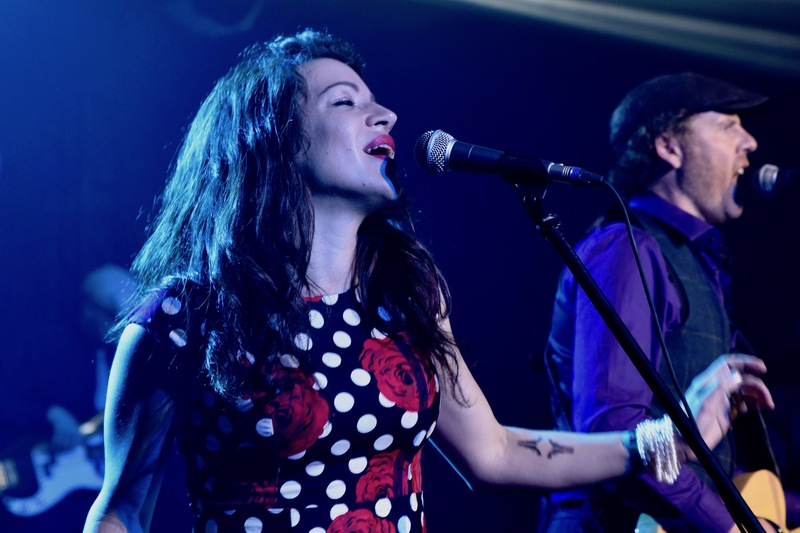 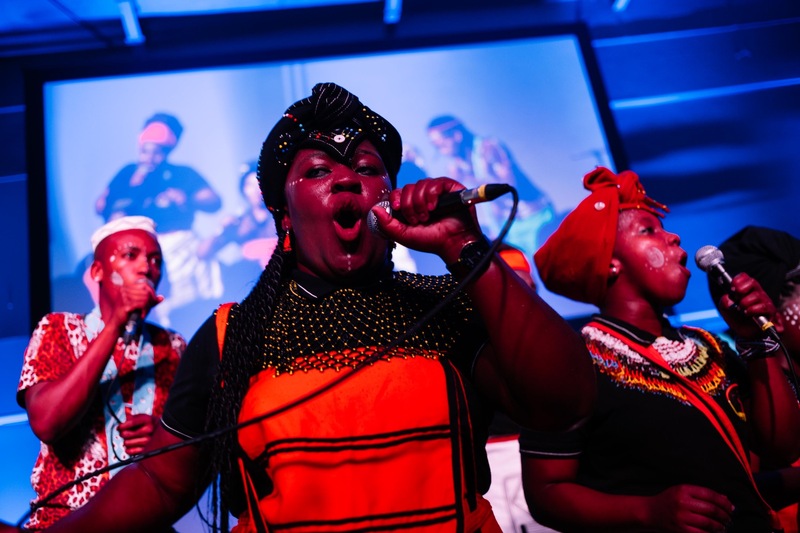 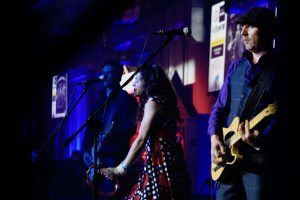 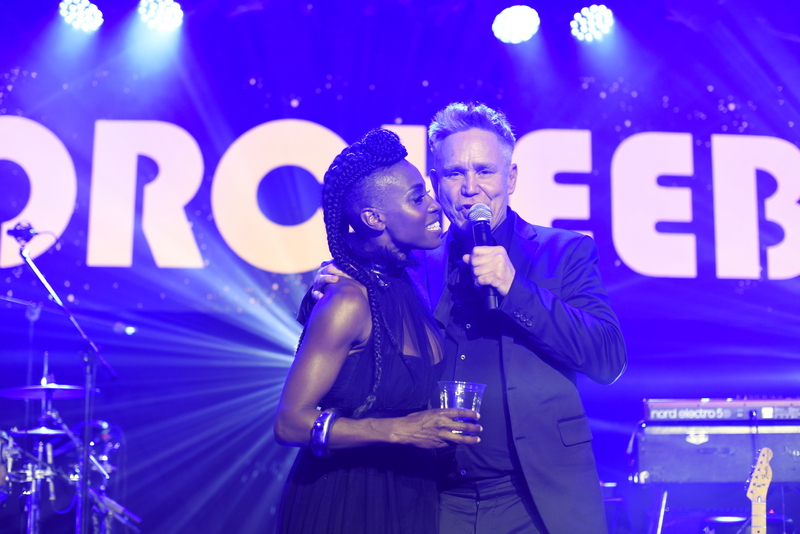 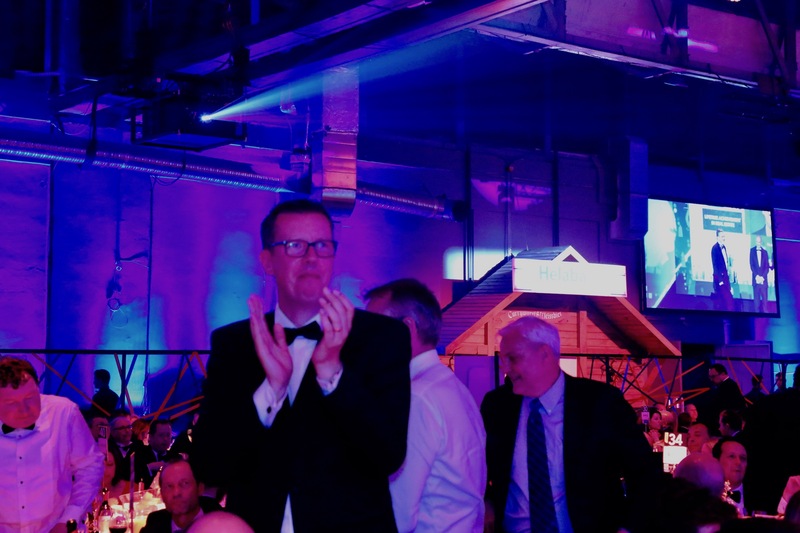 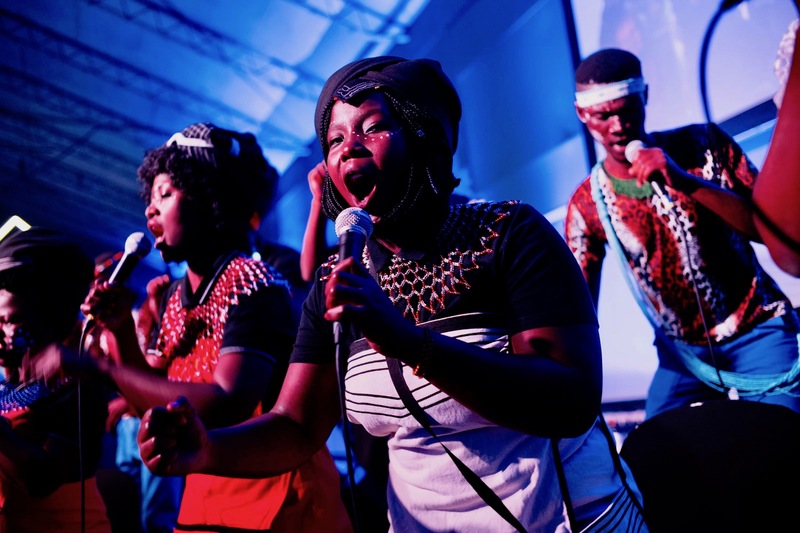 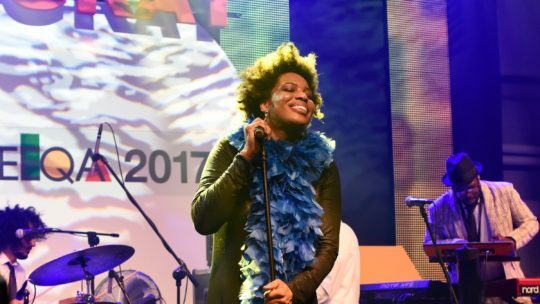 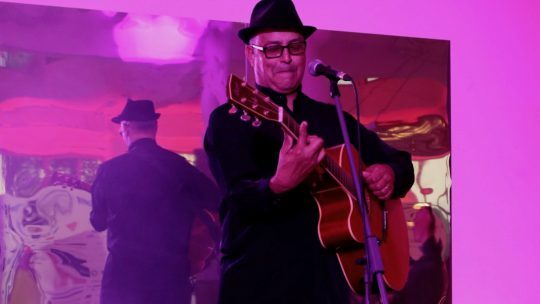 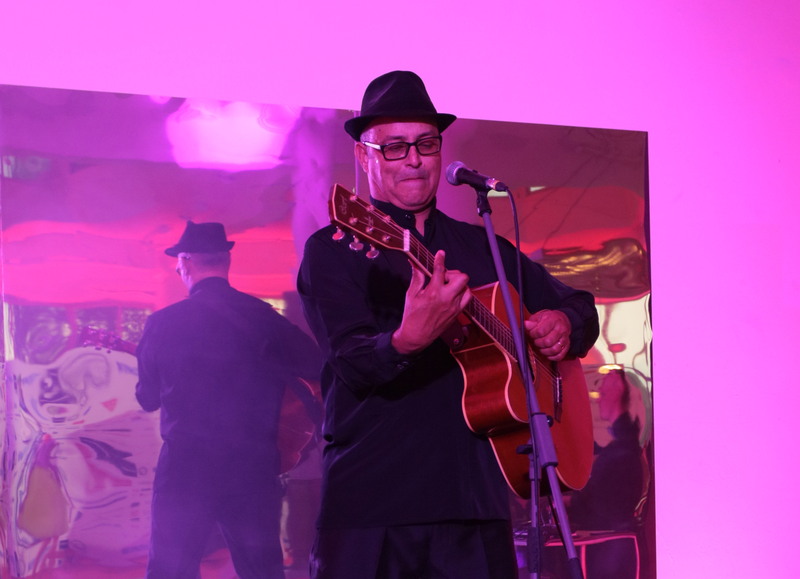 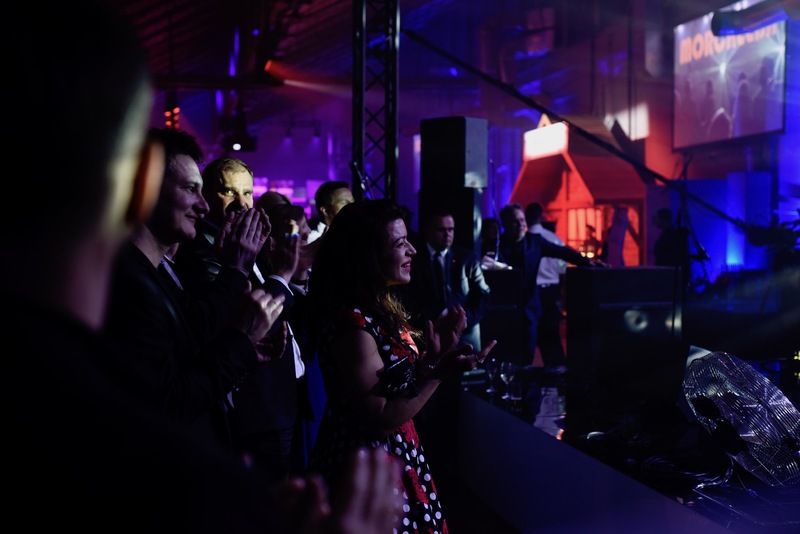 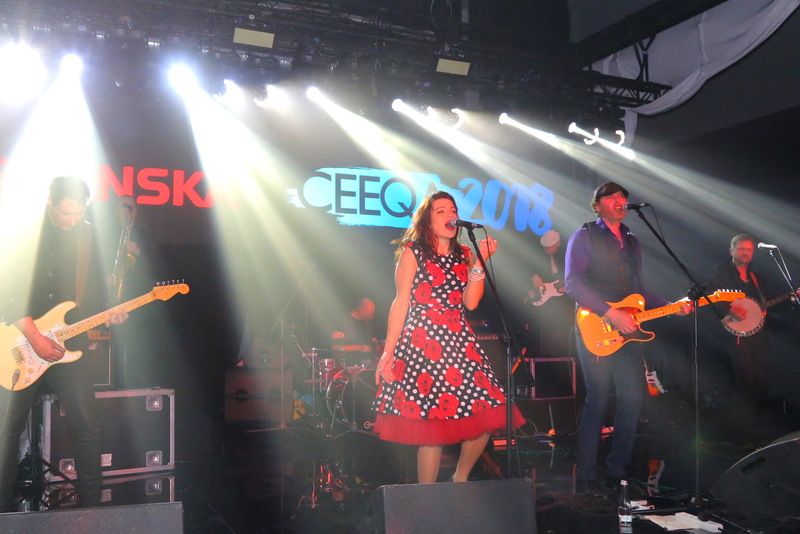 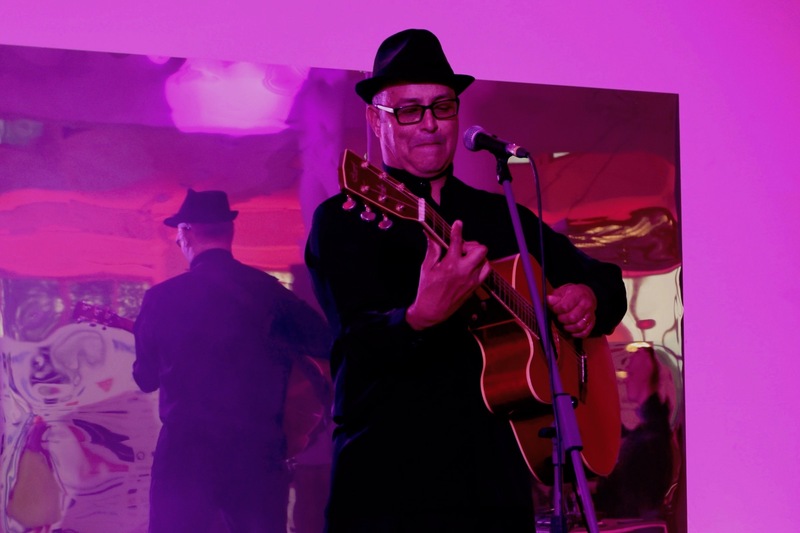 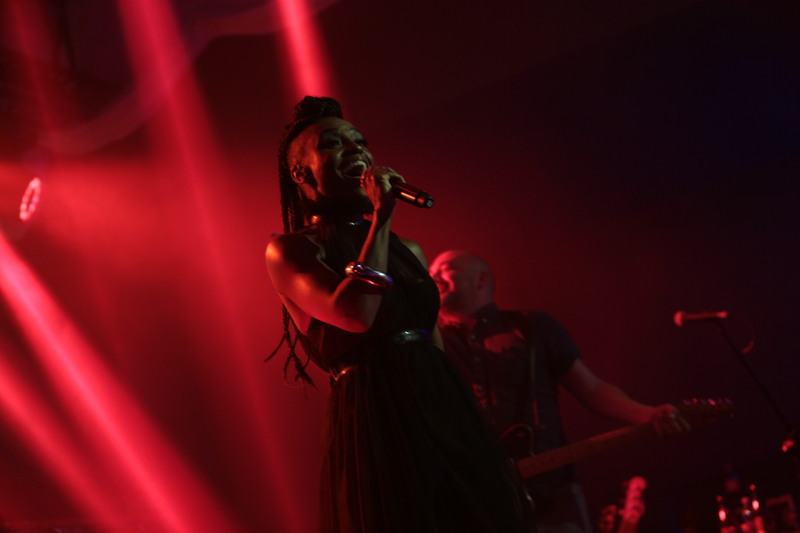 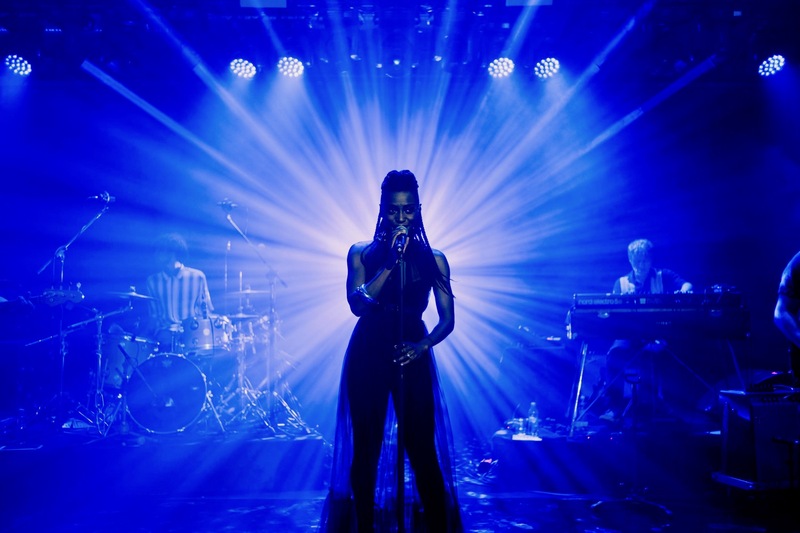 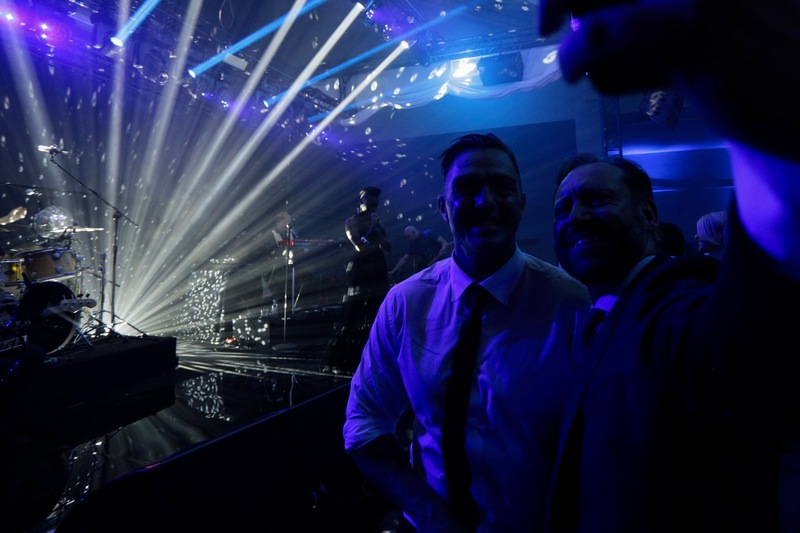 A superb late night set by Jim Ogden & the Lumberjacks, joined on stage at the end of the set by members of the gospel choir, and the perennial DJ Trent rounded off another unforgettable flagship annual gathering for the New Europe property sector. 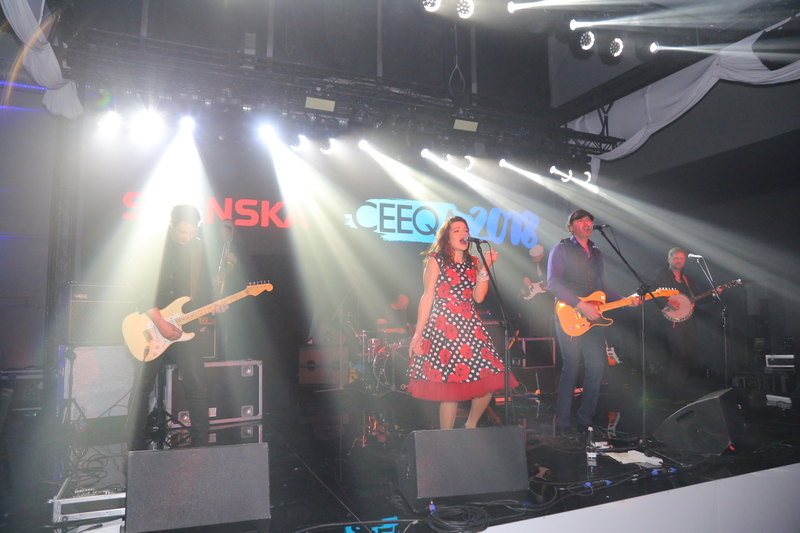 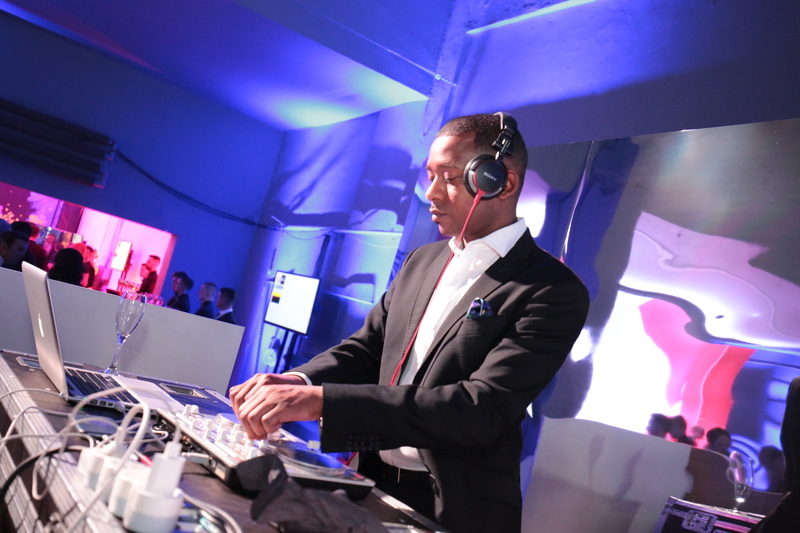 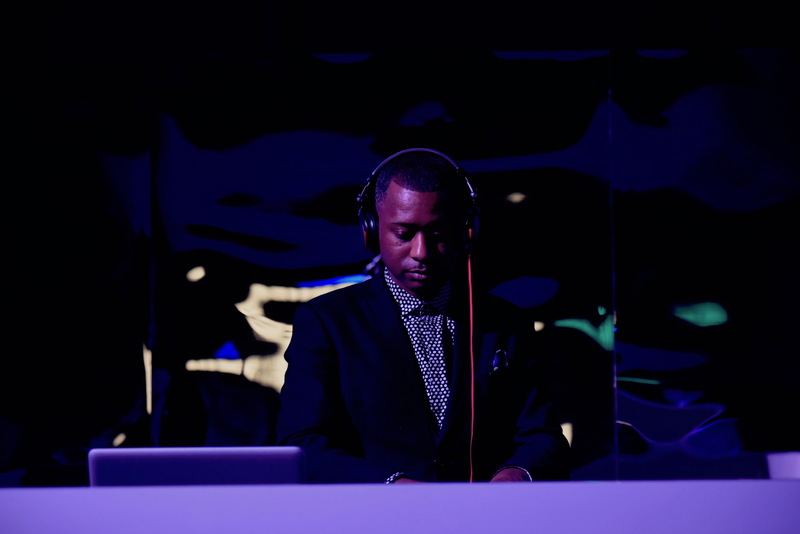 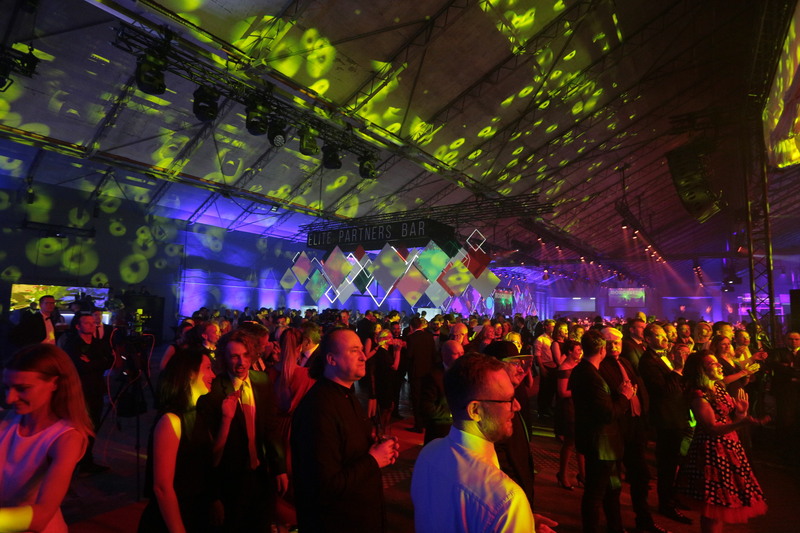 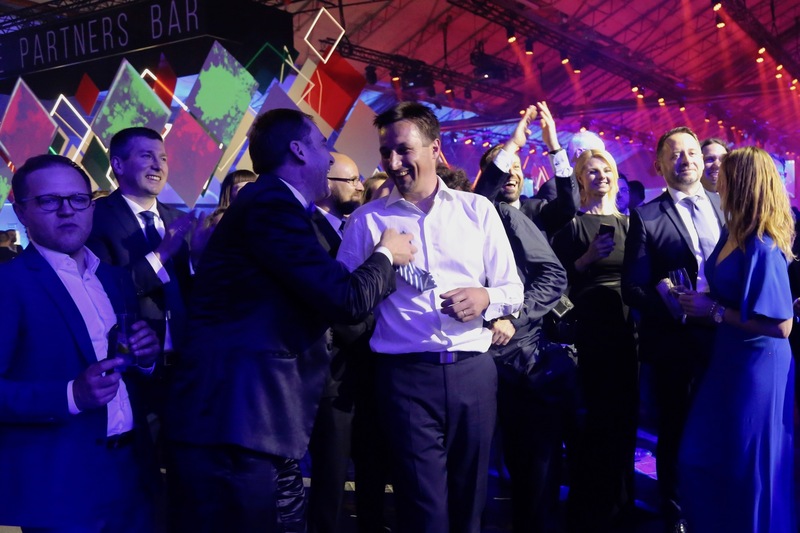 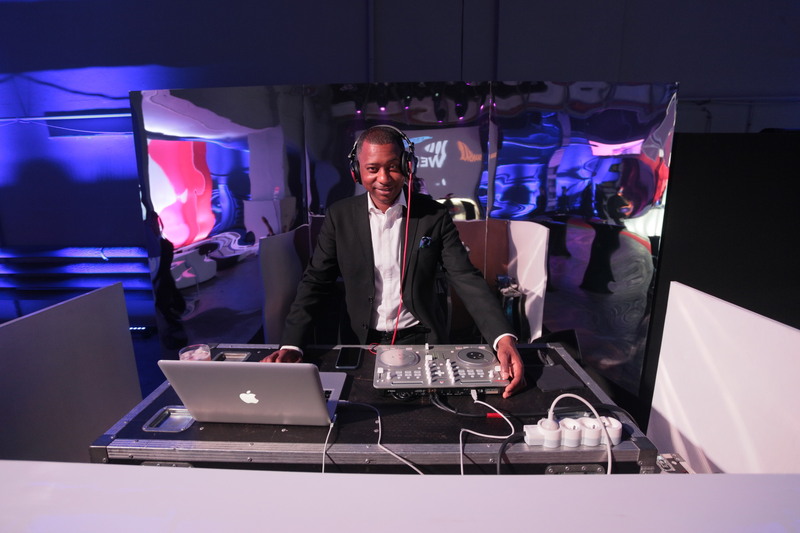 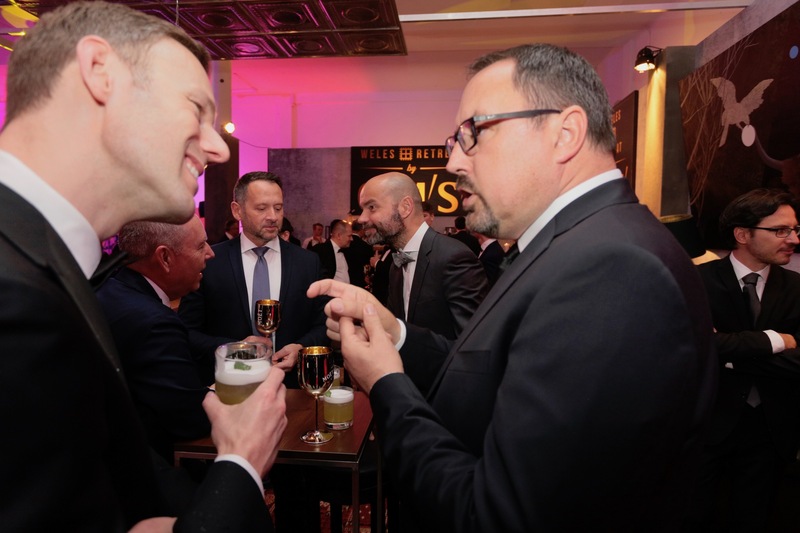 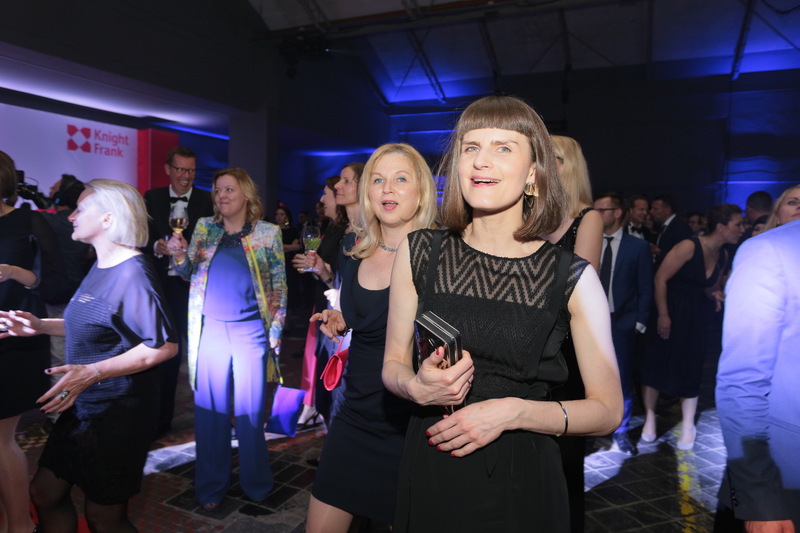 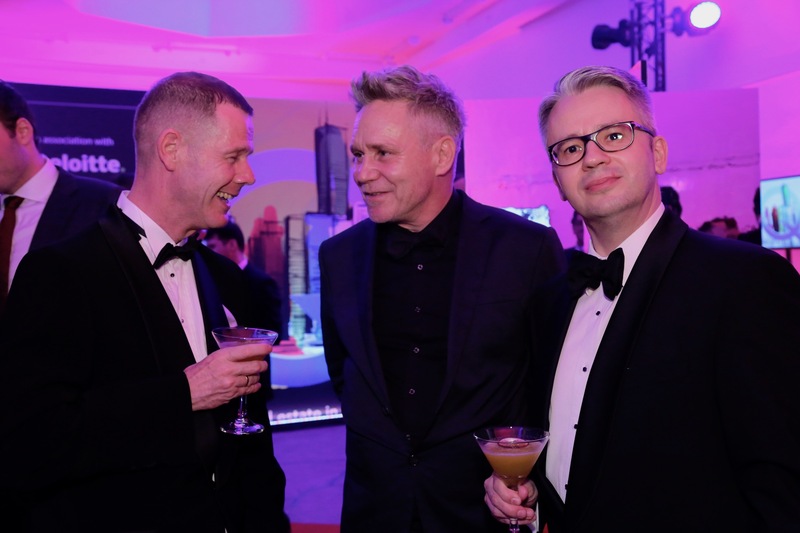 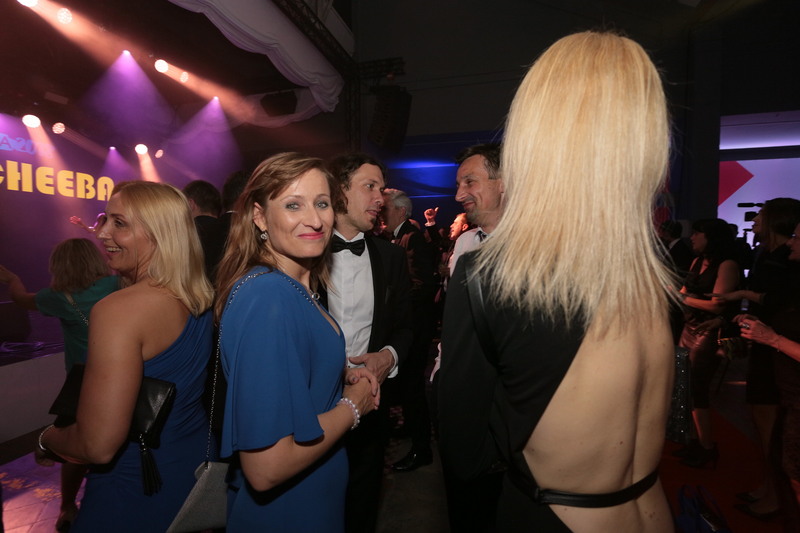 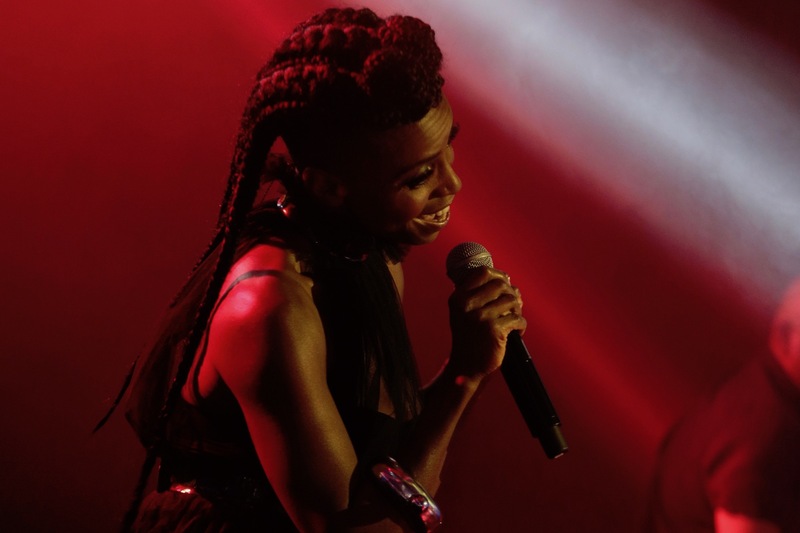 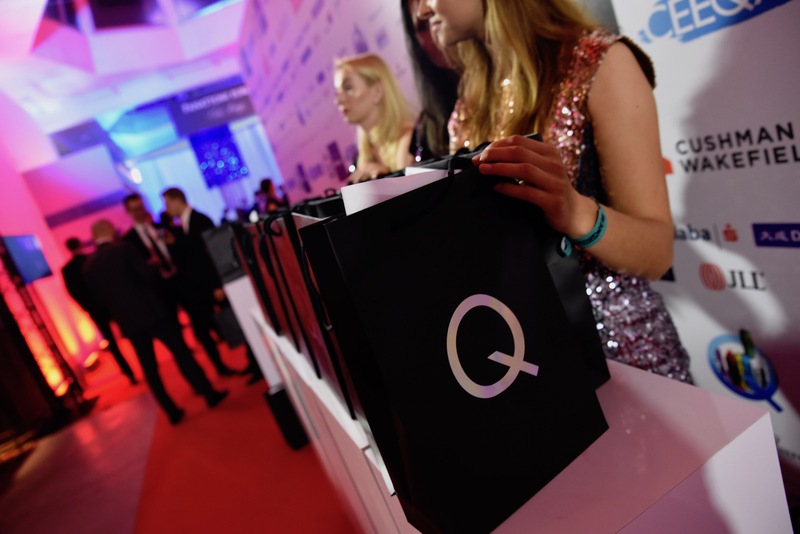 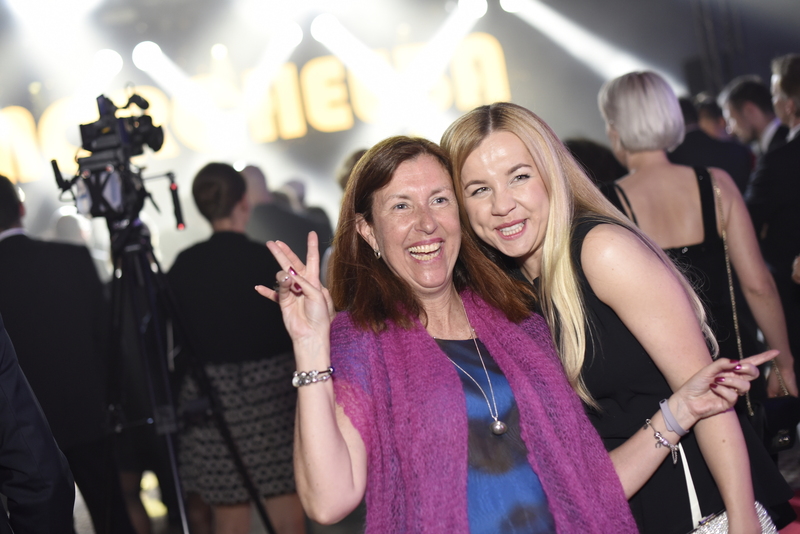 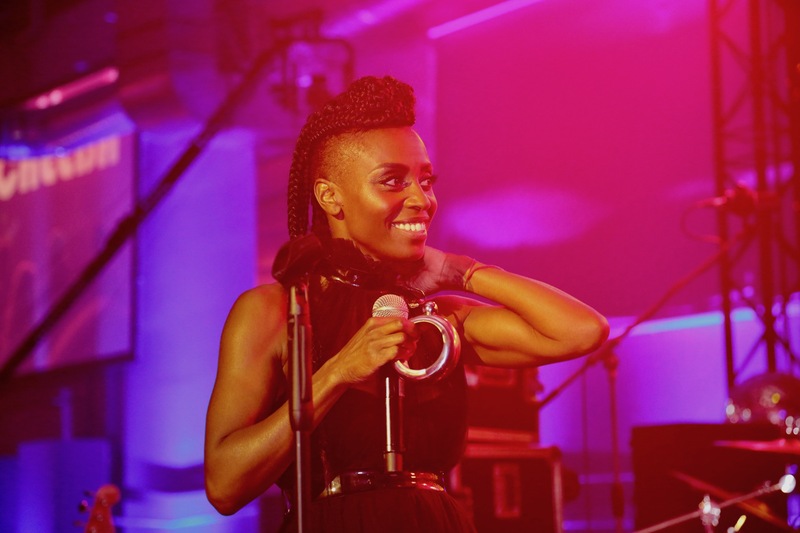 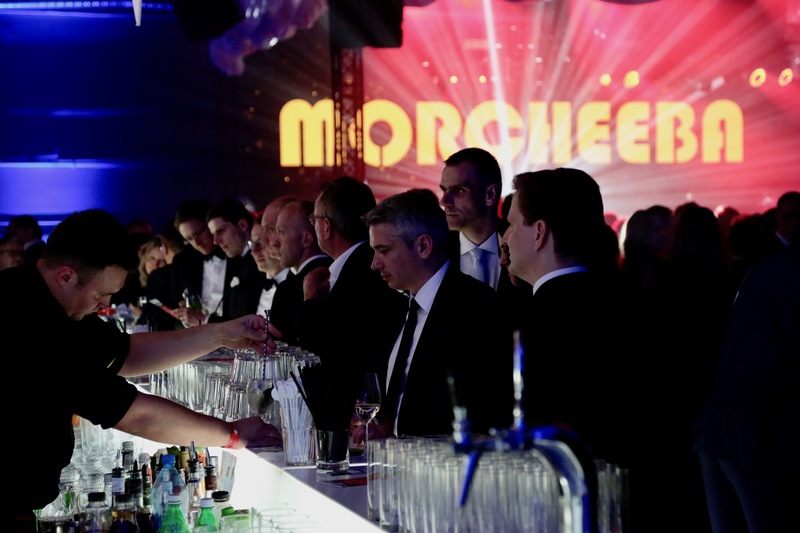 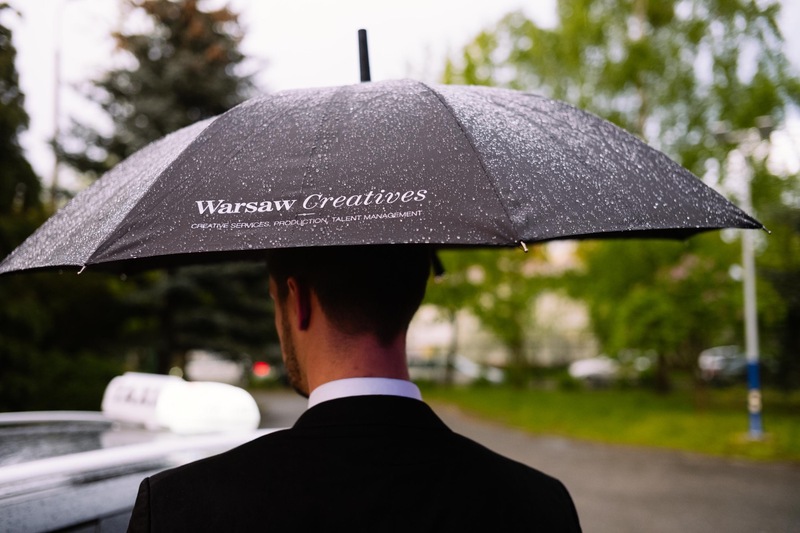 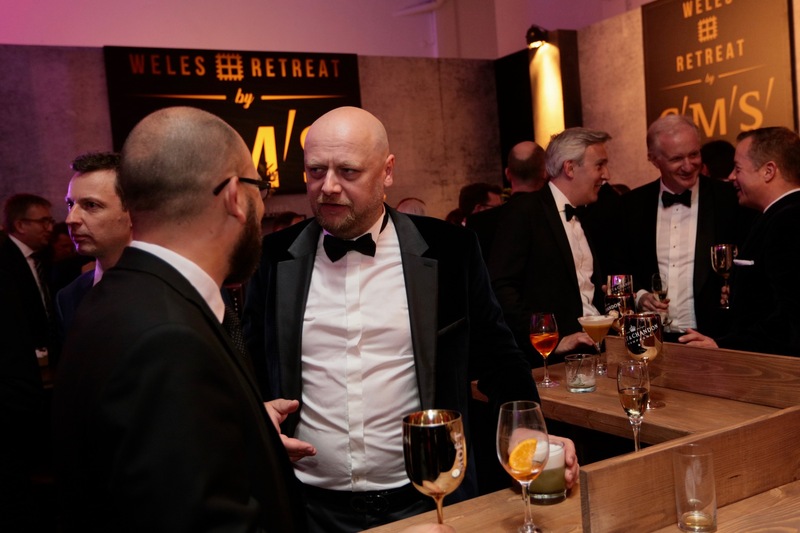 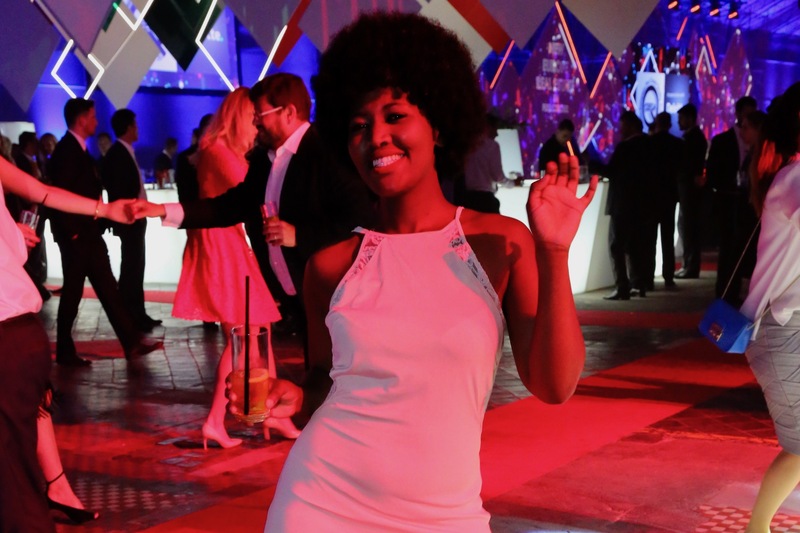 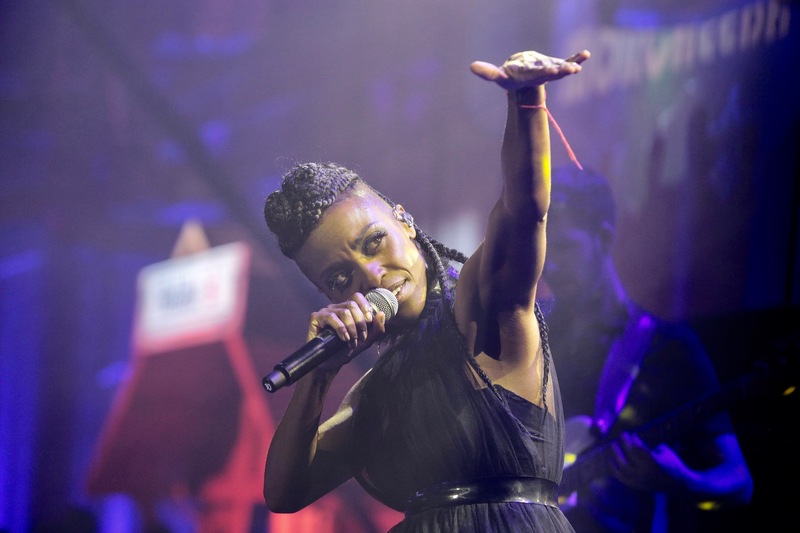 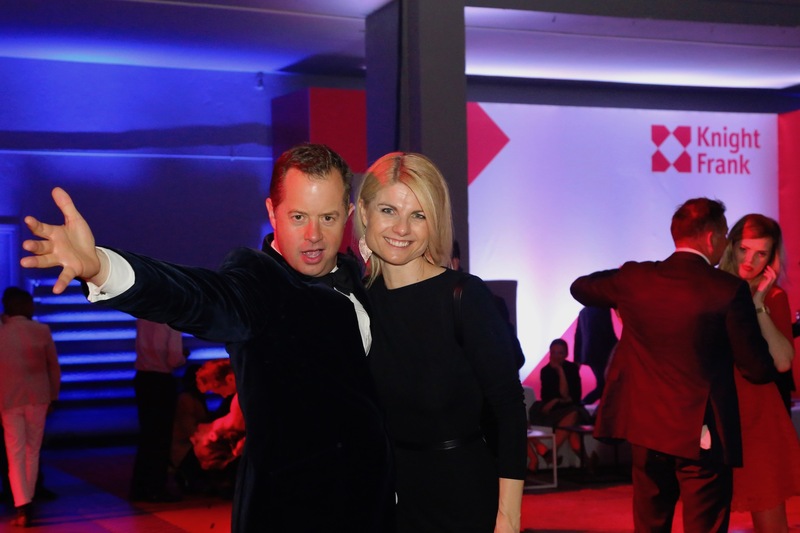 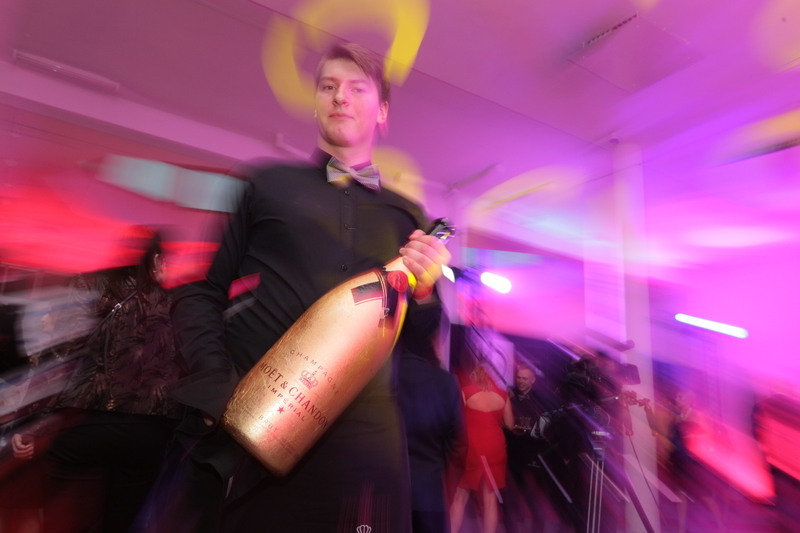 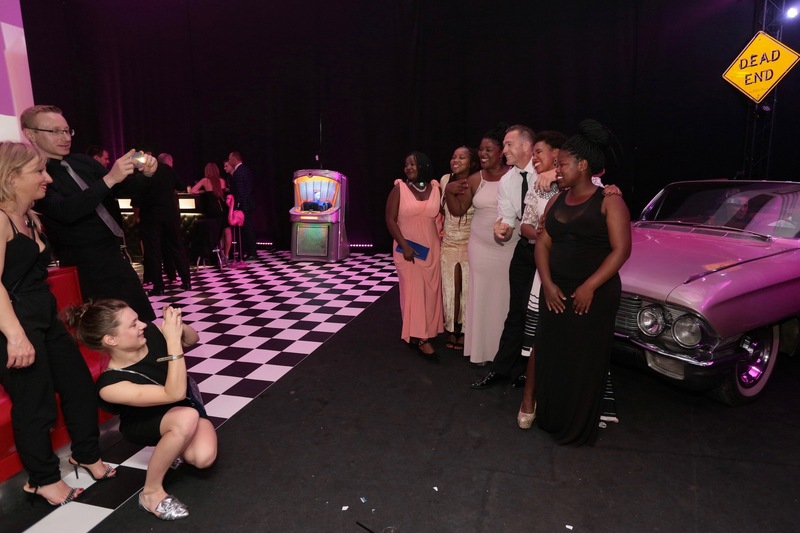 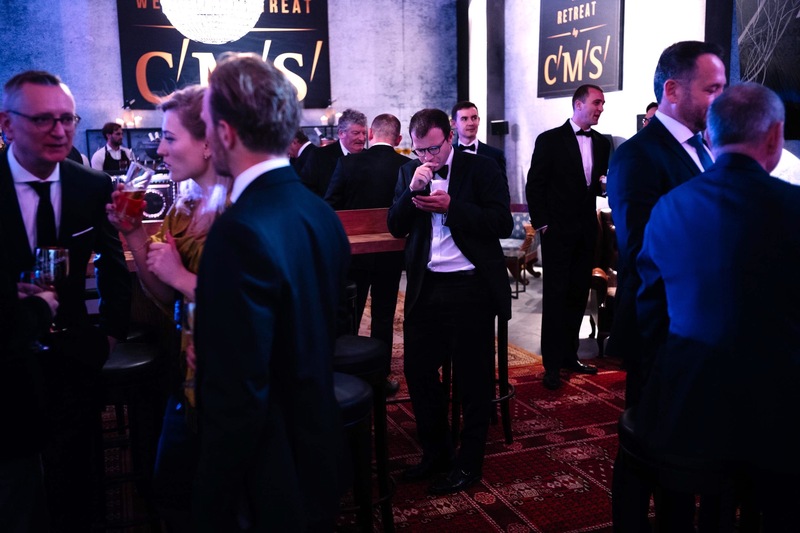 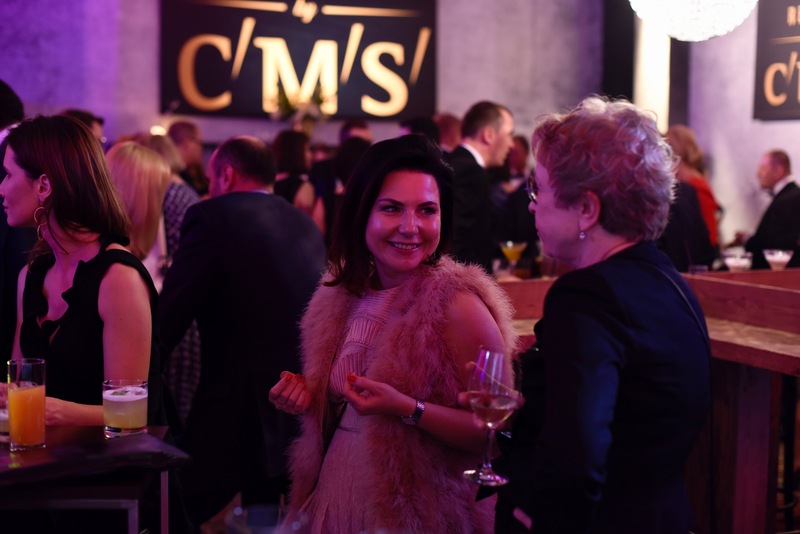 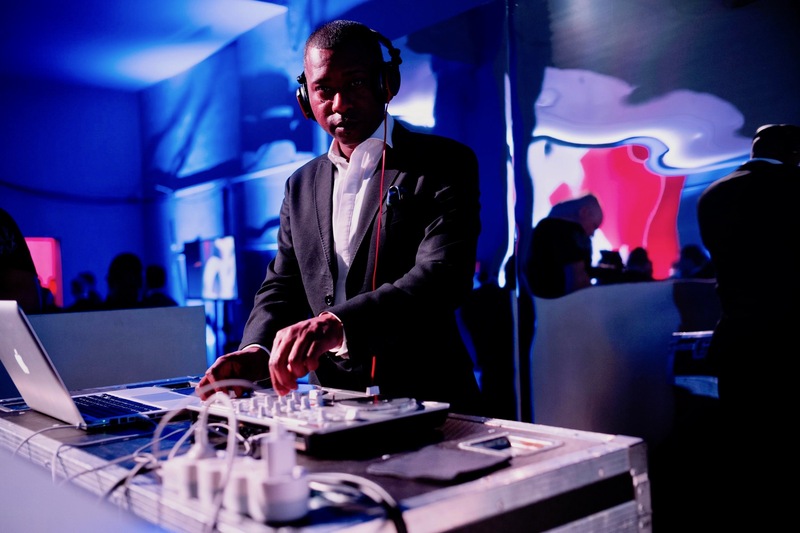 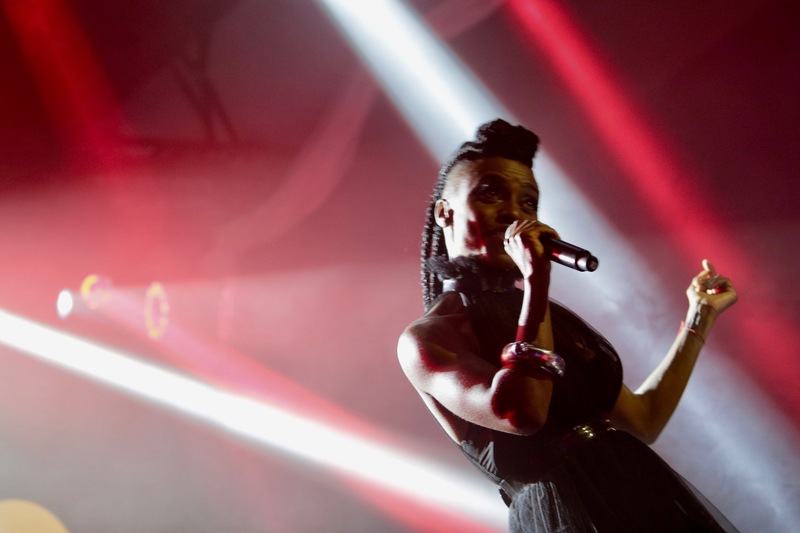 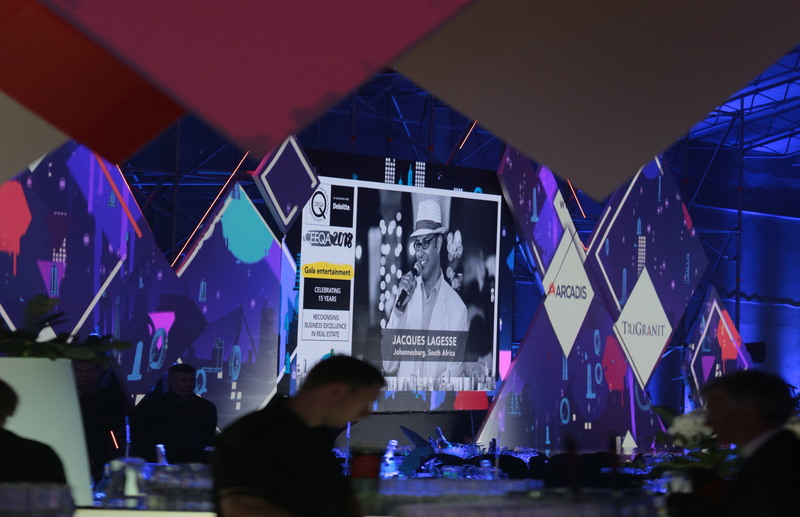 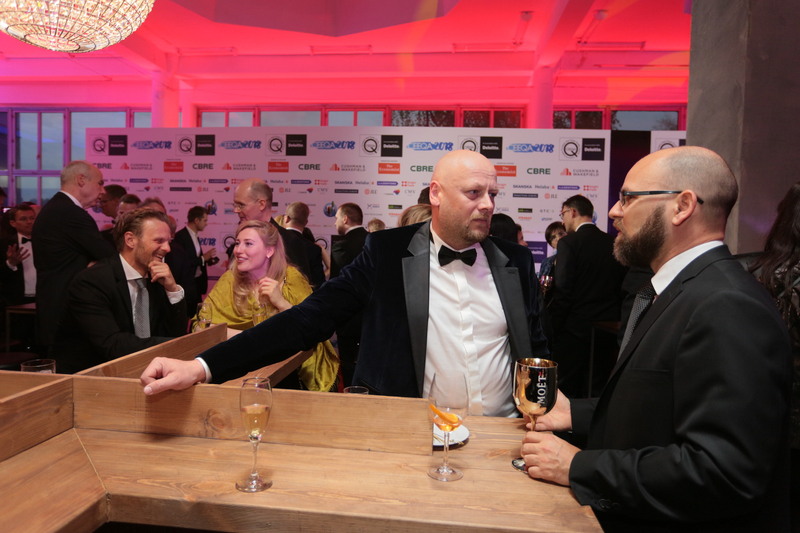 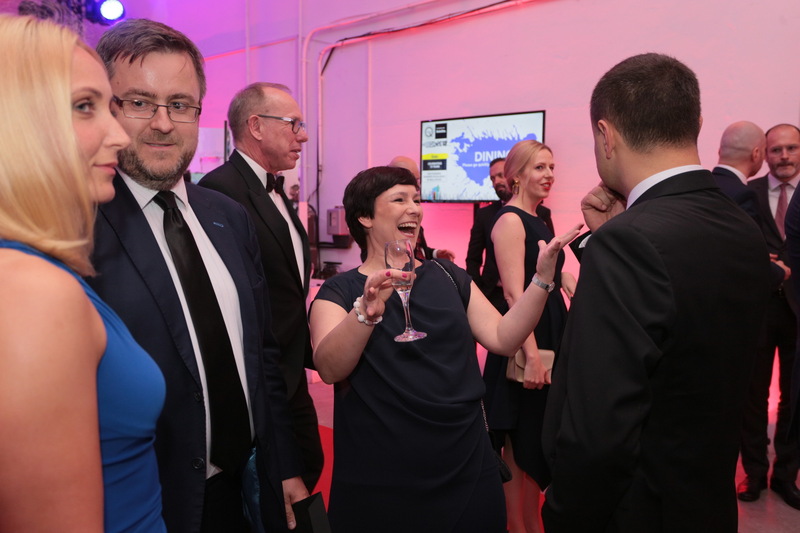 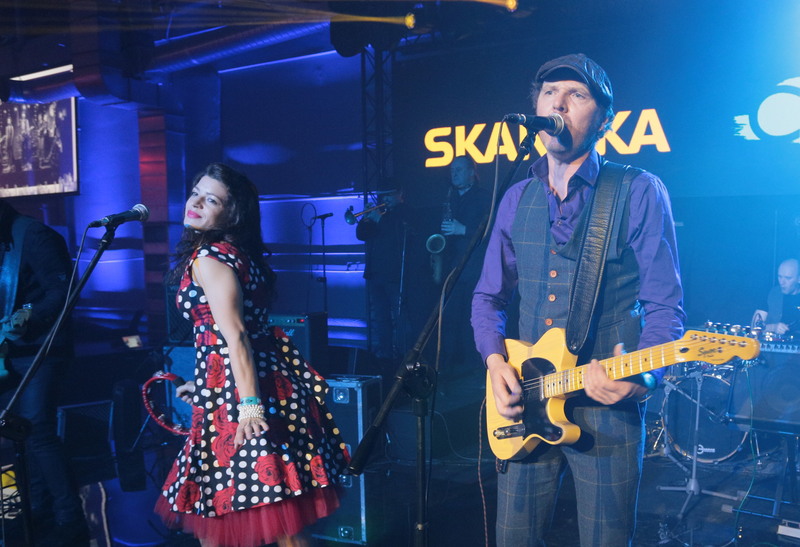 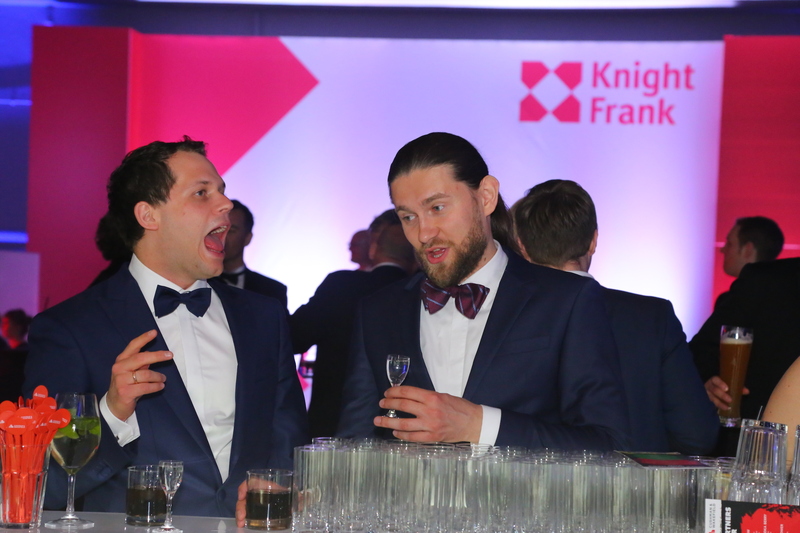 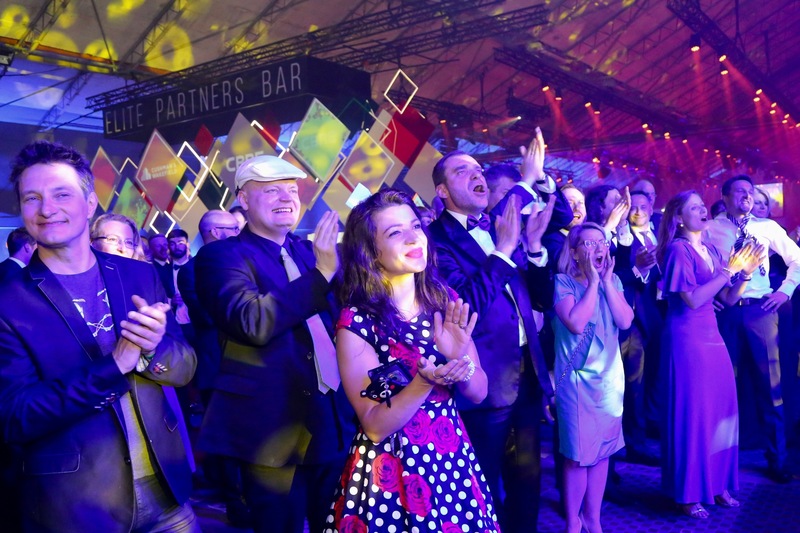 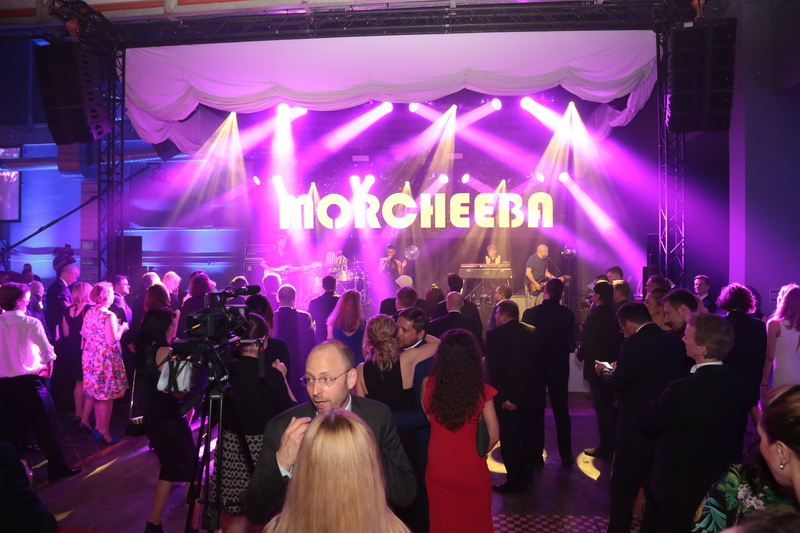 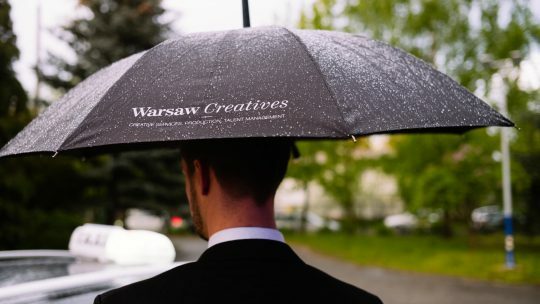 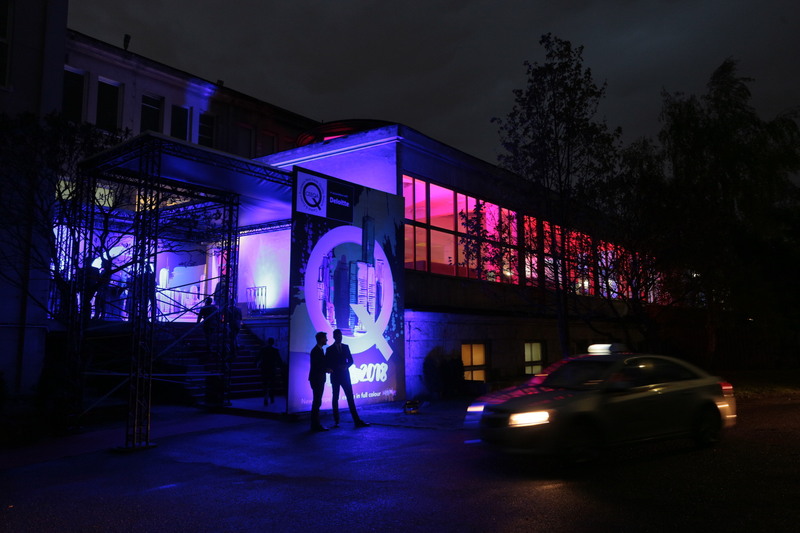 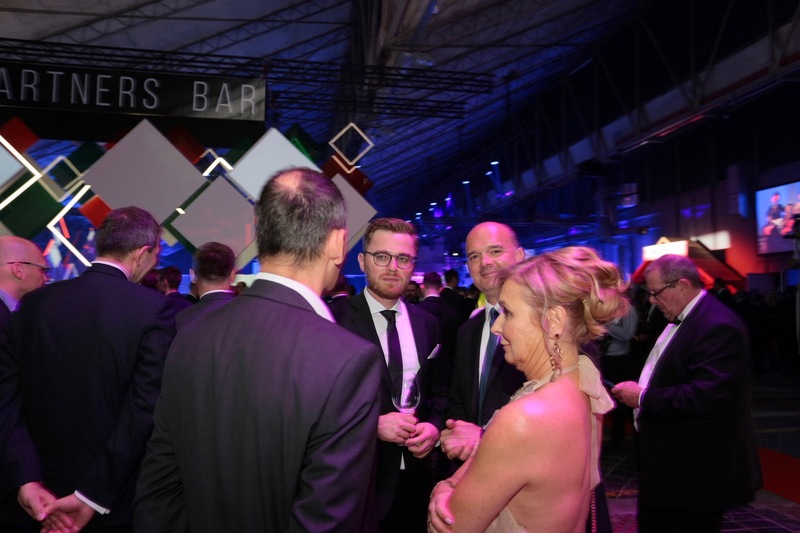 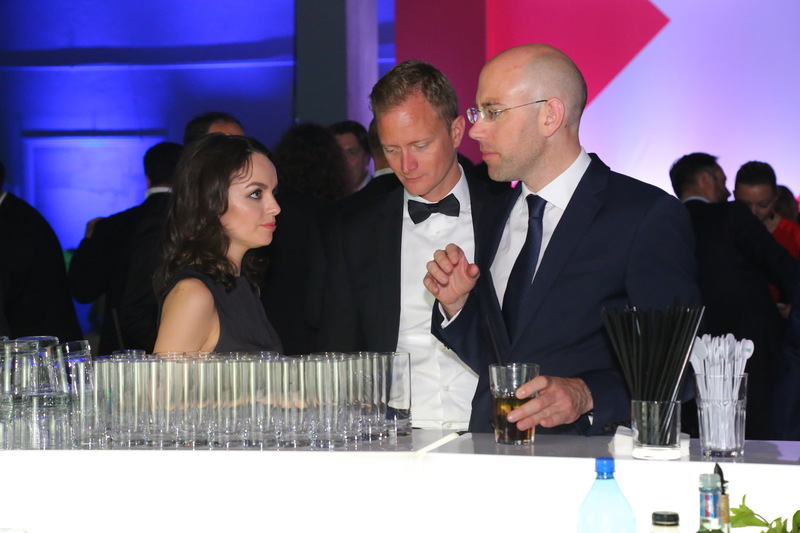 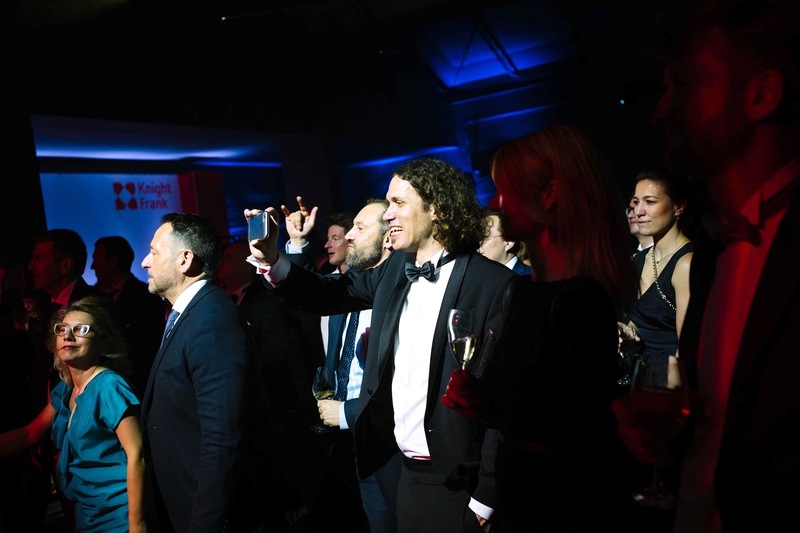 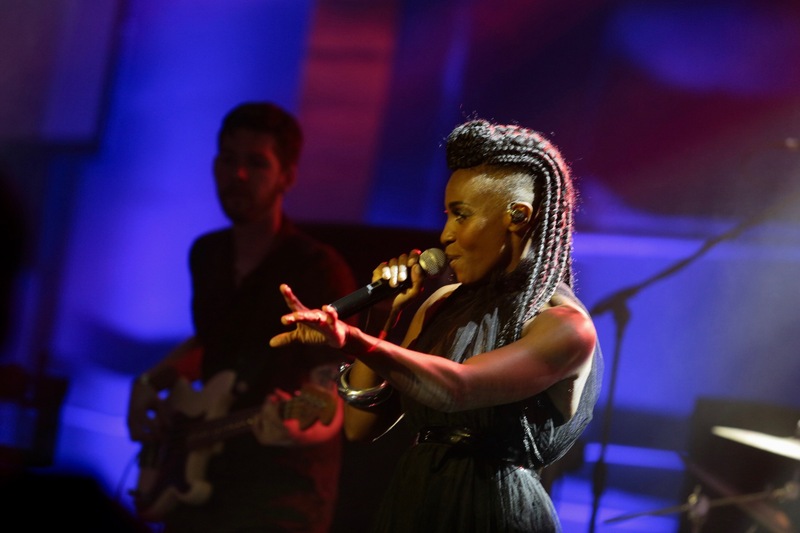 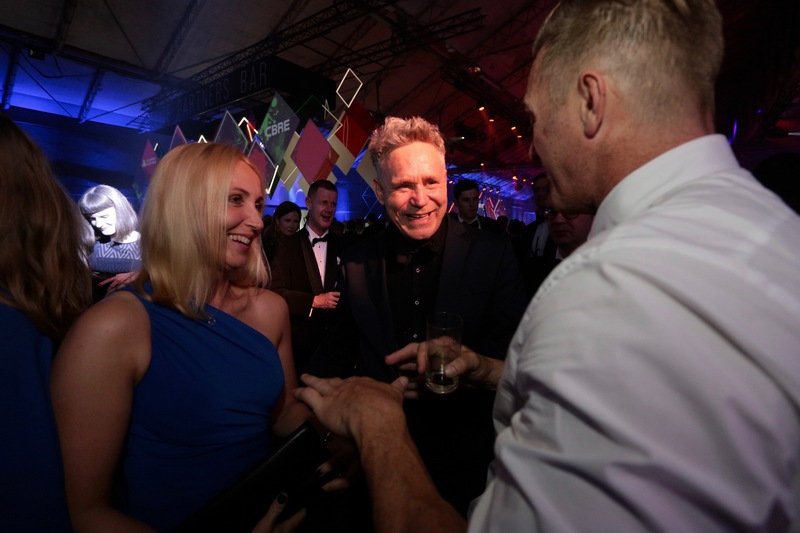 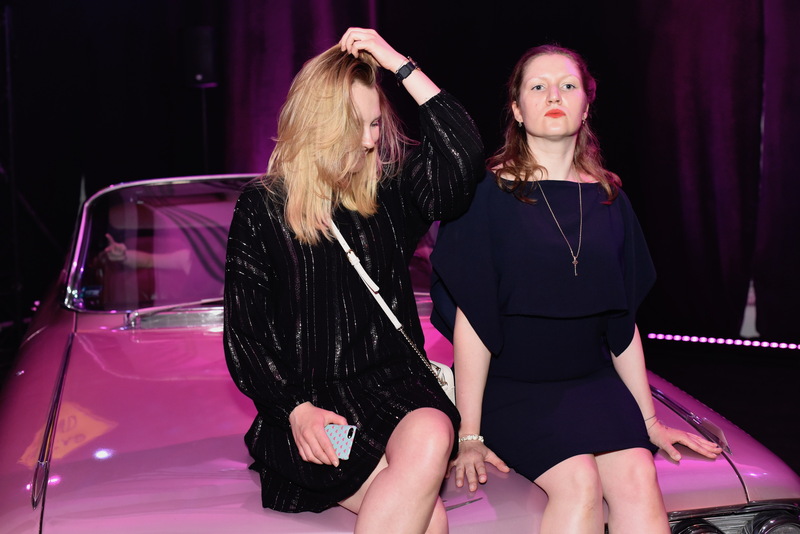 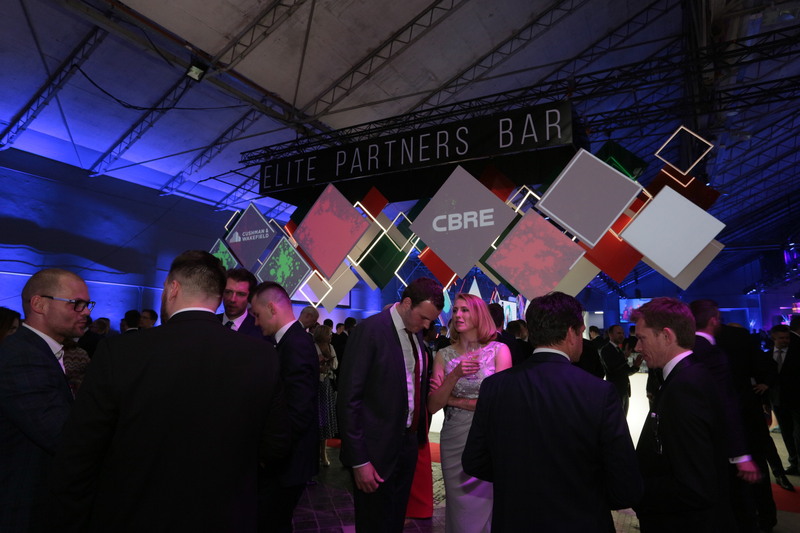 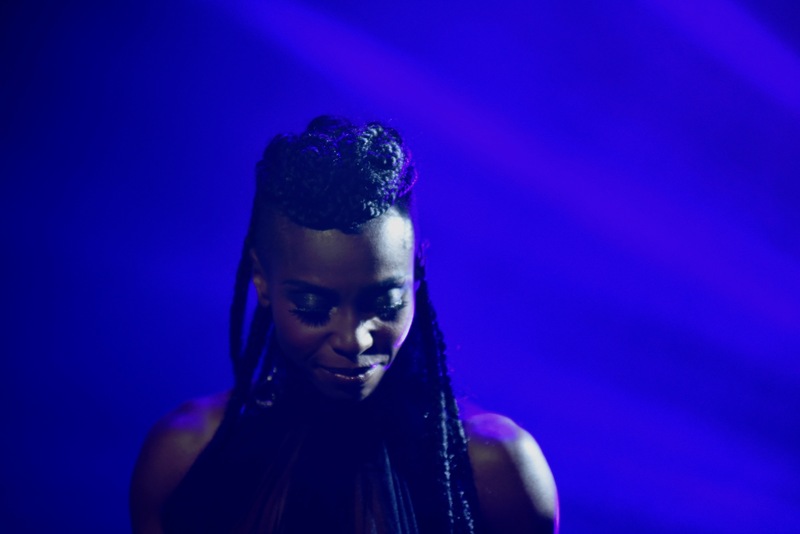 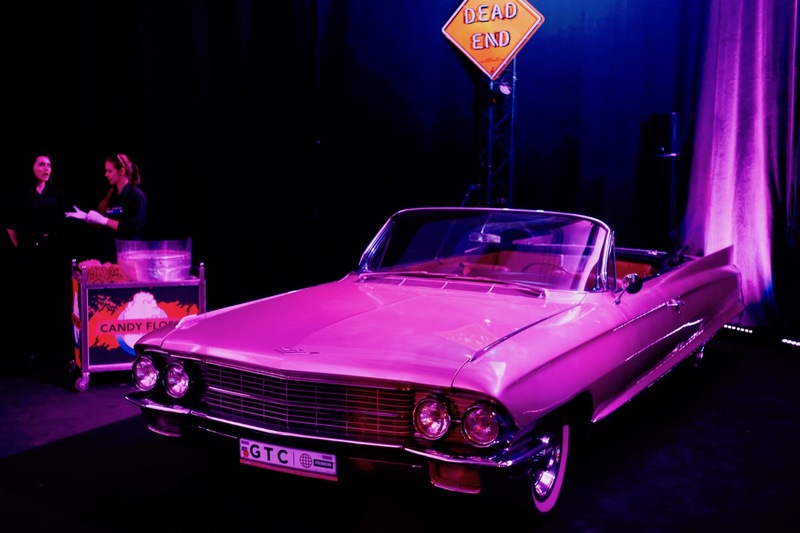 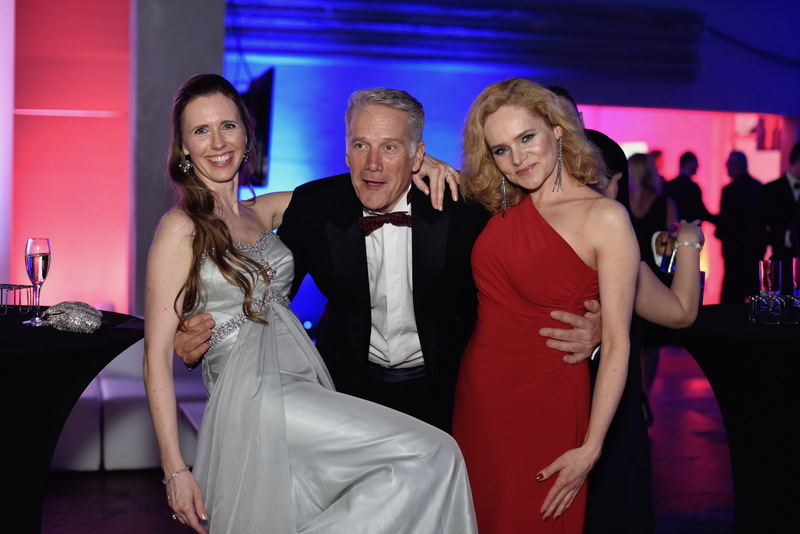 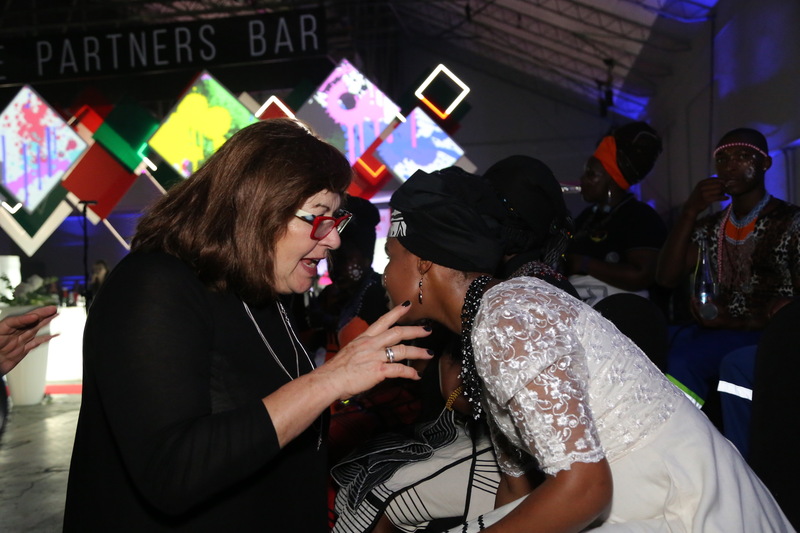 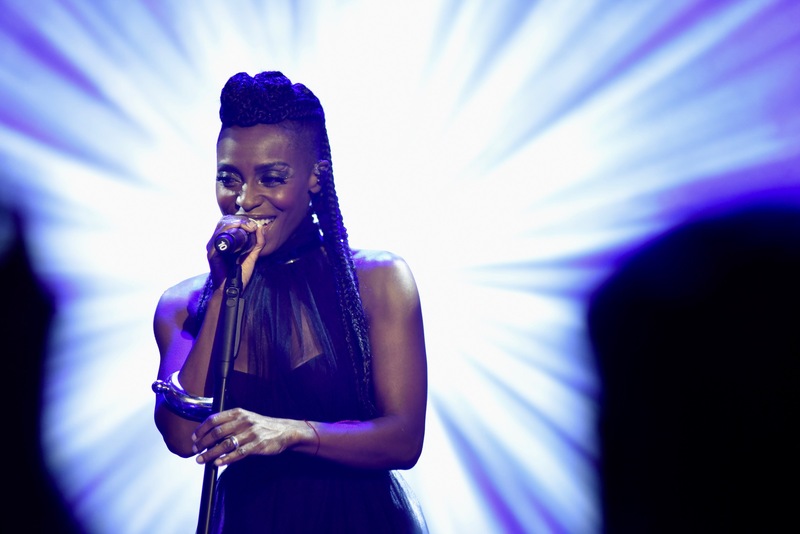 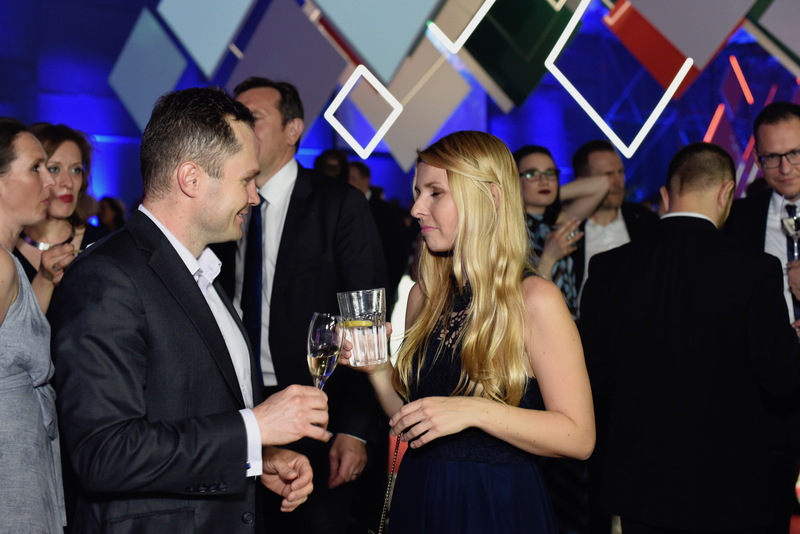 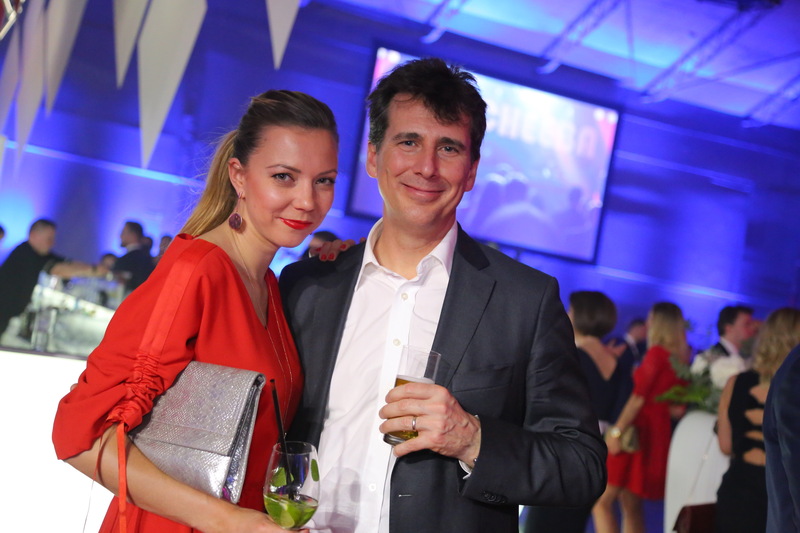 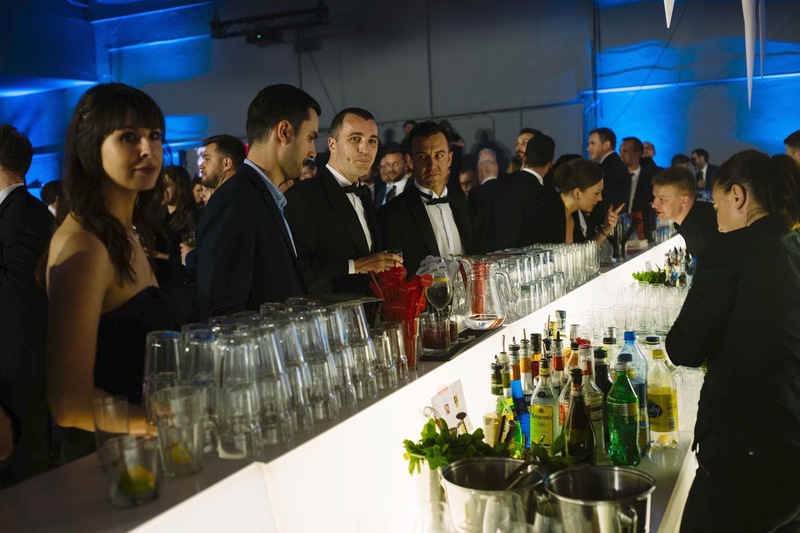 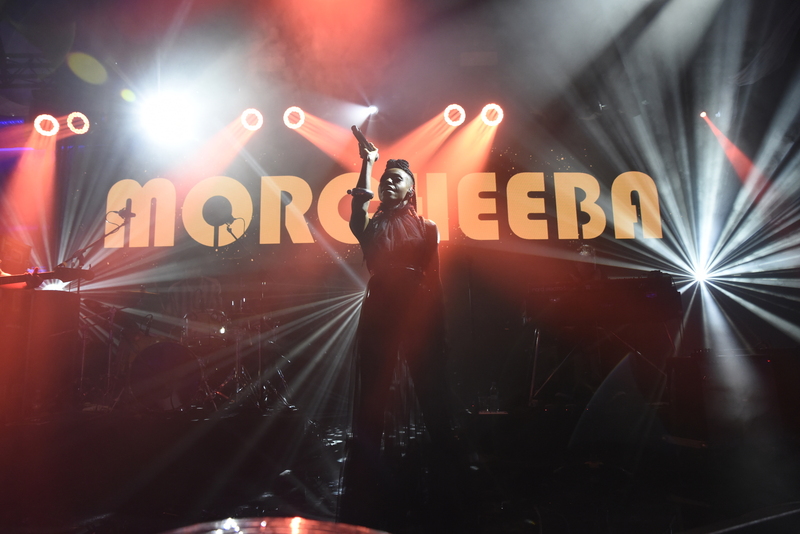 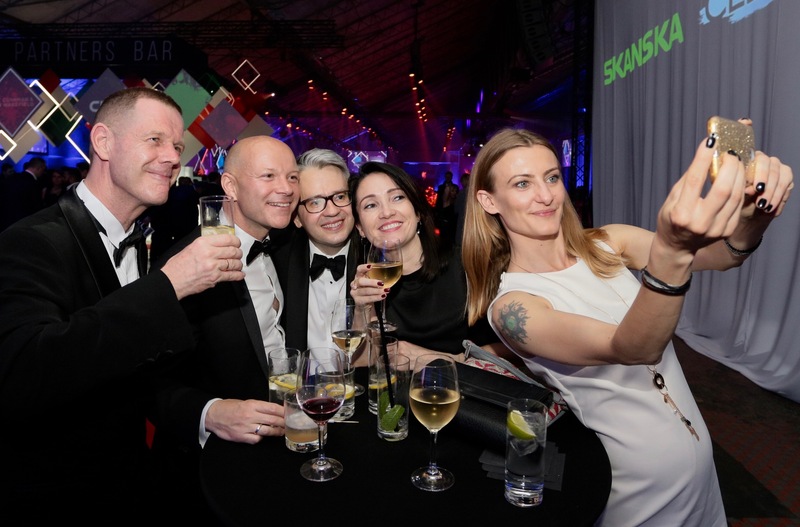 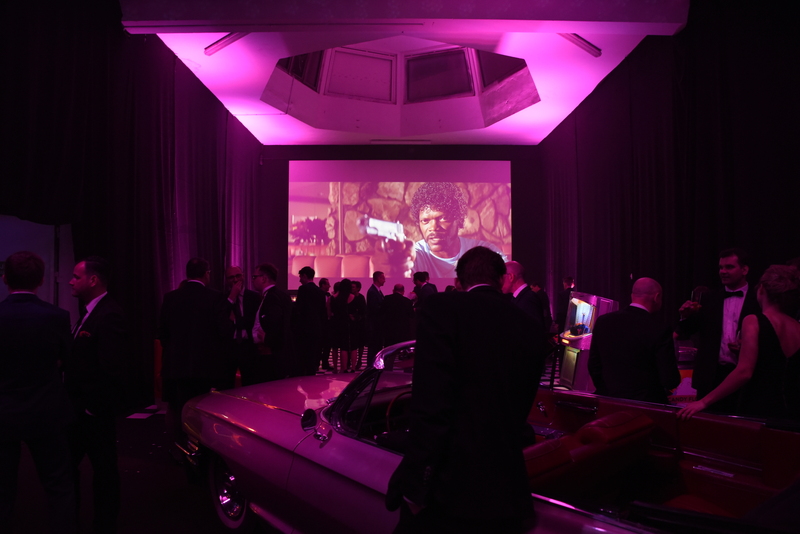 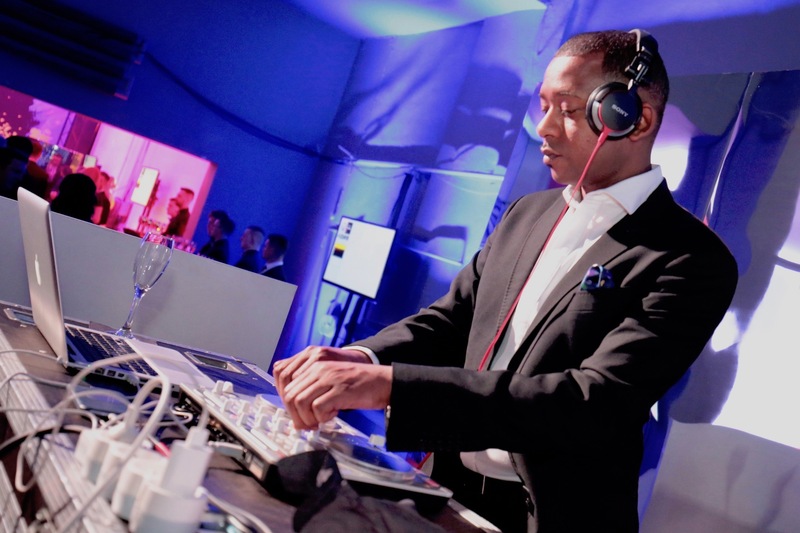 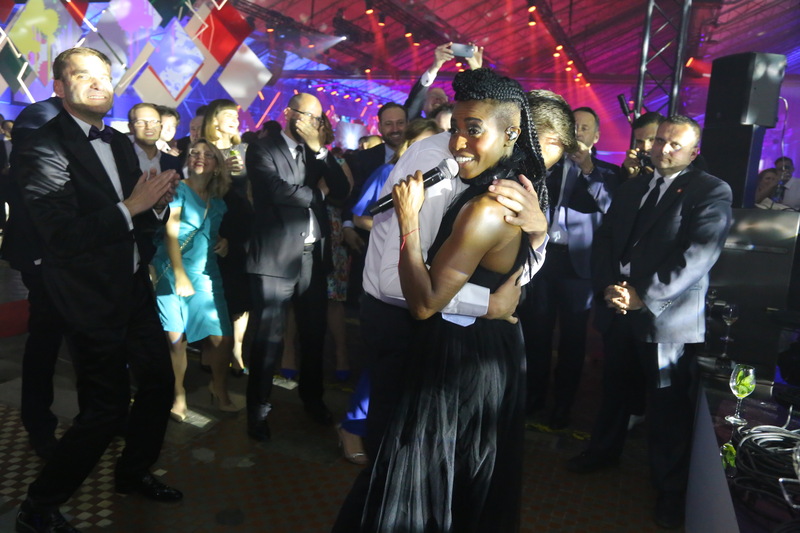 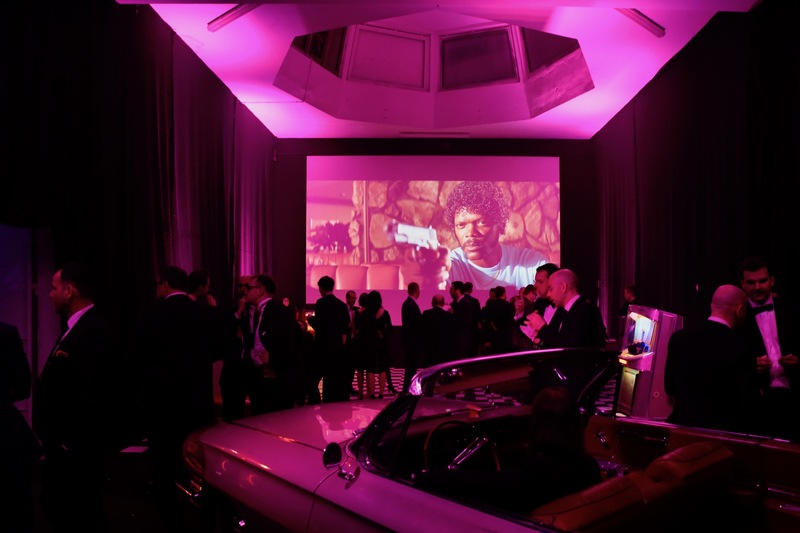 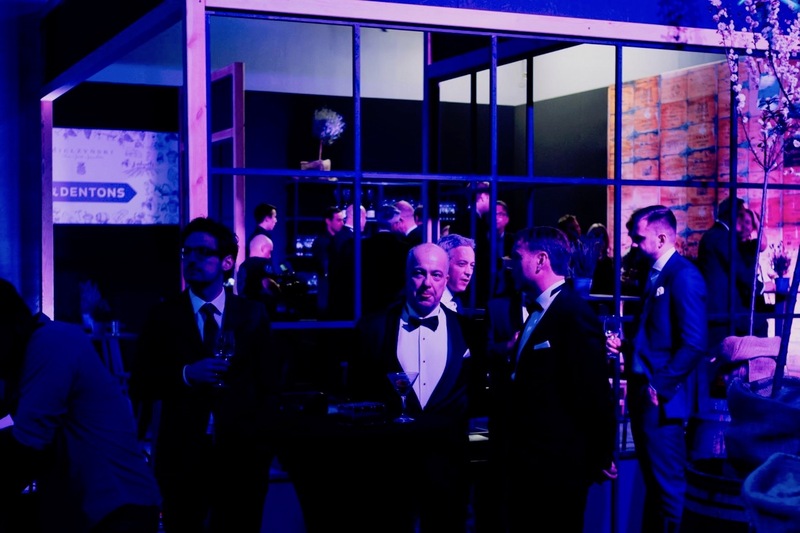 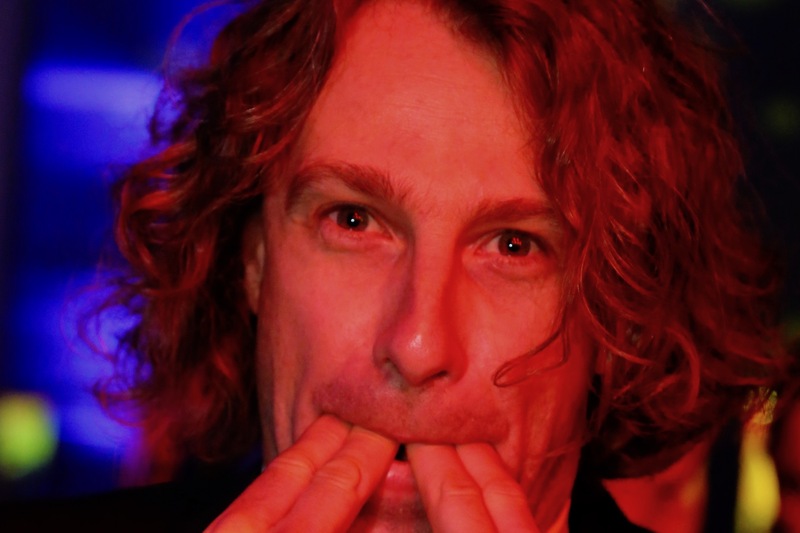 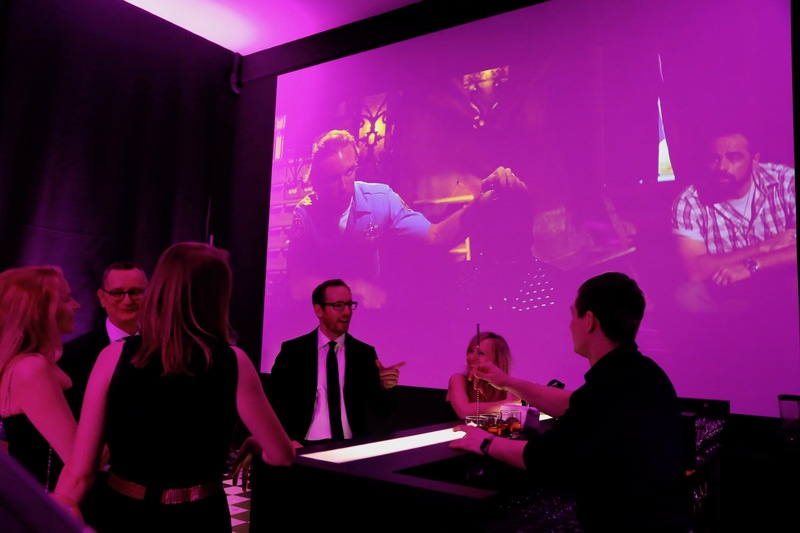 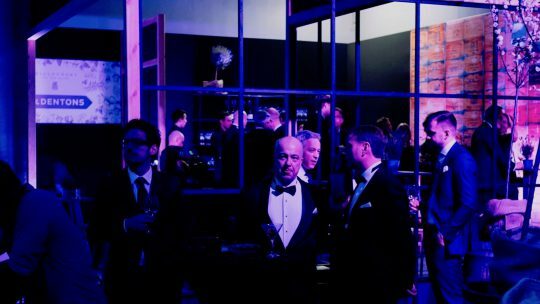 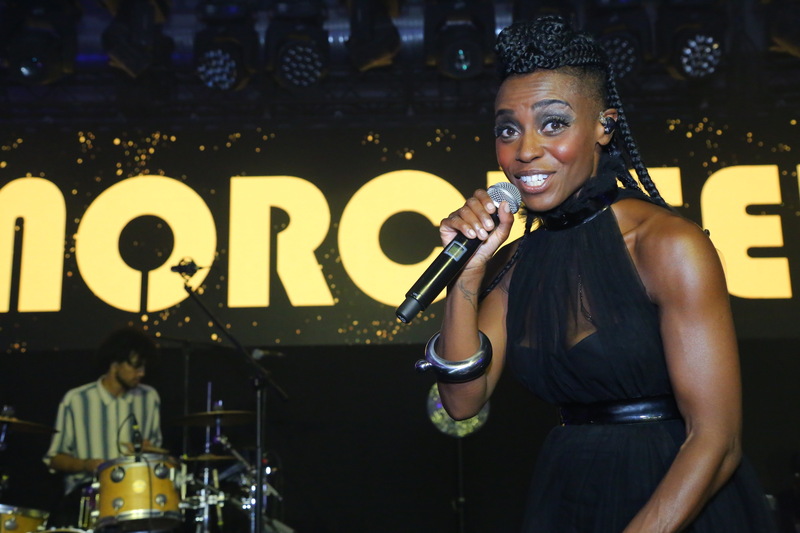 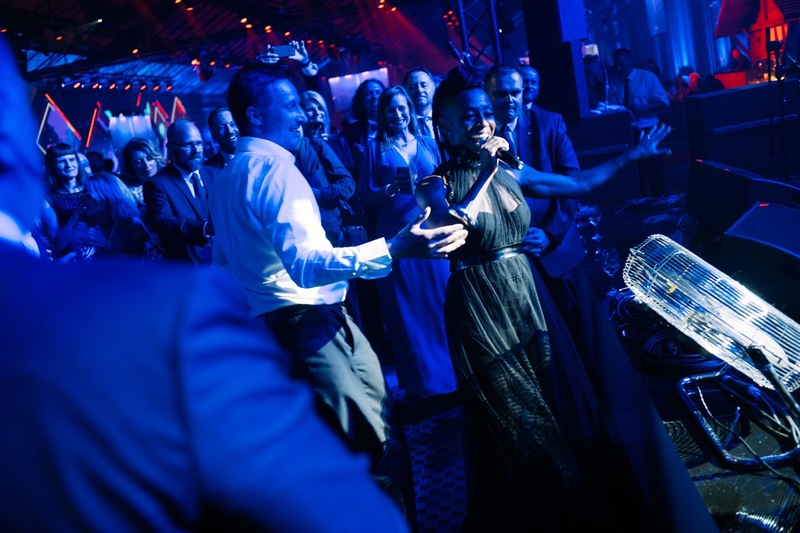 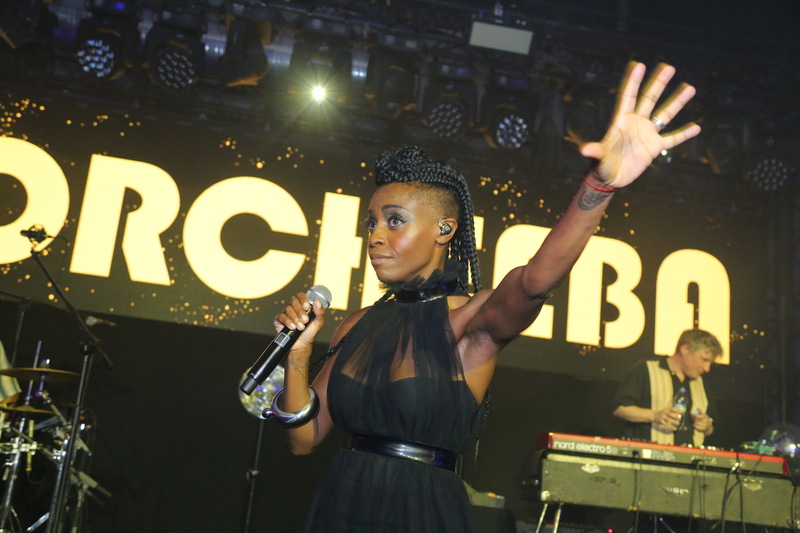 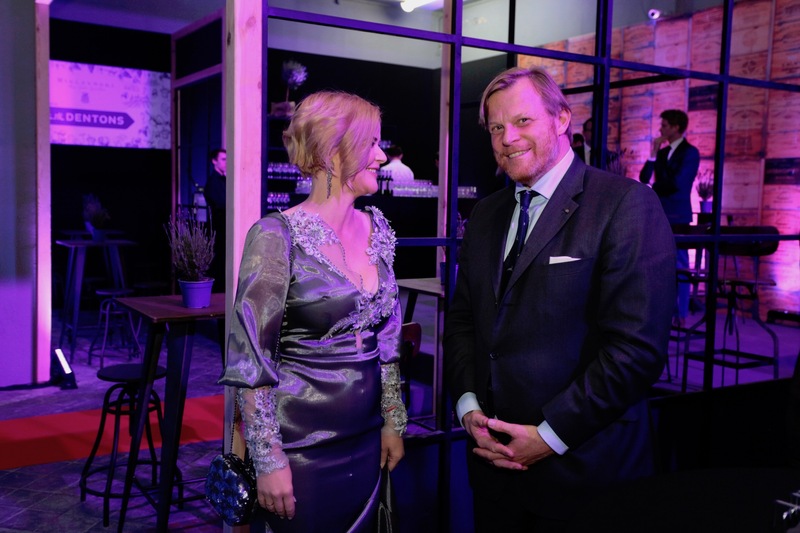 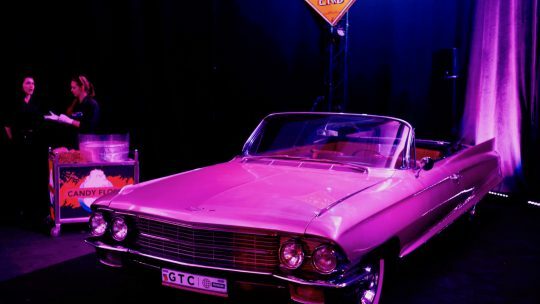 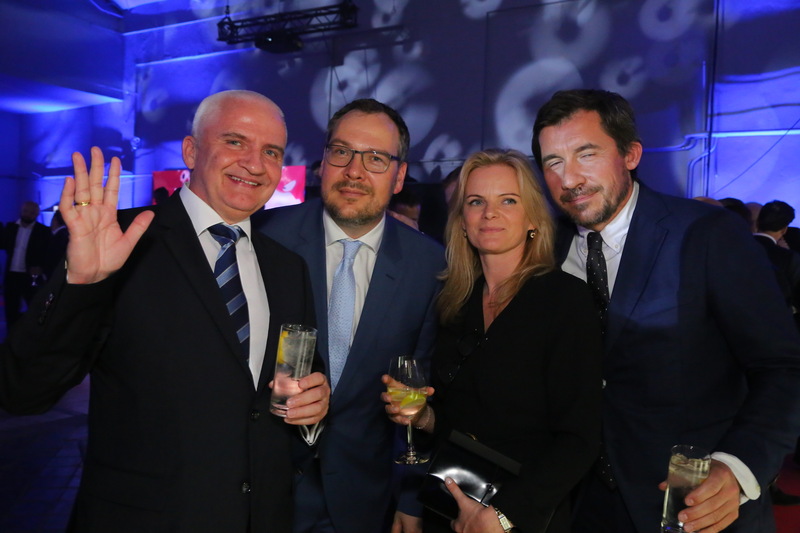 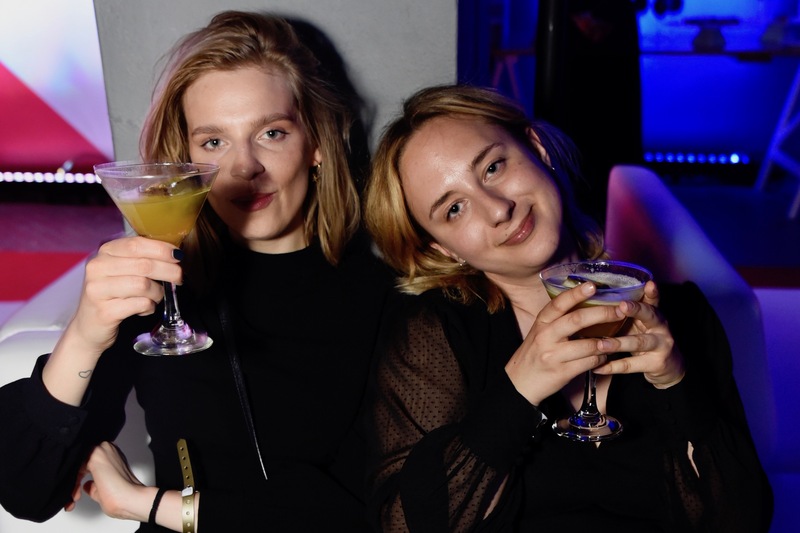 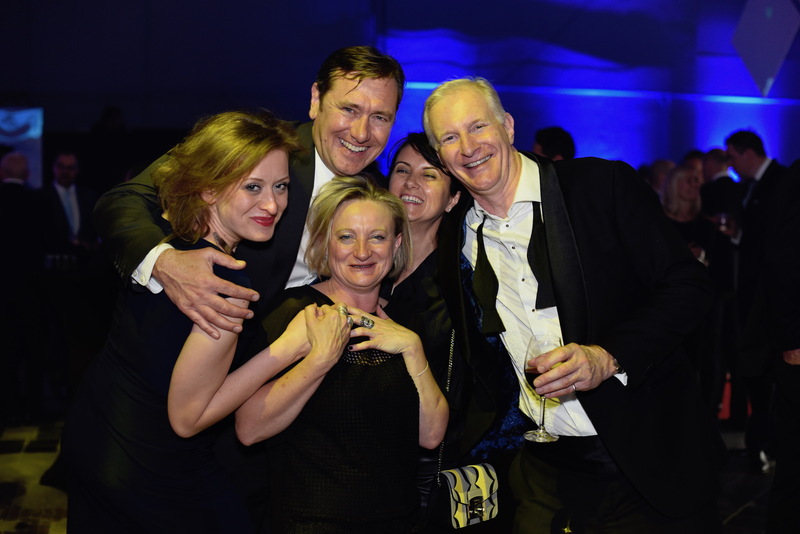 But guests continued to storm the bars and hang out in the Pulp Fiction Room or at the numerous sponsored bars until the crack of dawn, or adjourned to nearby Warszawa Wschodnia for the after-after-party. 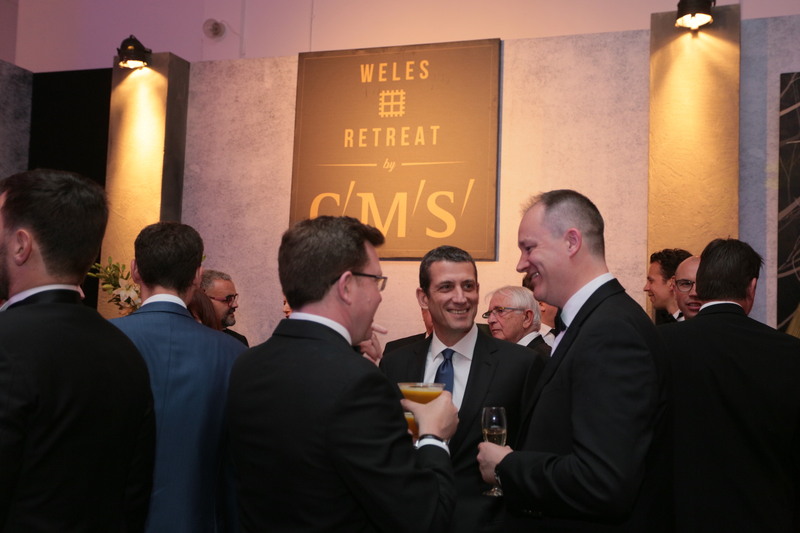 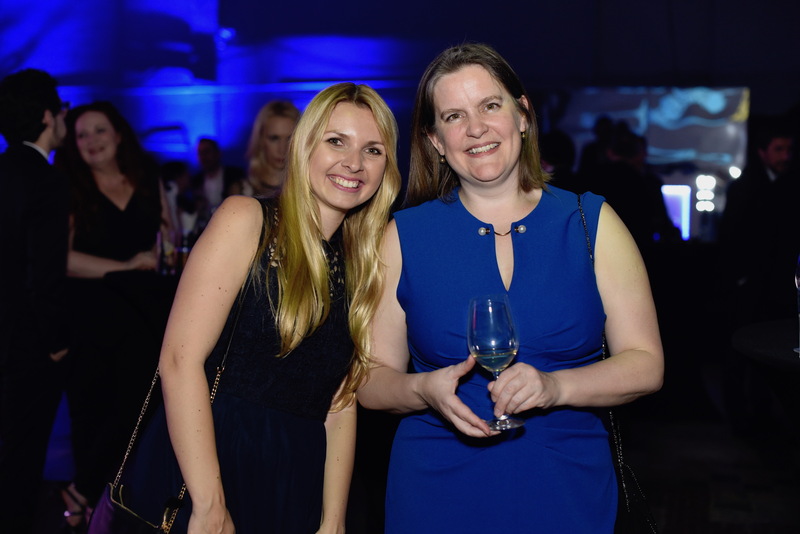 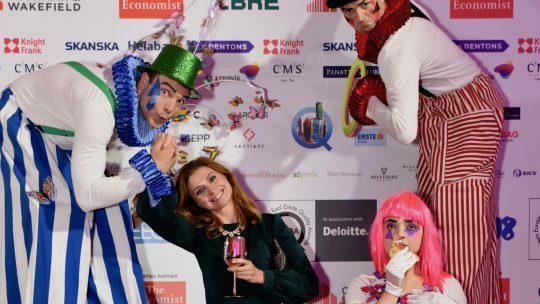 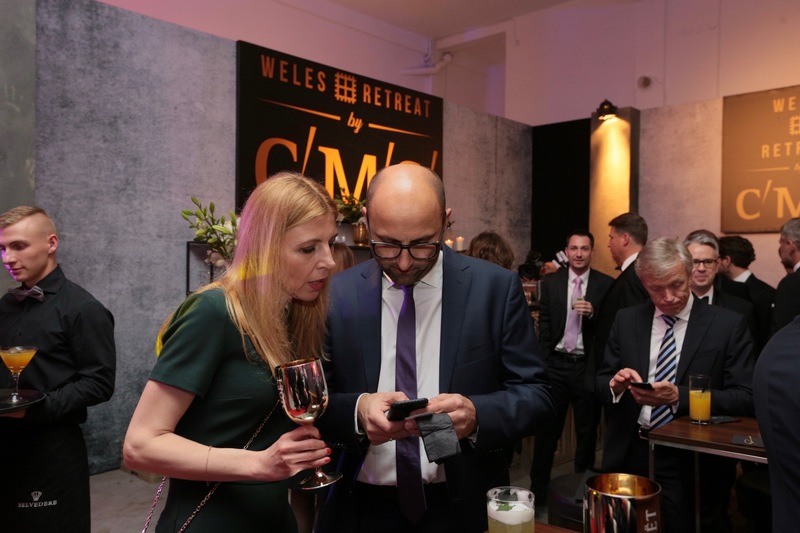 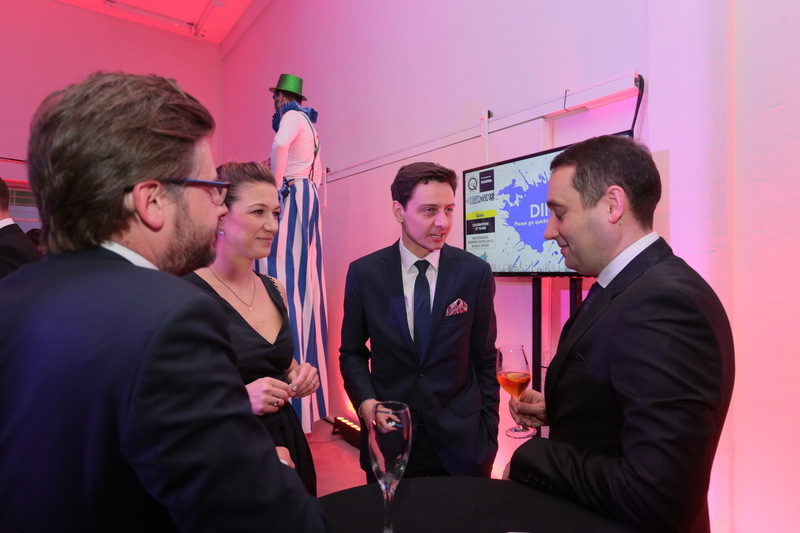 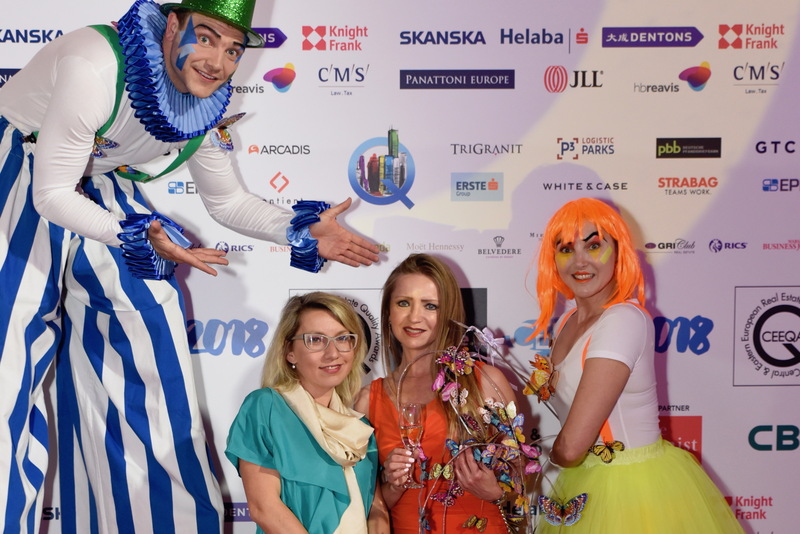 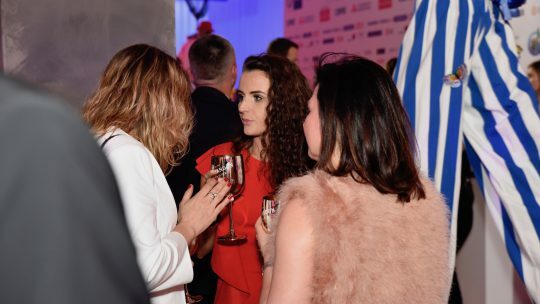 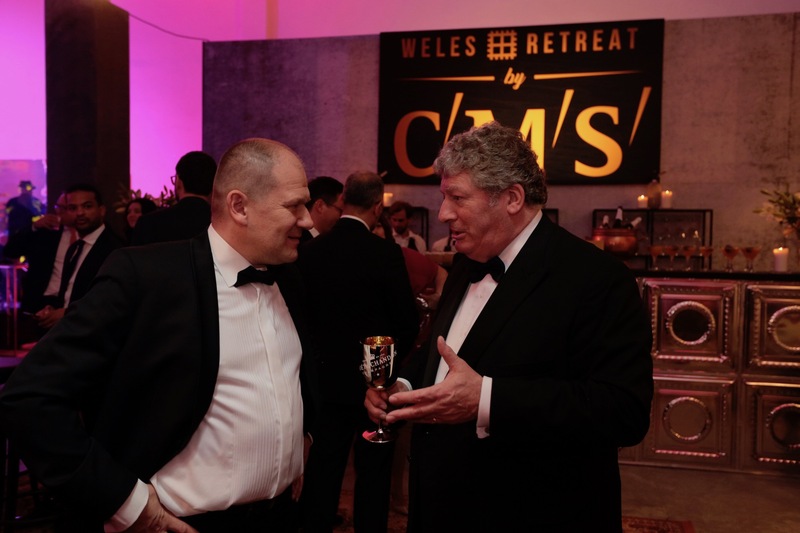 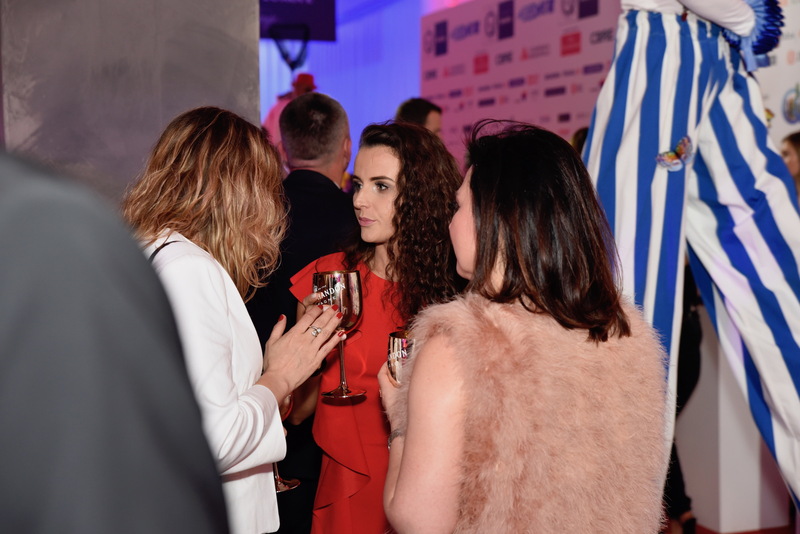 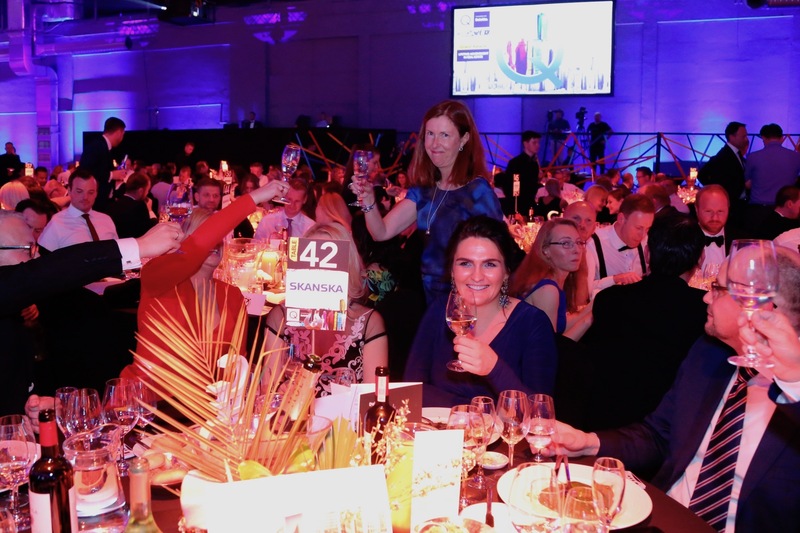 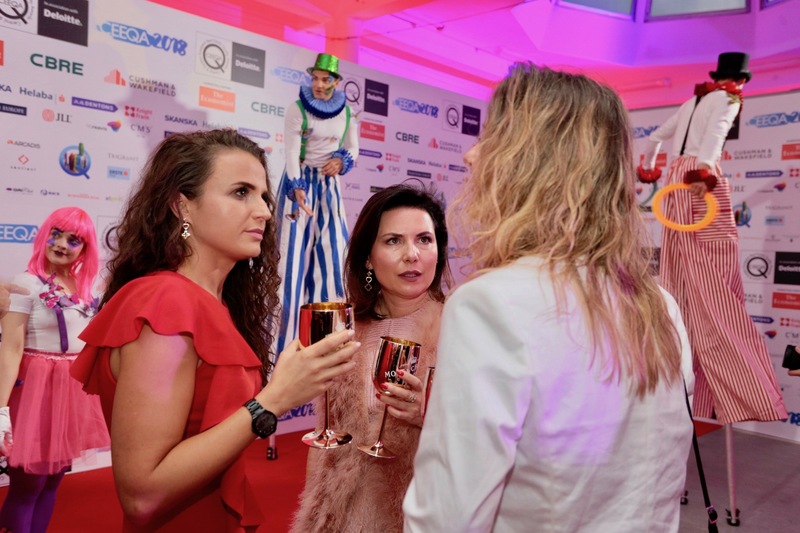 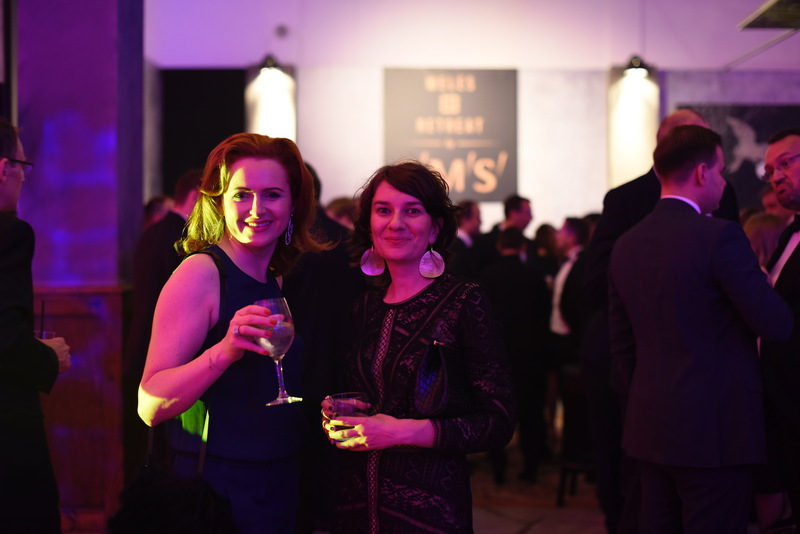 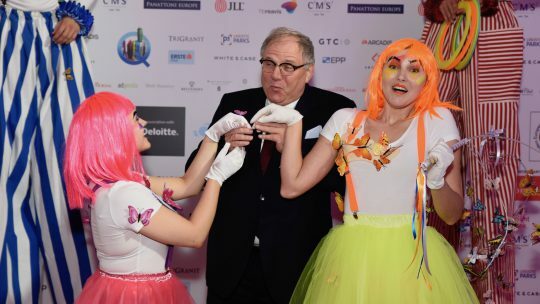 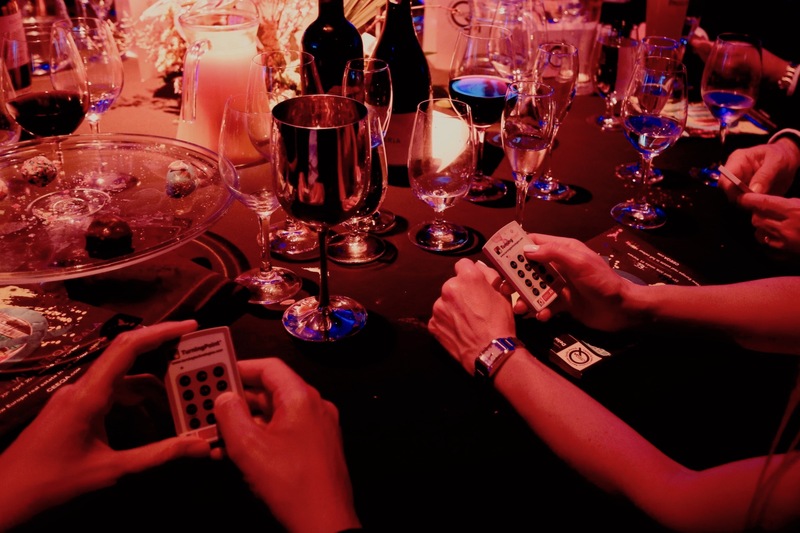 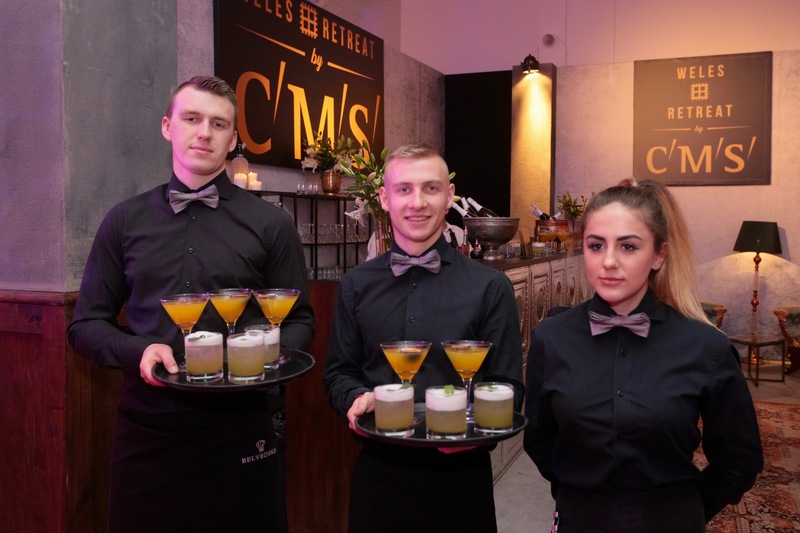 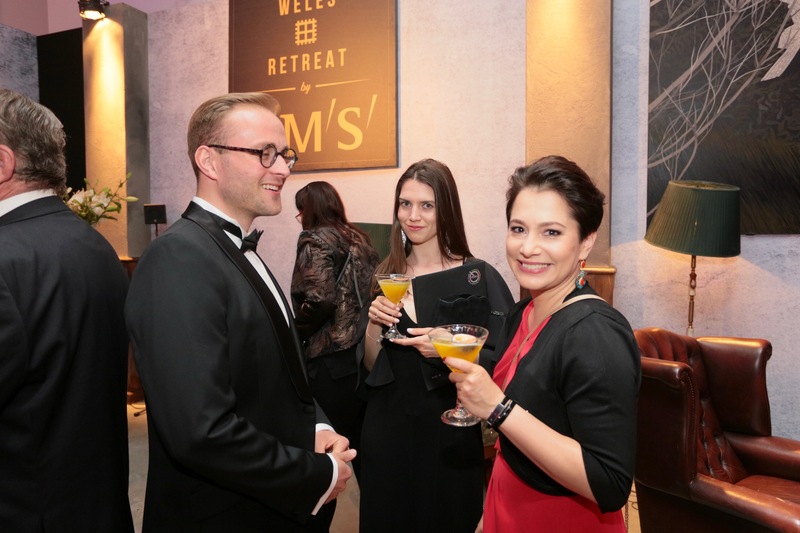 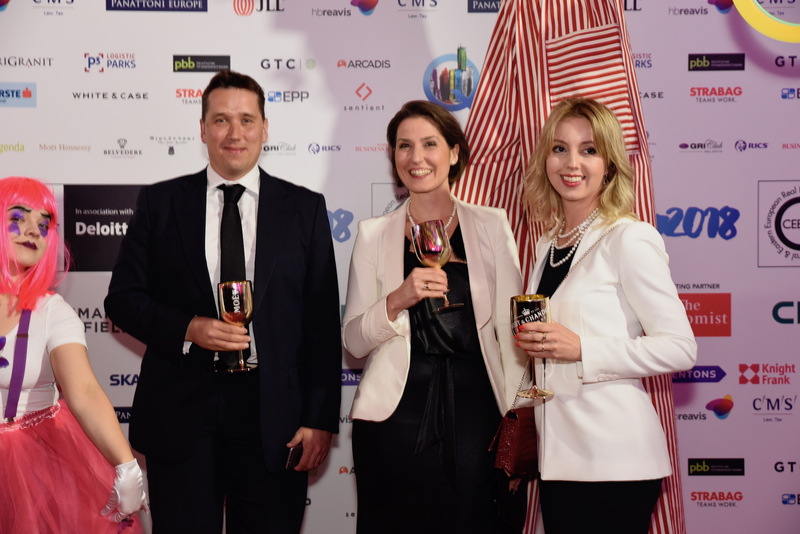 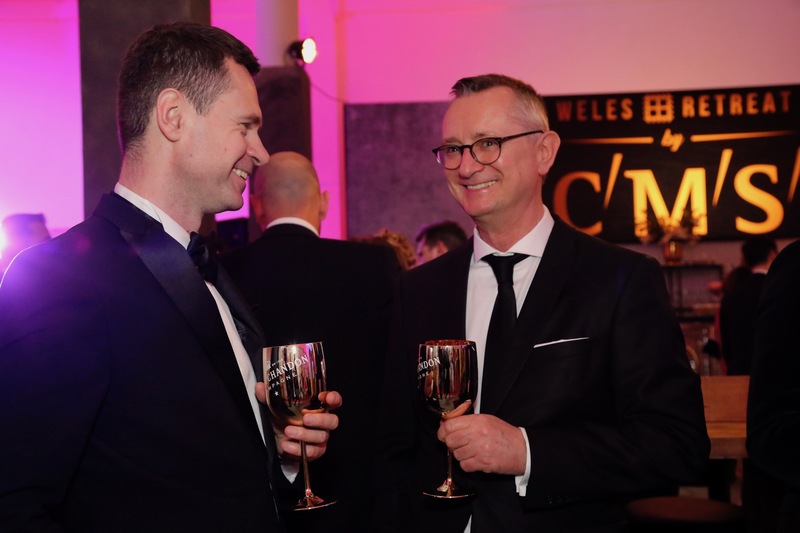 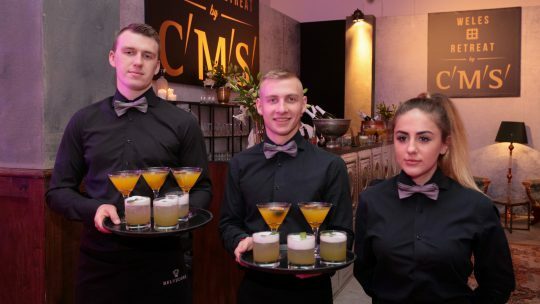 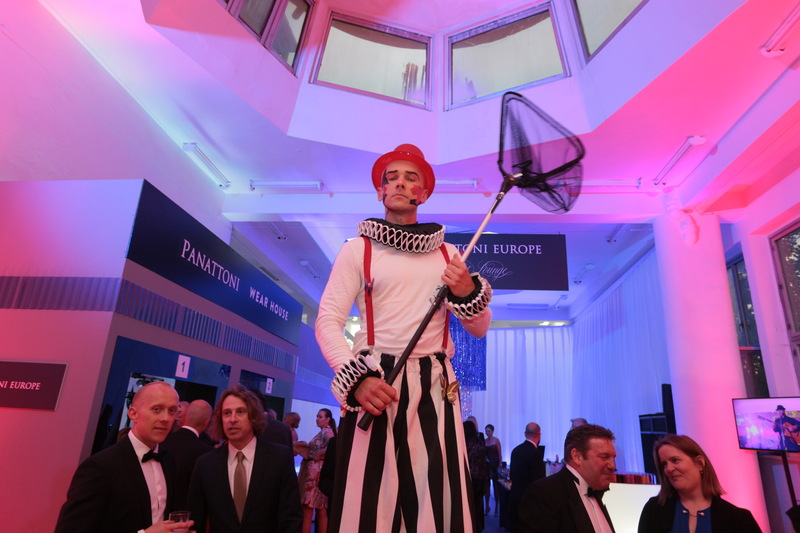 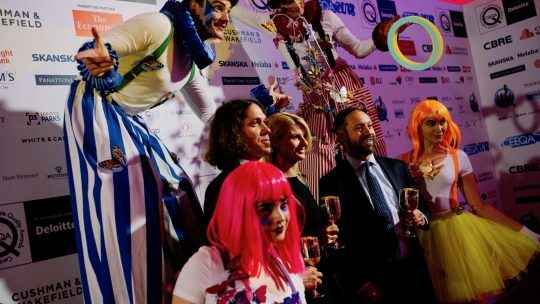 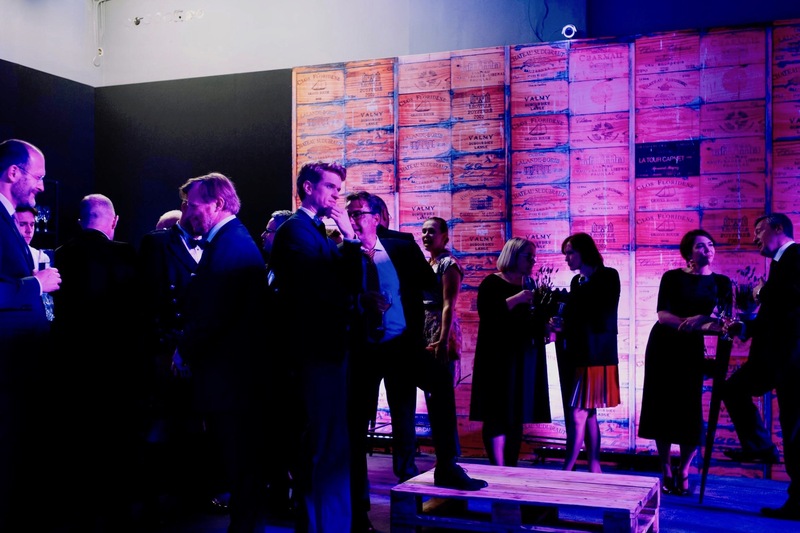 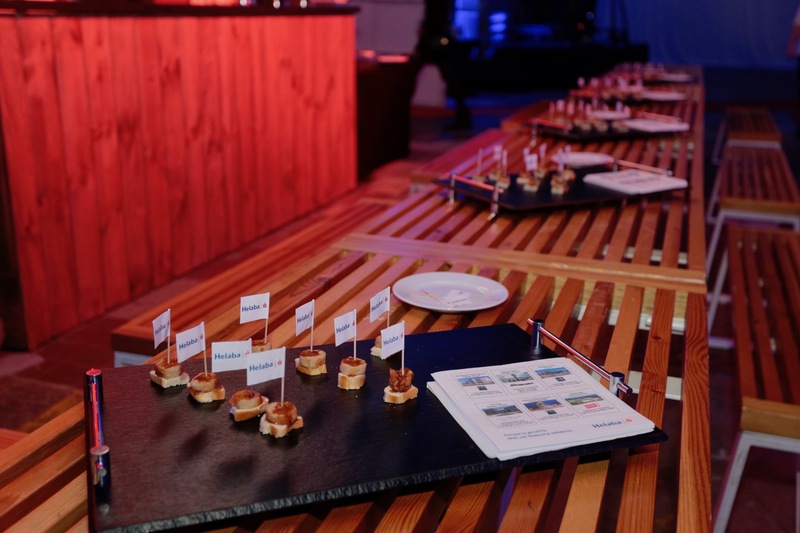 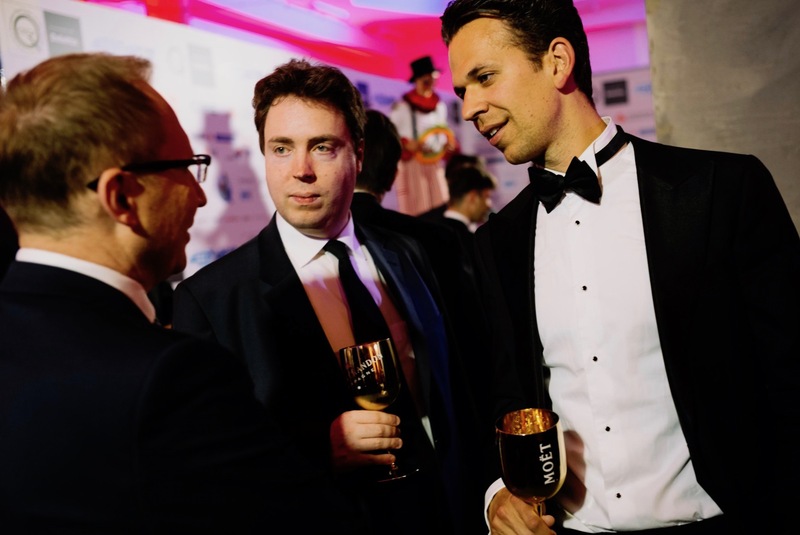 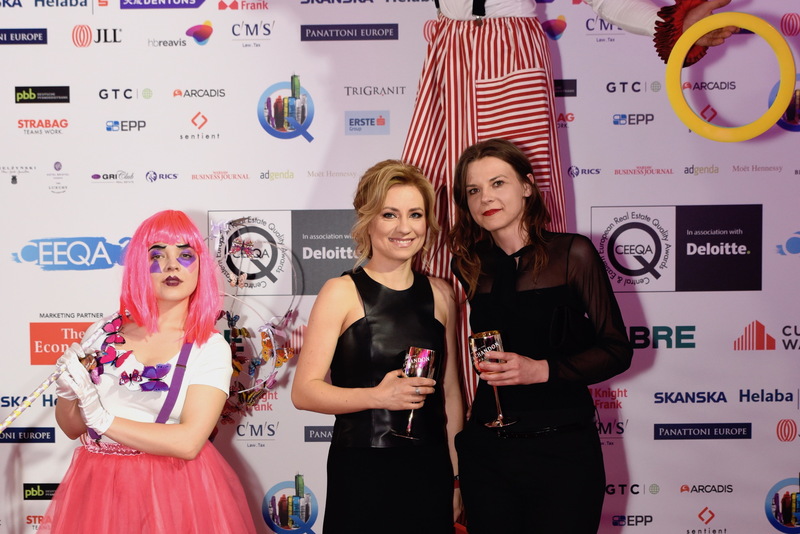 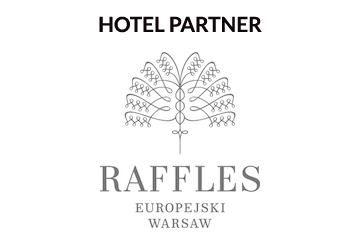 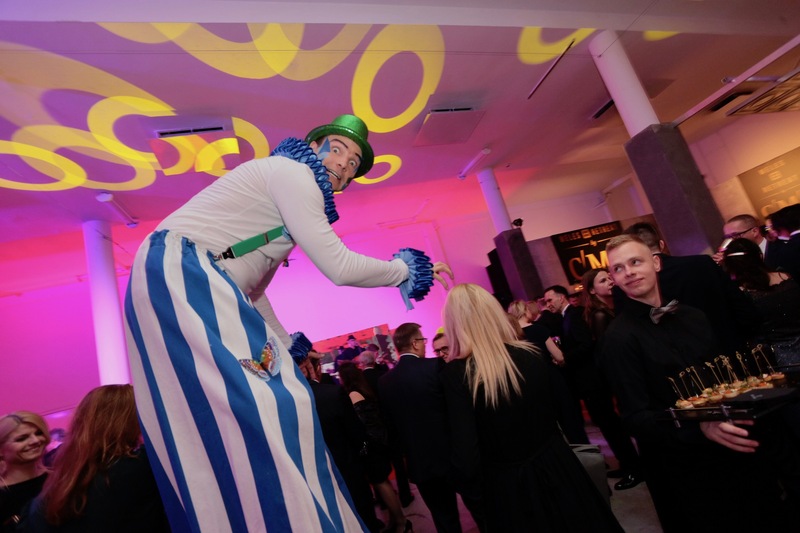 The wines for the event were provided by Mielzynski and the Perinet winery in Spain, with catering provided by Belvedere, the commotion partner was the Bristol Hotel Warsaw. 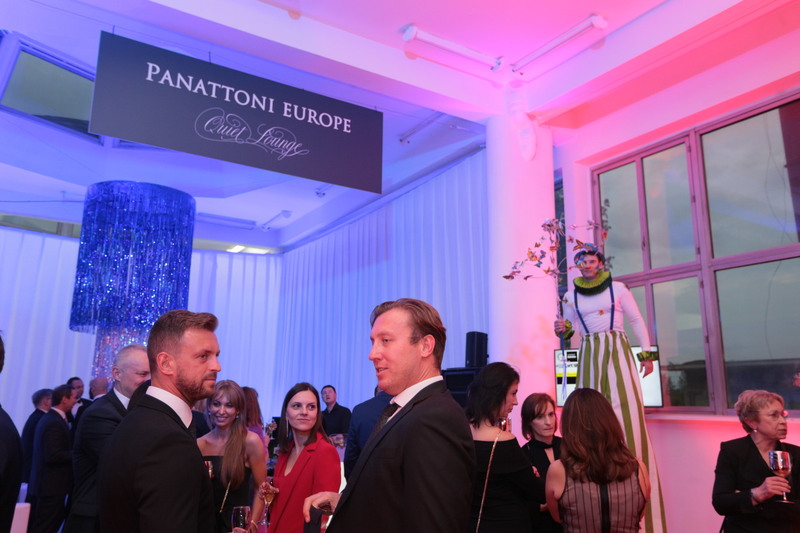 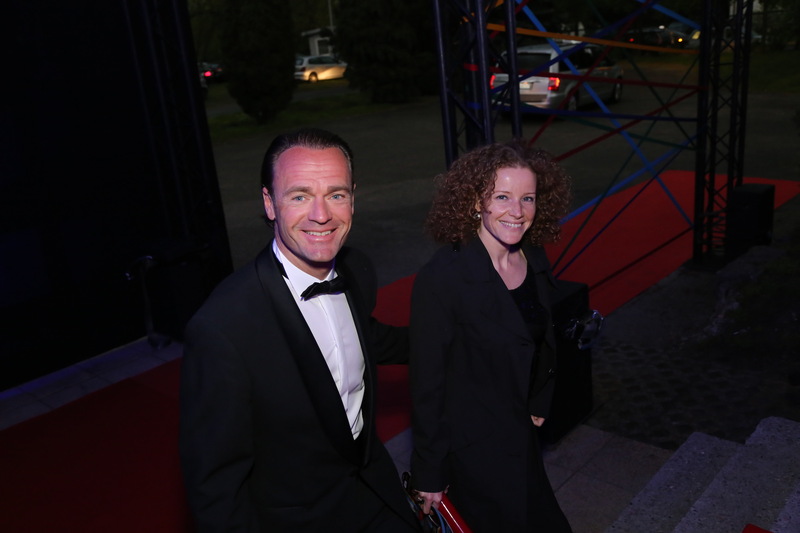 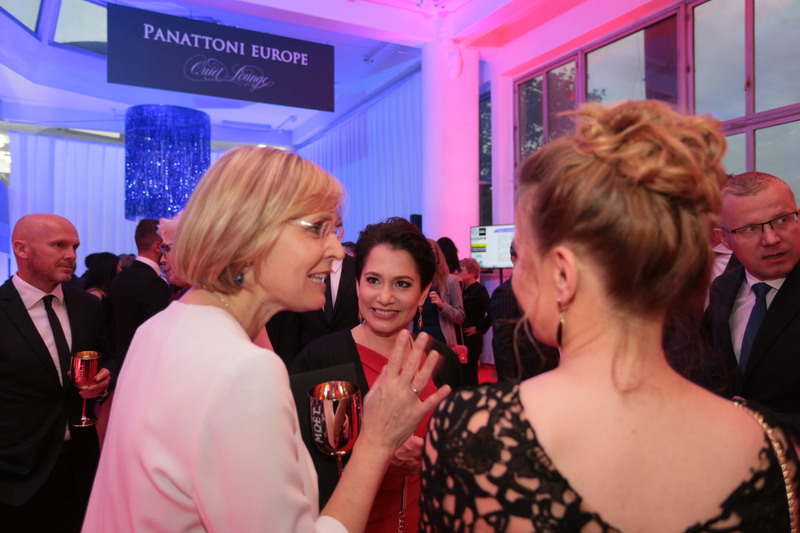 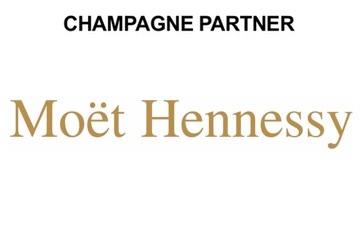 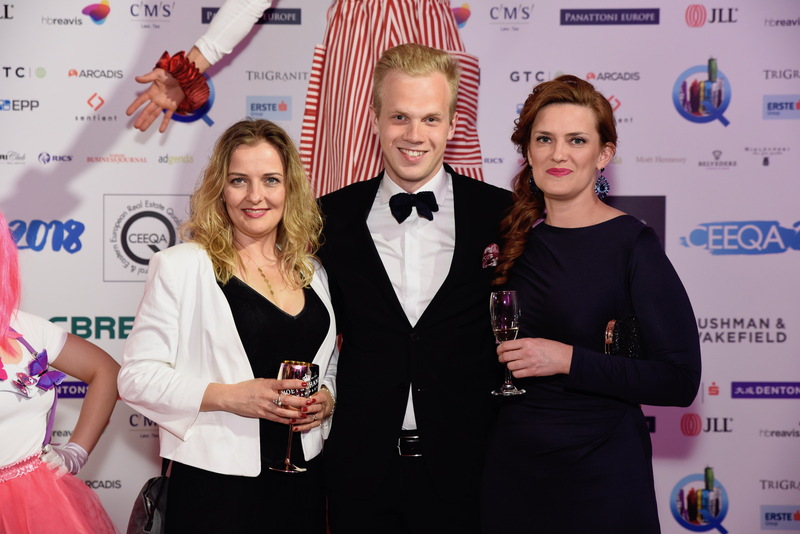 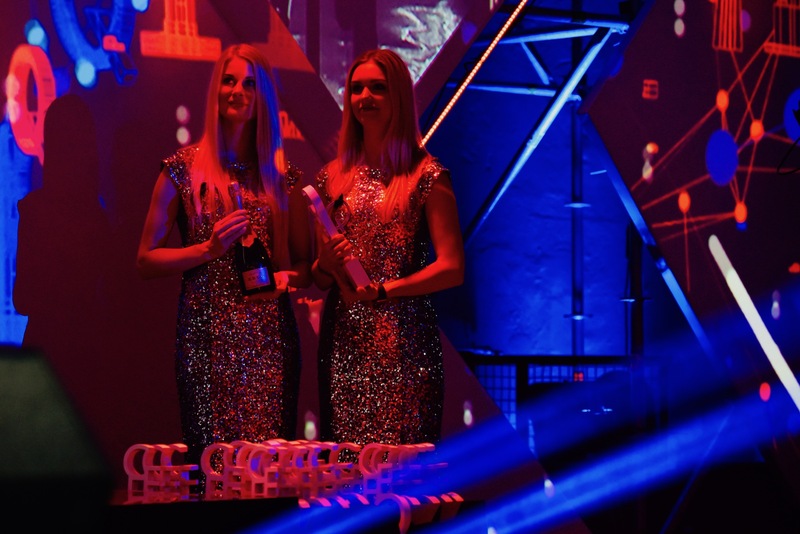 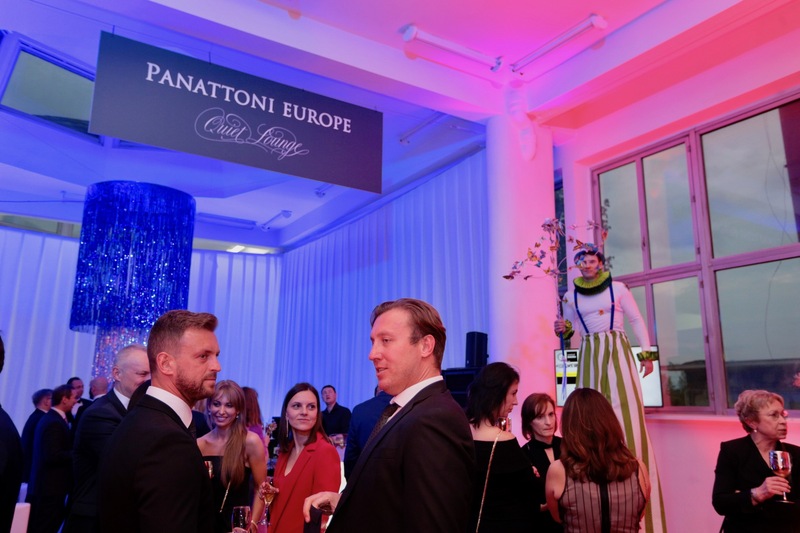 The champagne was sponsored by Panattoni Europe and provide by Moët & Chandon.